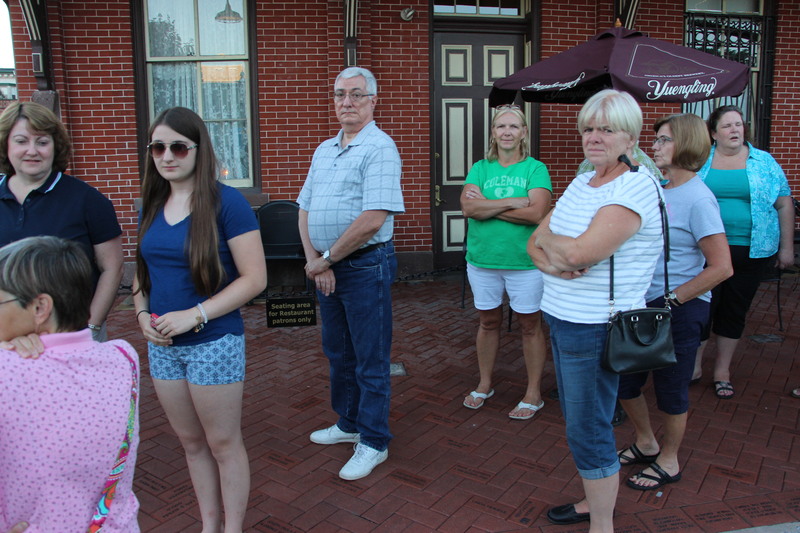 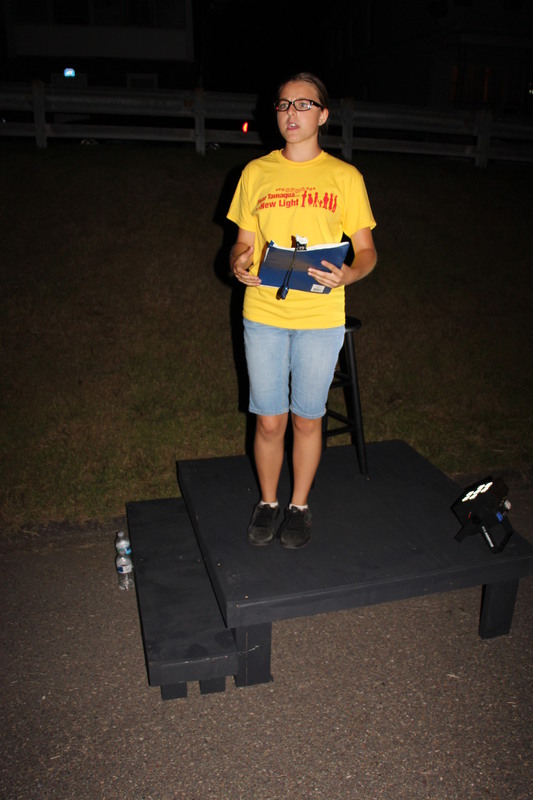 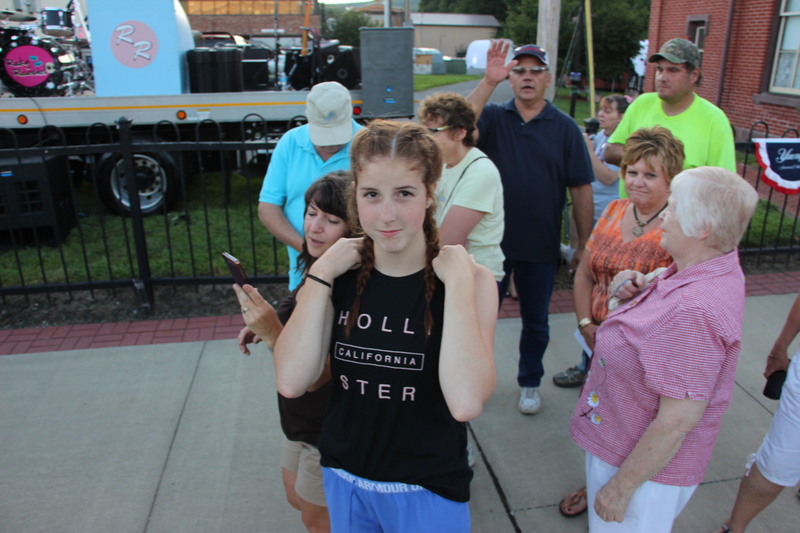 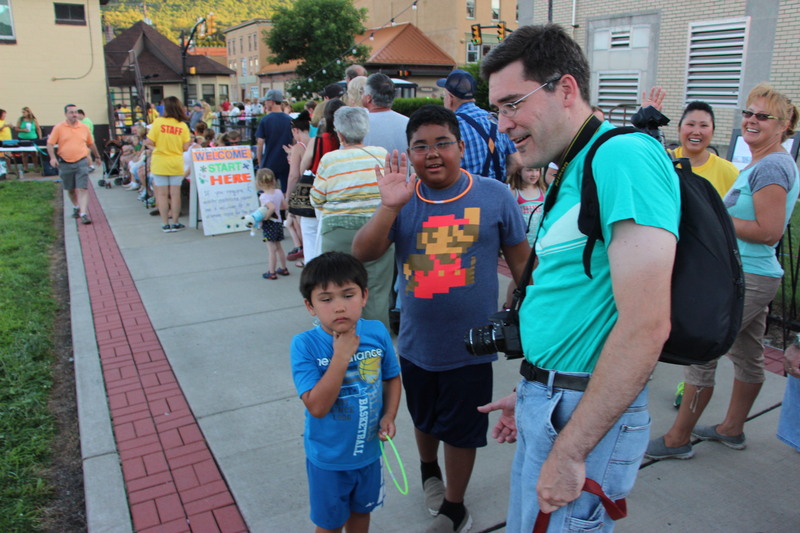 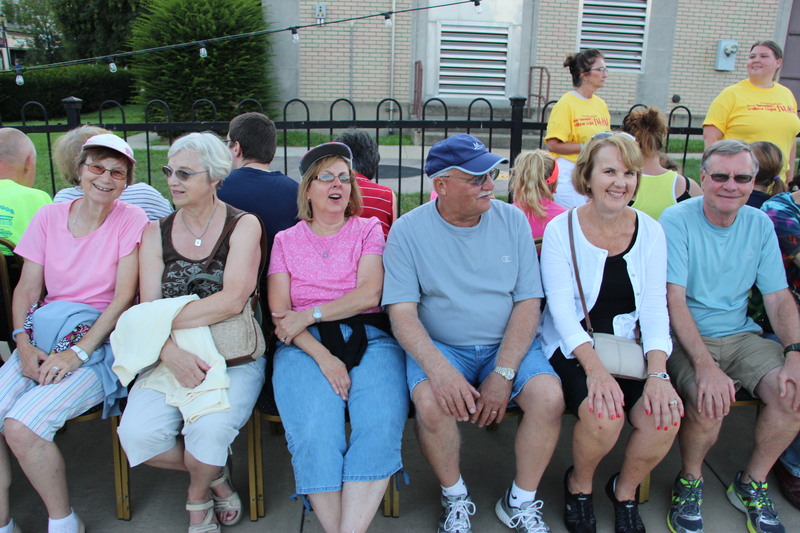 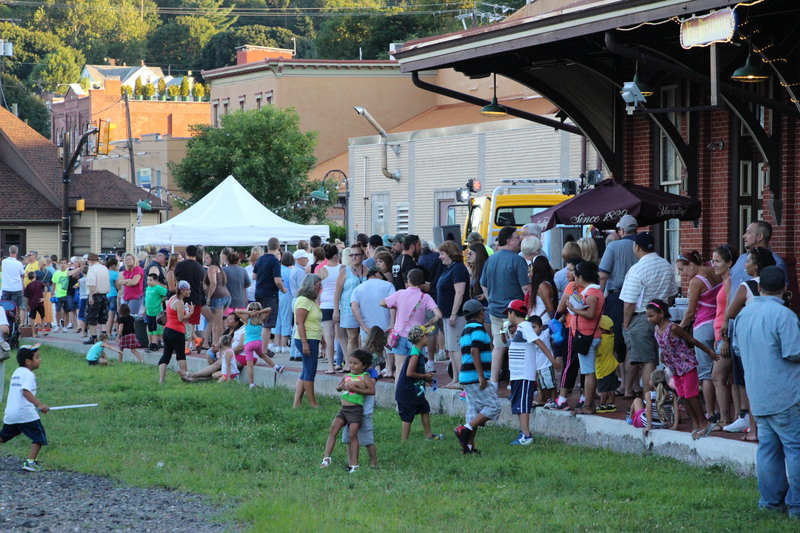 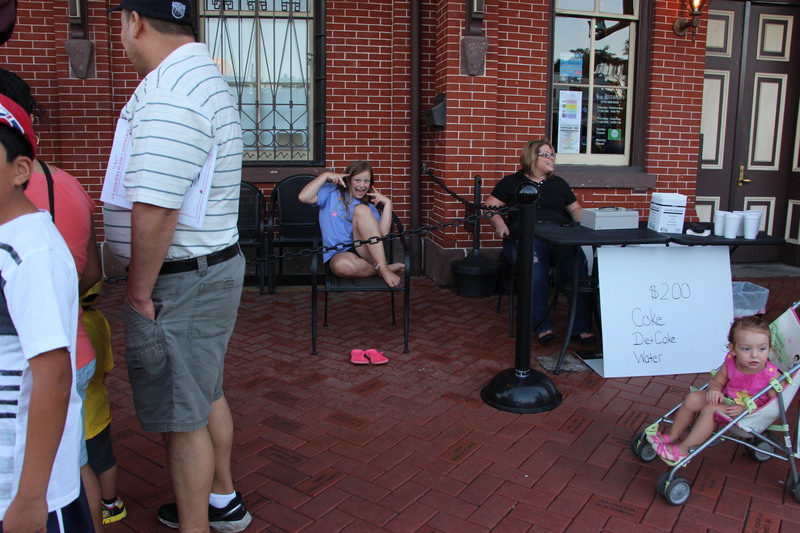 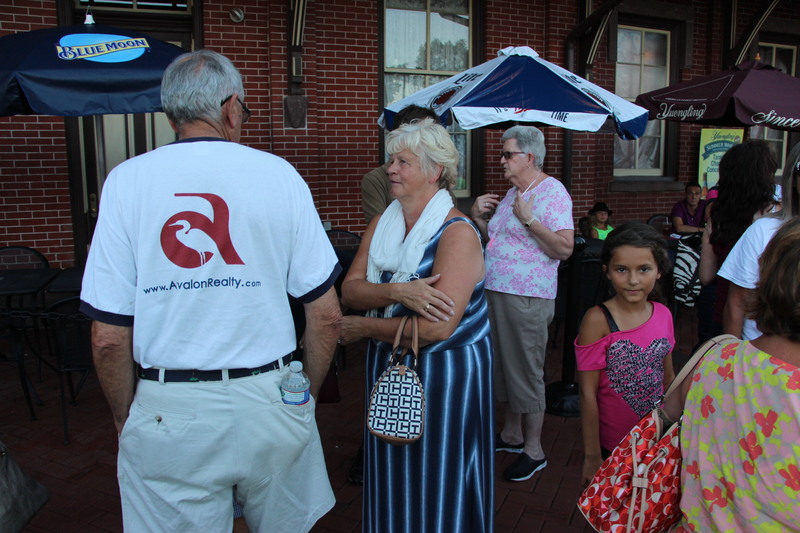 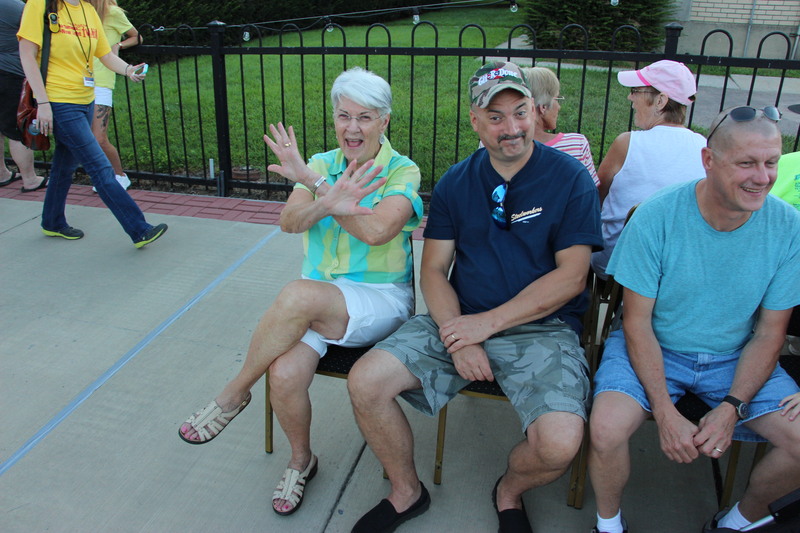 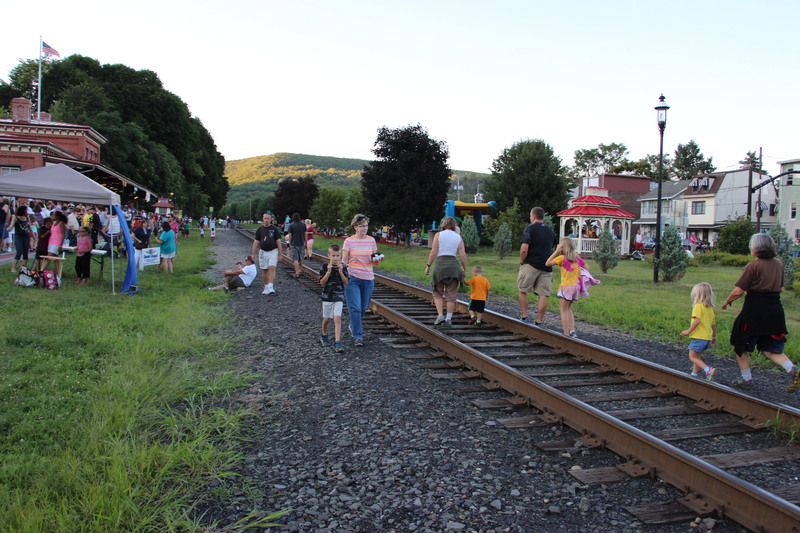 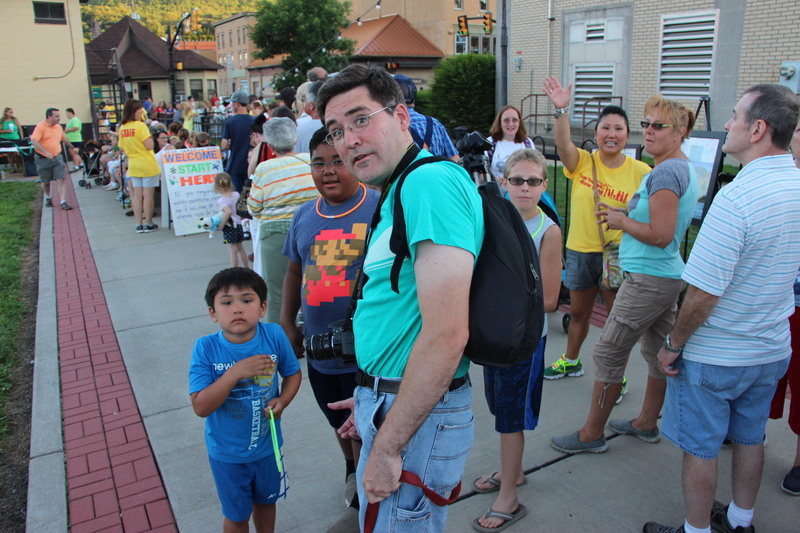 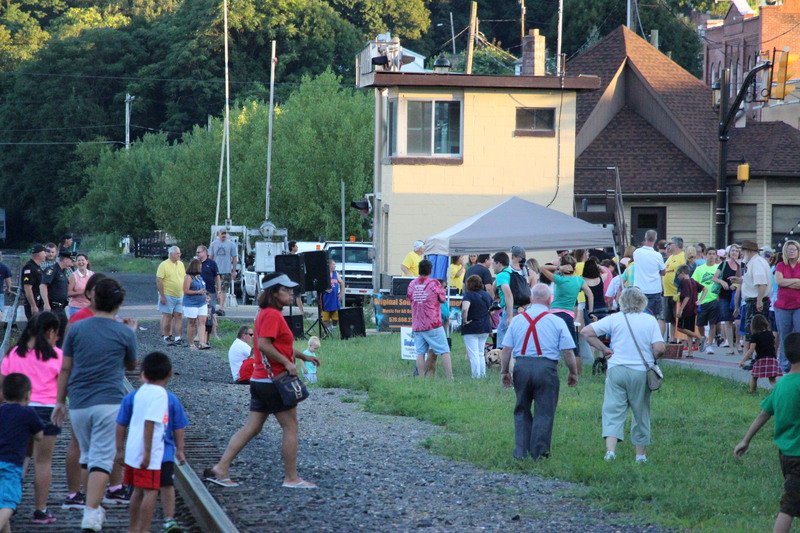 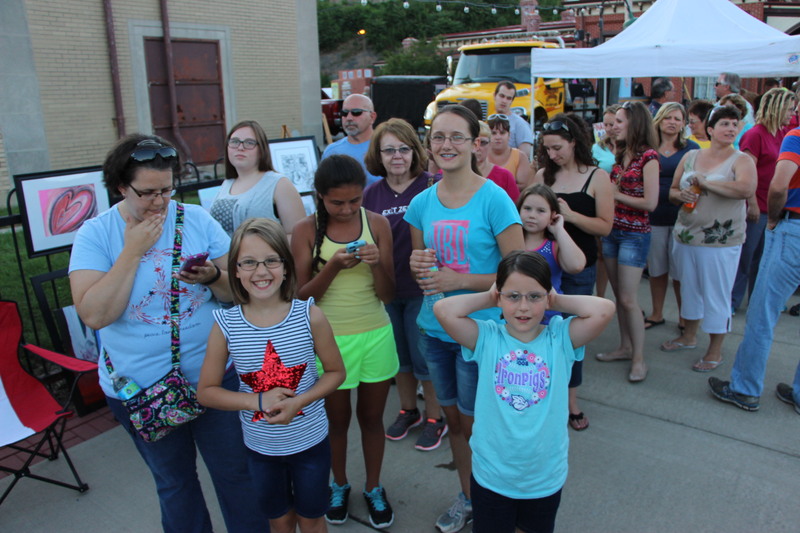 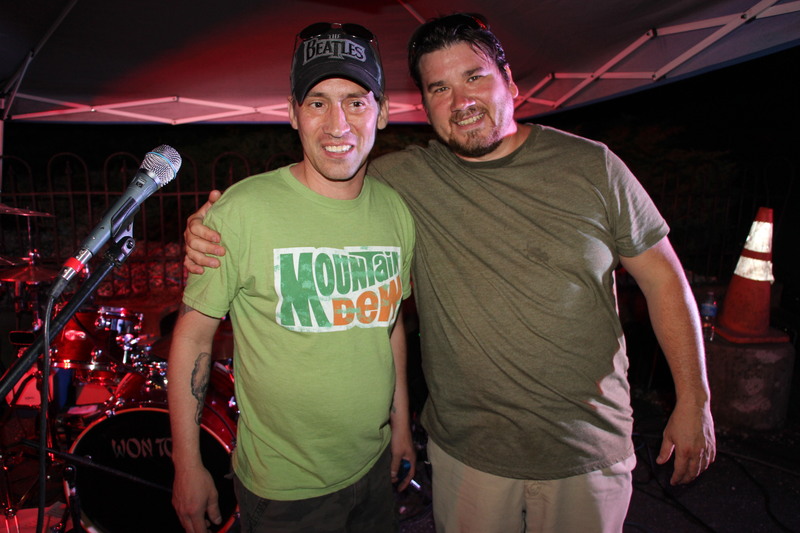 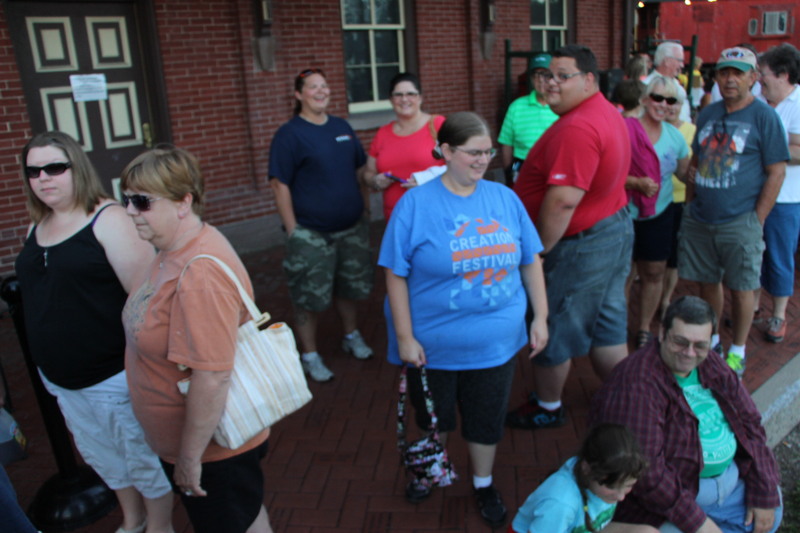 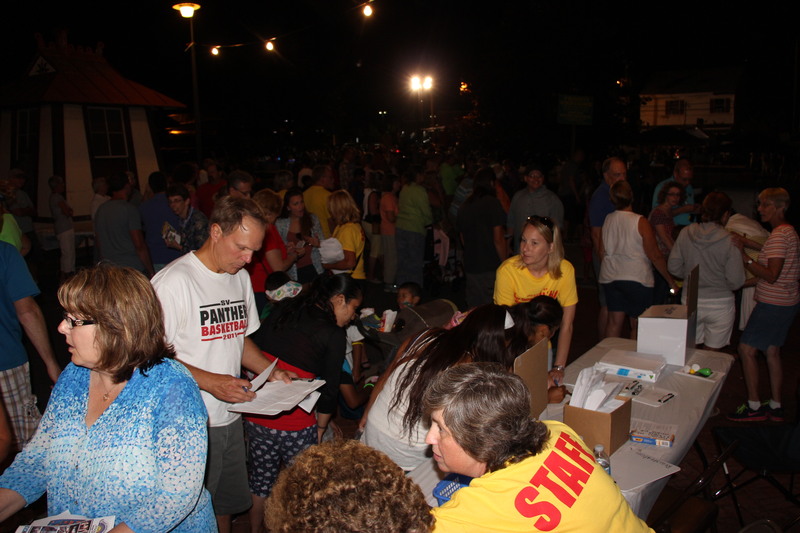 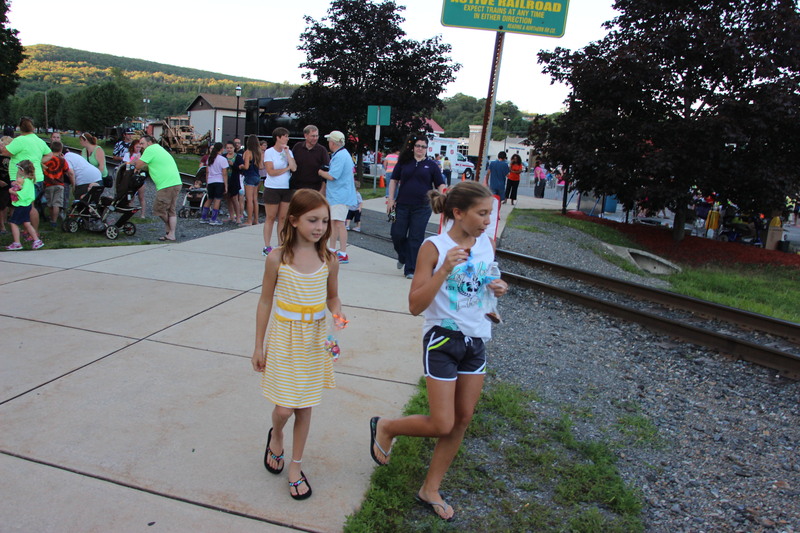 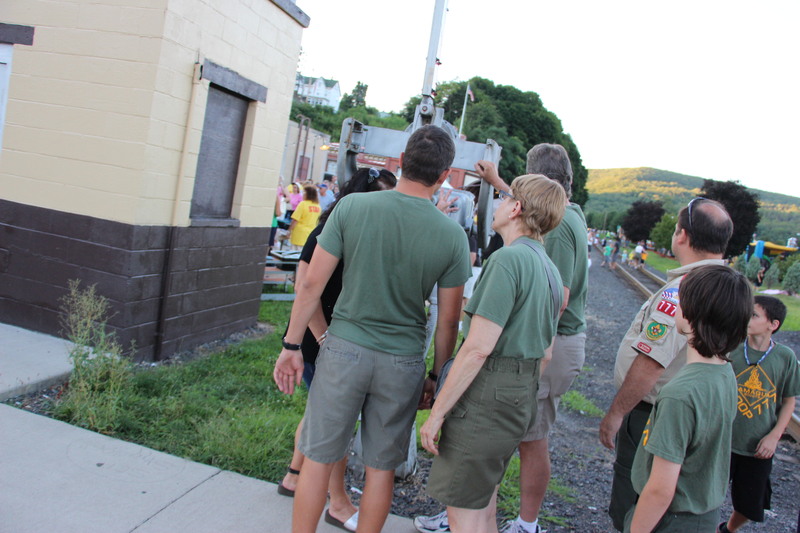 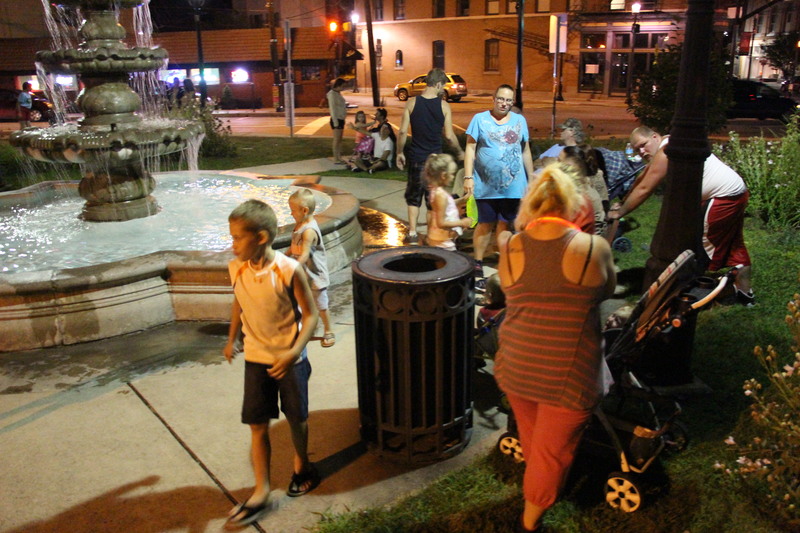 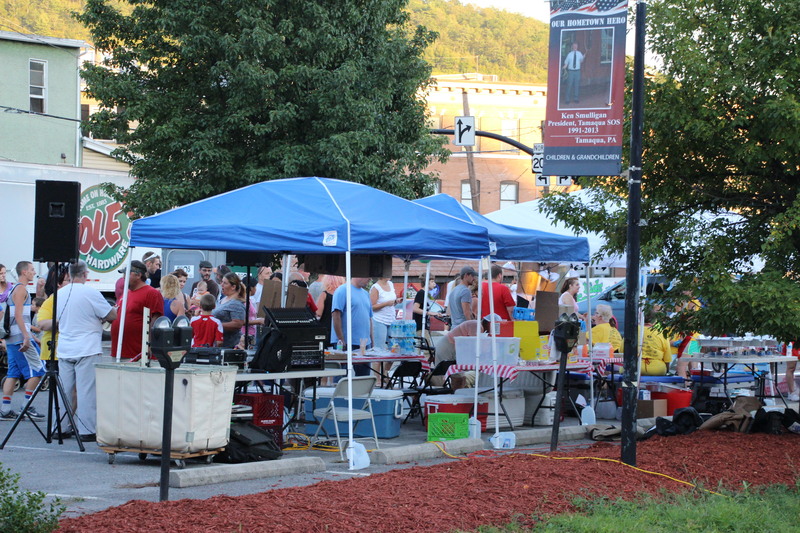 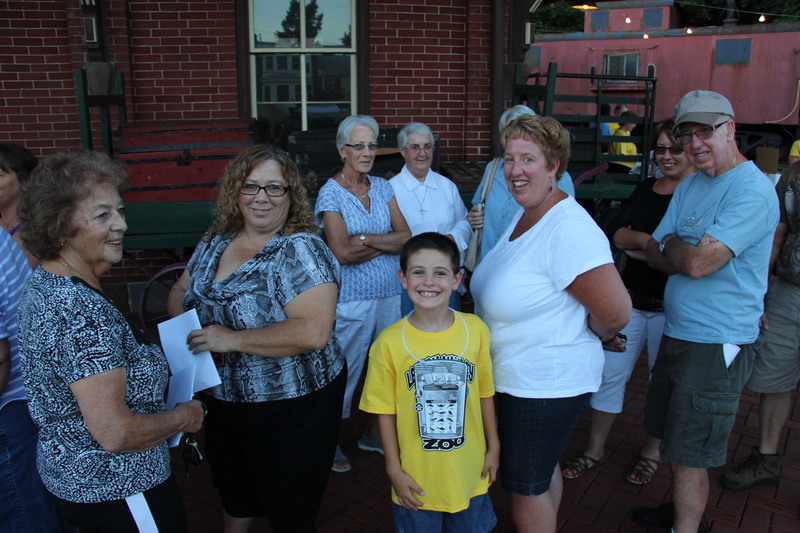 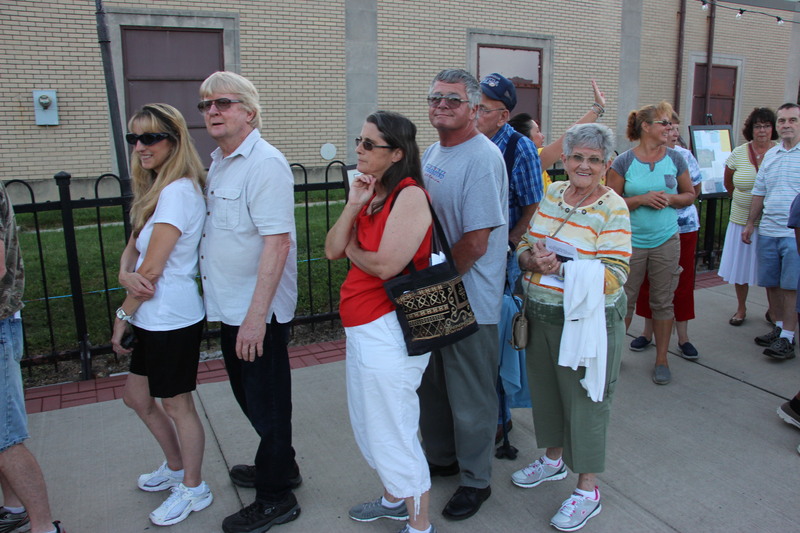 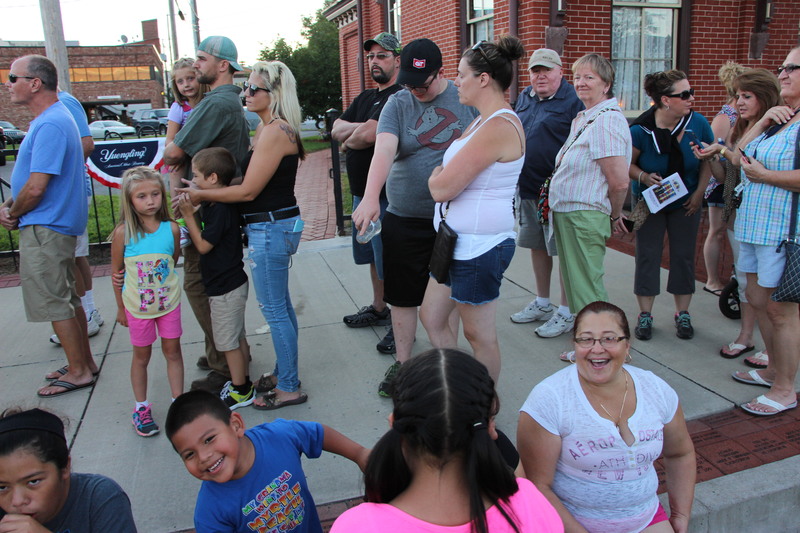 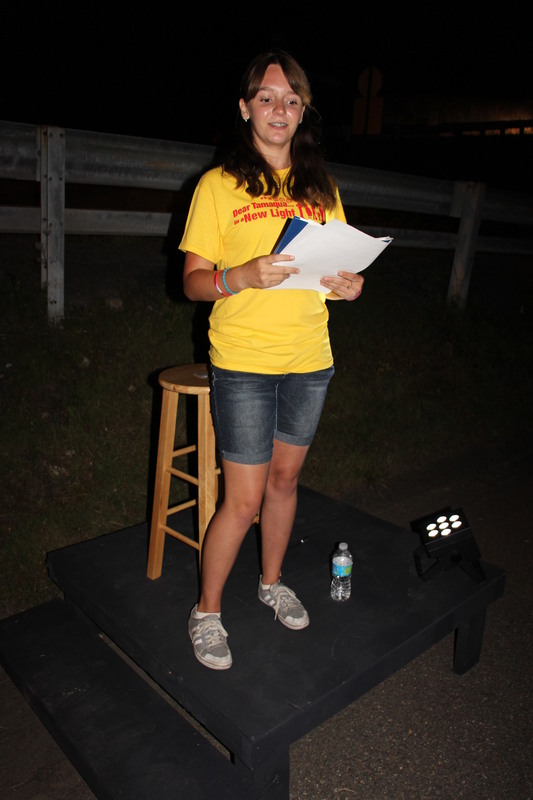 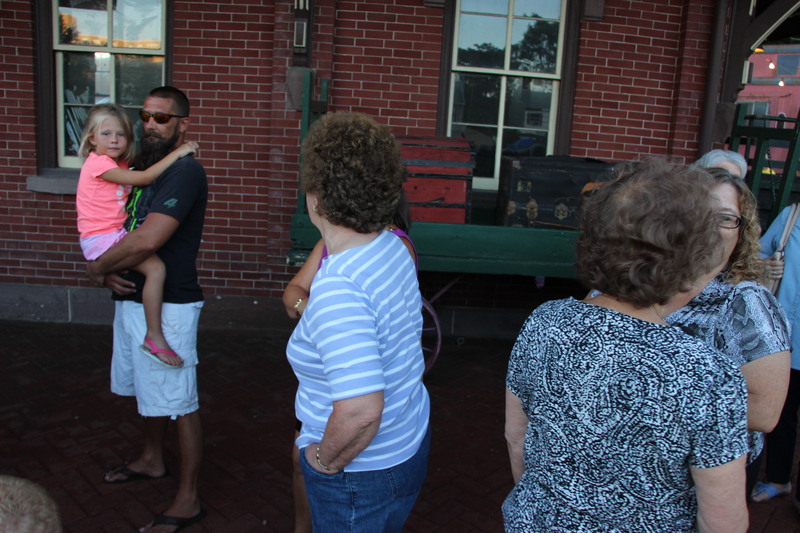 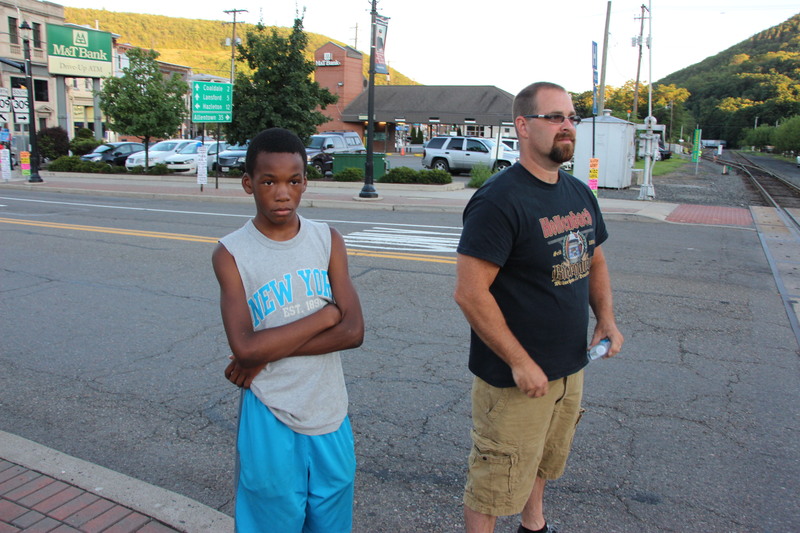 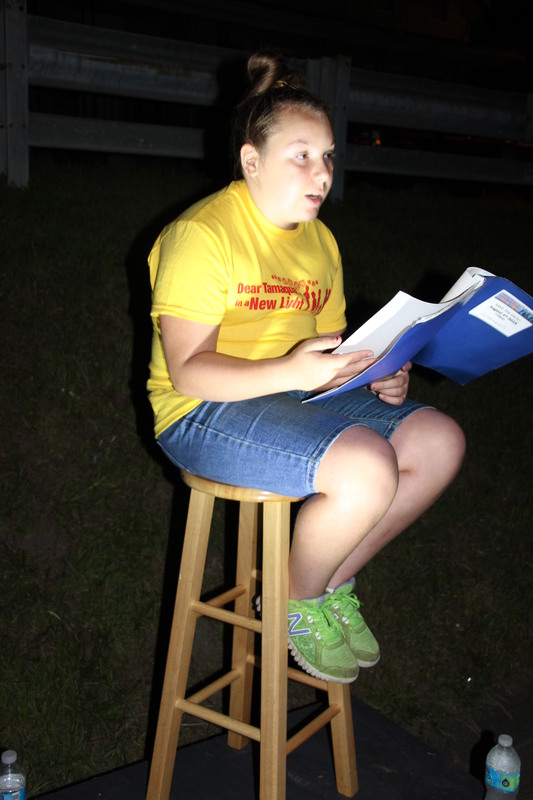 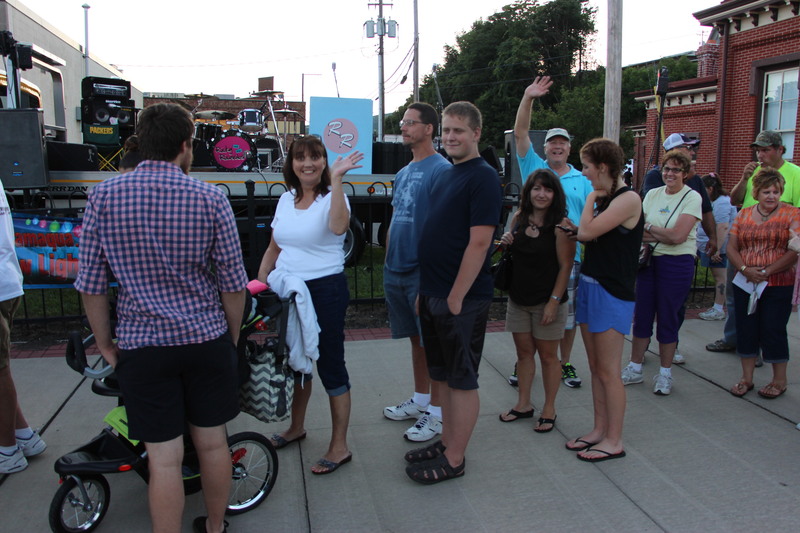 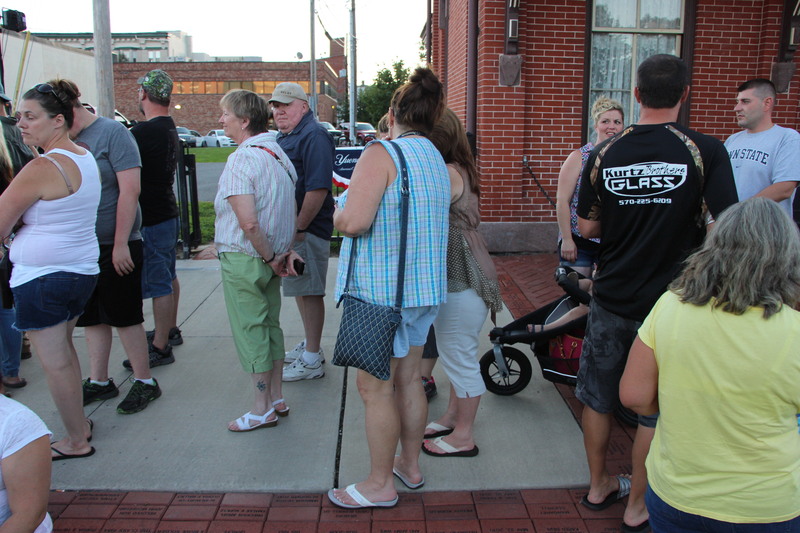 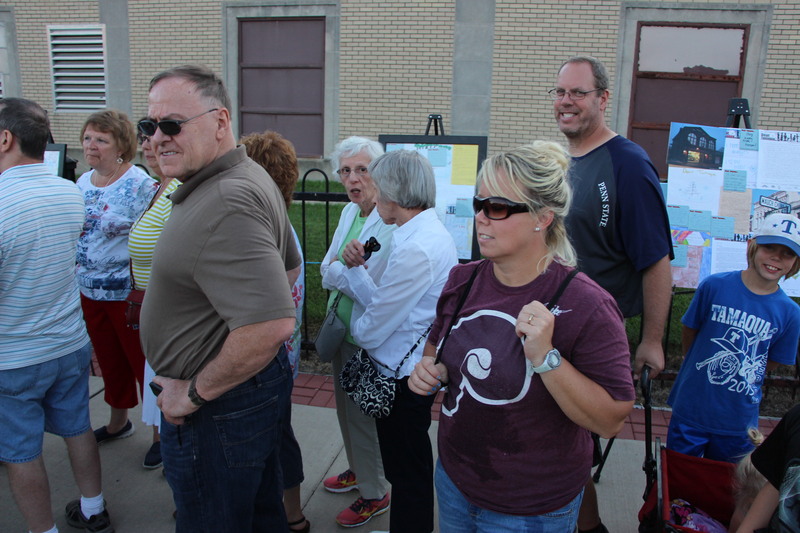 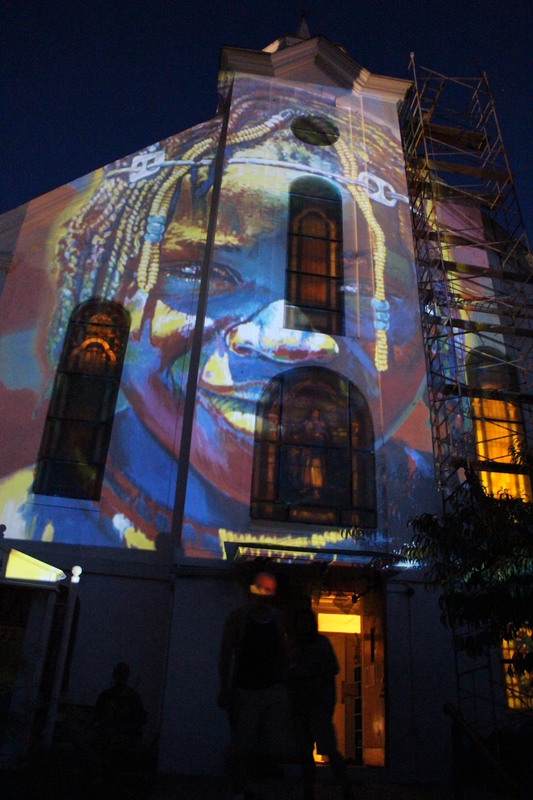 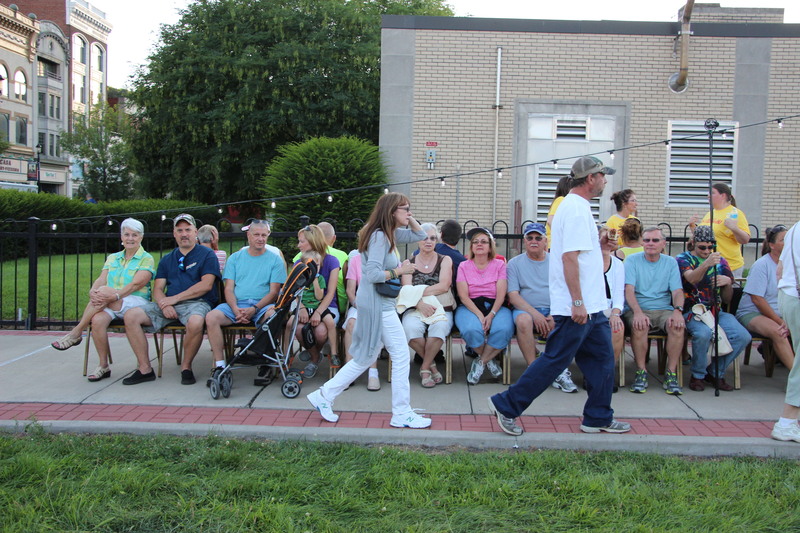 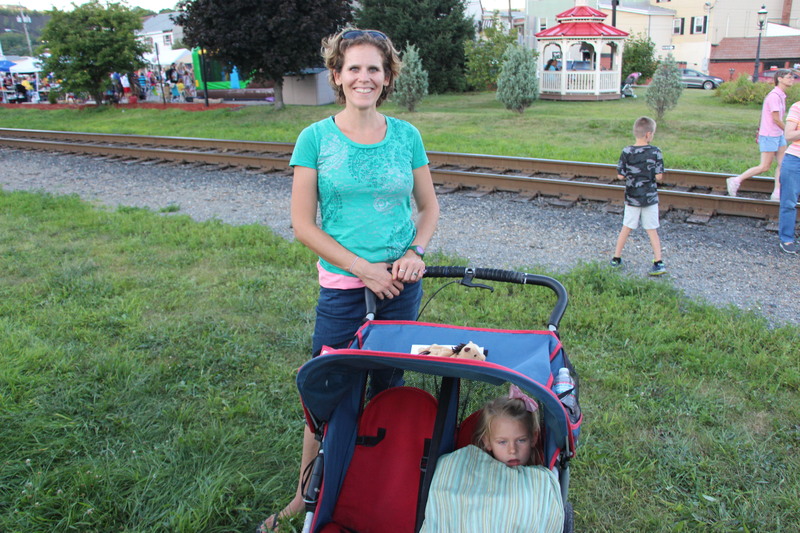 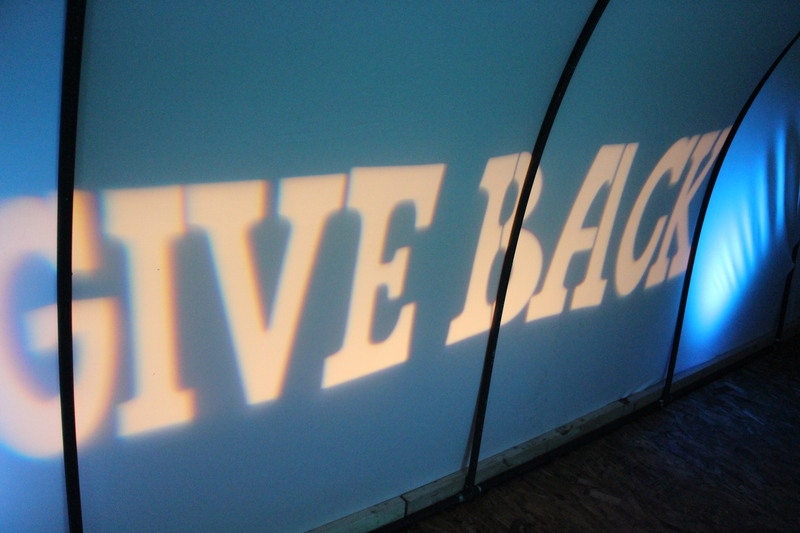 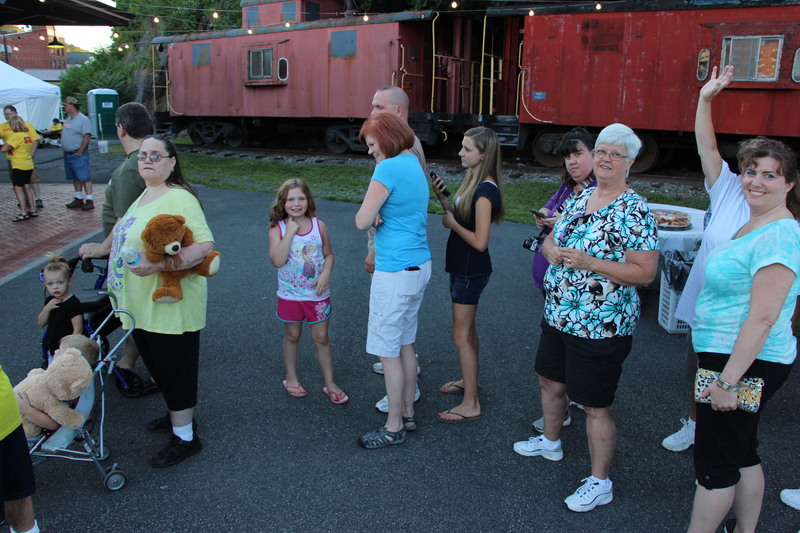 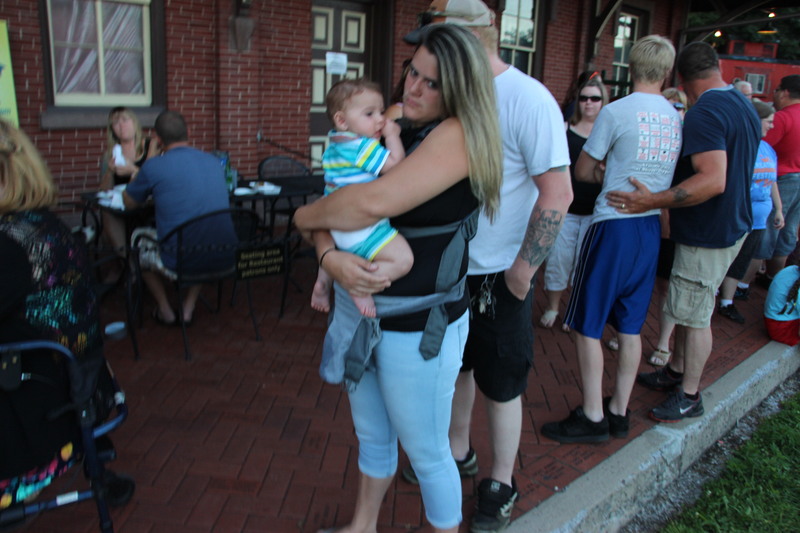 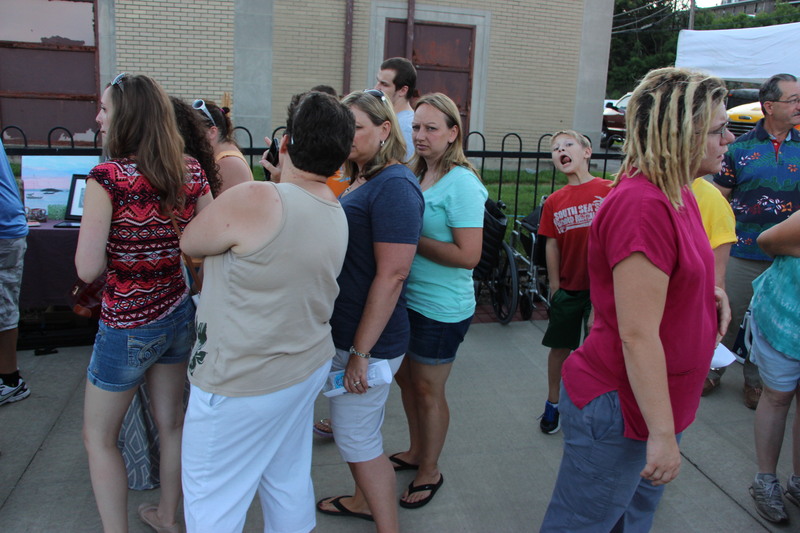 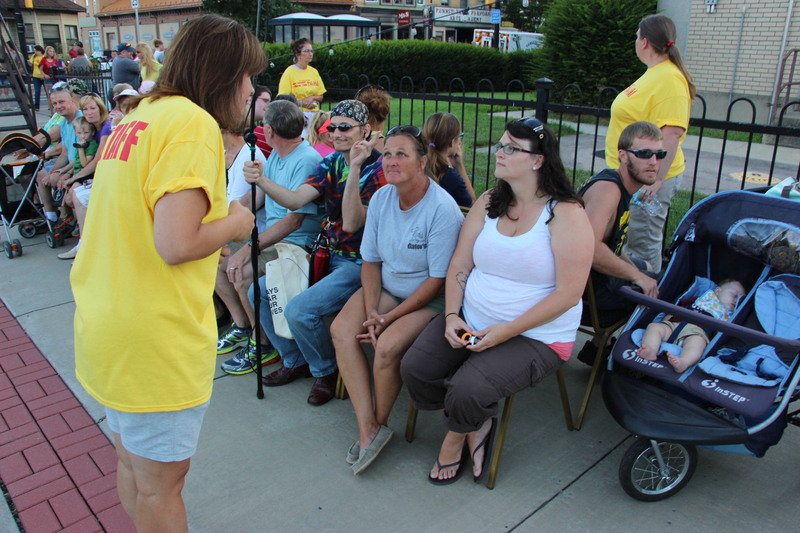 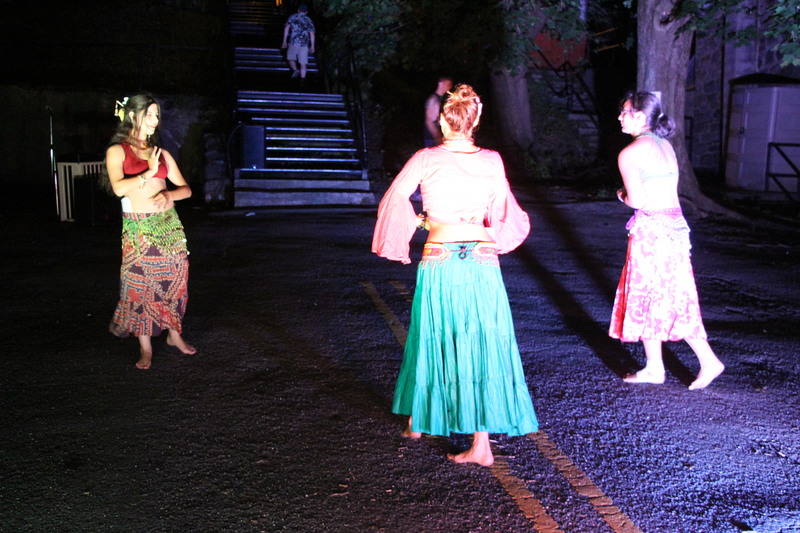 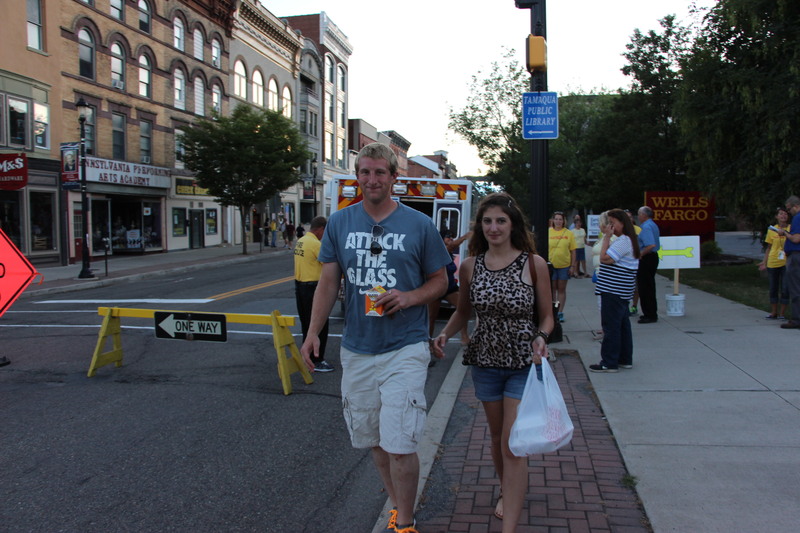 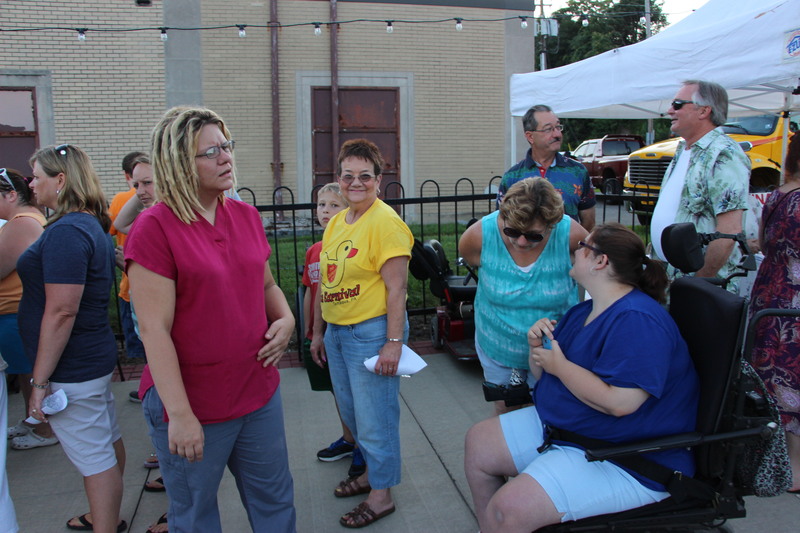 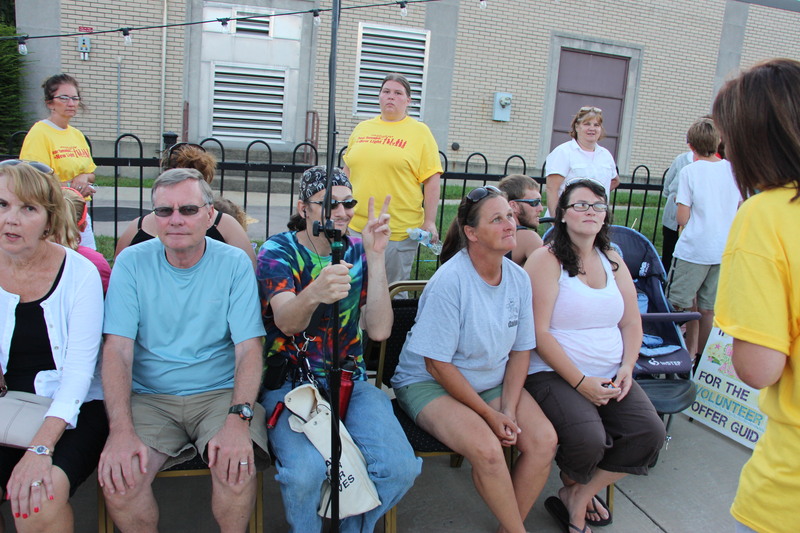 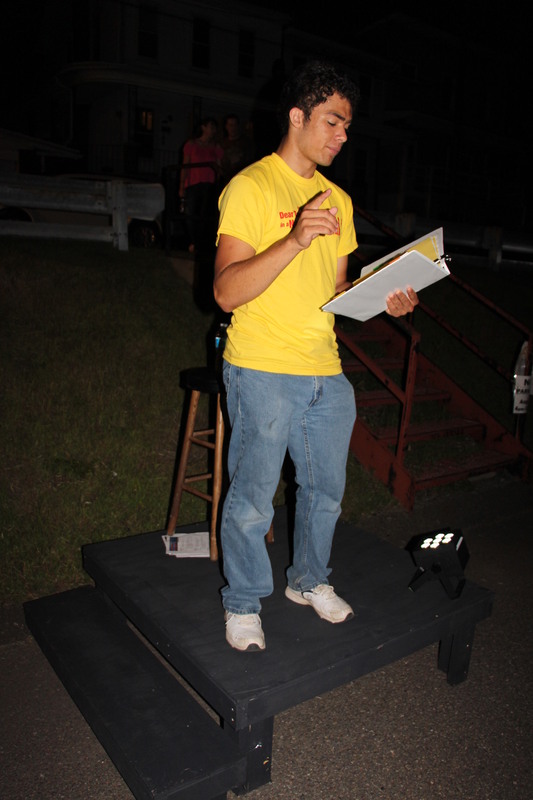 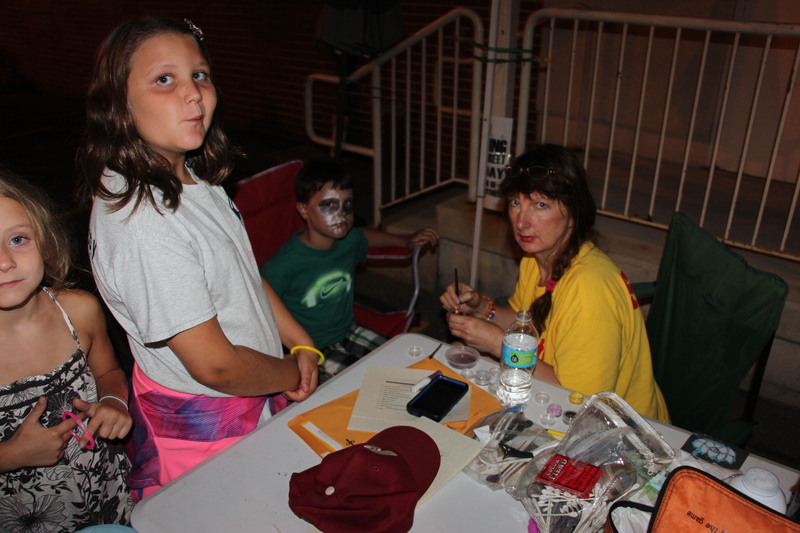 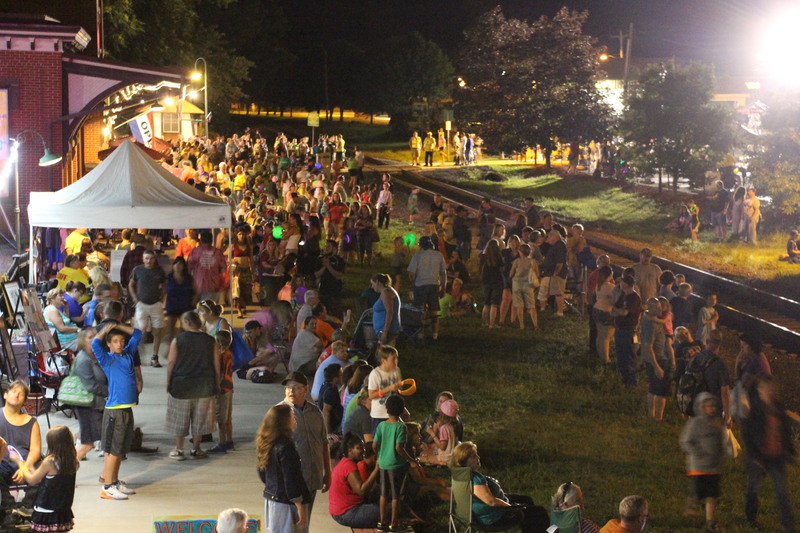 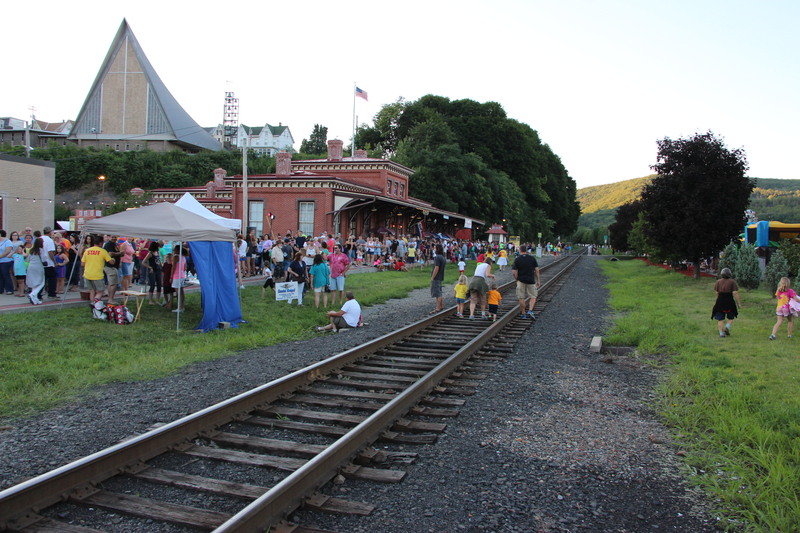 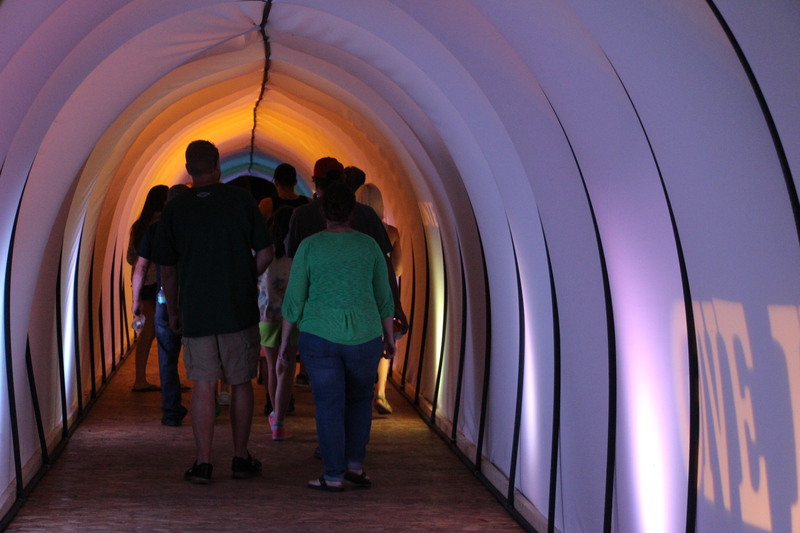 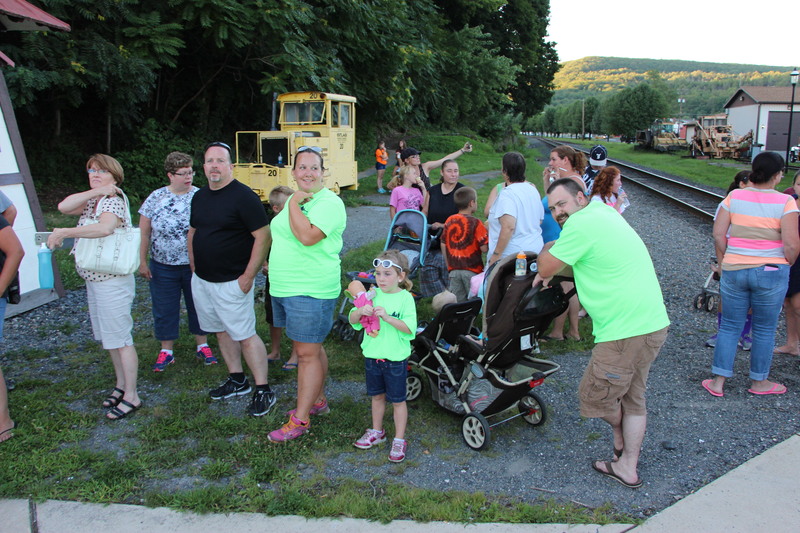 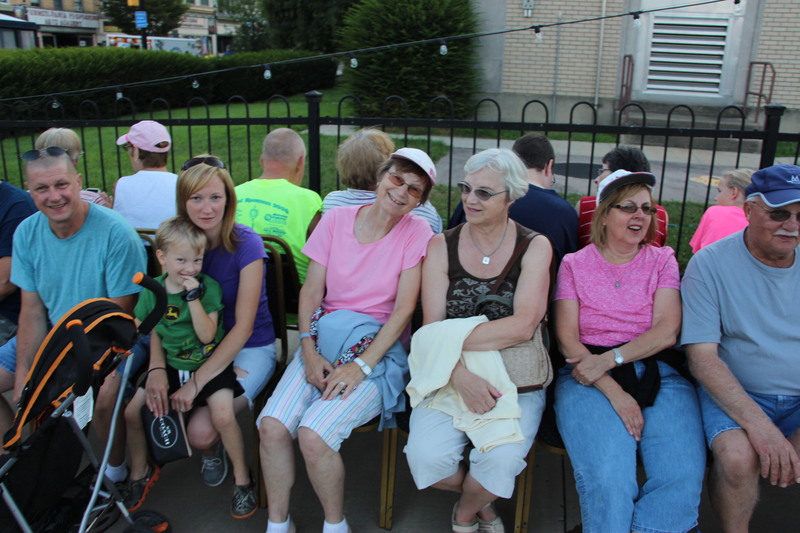 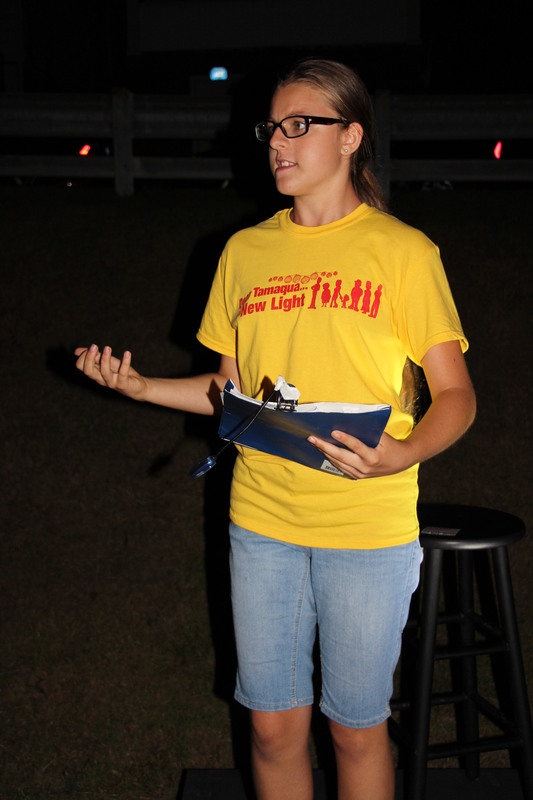 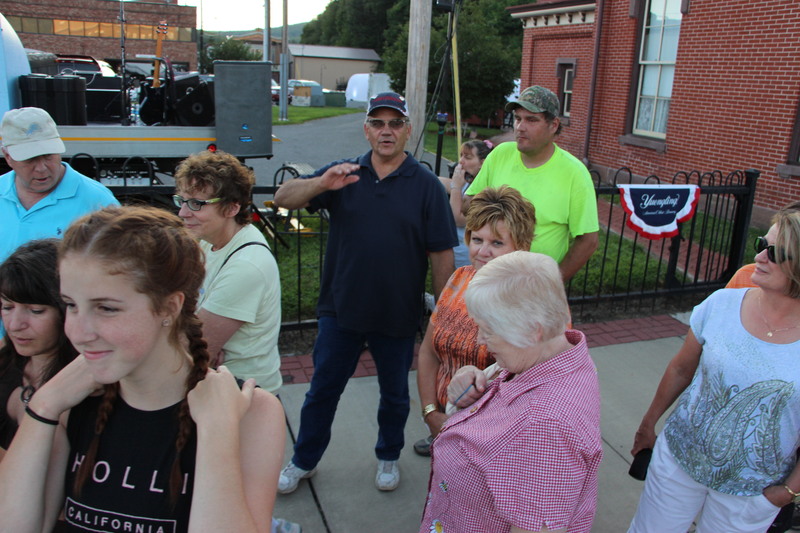 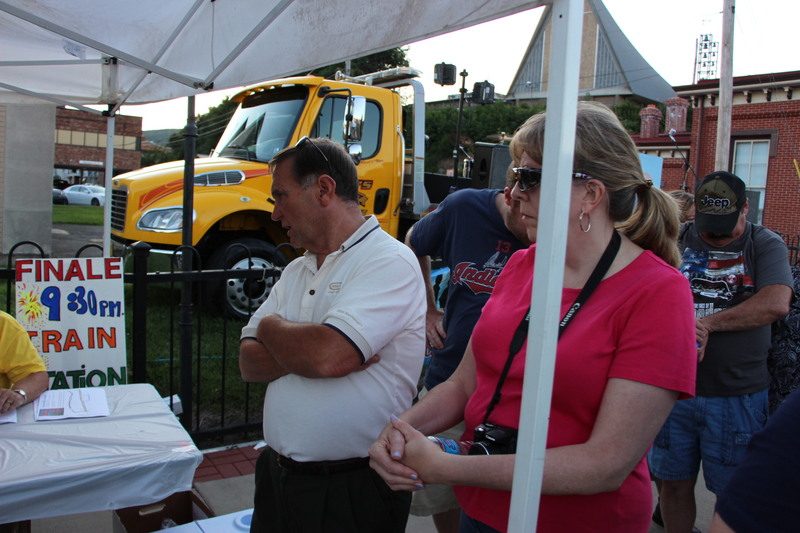 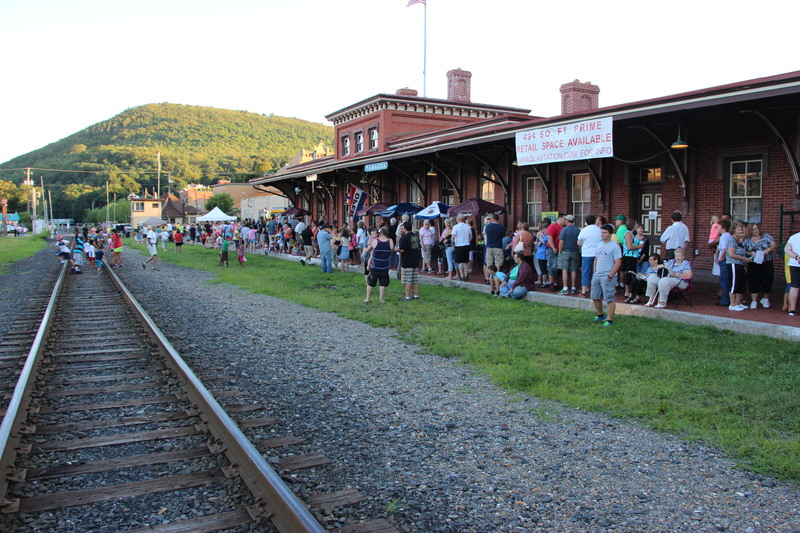 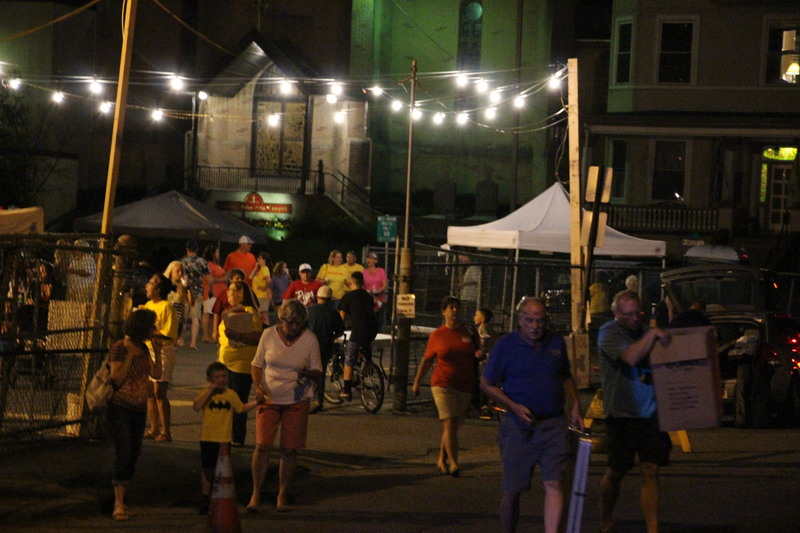 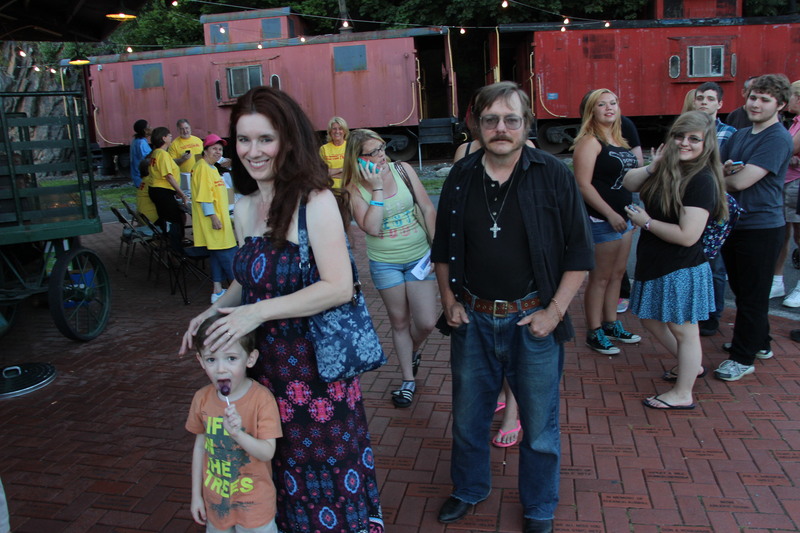 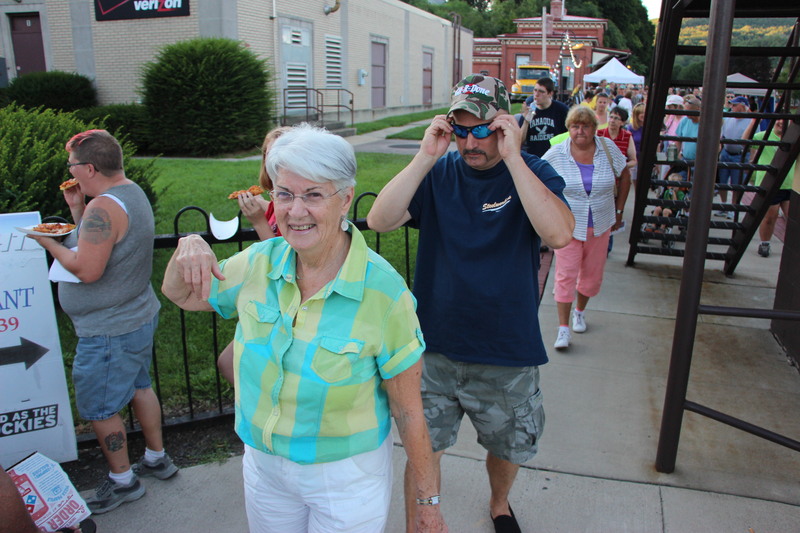 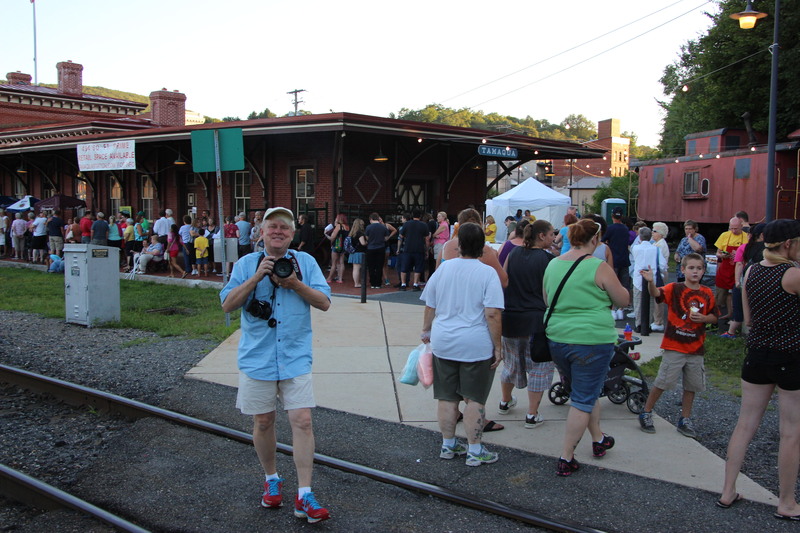 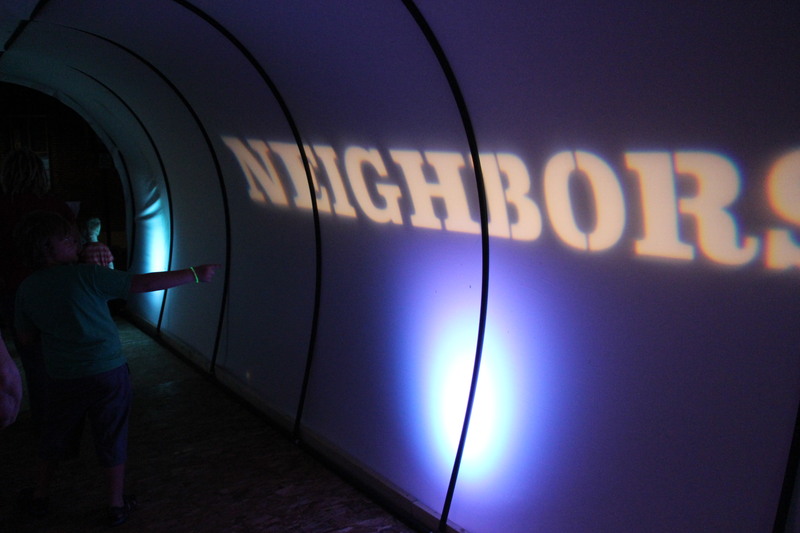 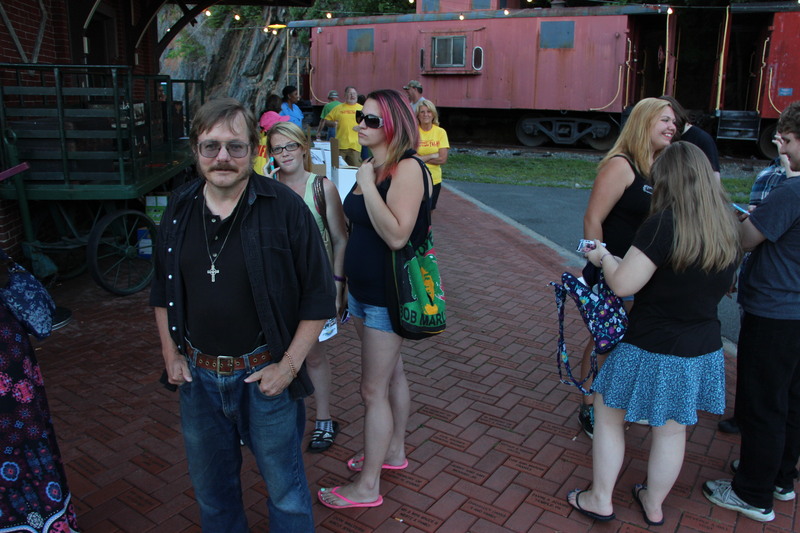 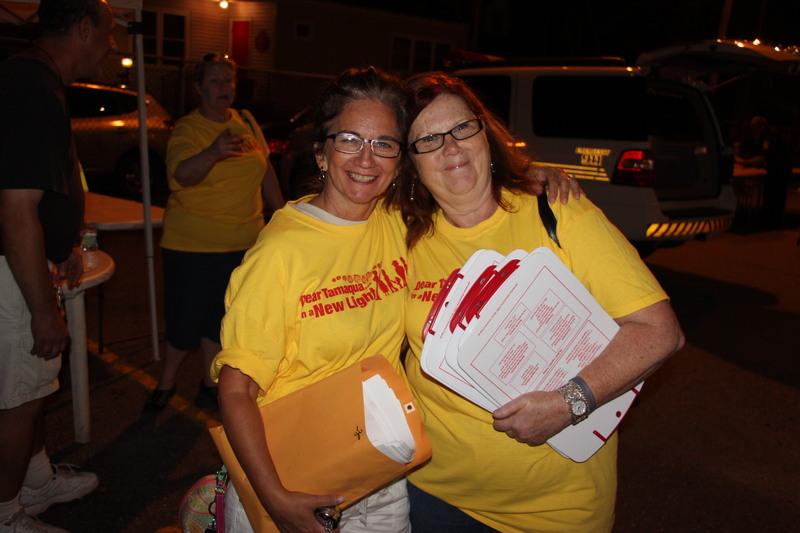 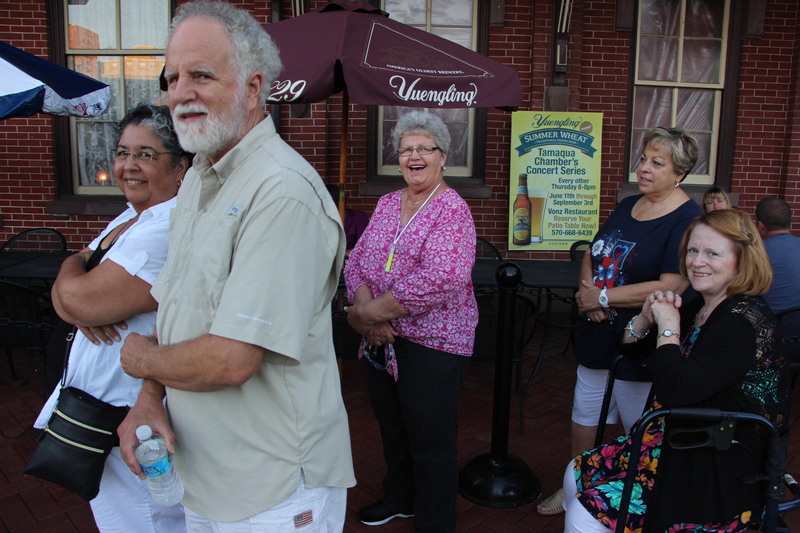 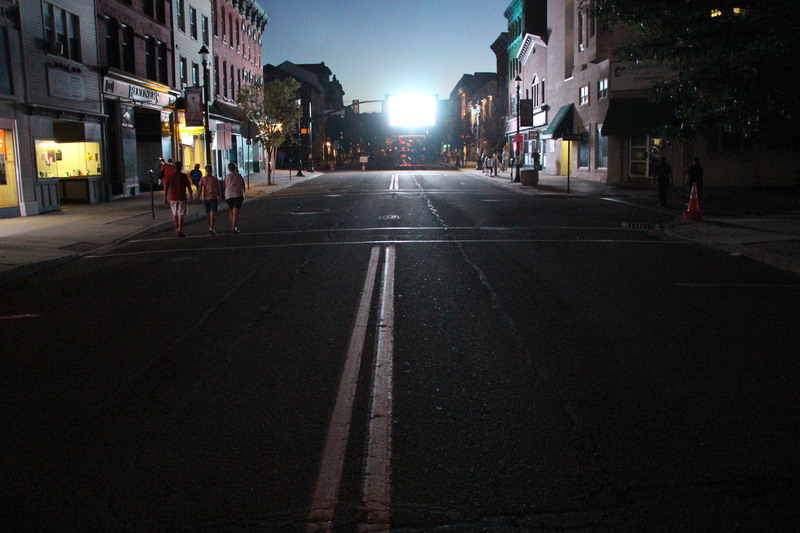 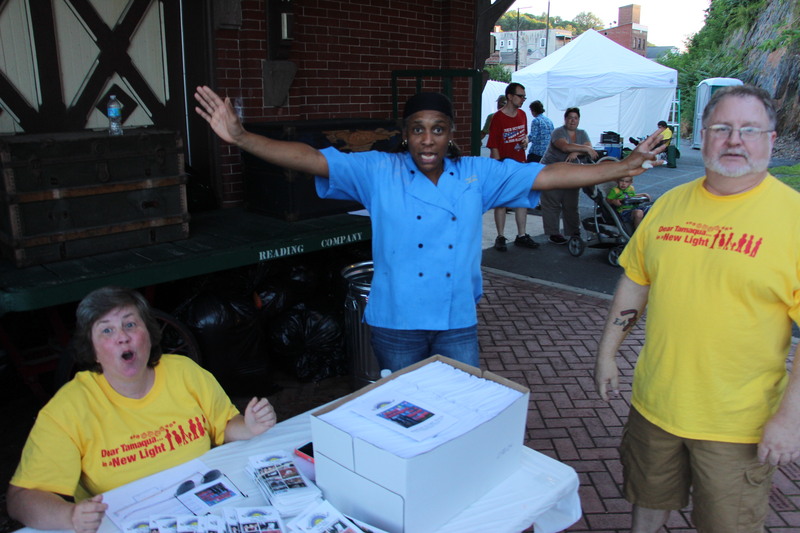 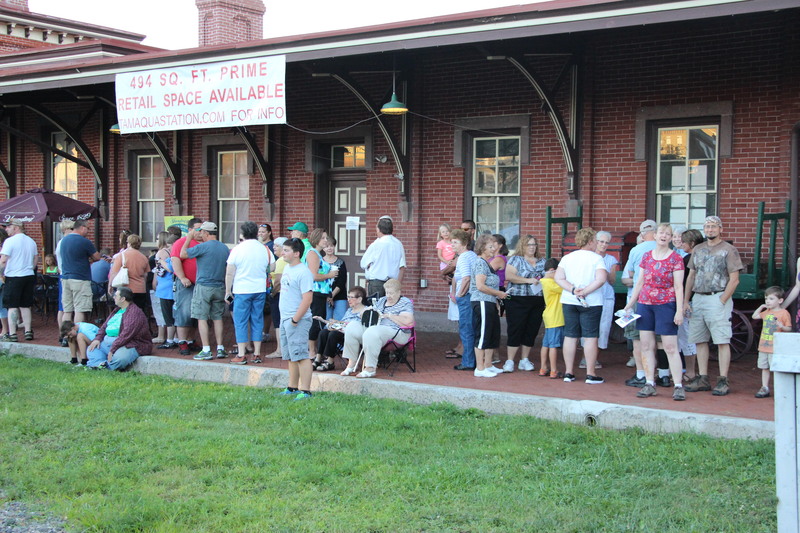 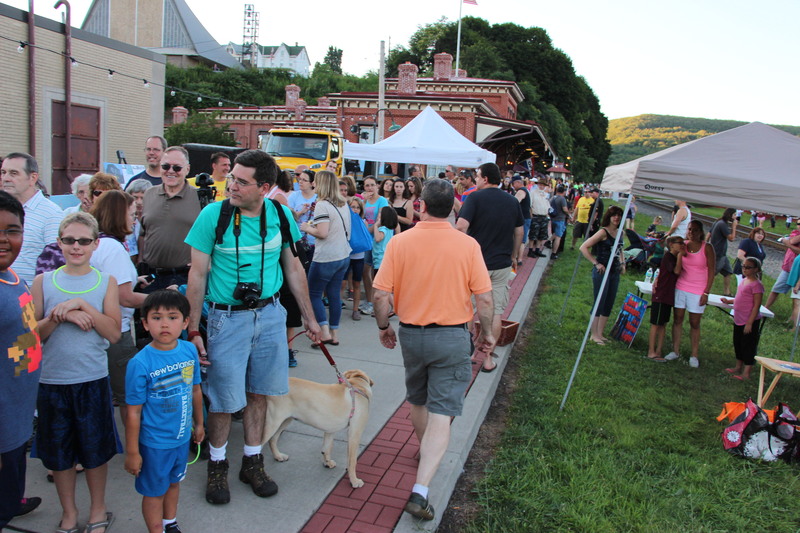 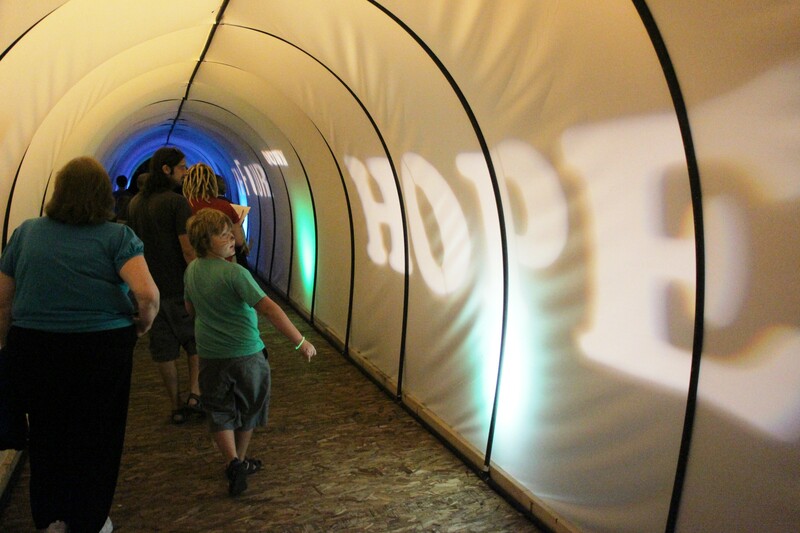 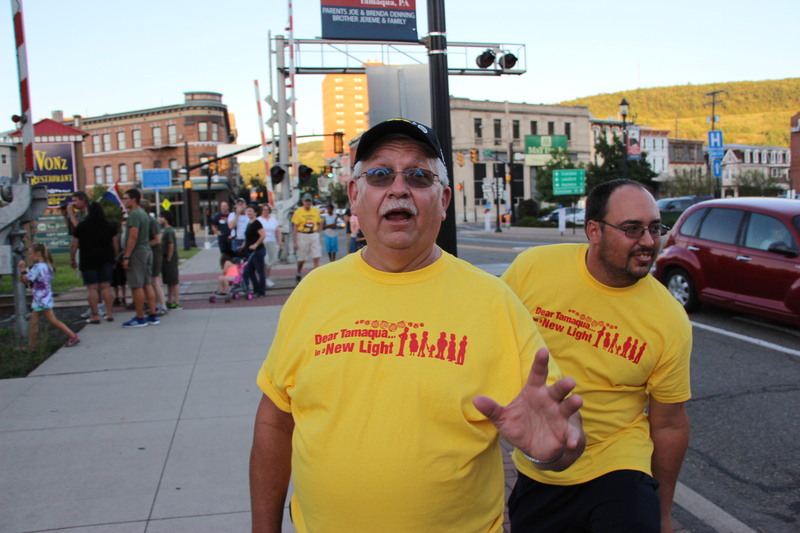 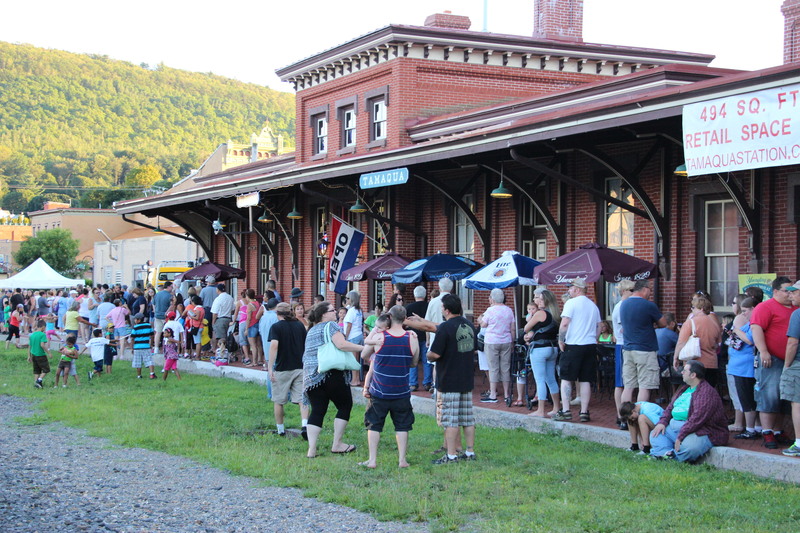 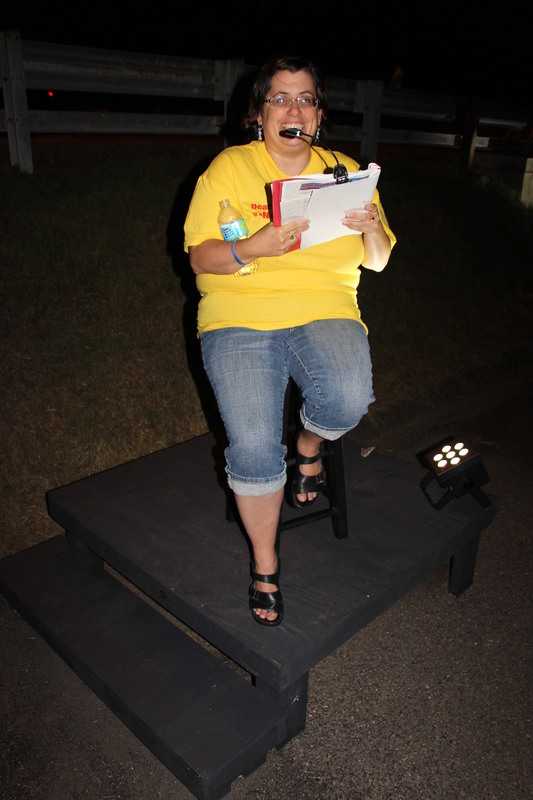 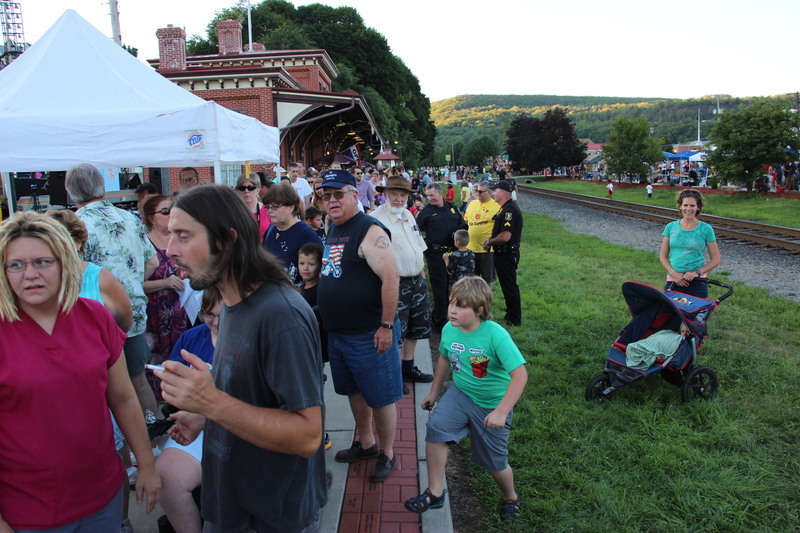 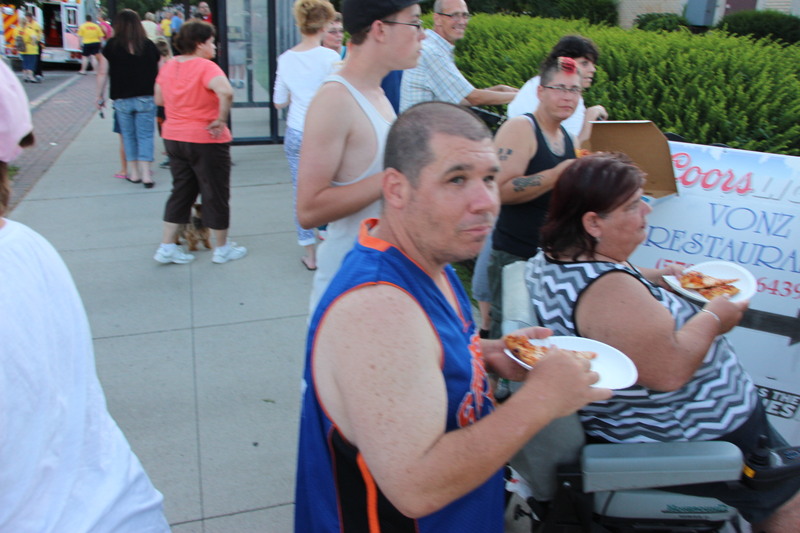 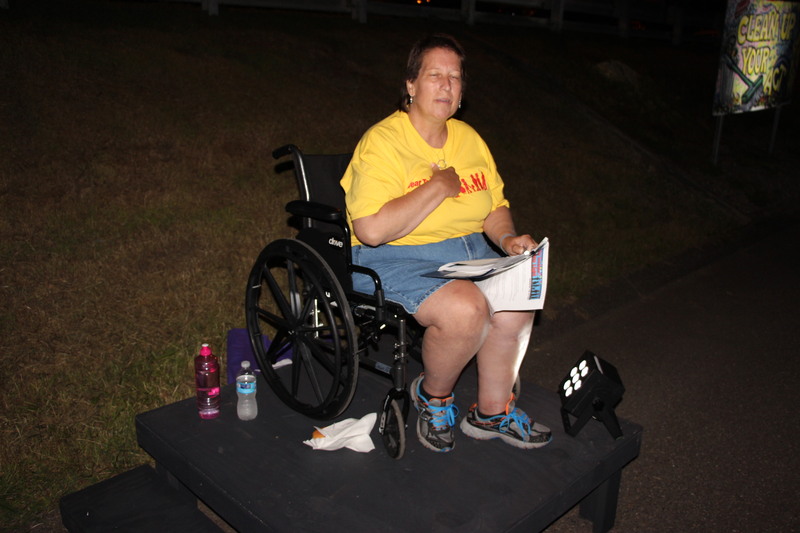 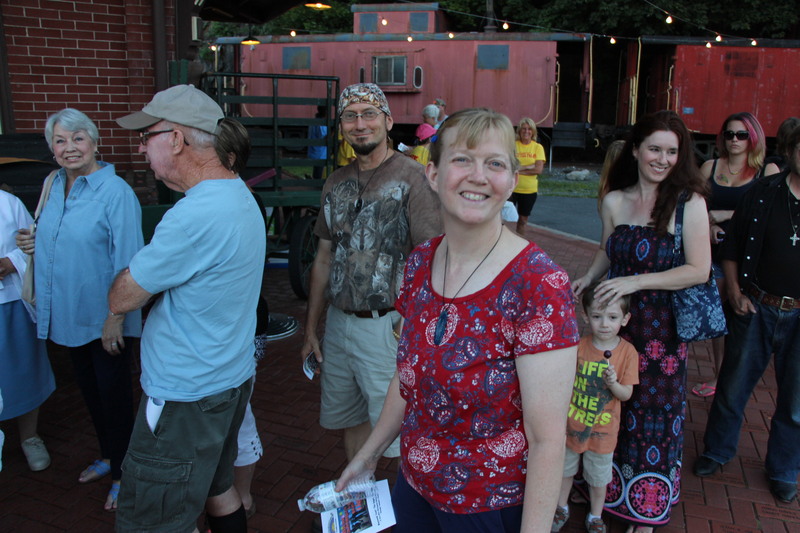 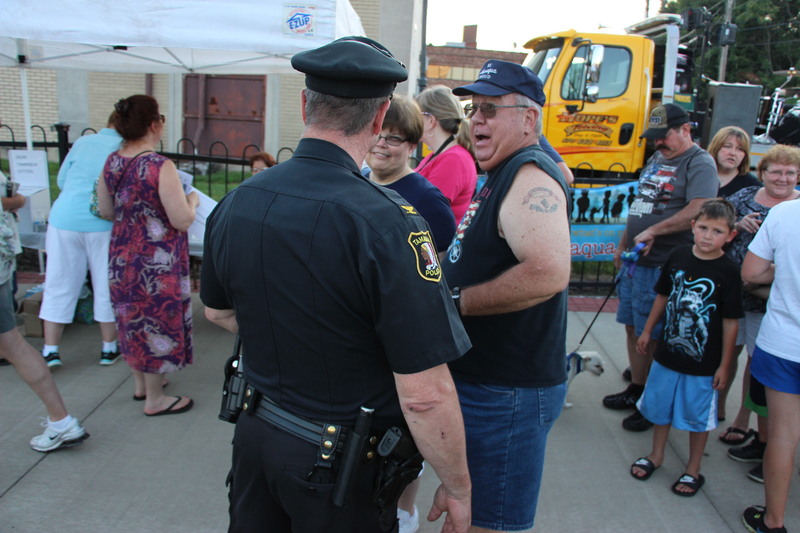 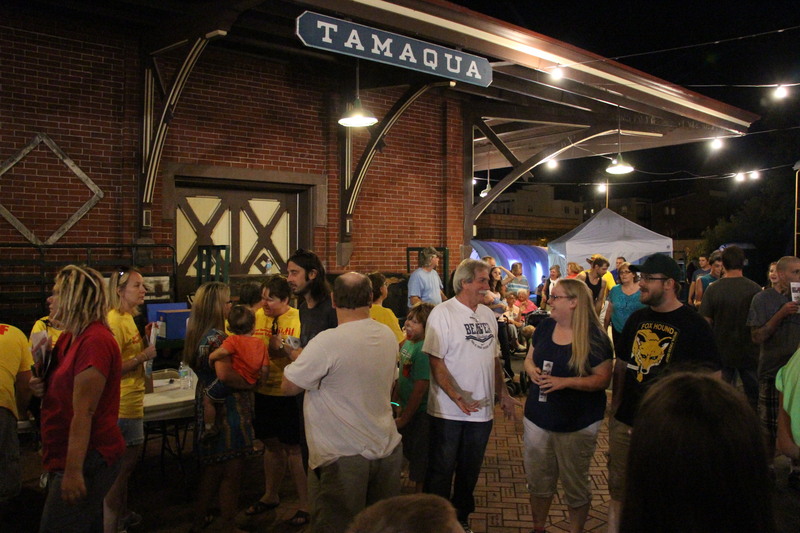 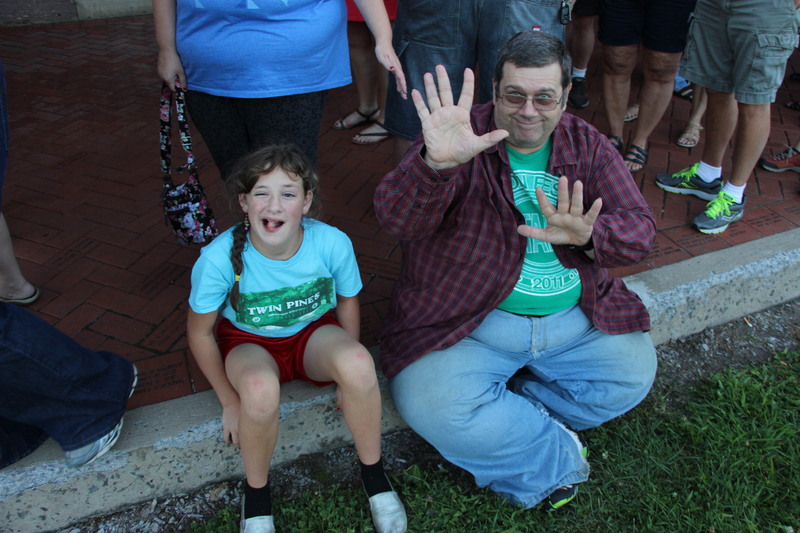 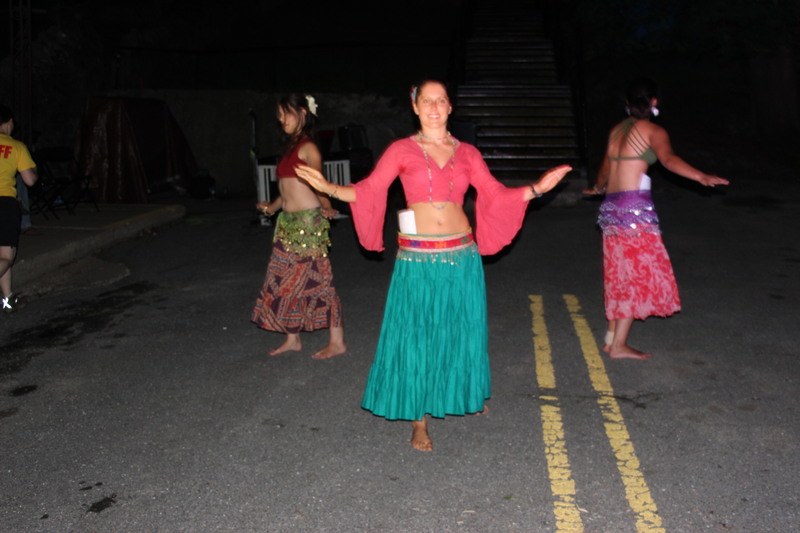 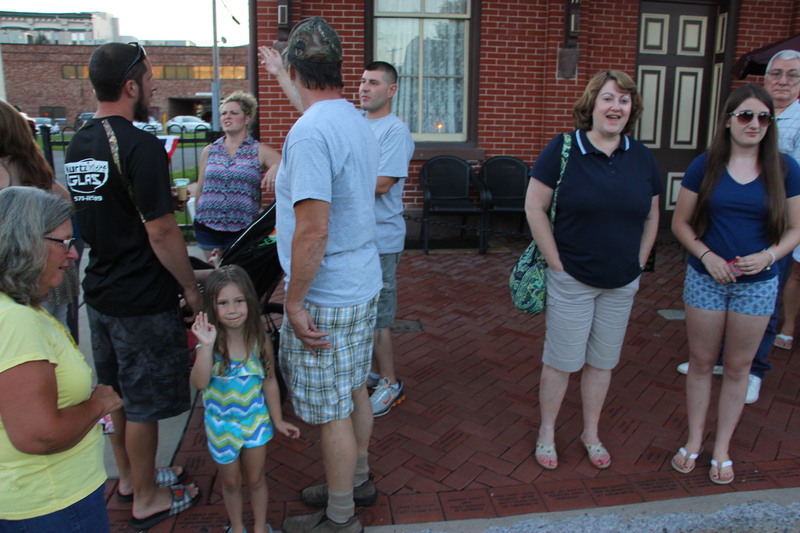 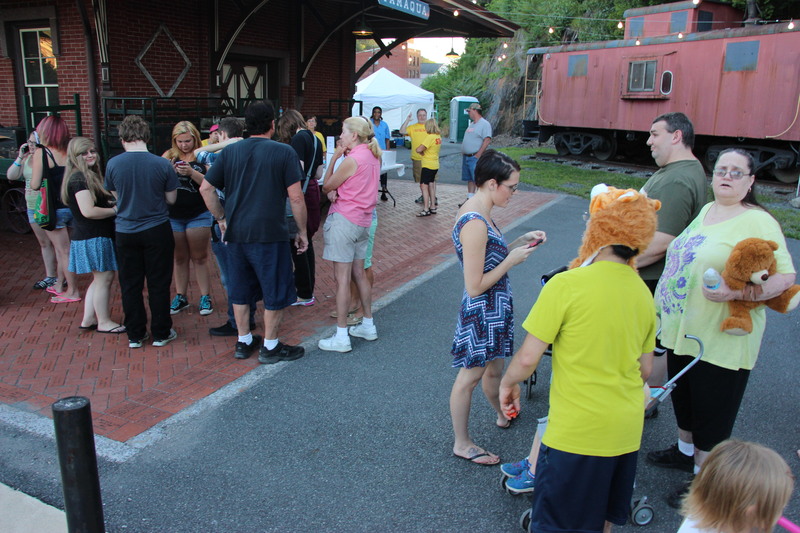 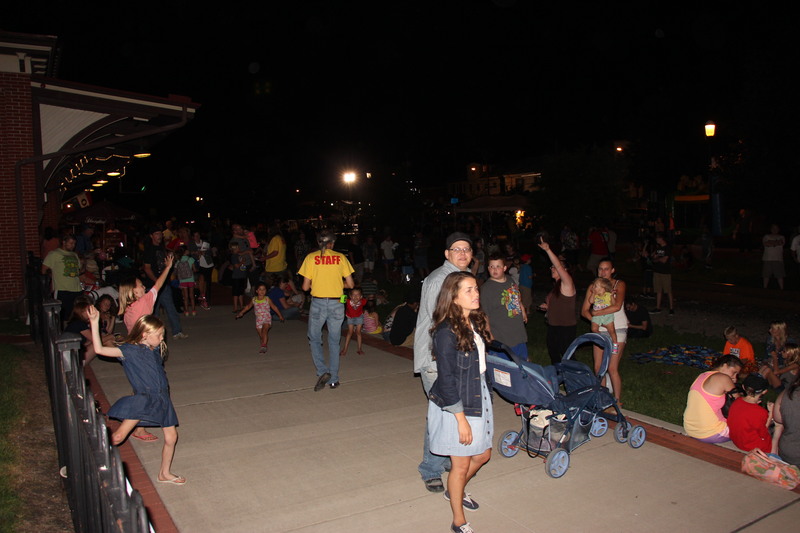 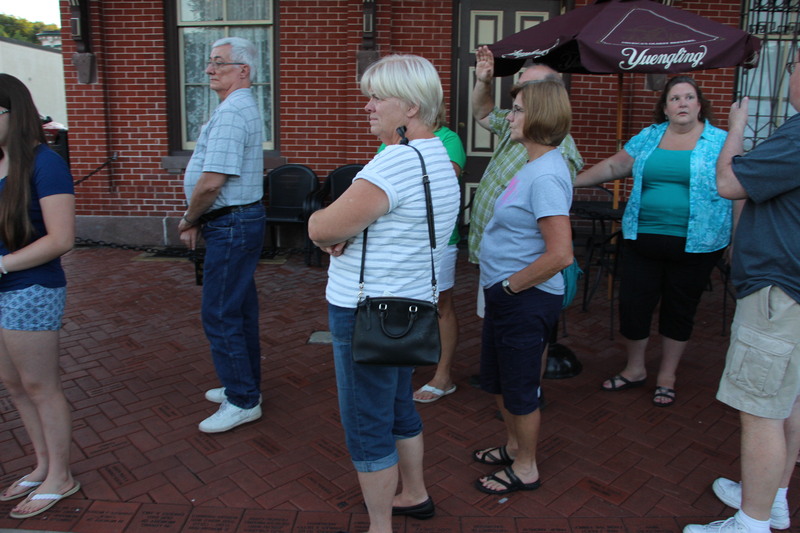 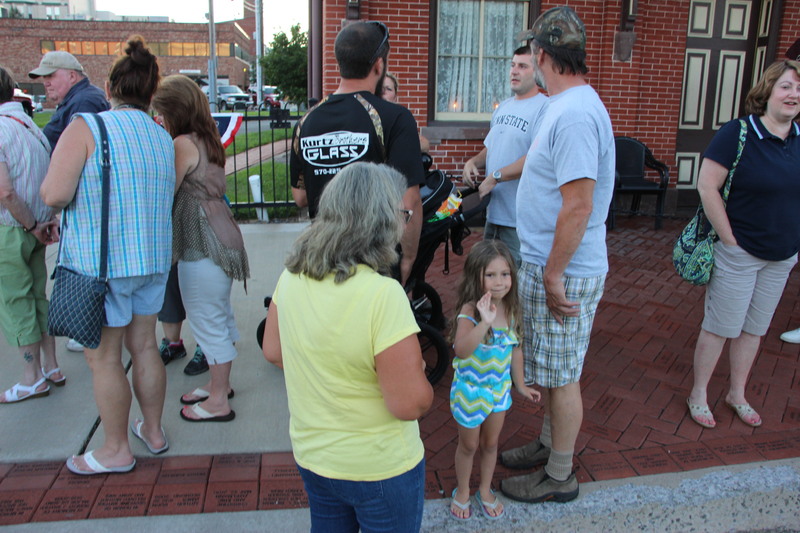 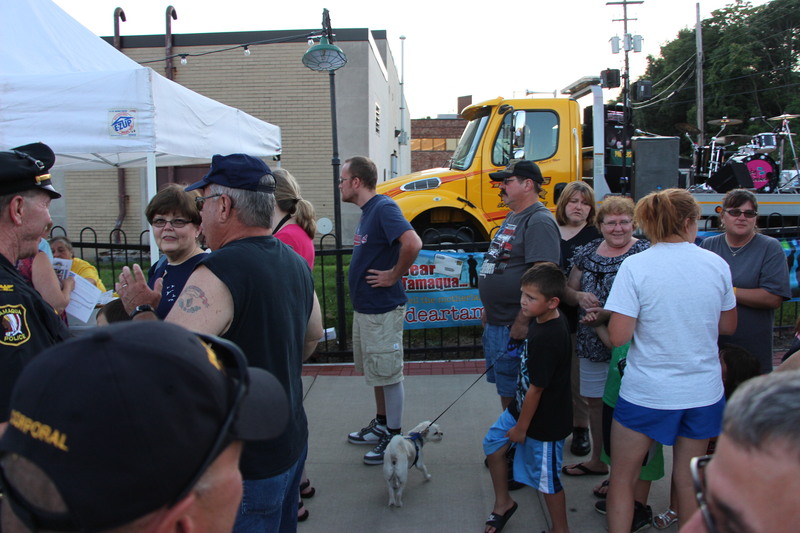 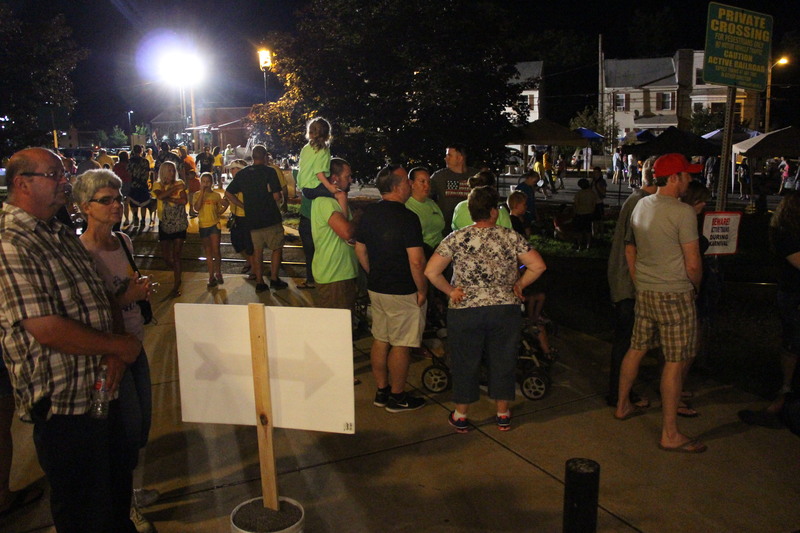 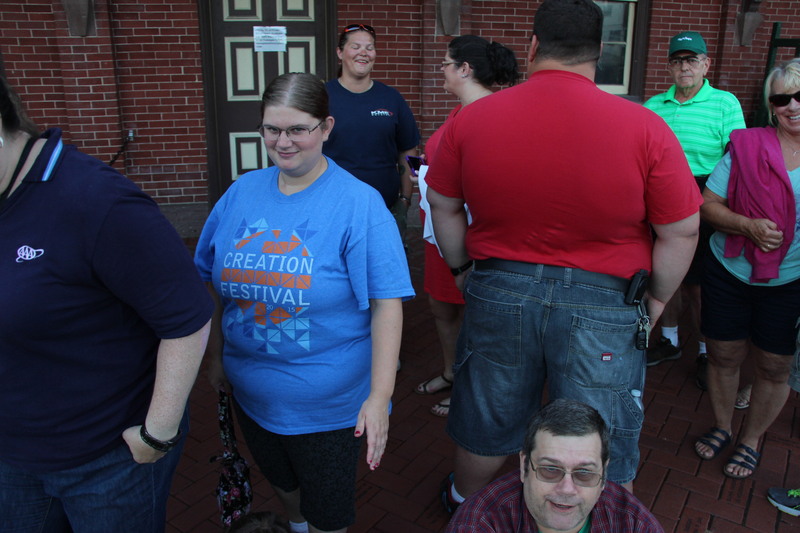 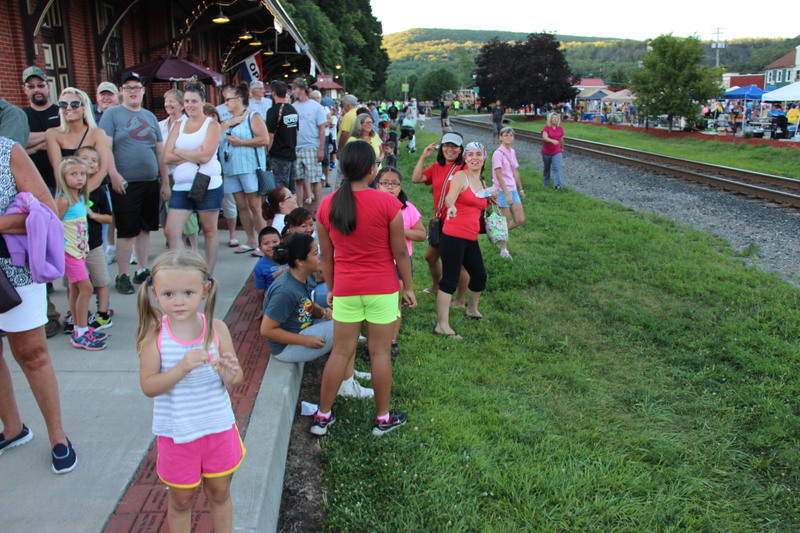 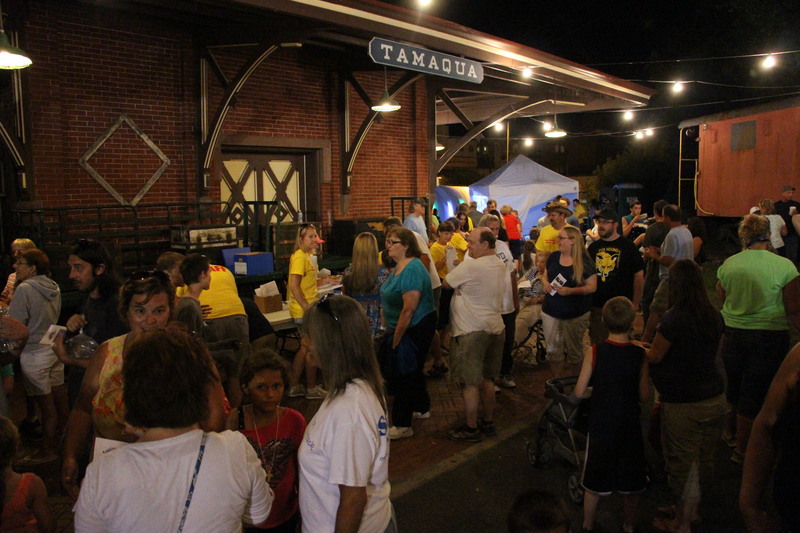 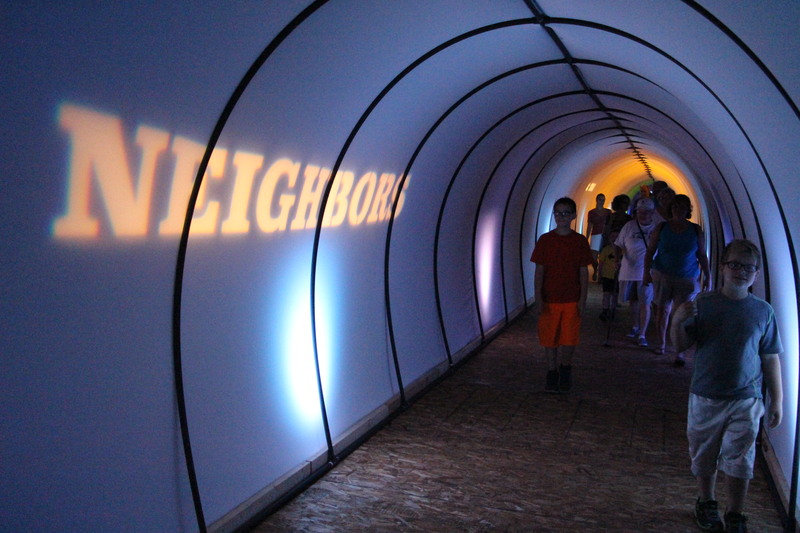 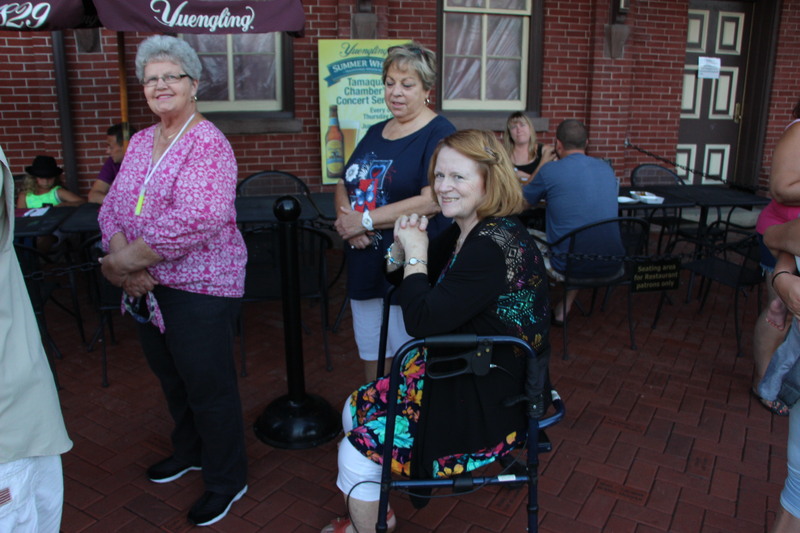 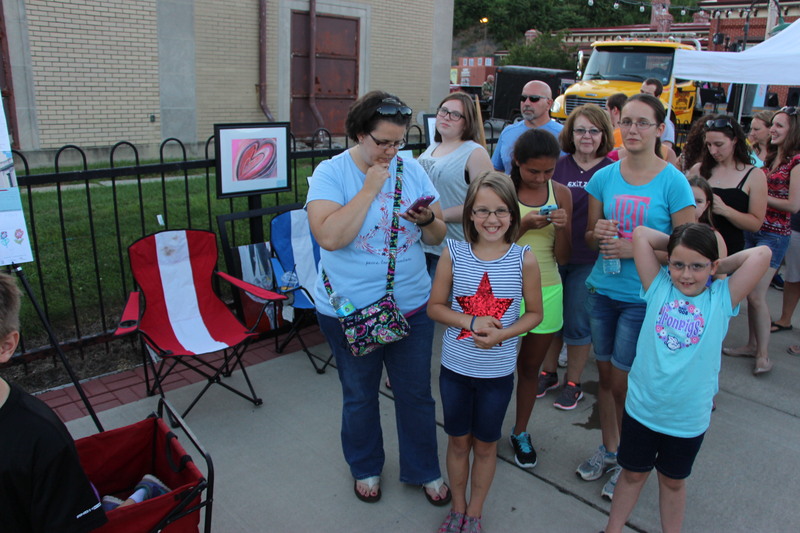 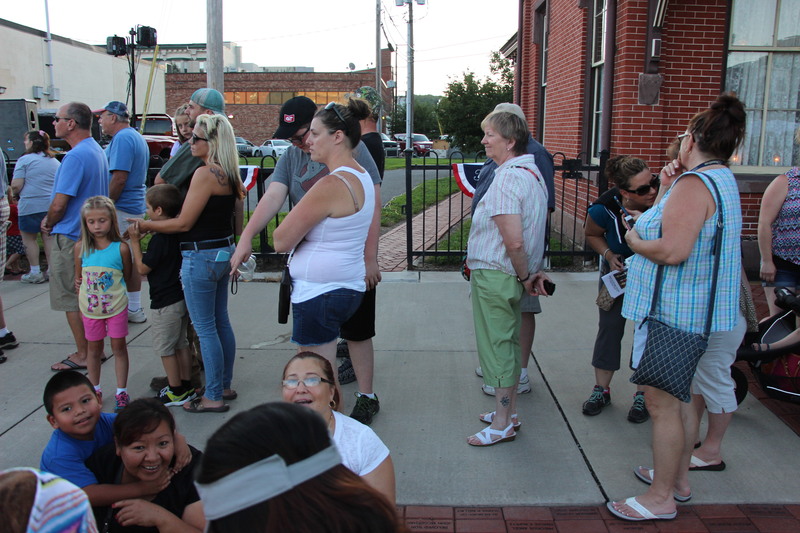 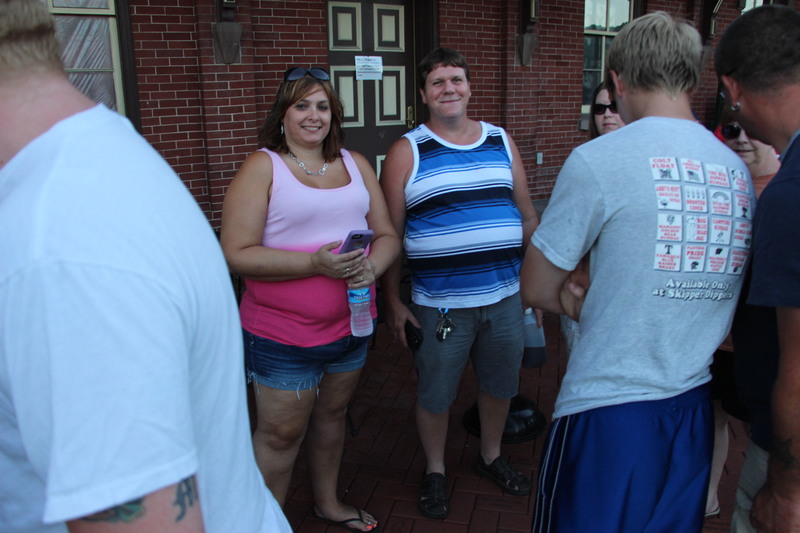 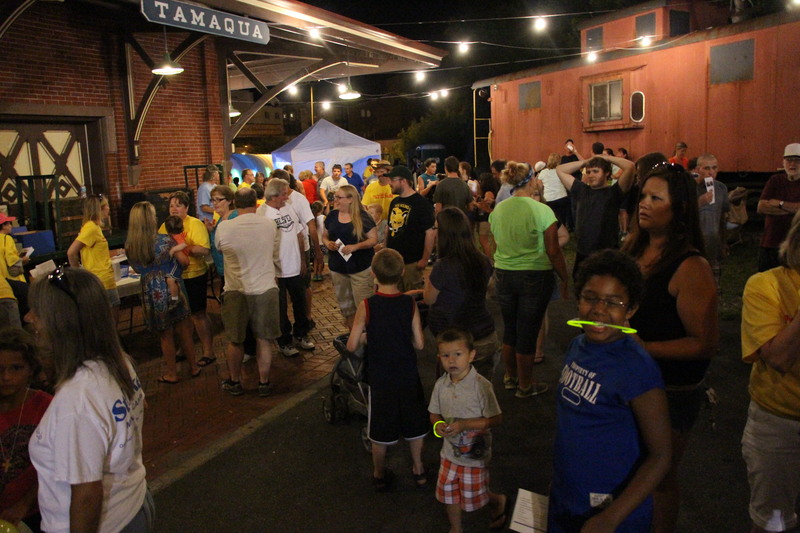 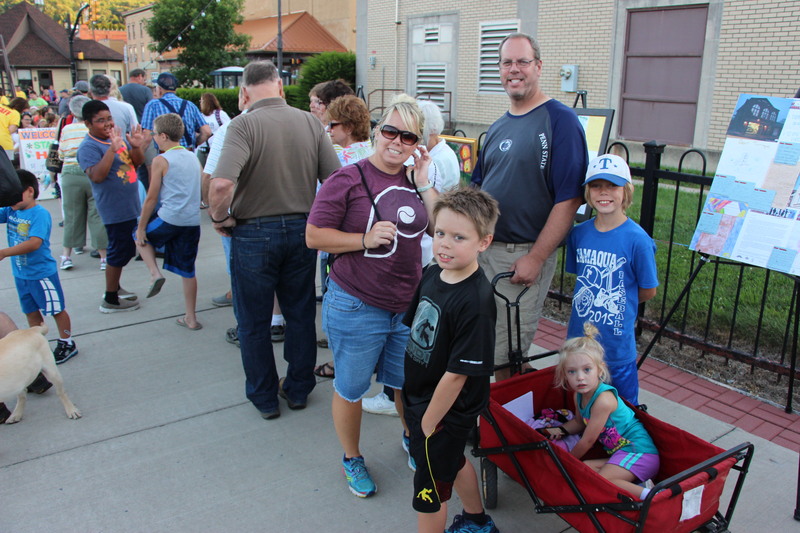 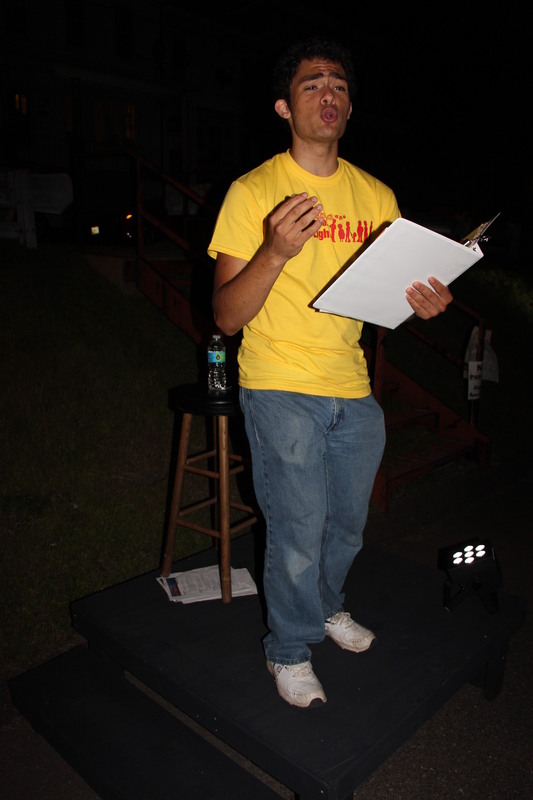 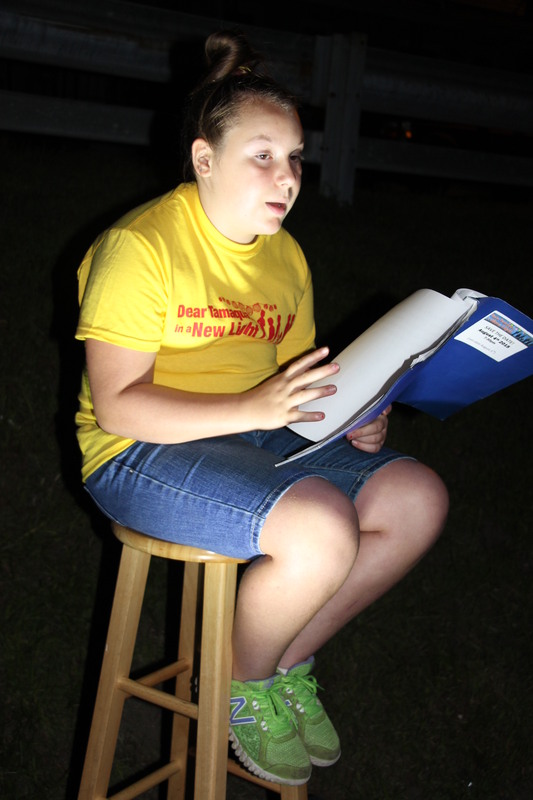 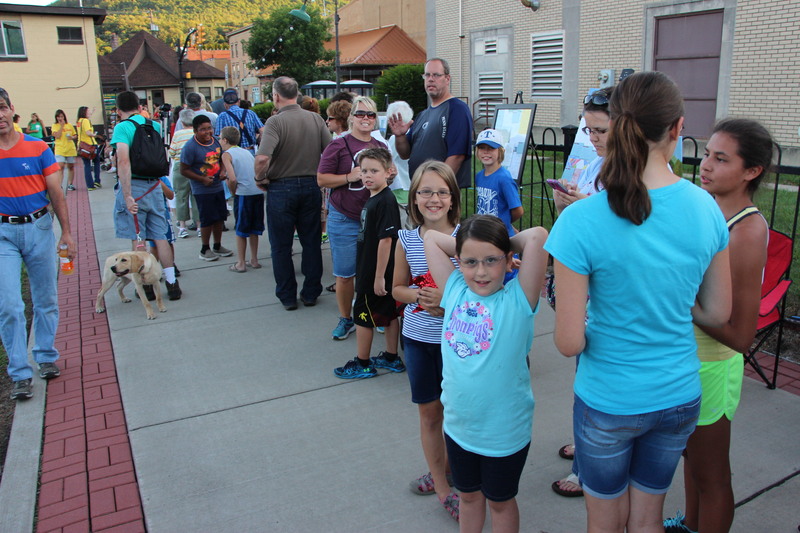 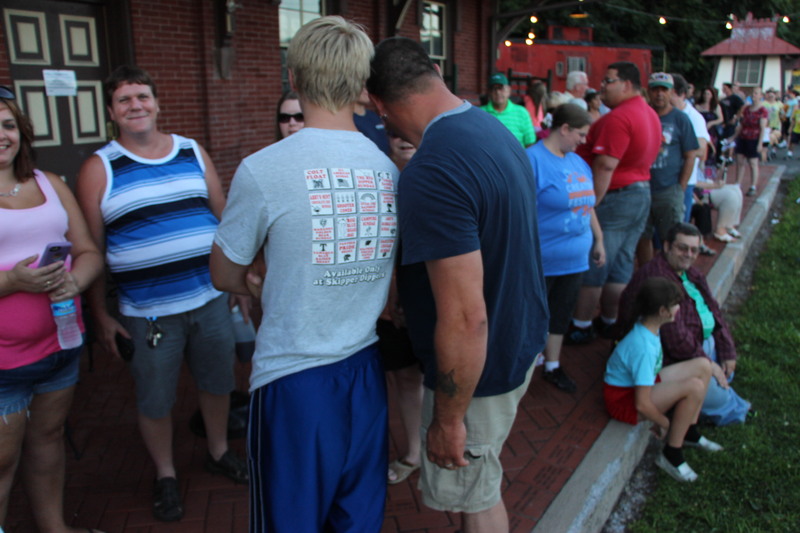 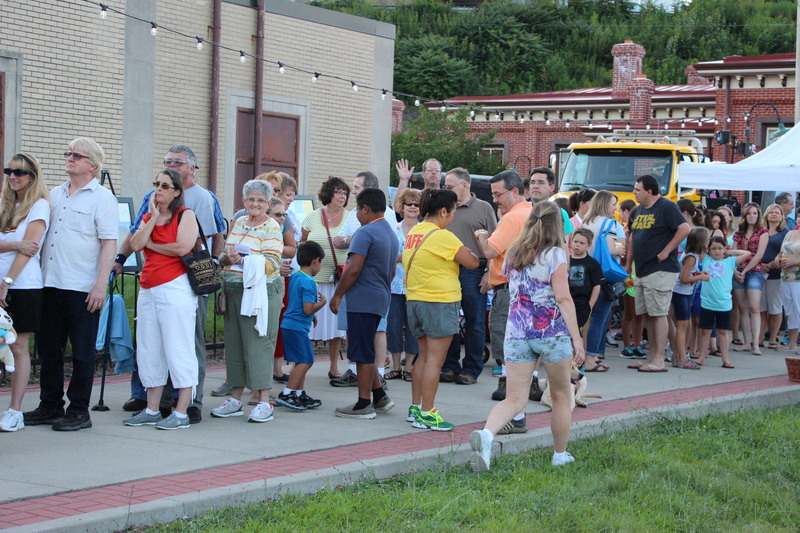 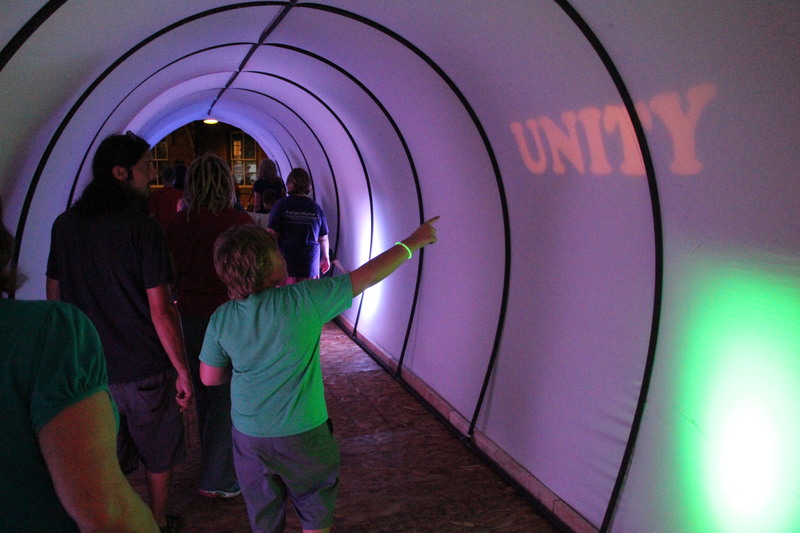 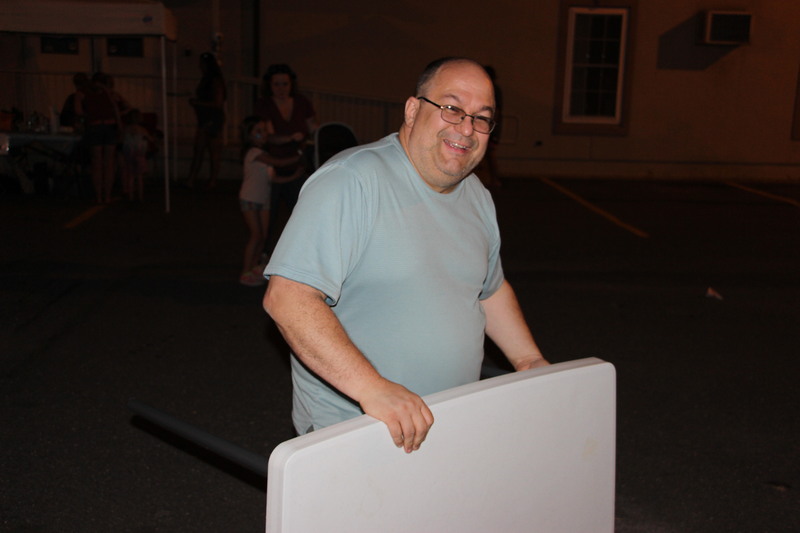 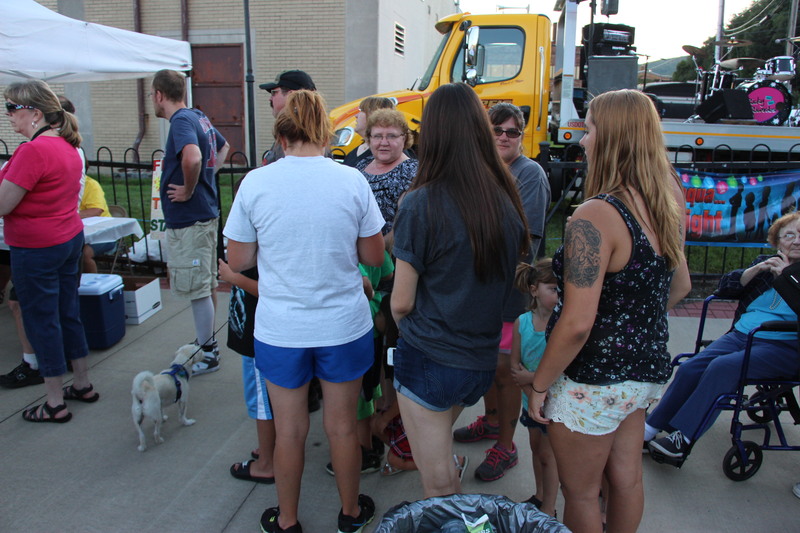 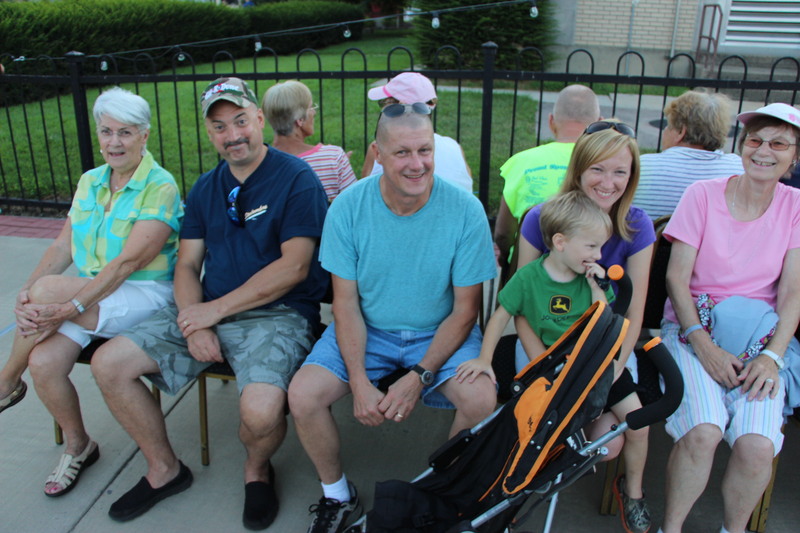 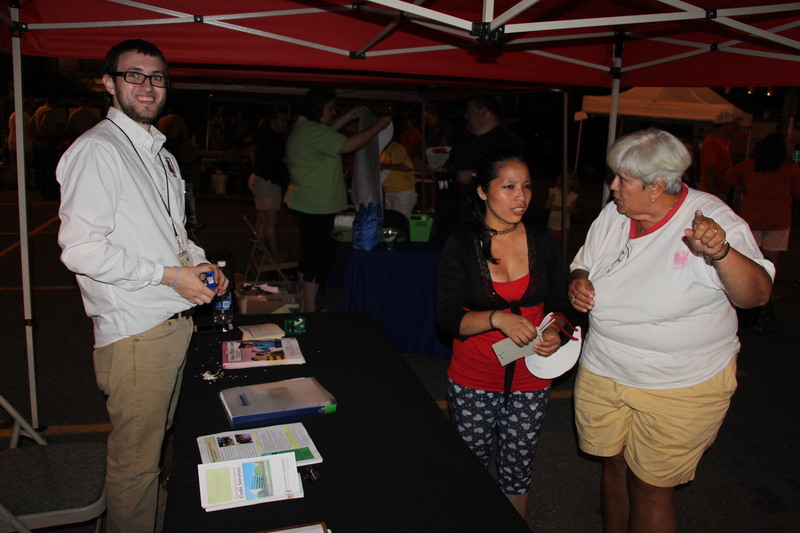 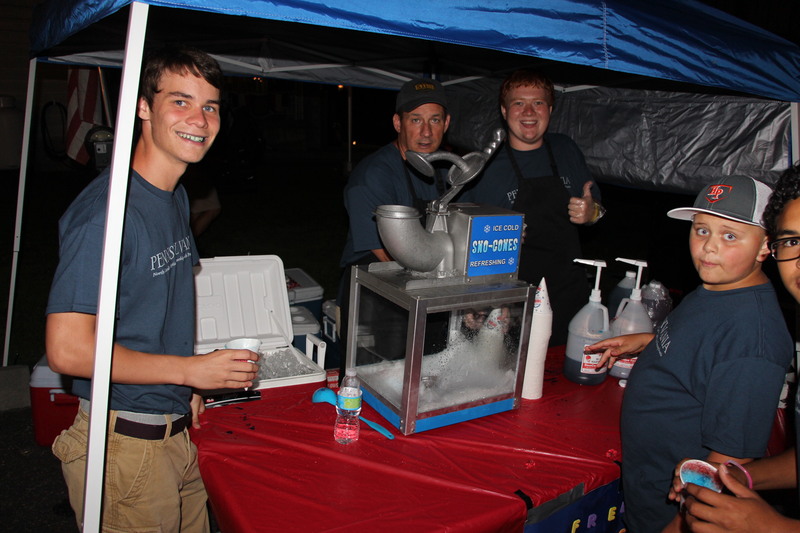 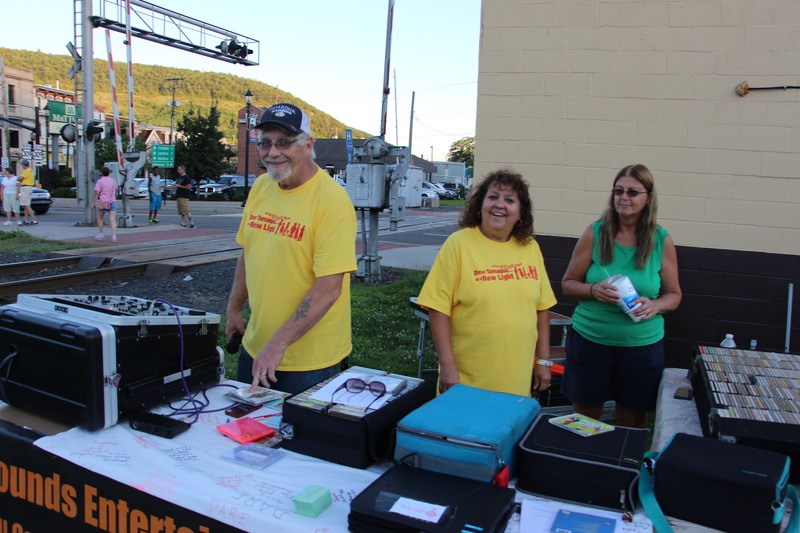 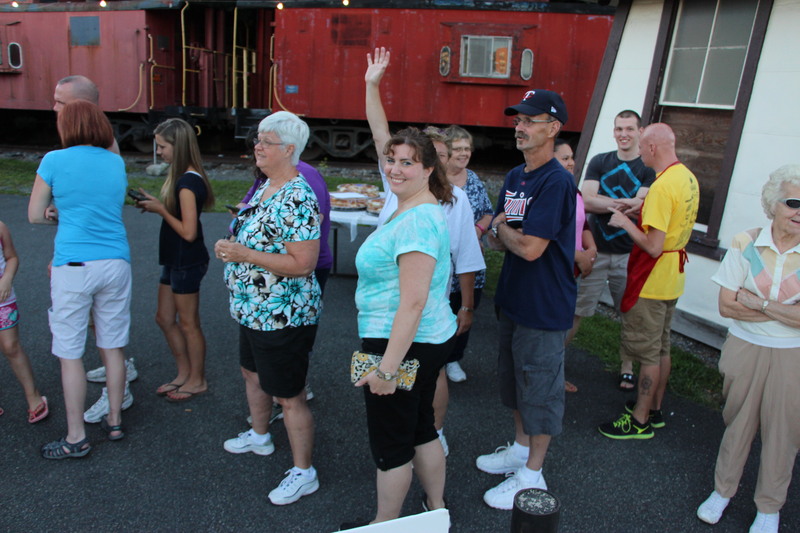 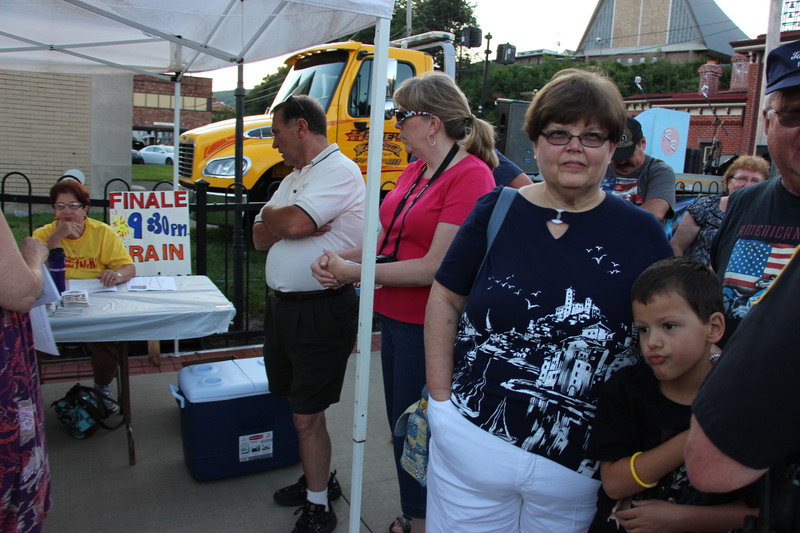 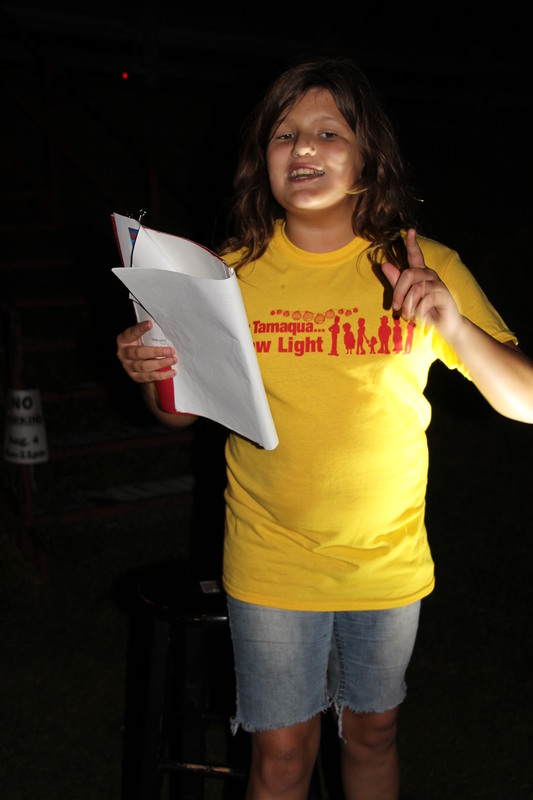 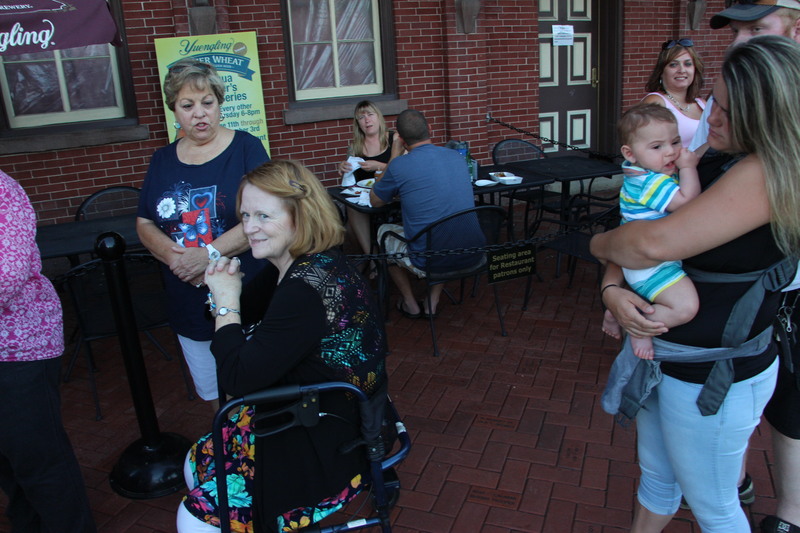 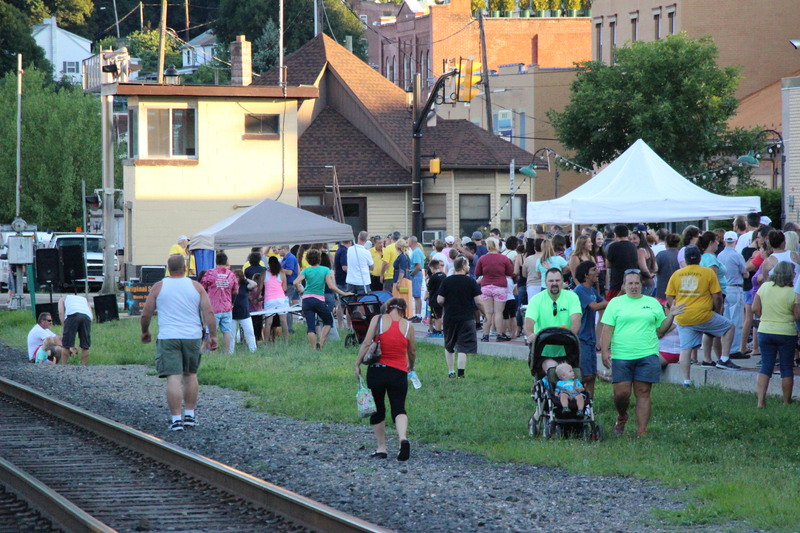 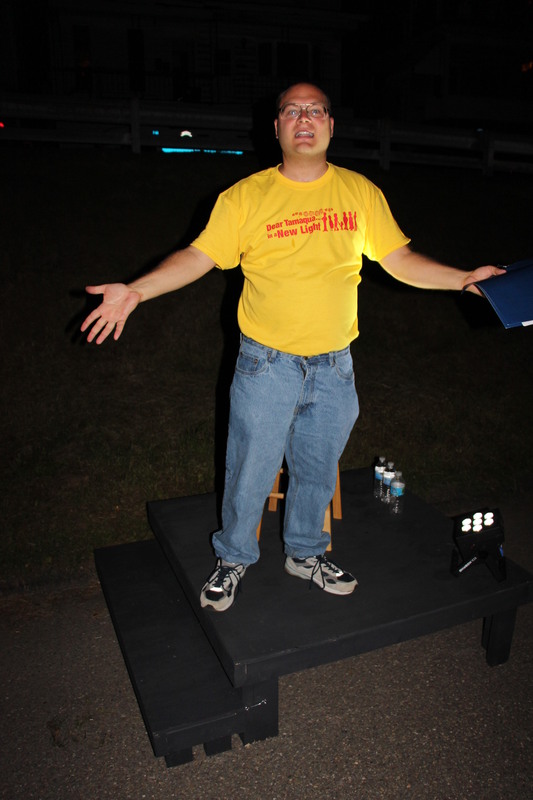 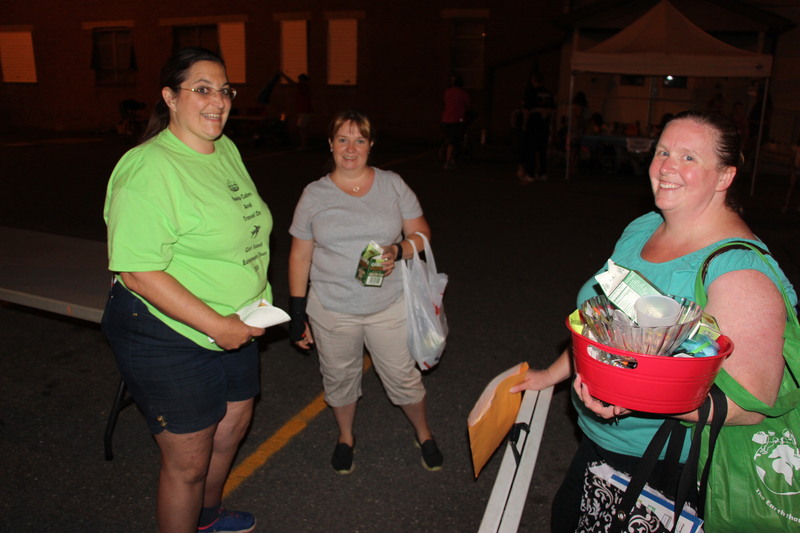 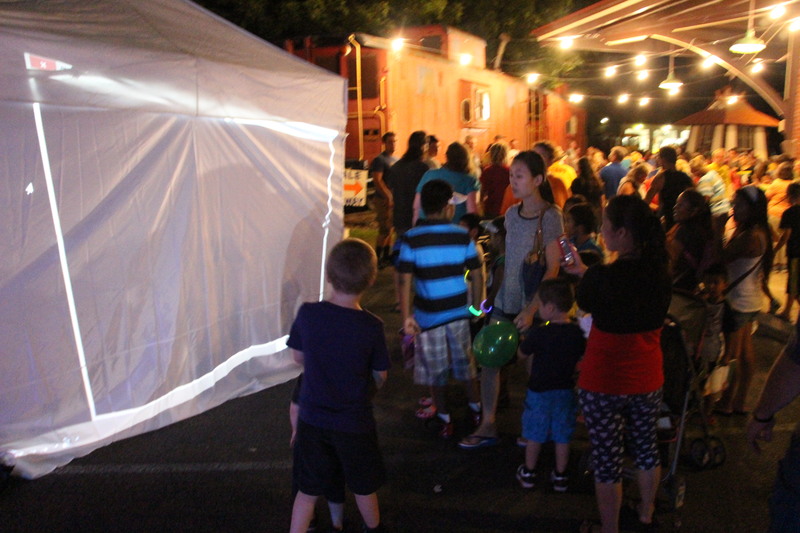 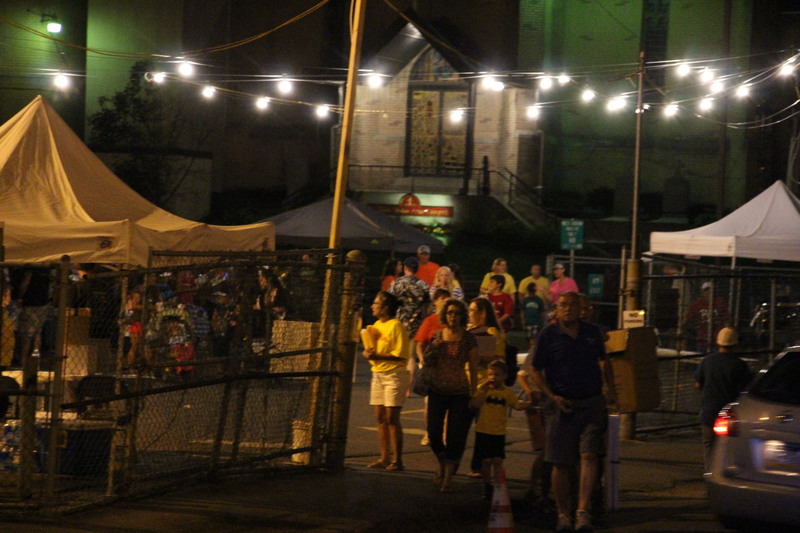 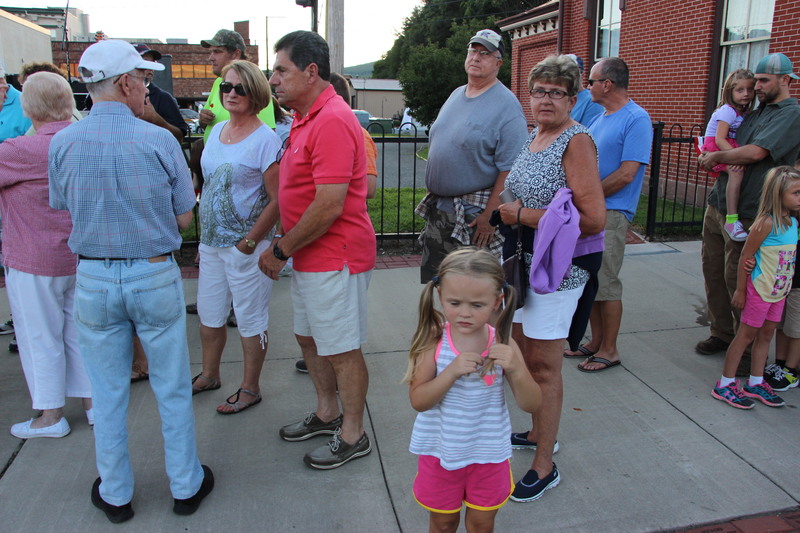 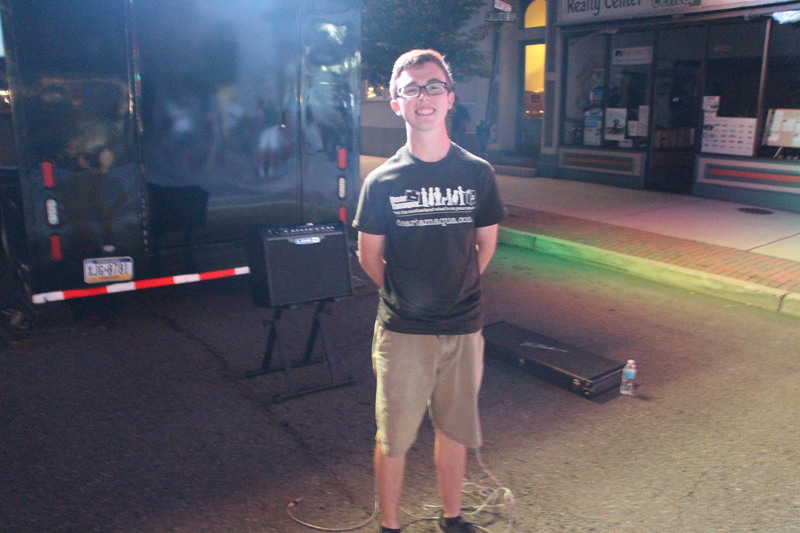 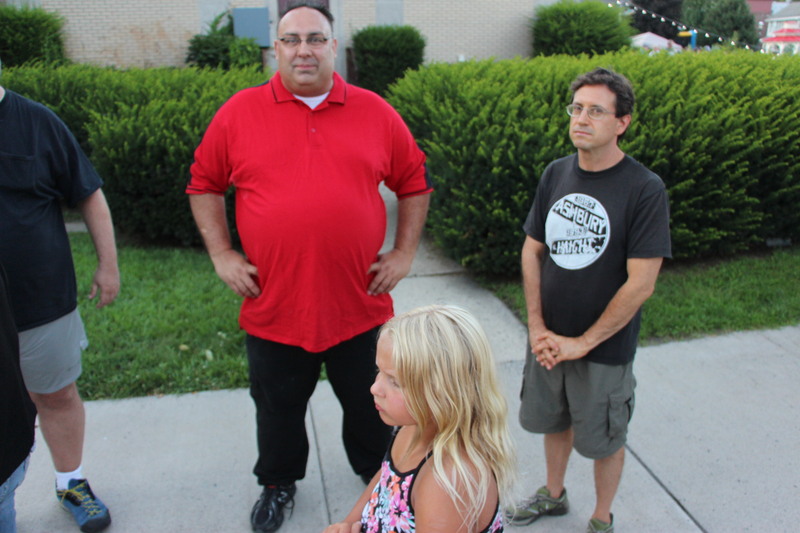 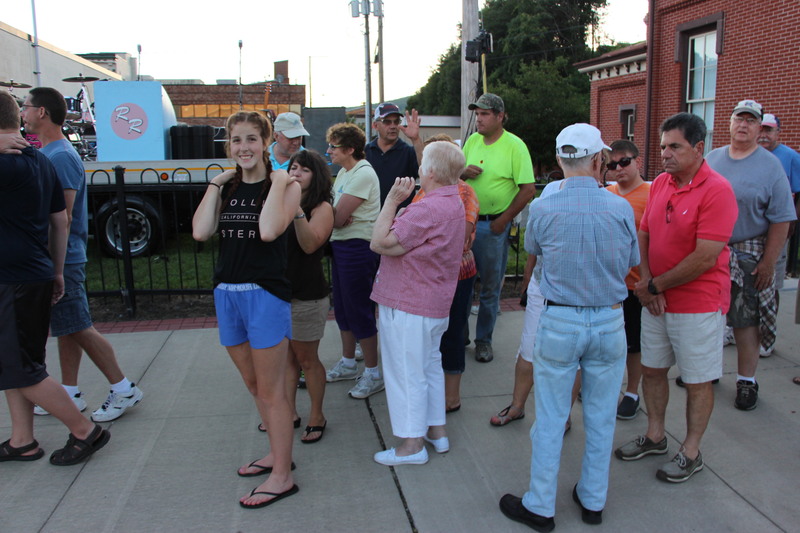 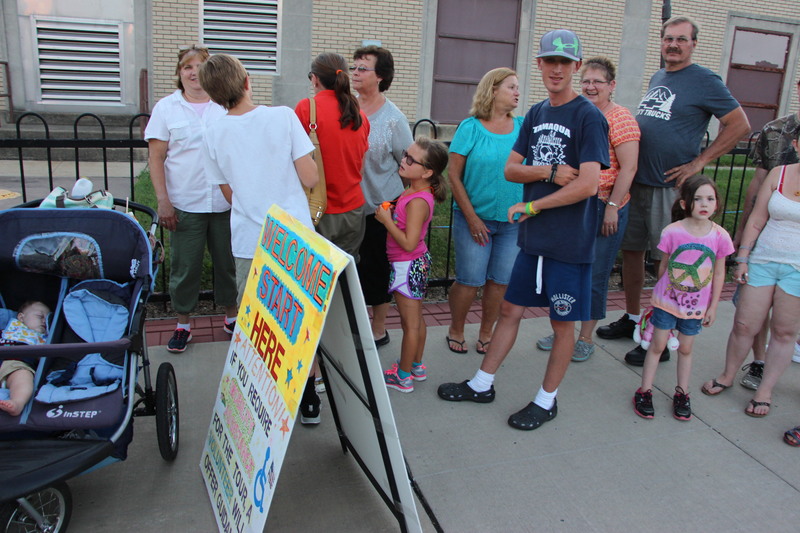 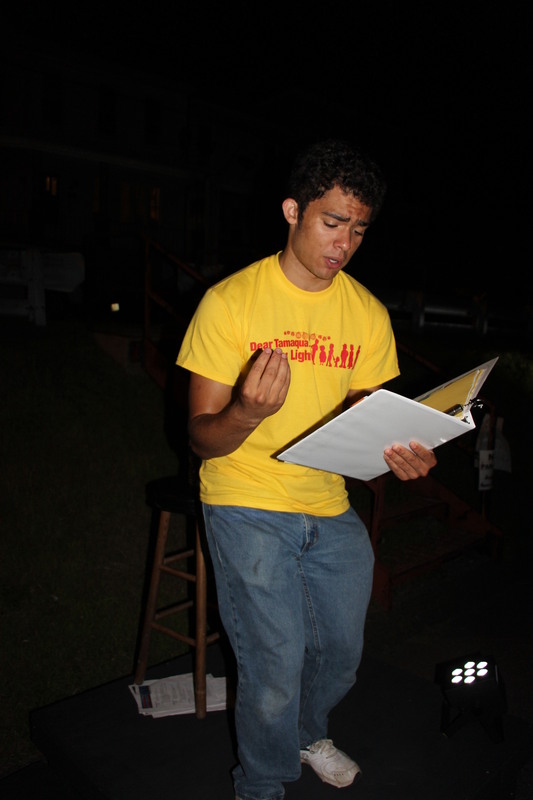 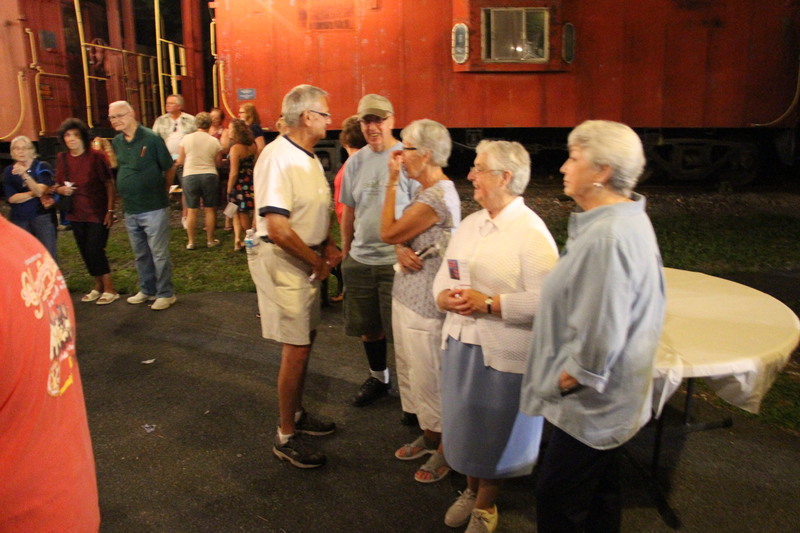 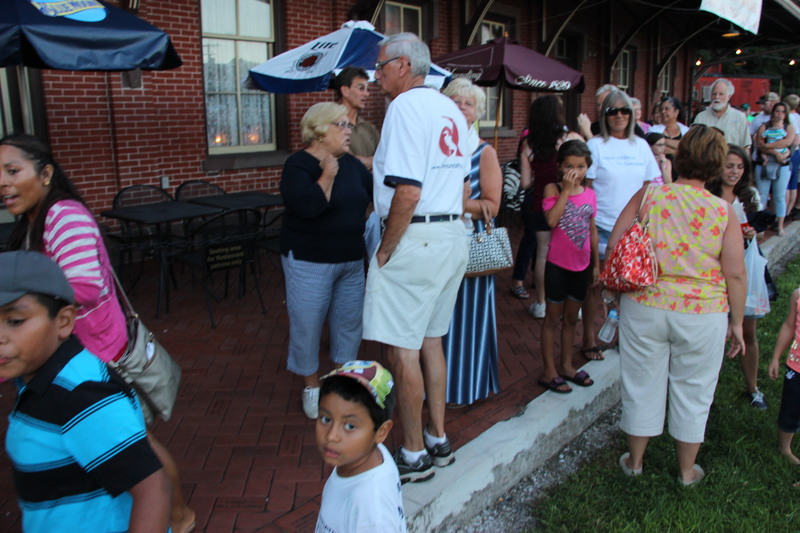 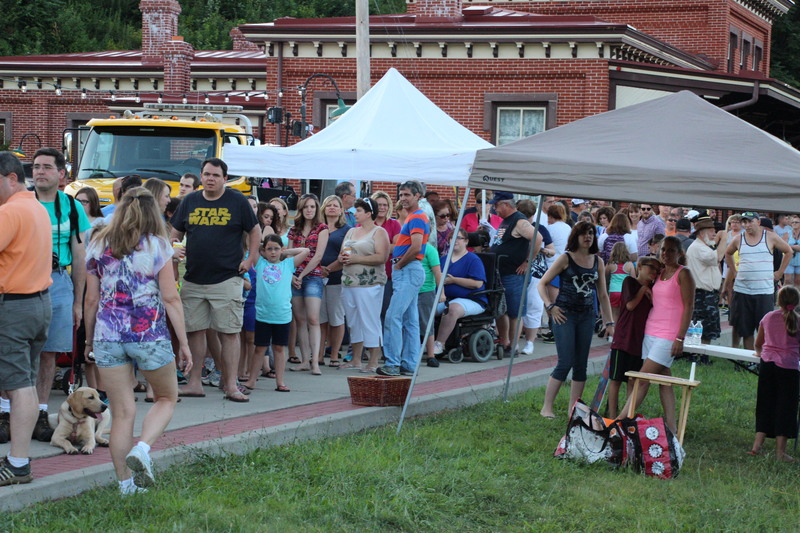 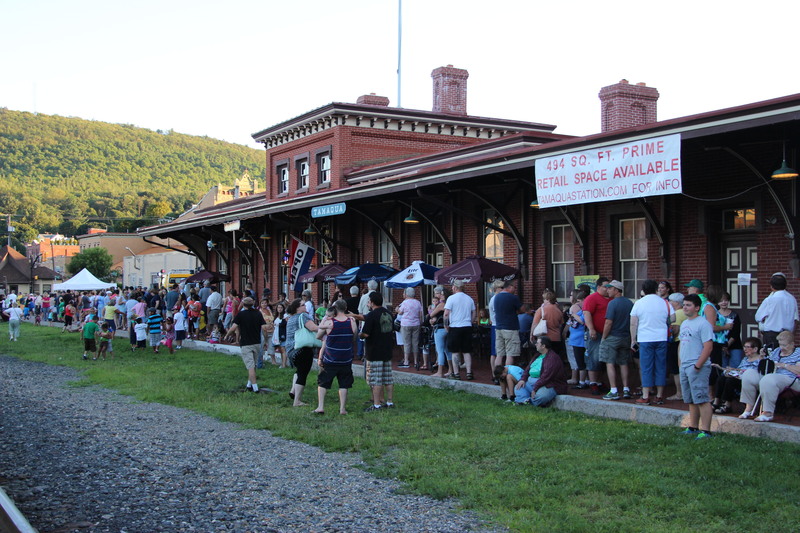 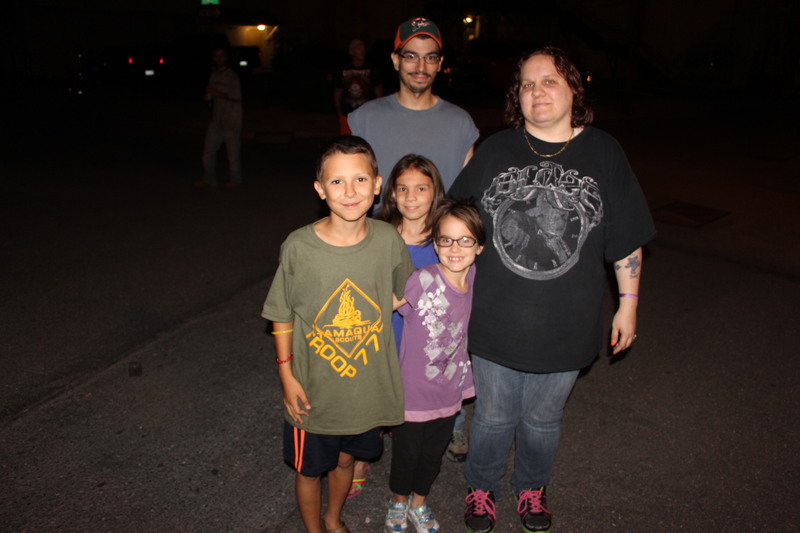 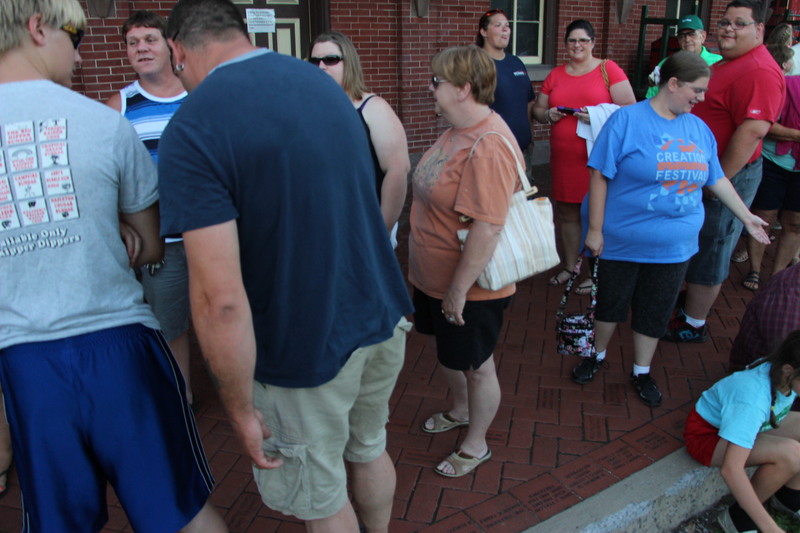 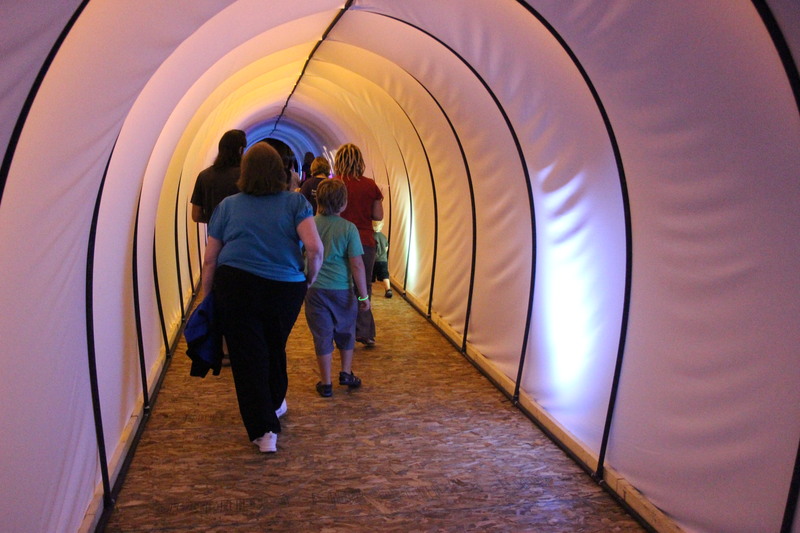 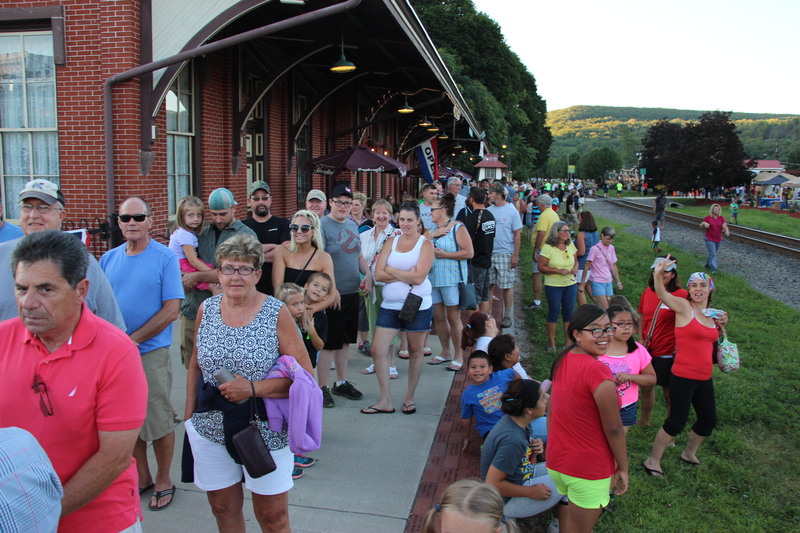 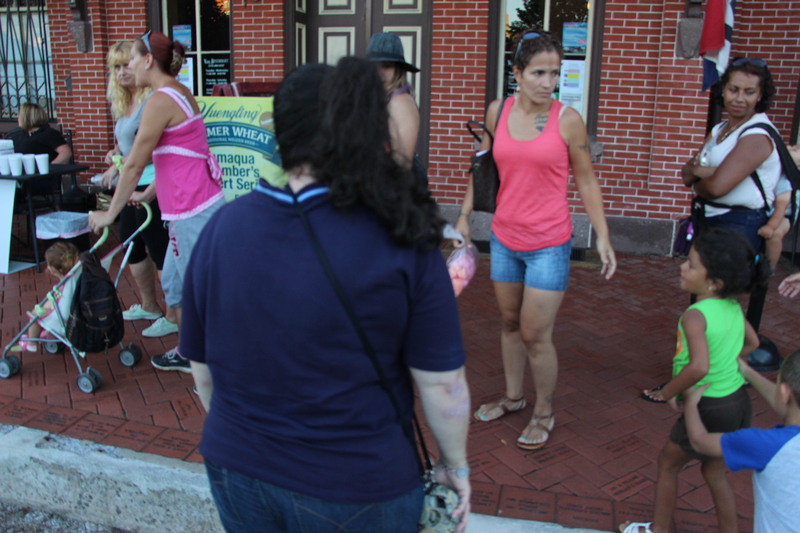 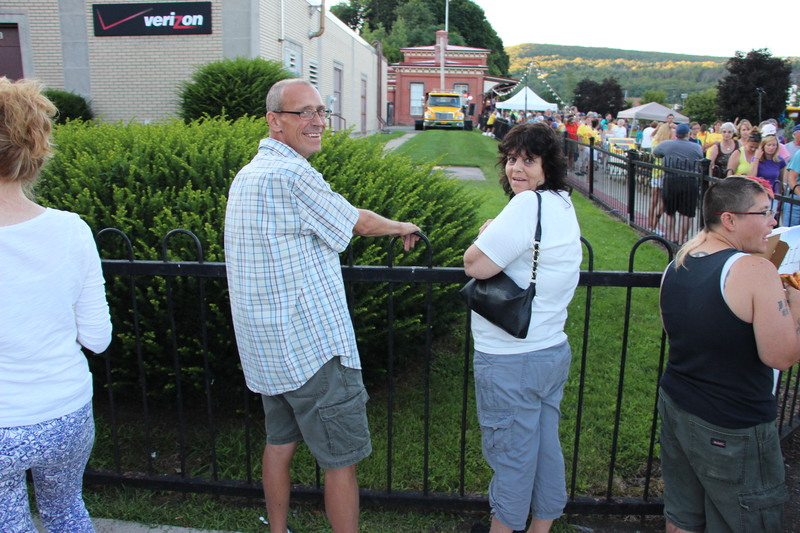 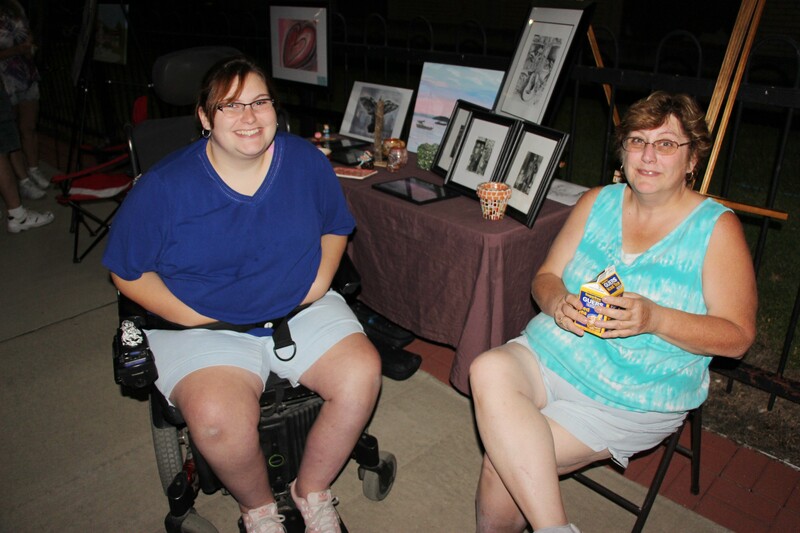 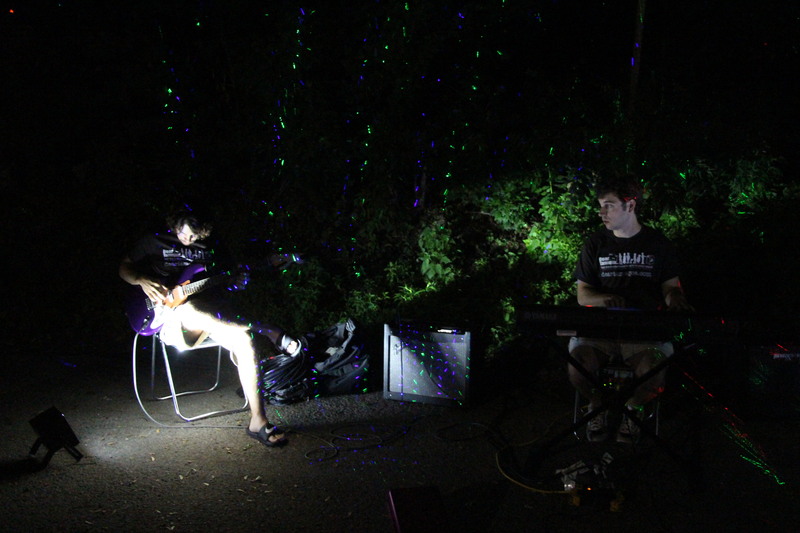 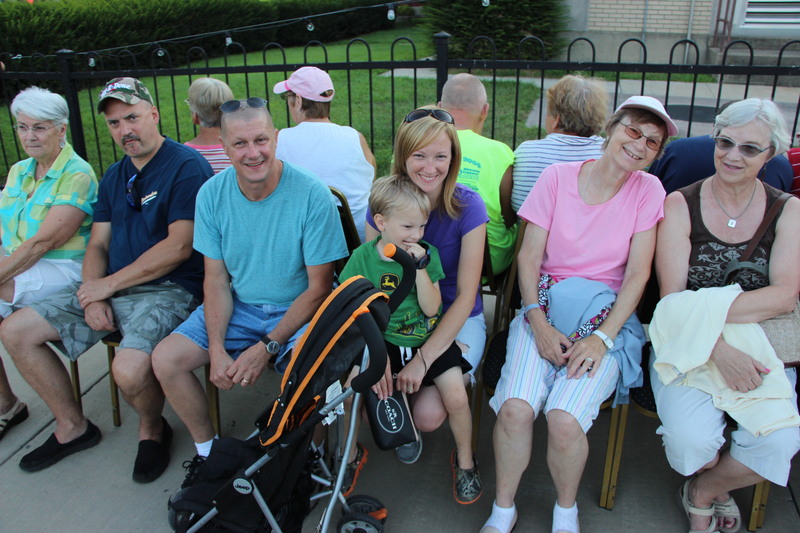 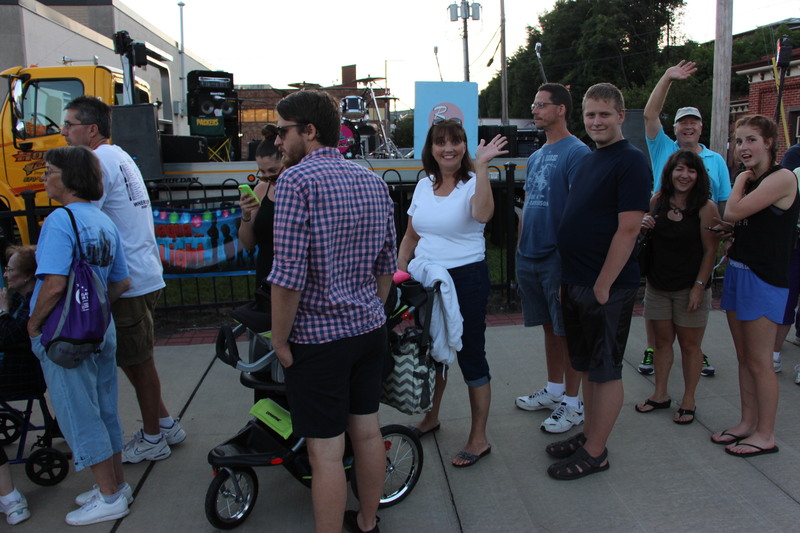 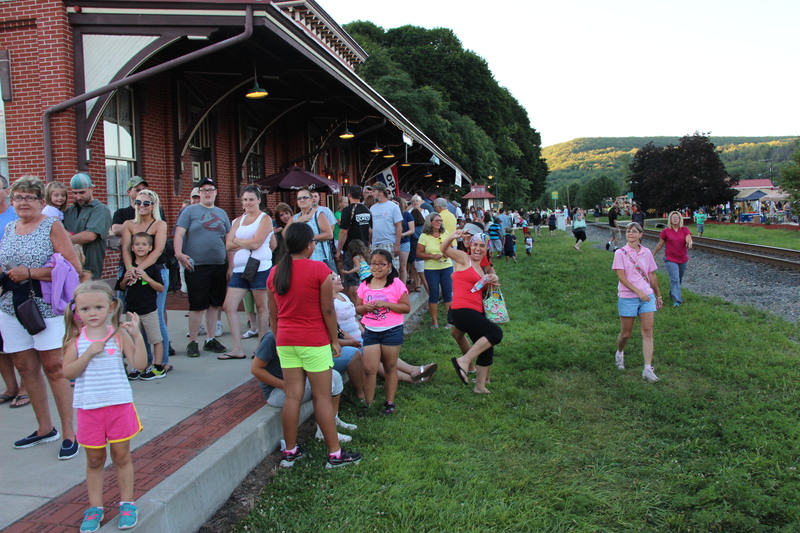 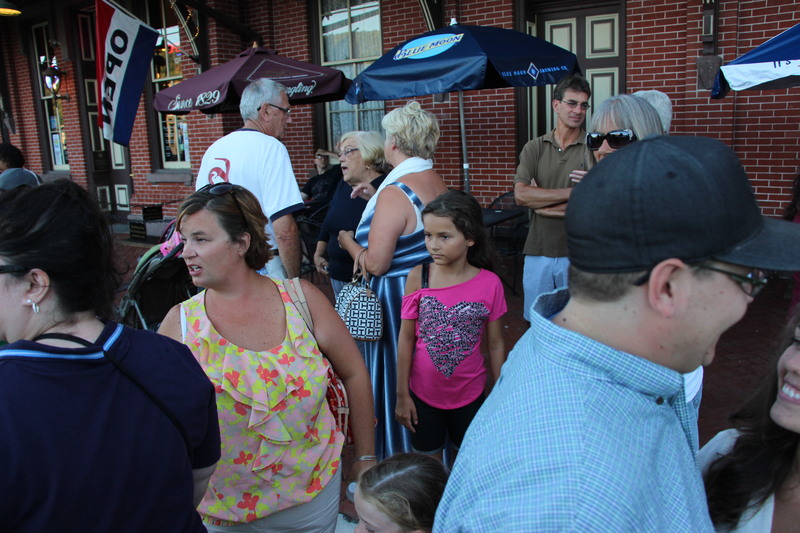 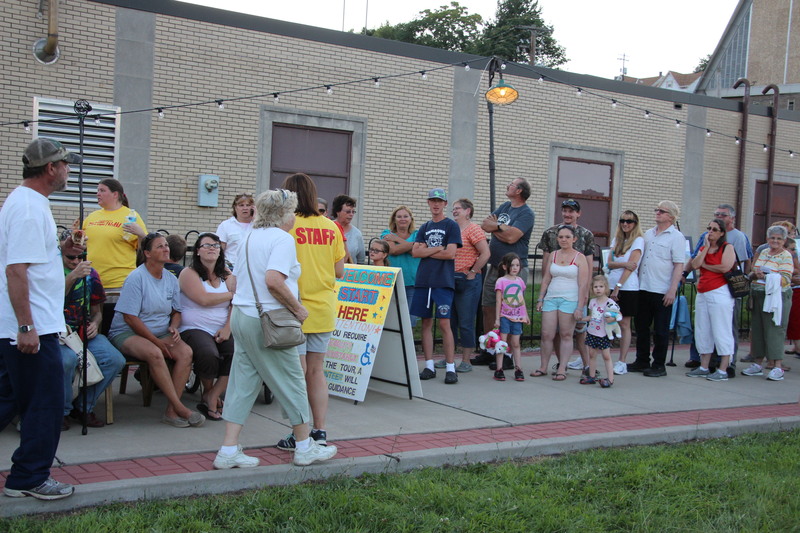 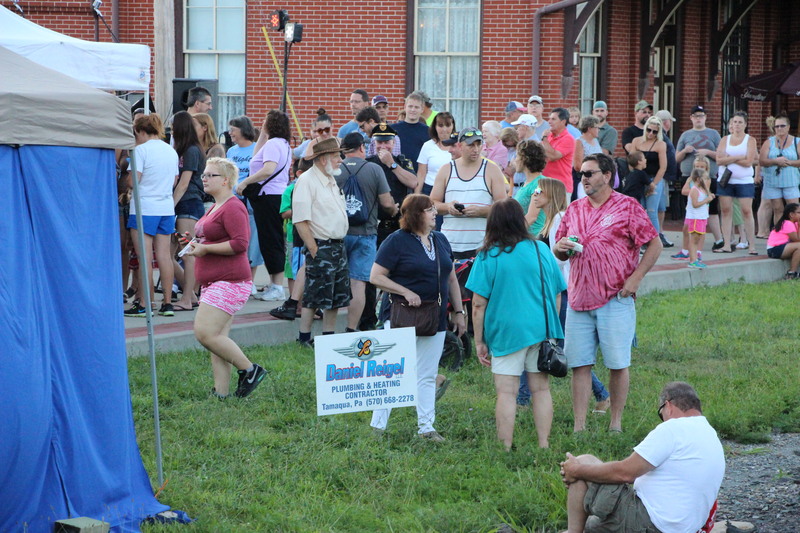 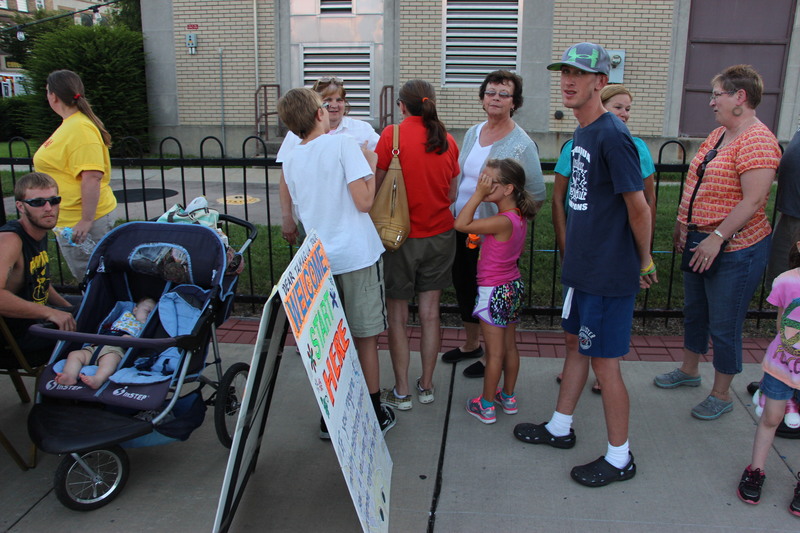 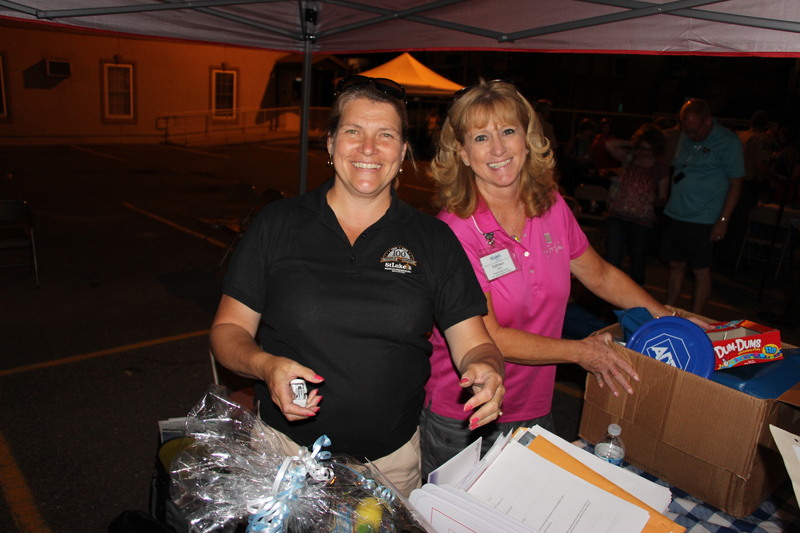 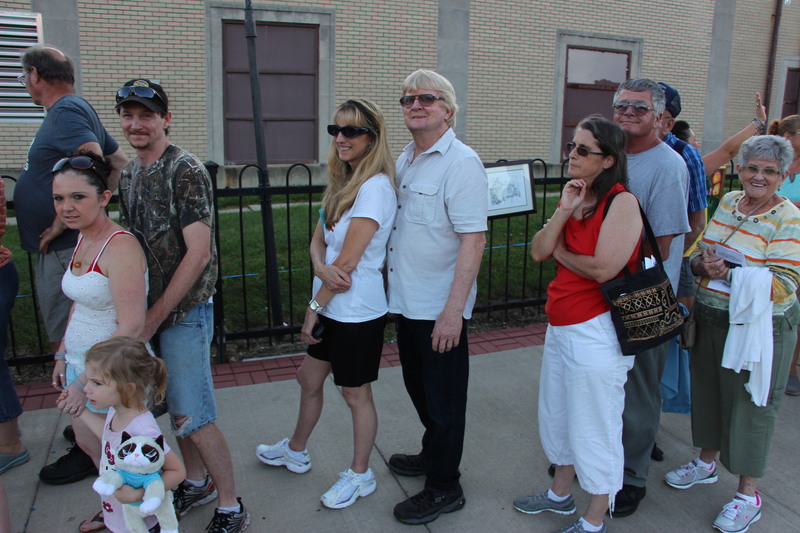 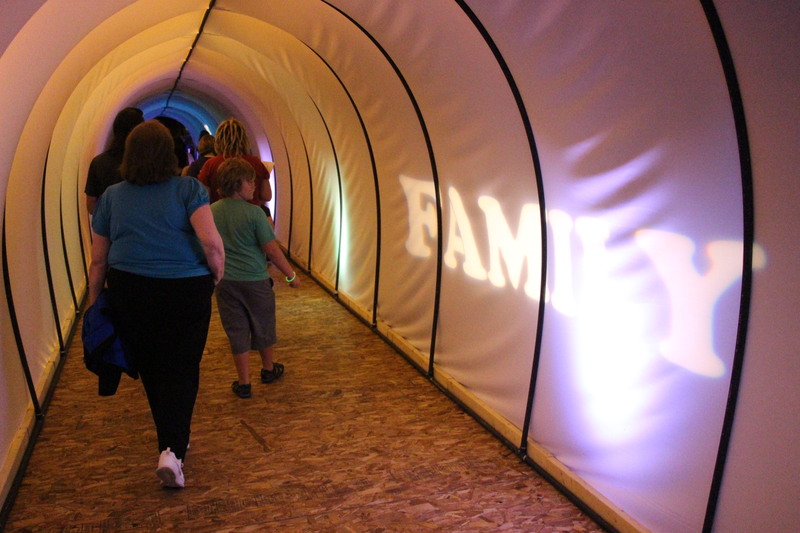 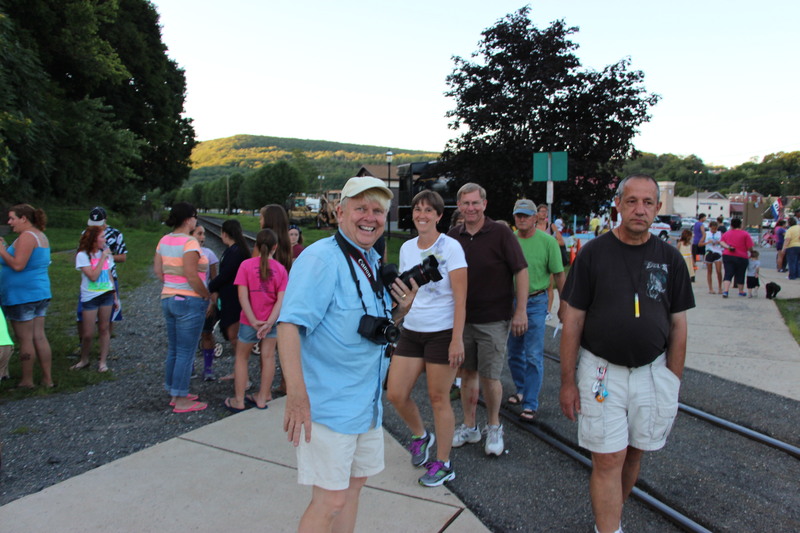 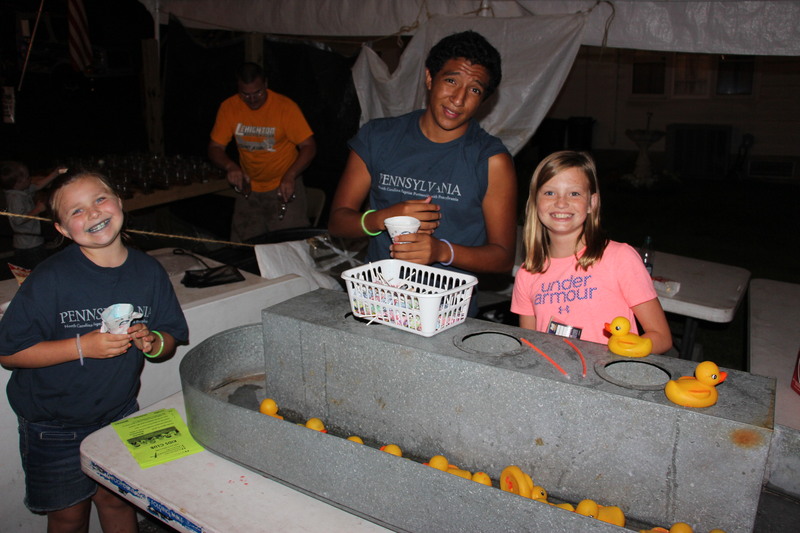 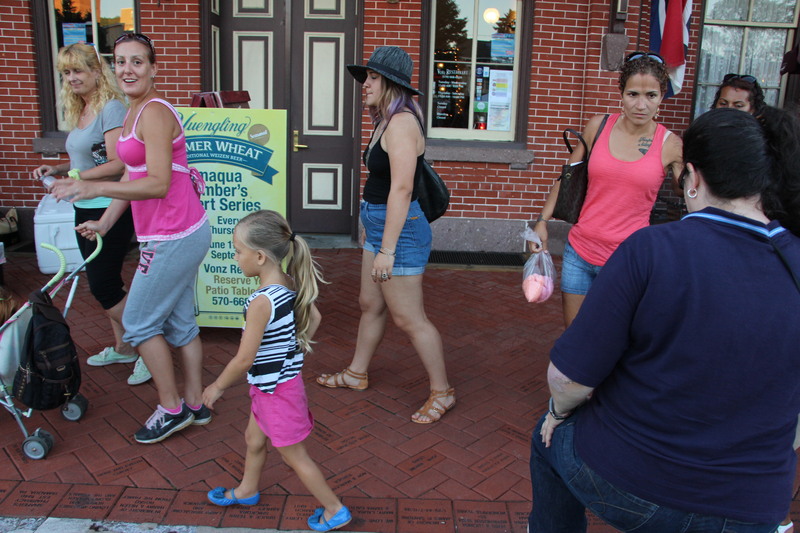 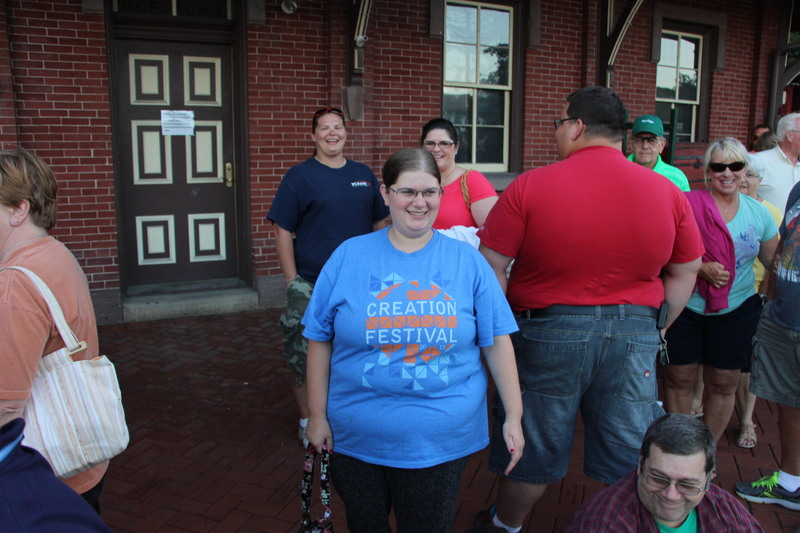 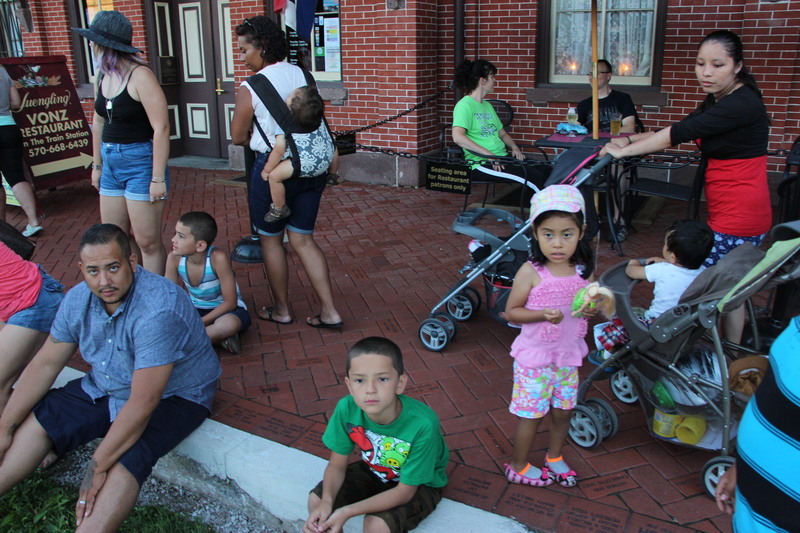 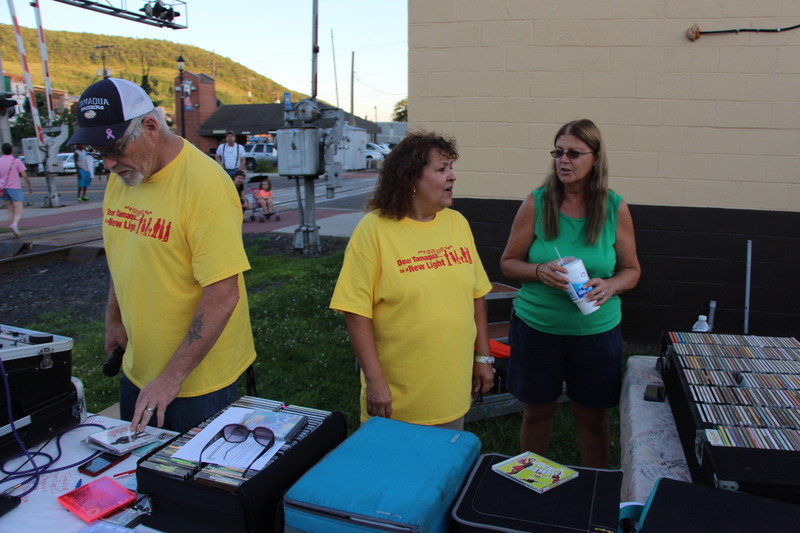 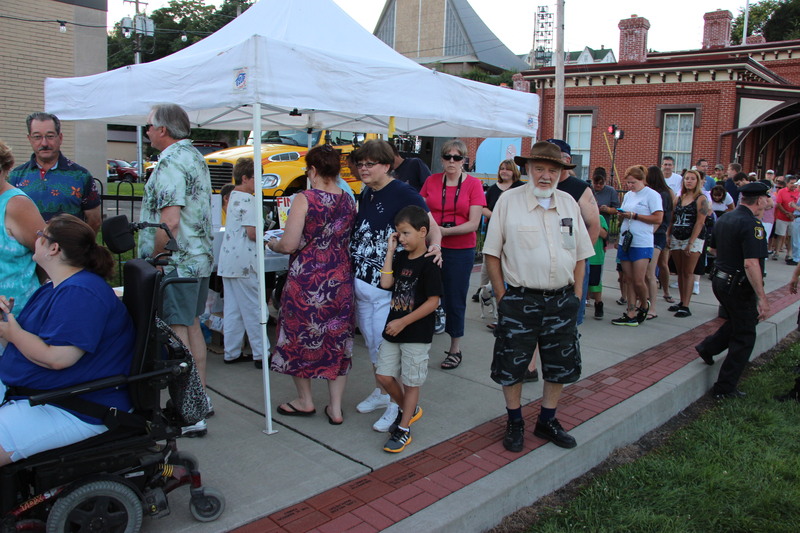 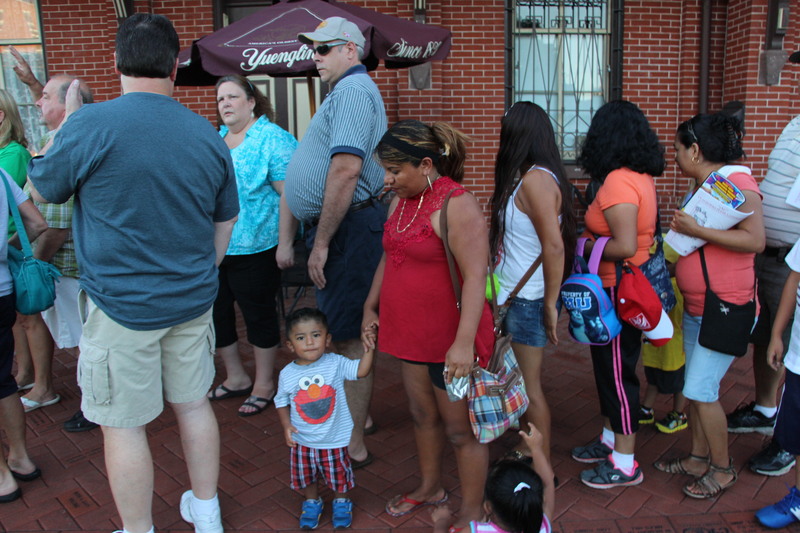 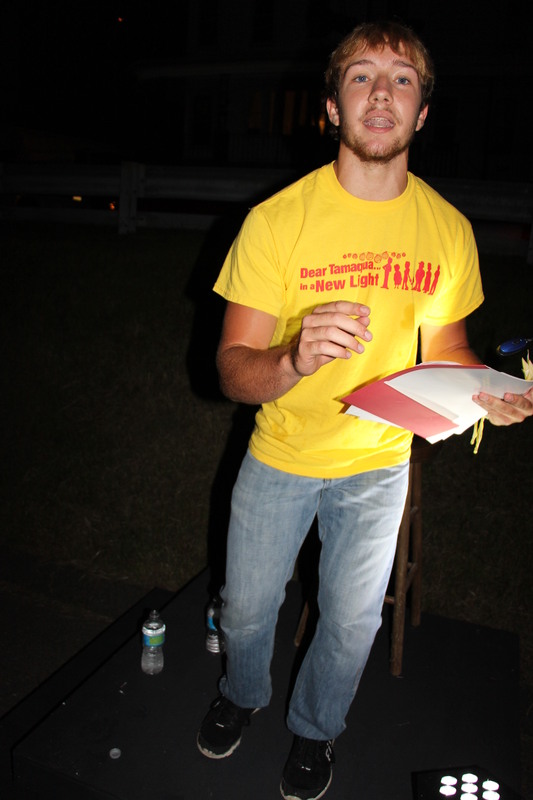 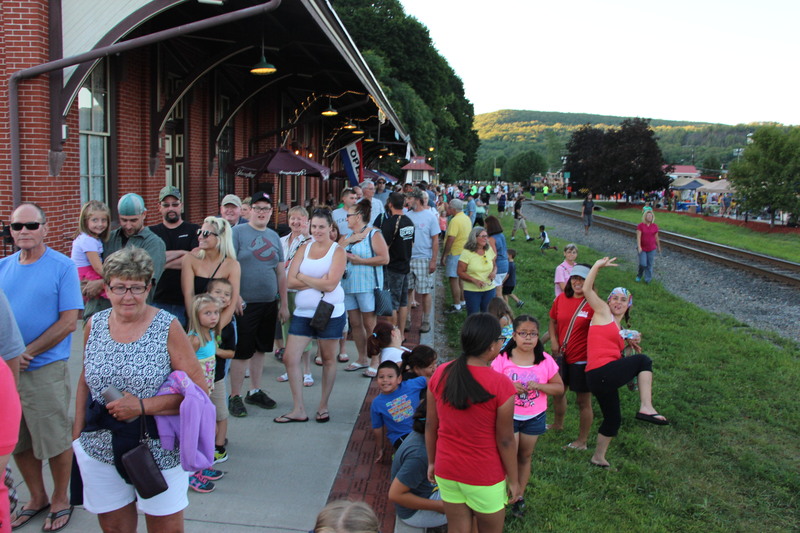 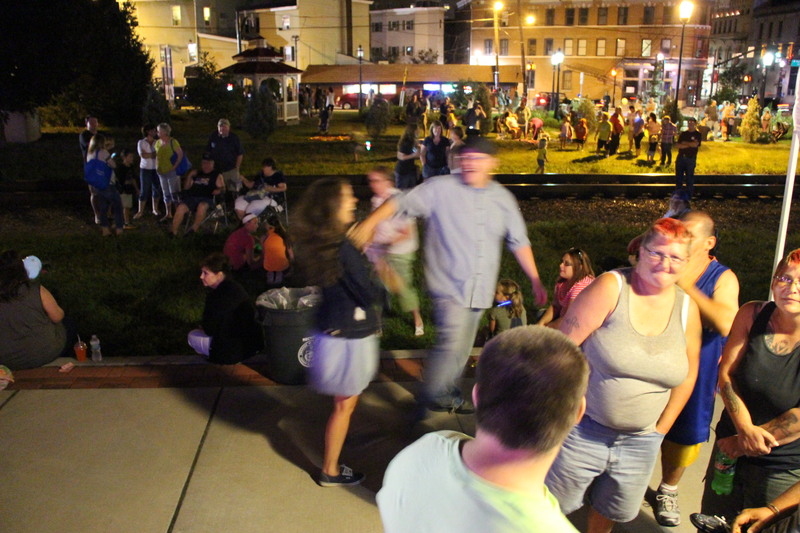 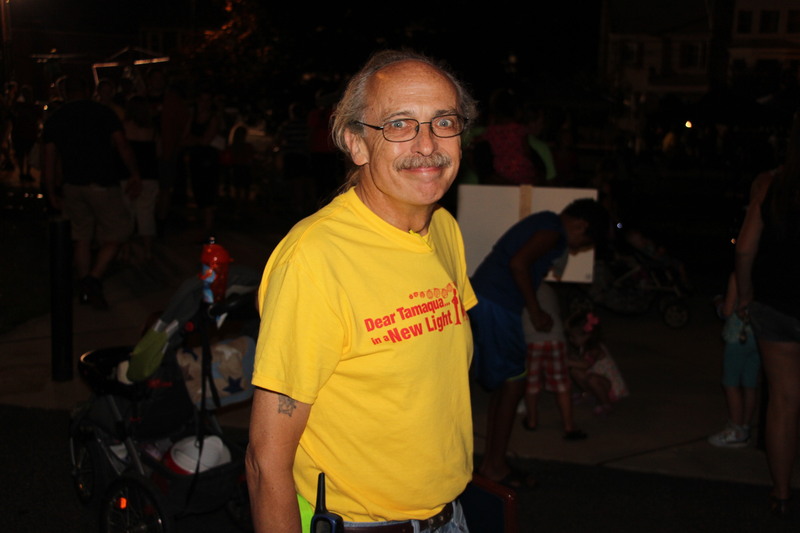 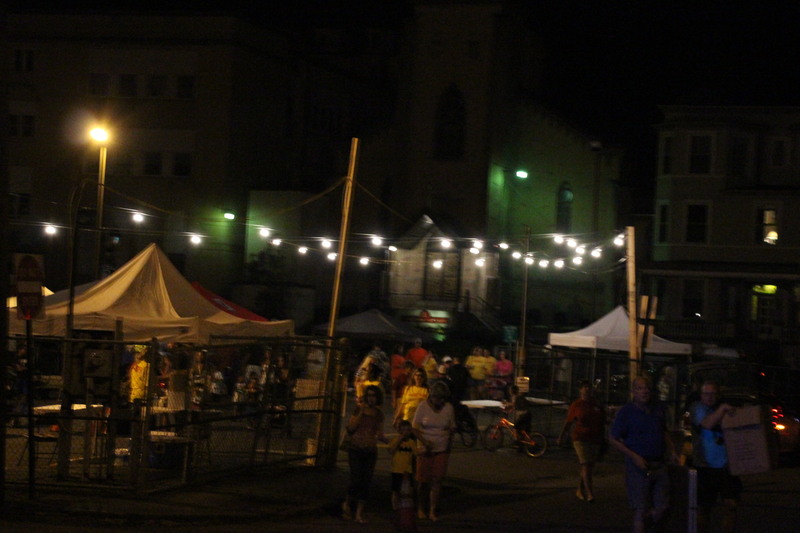 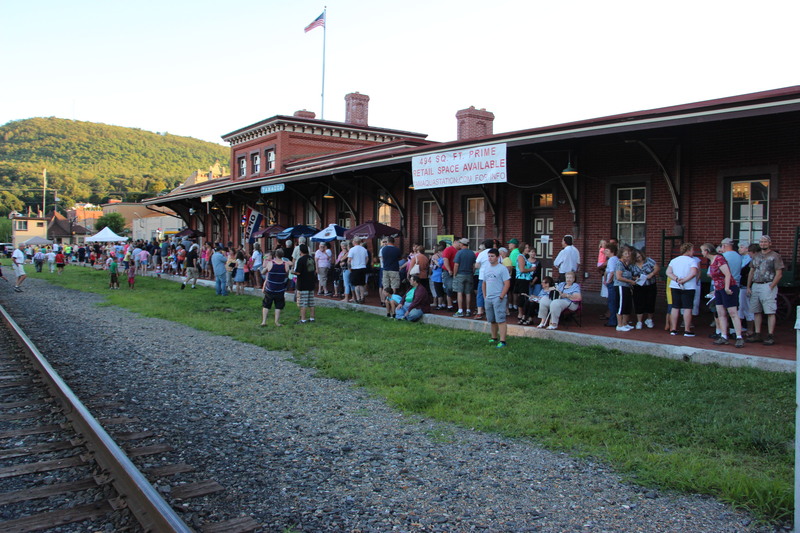 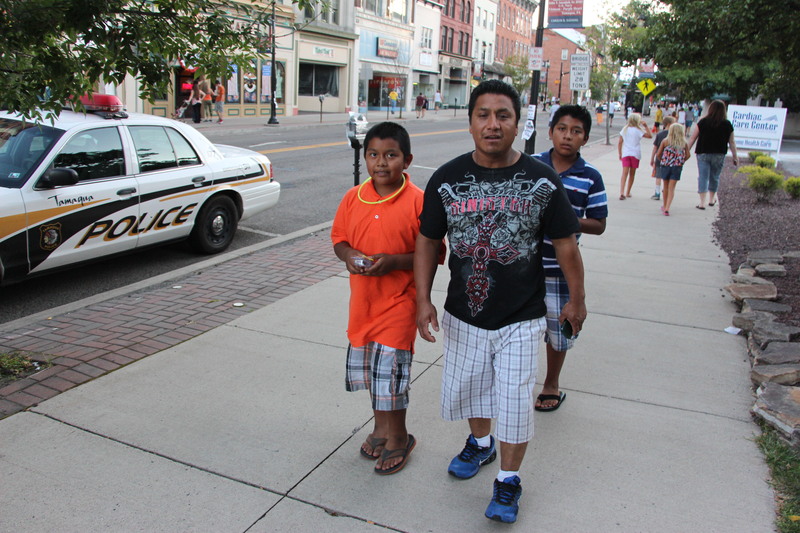 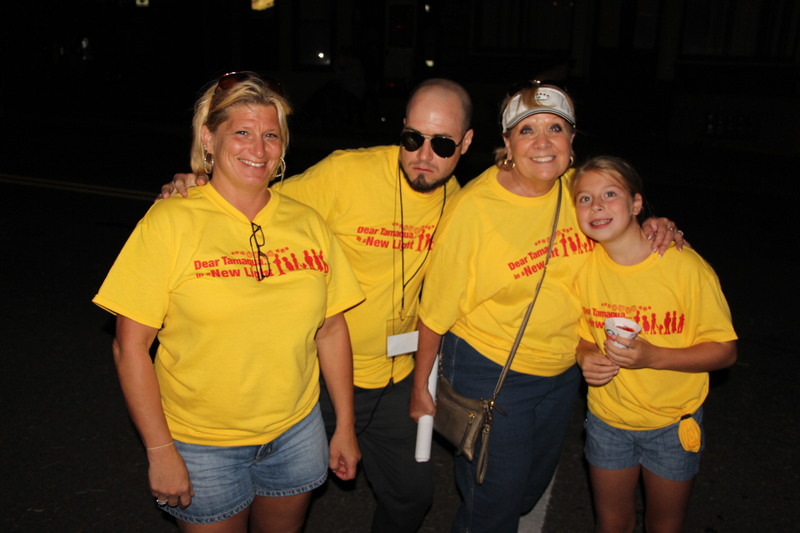 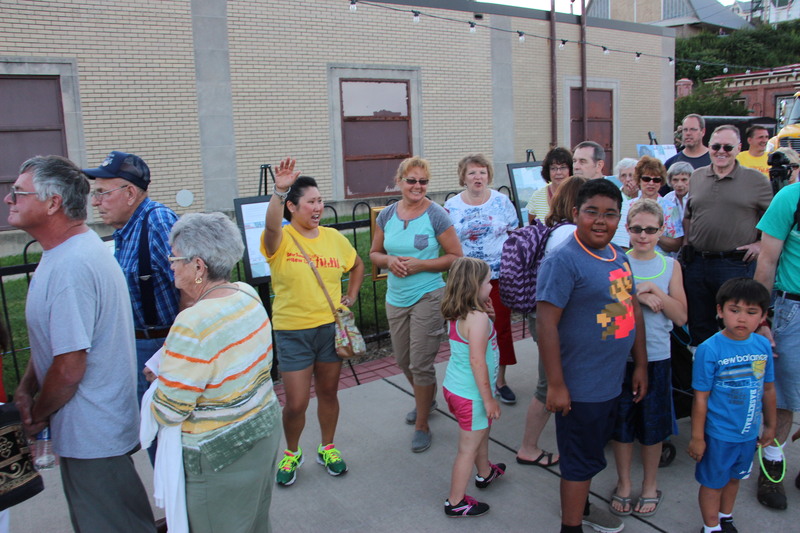 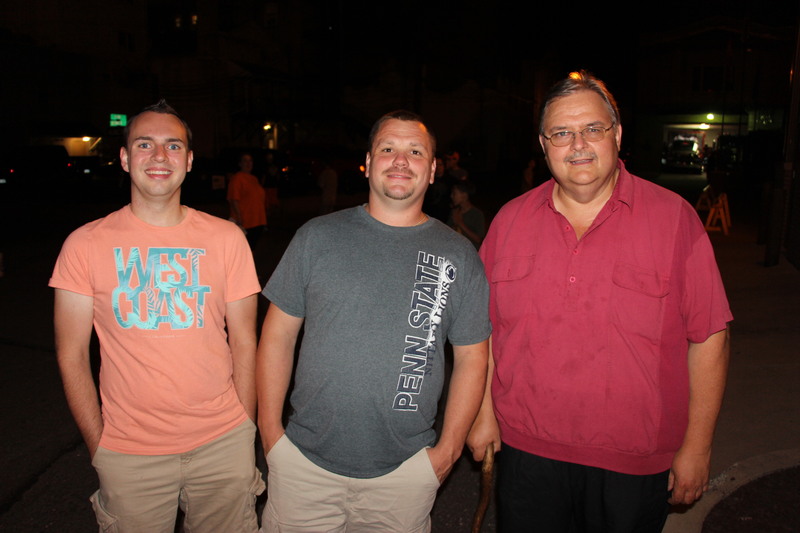 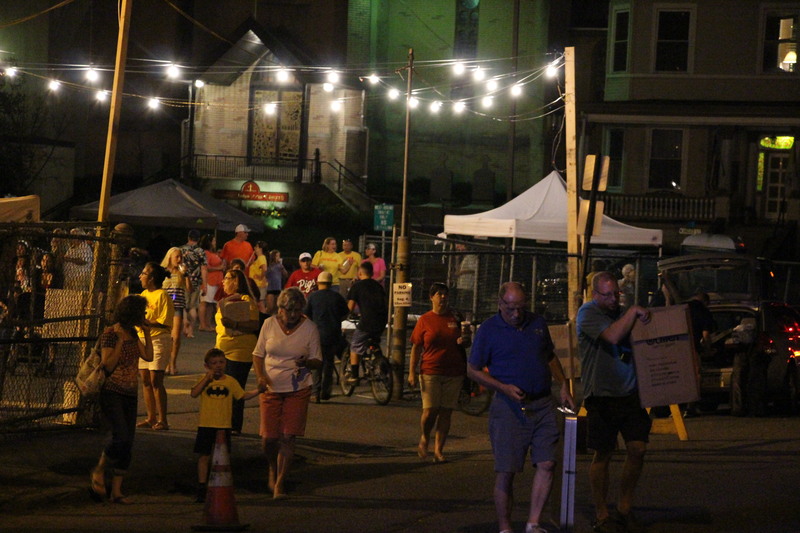 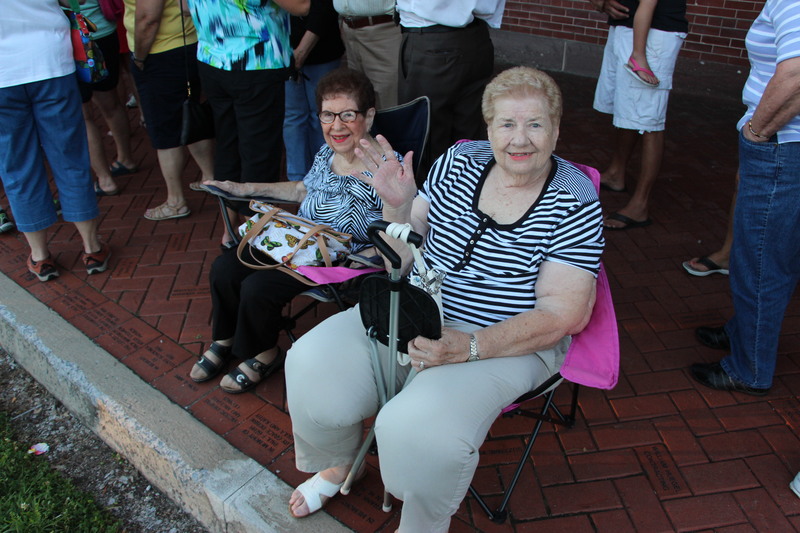 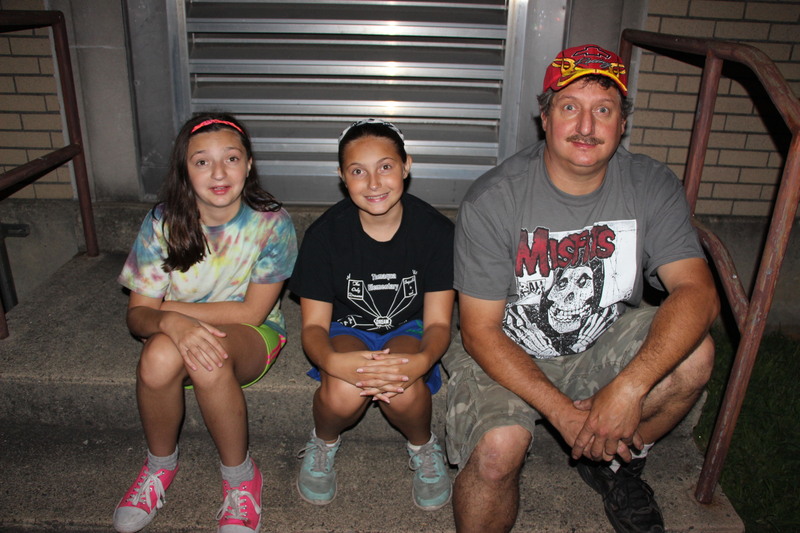 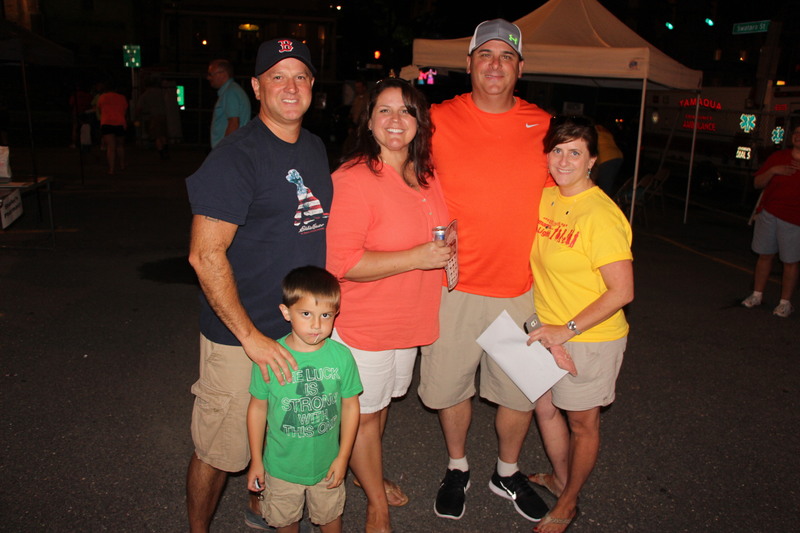 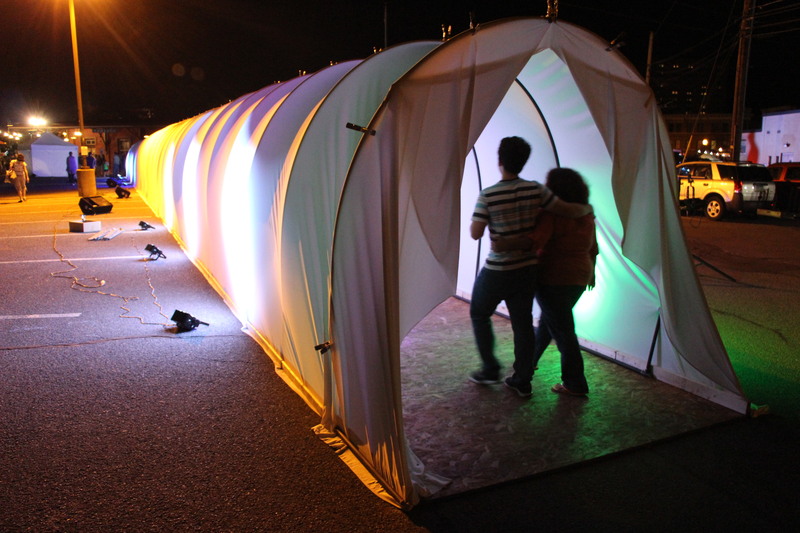 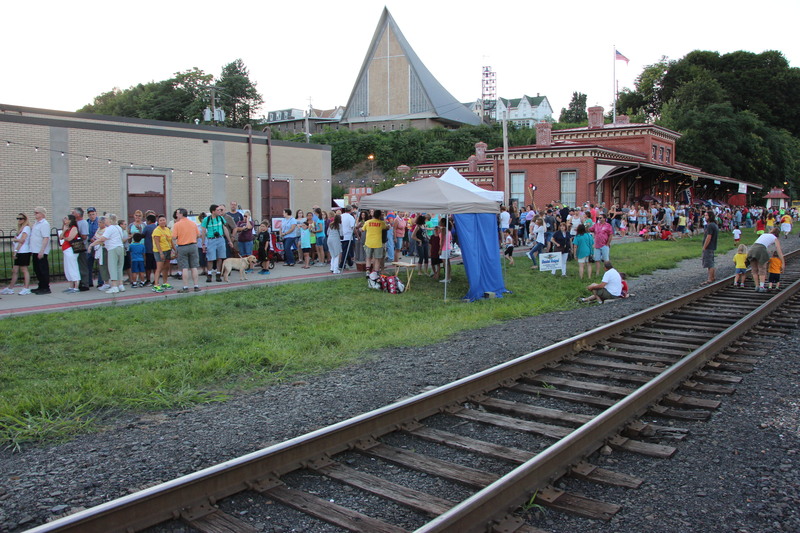 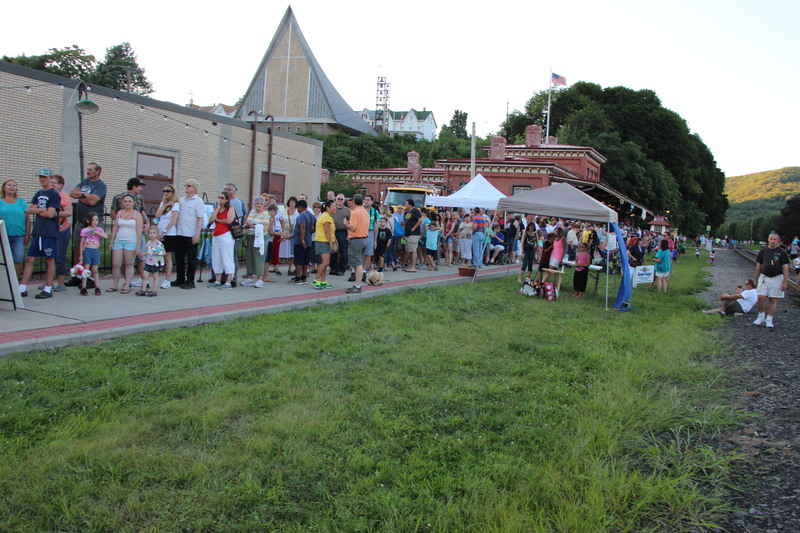 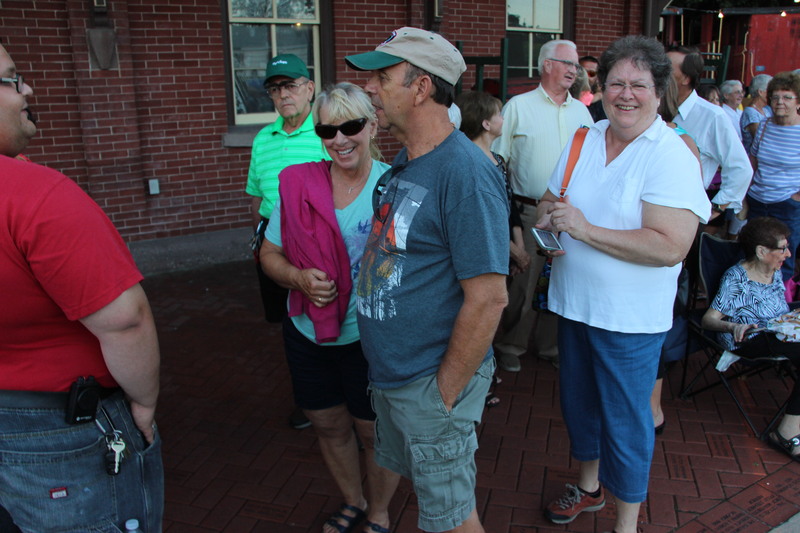 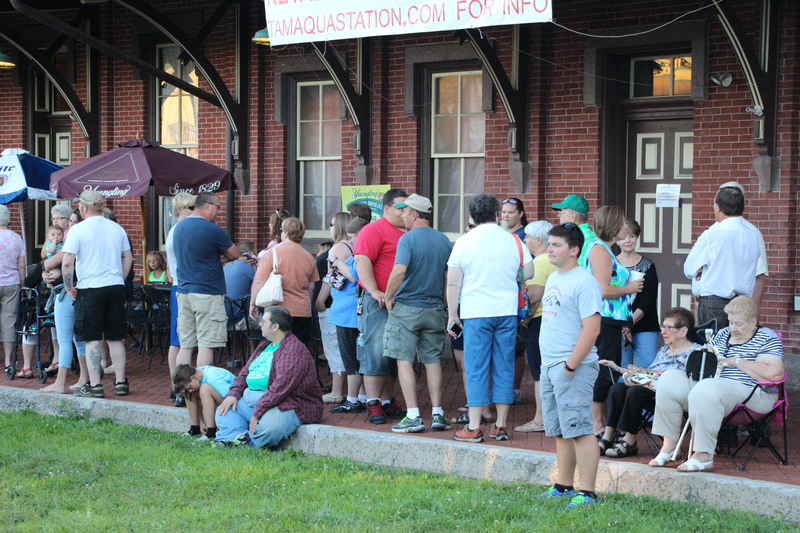 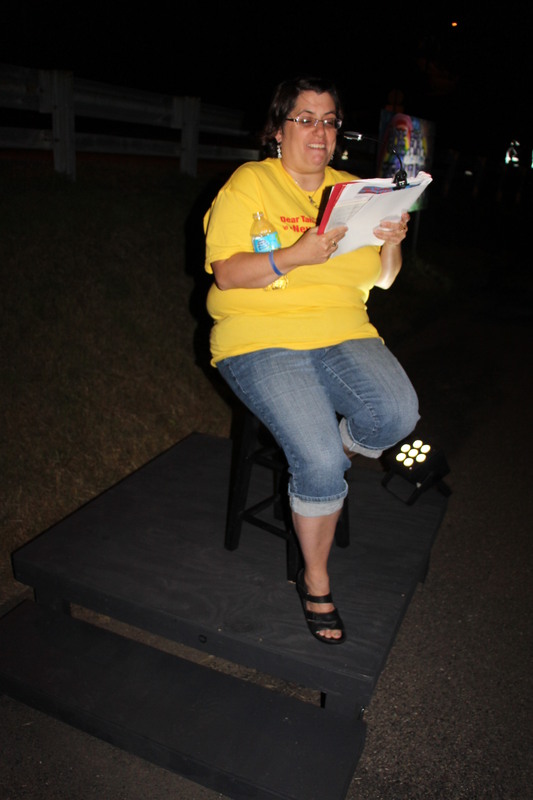 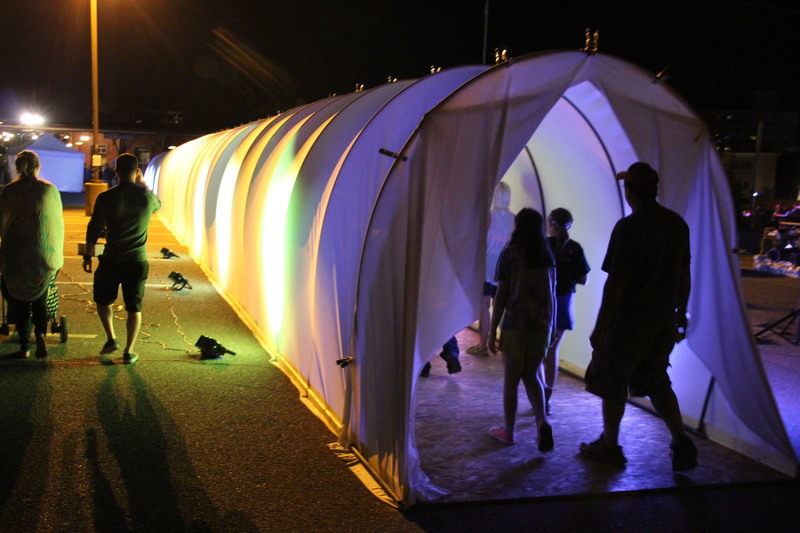 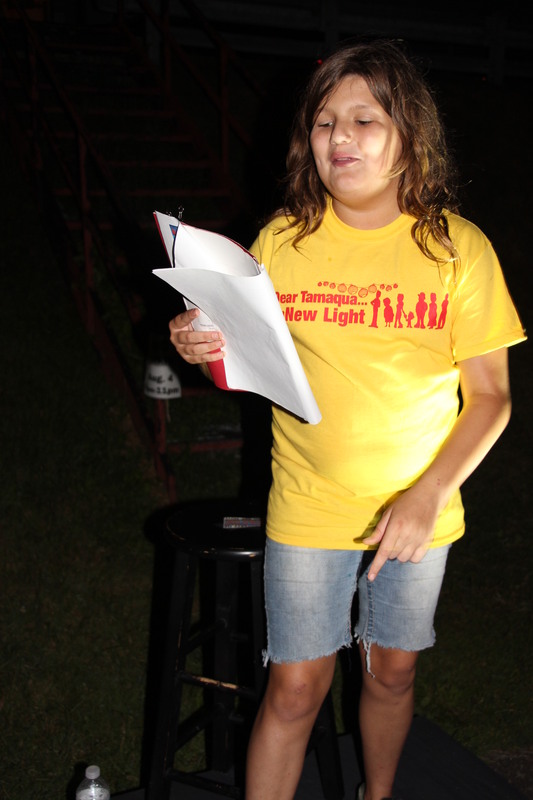 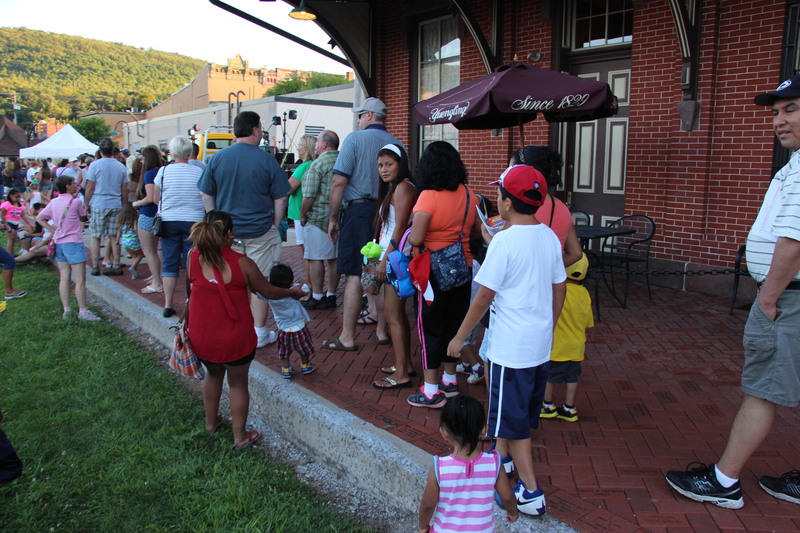 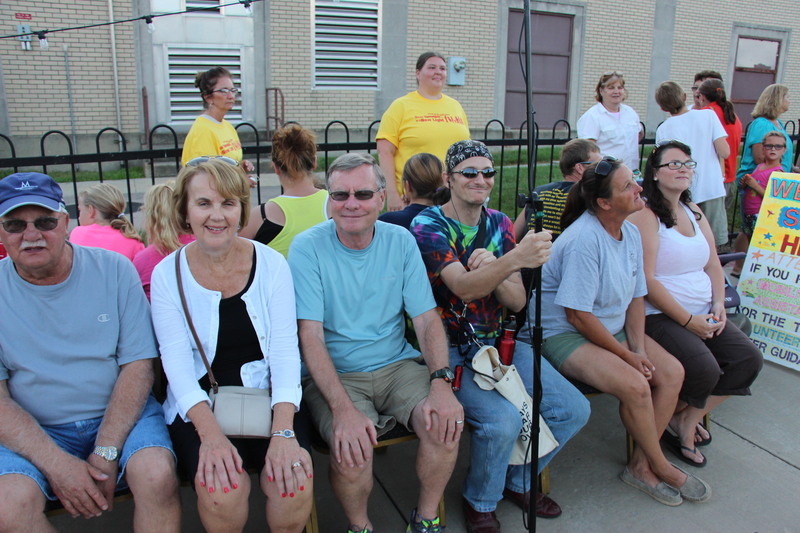 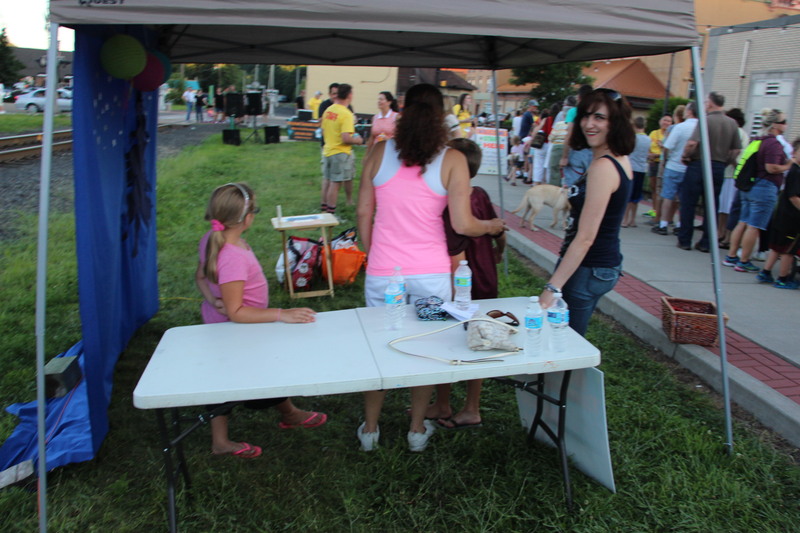 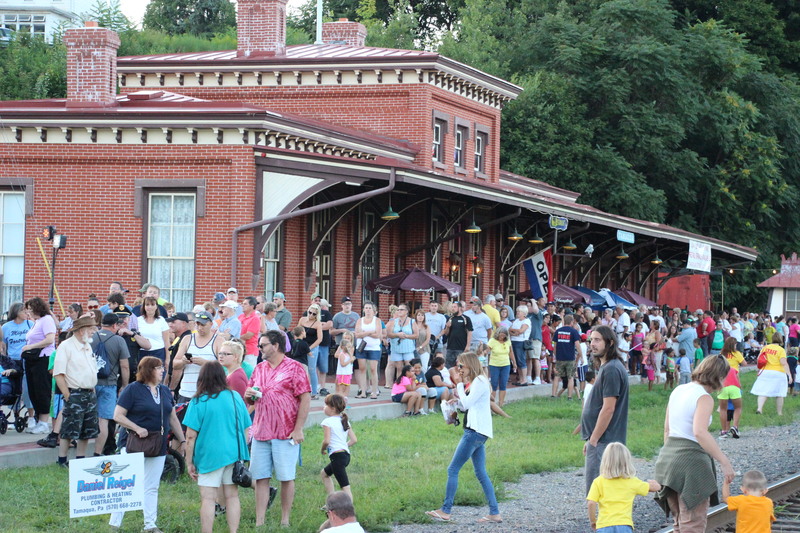 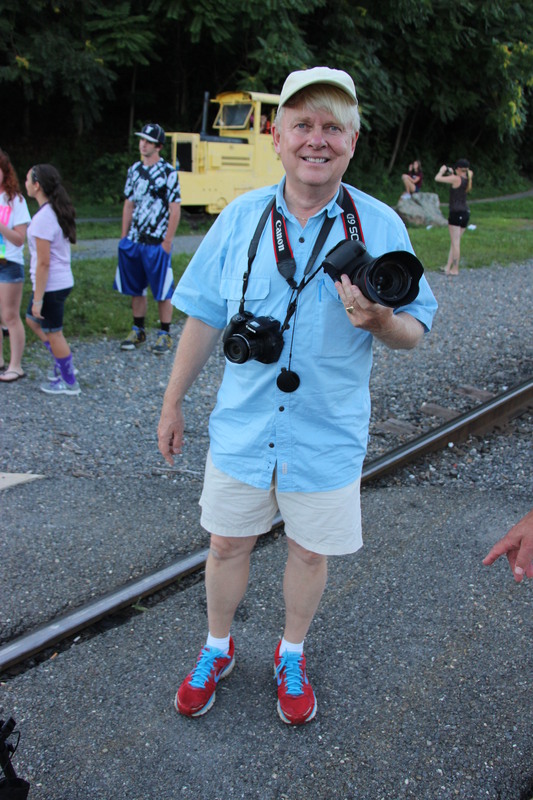 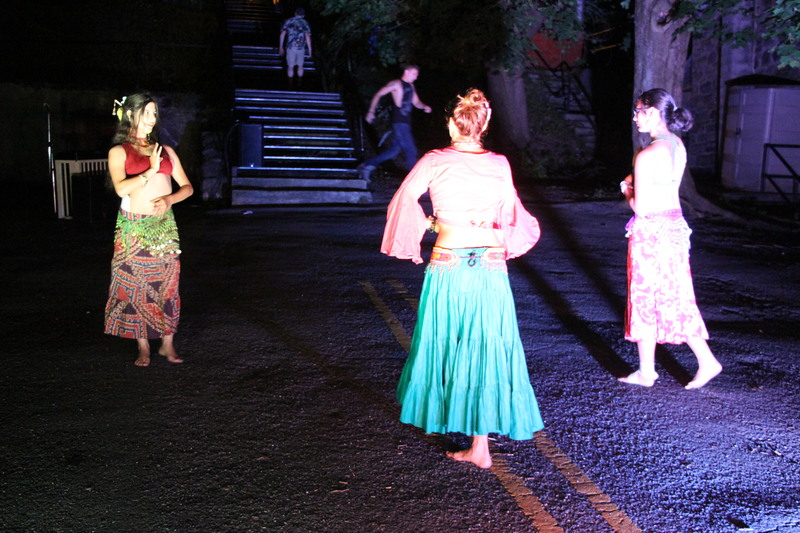 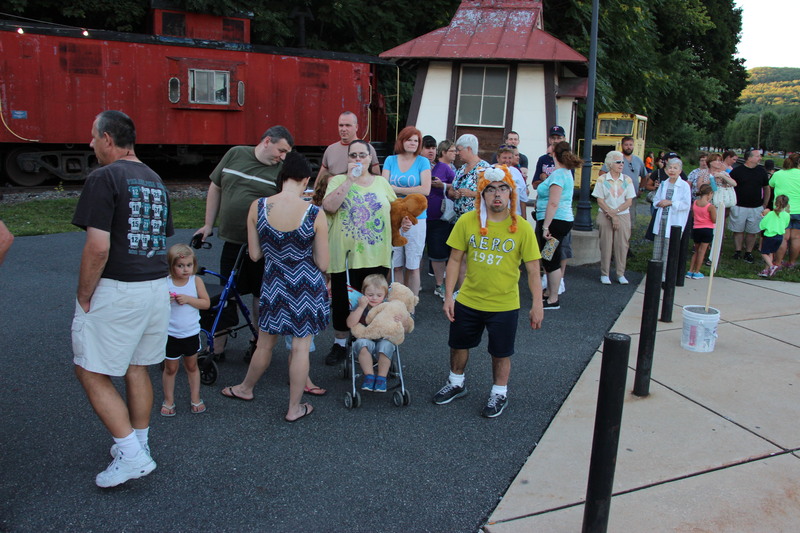 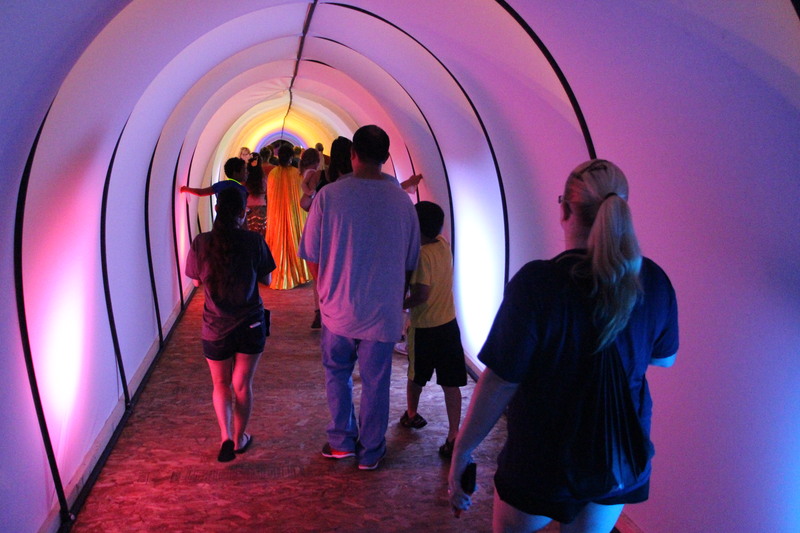 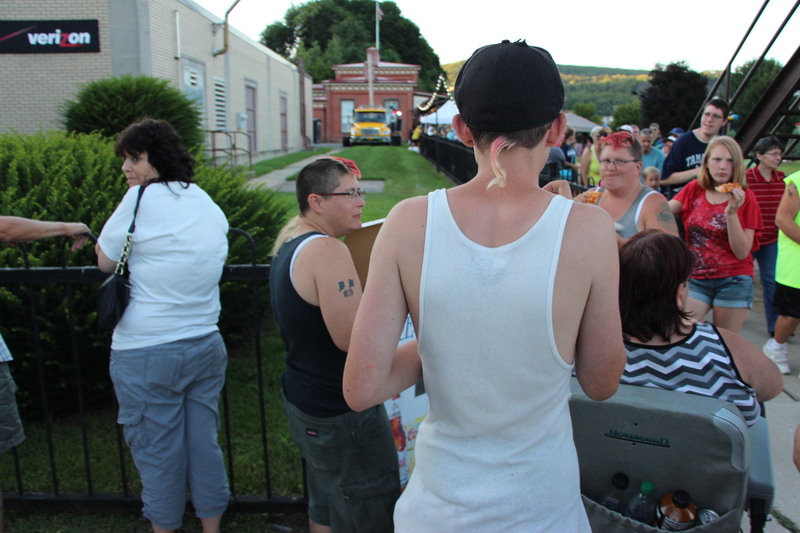 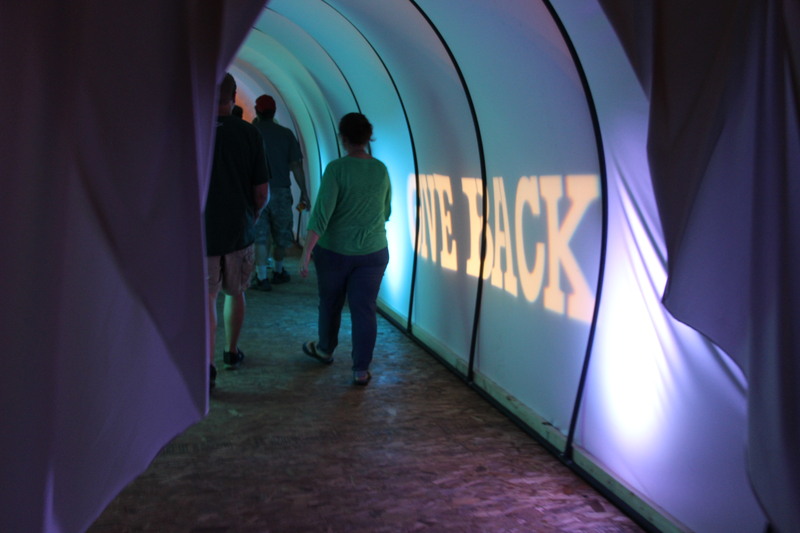 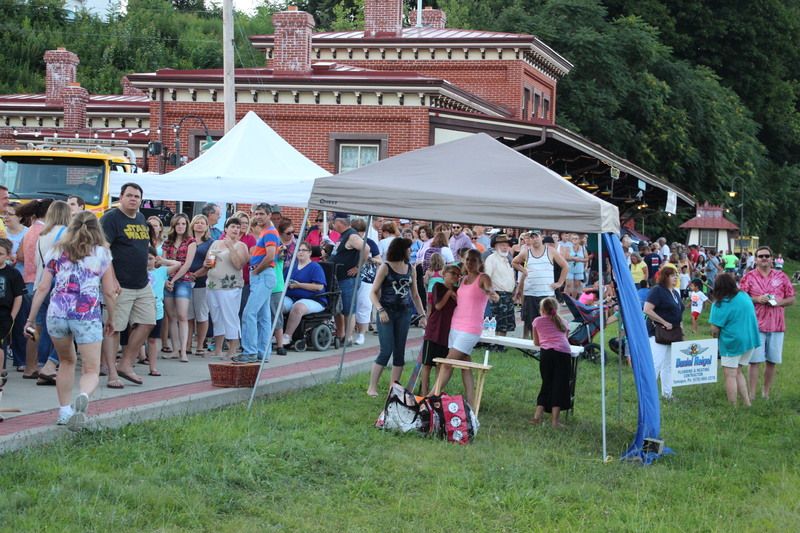 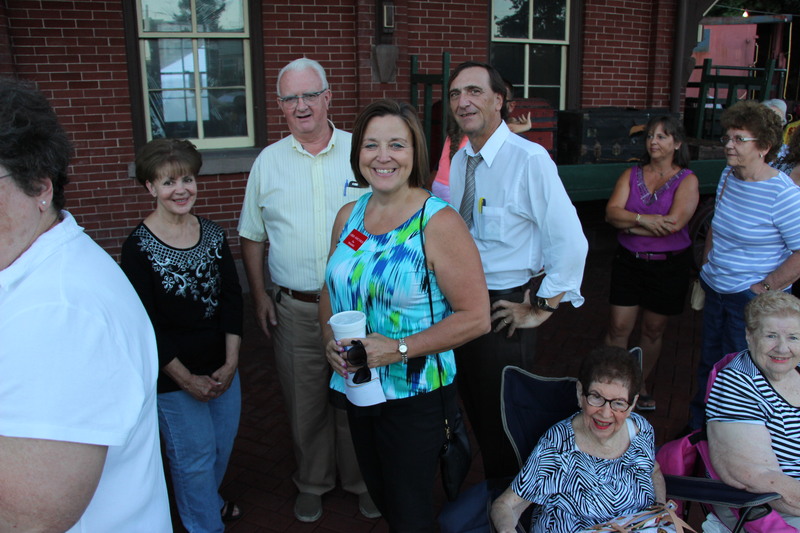 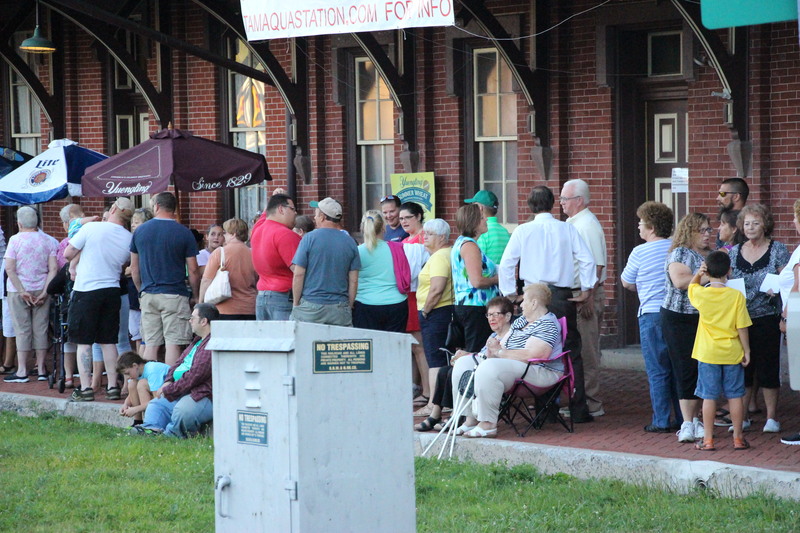 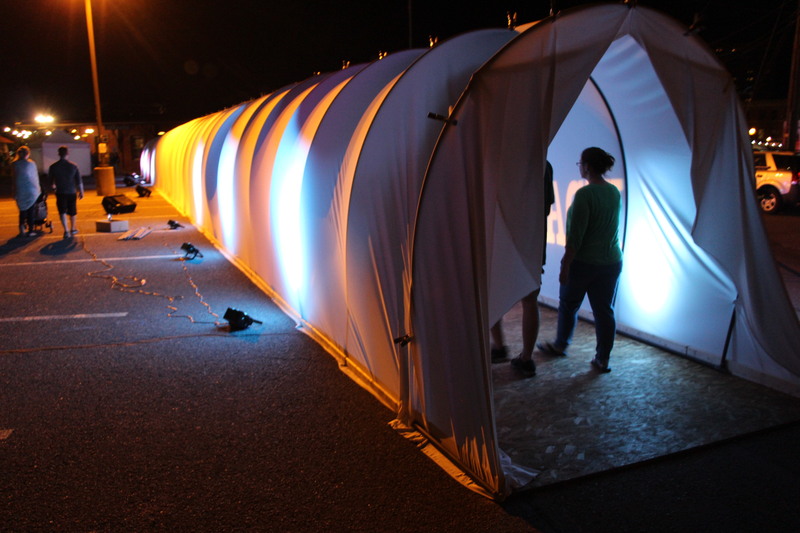 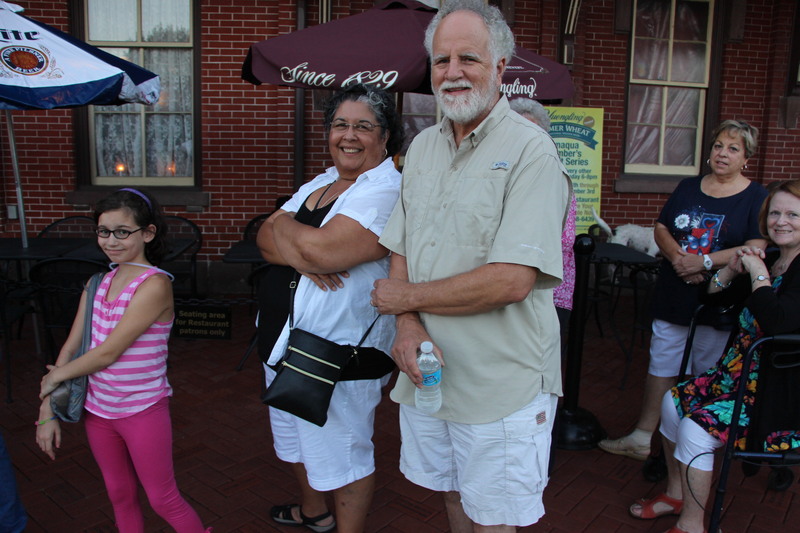 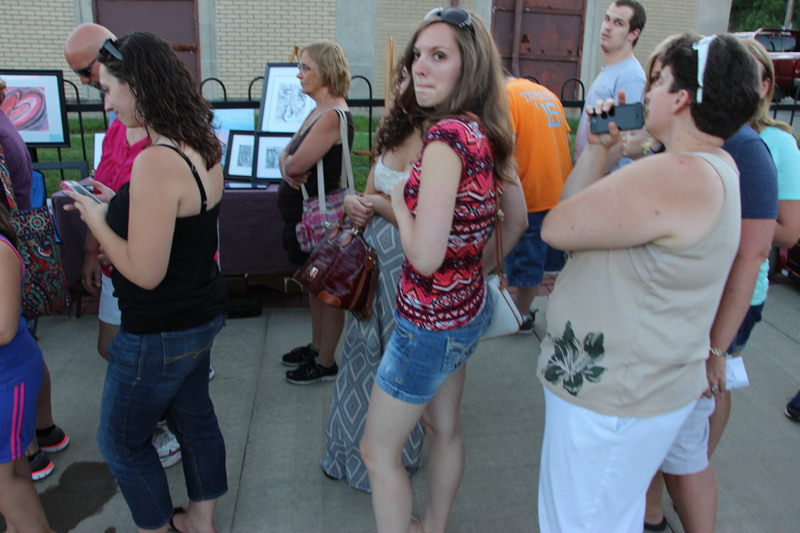 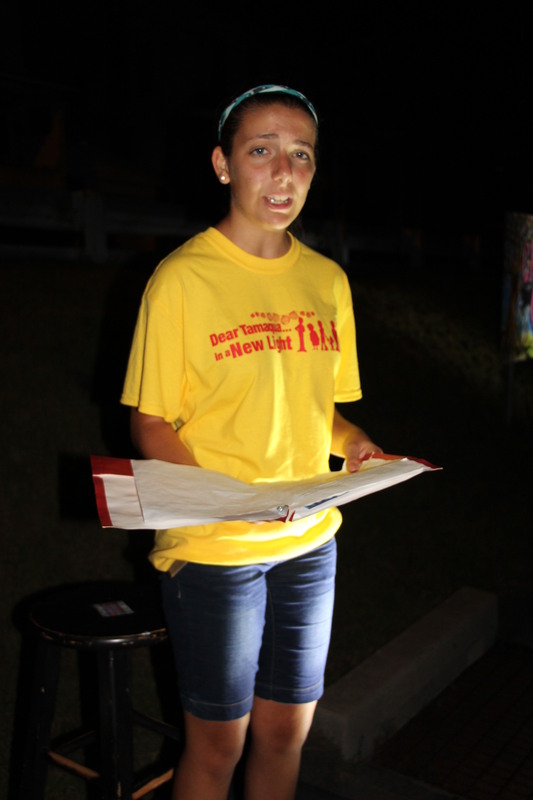 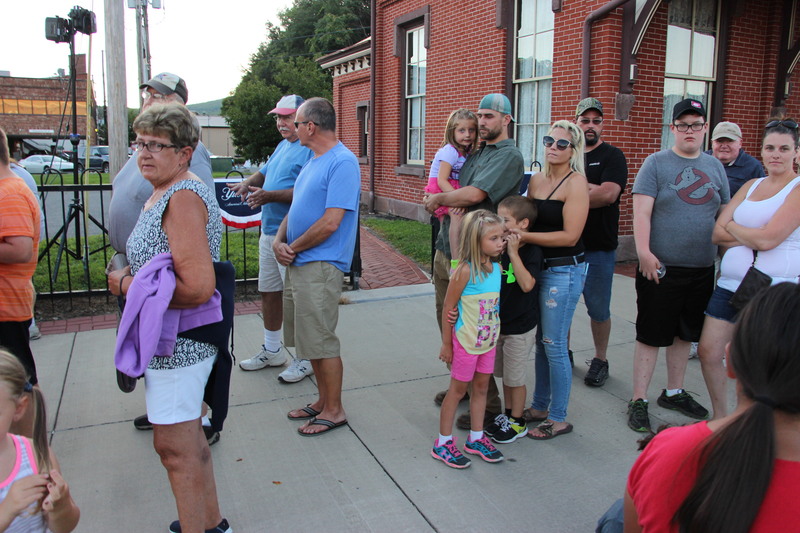 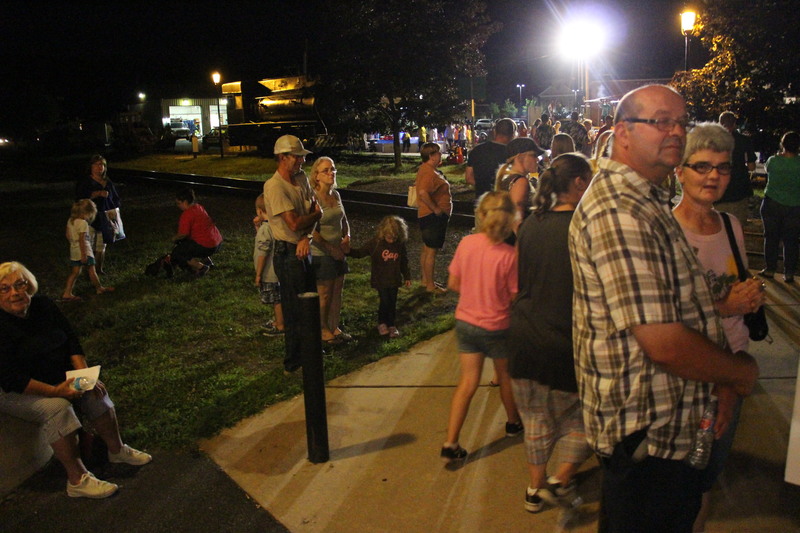 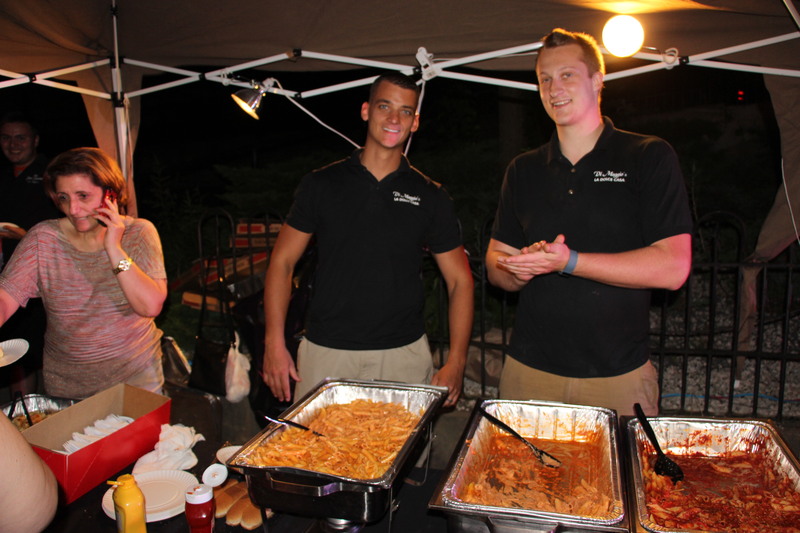 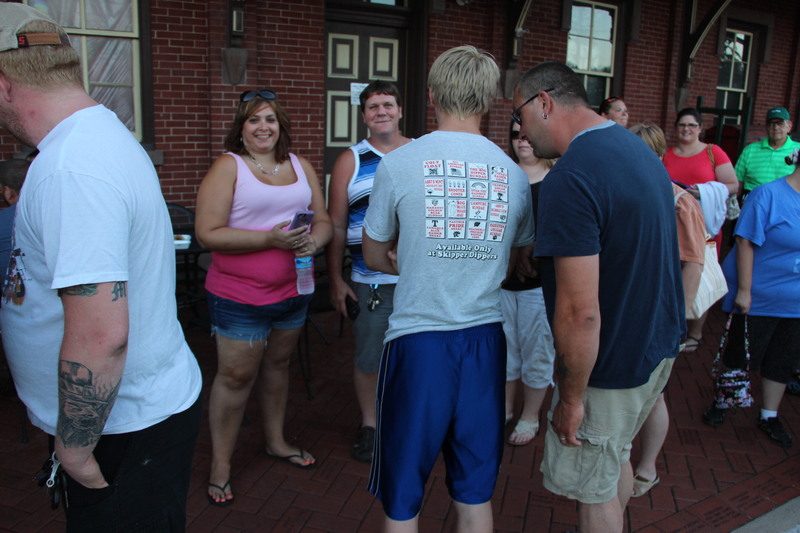 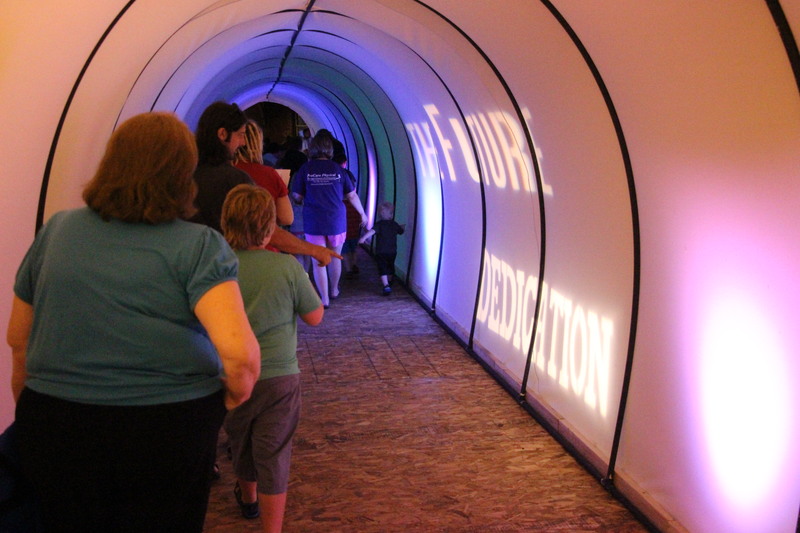 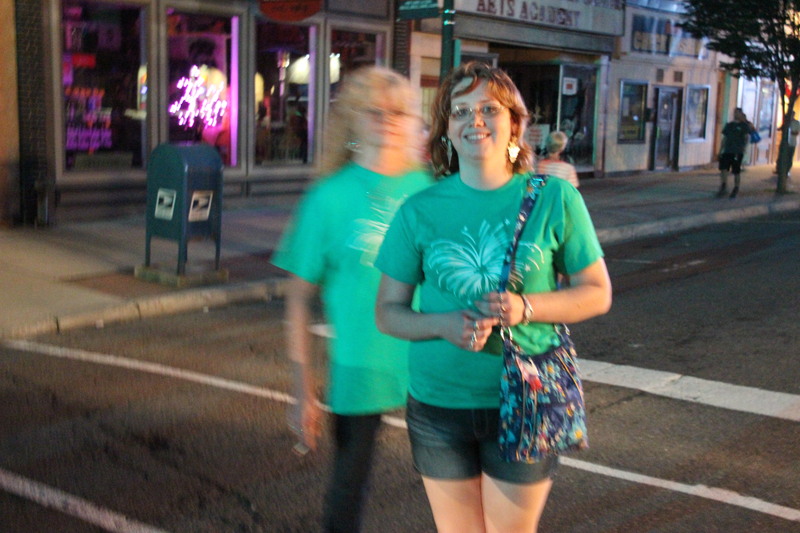 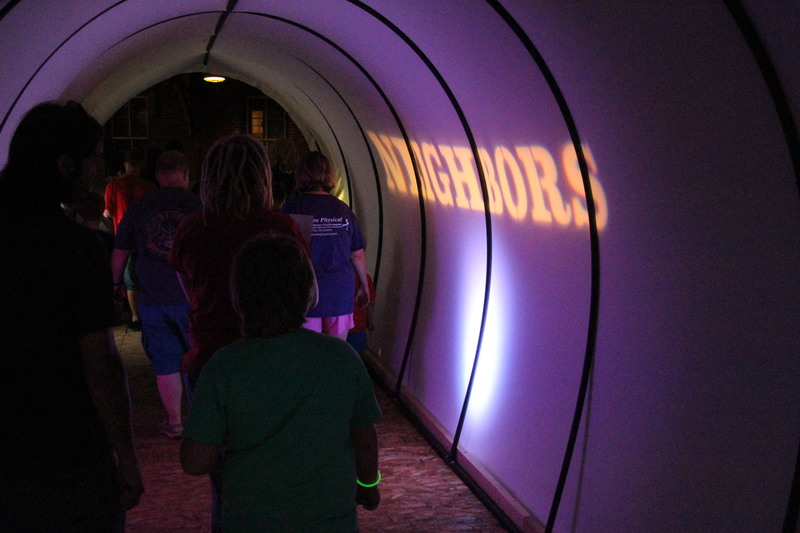 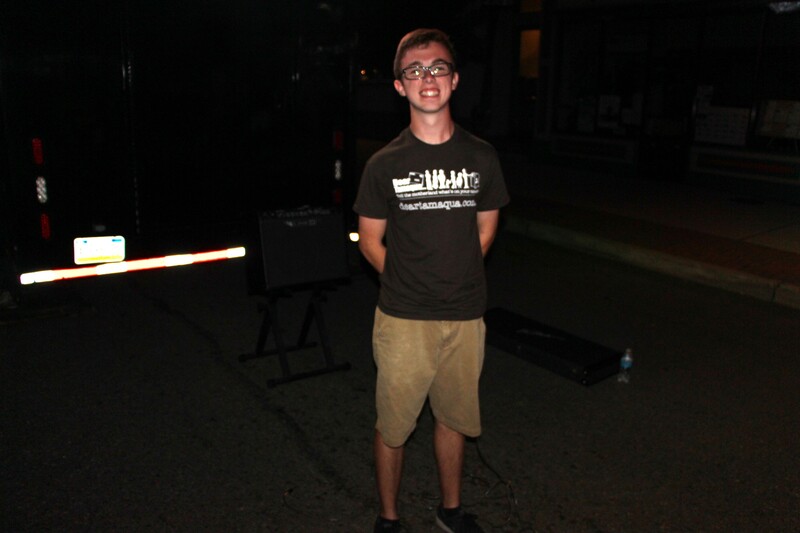 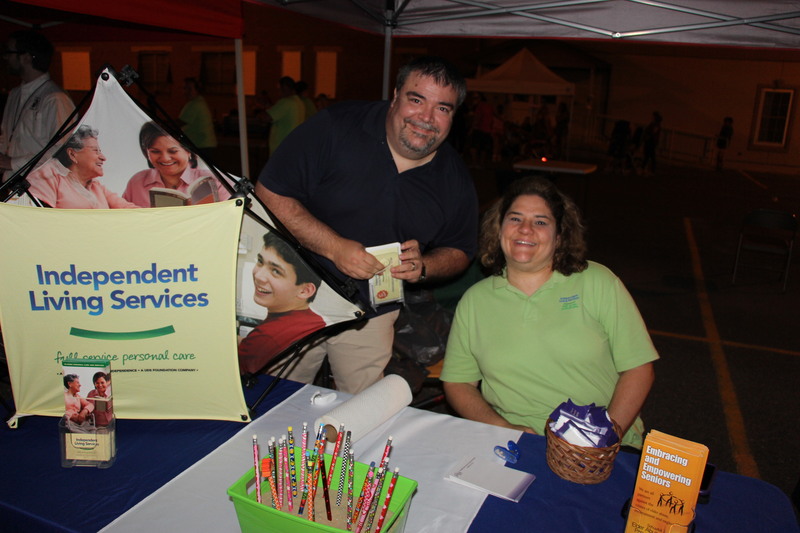 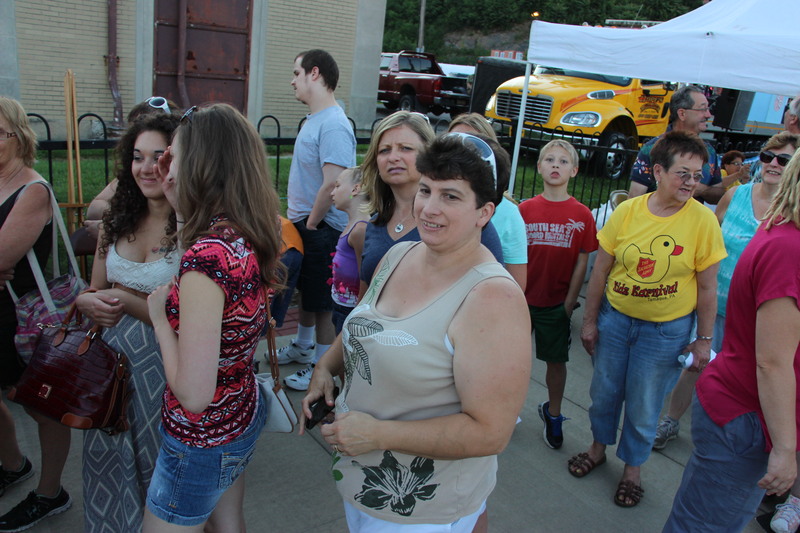 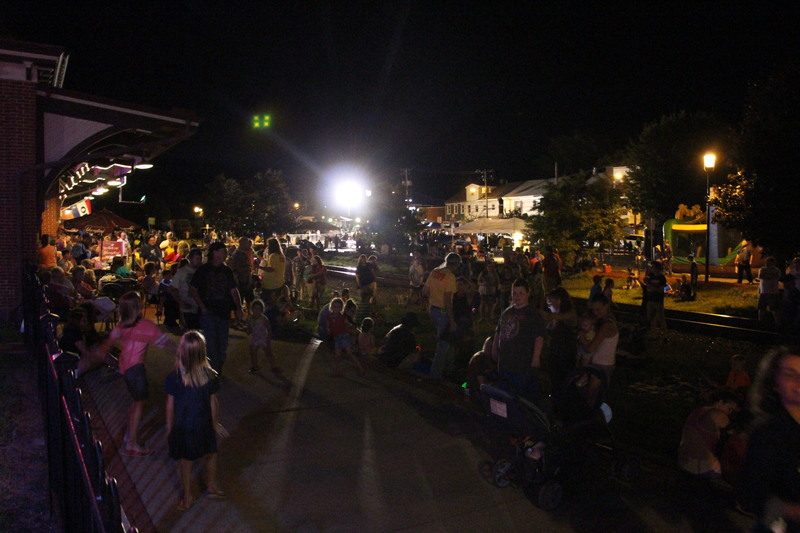 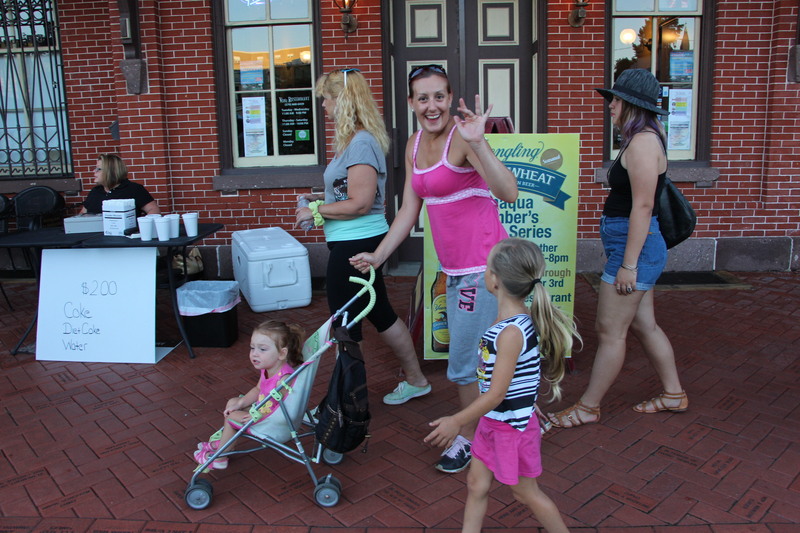 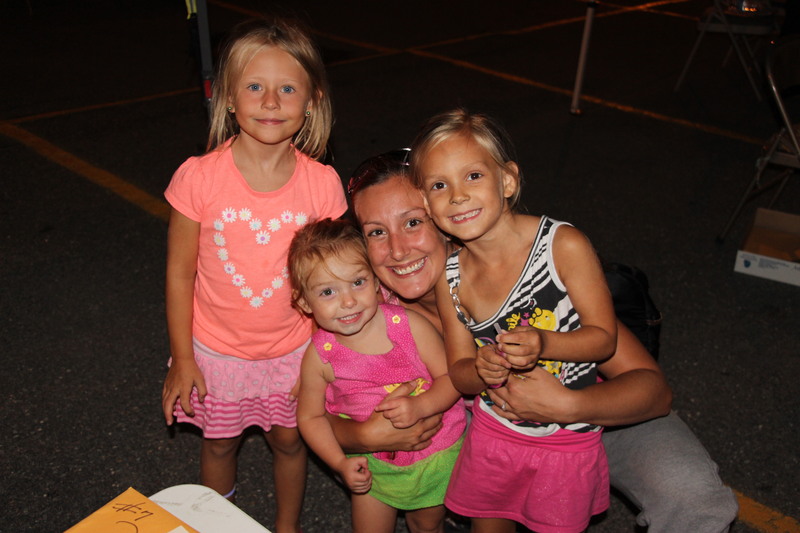 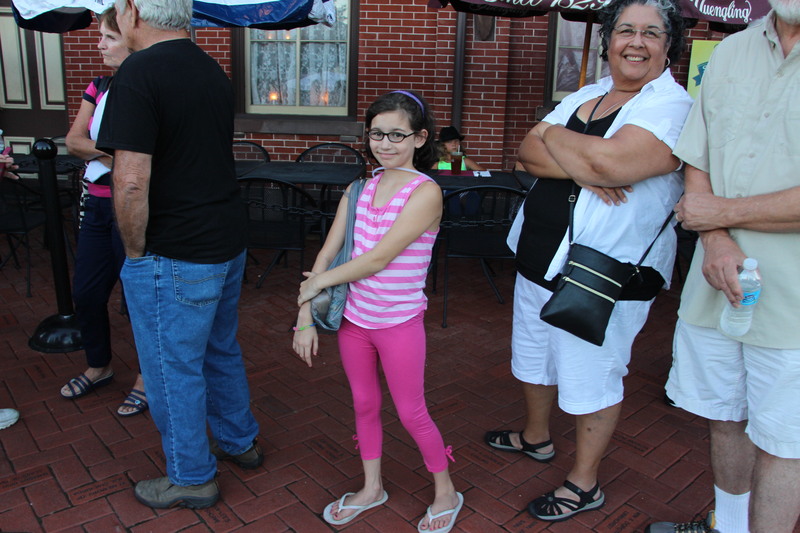 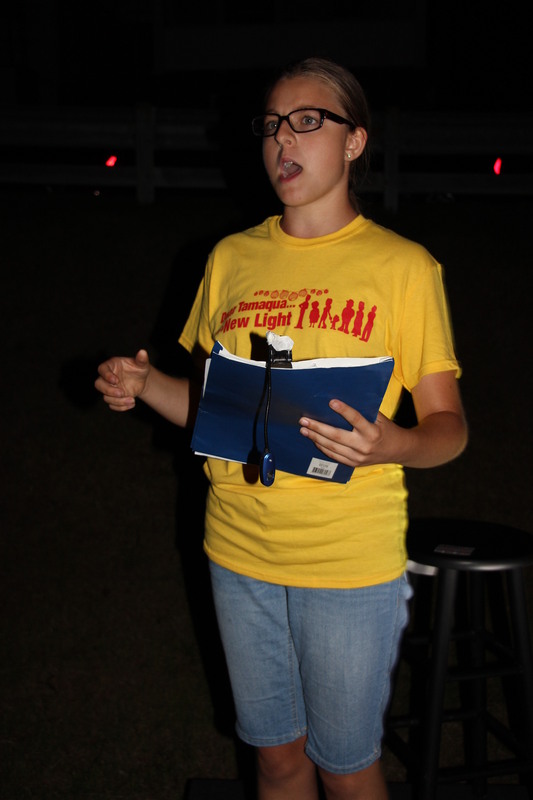 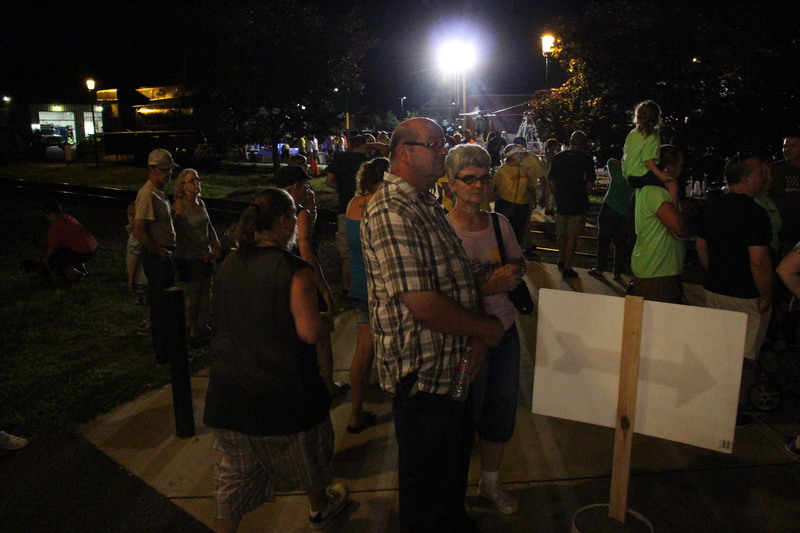 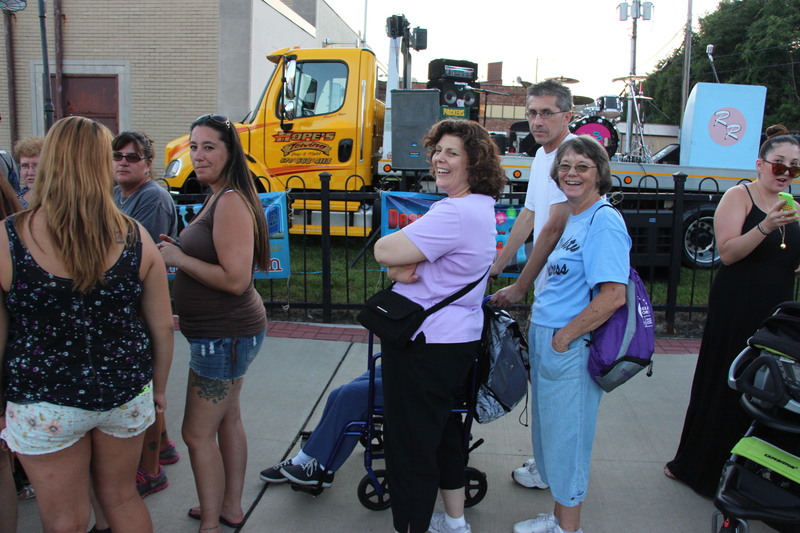 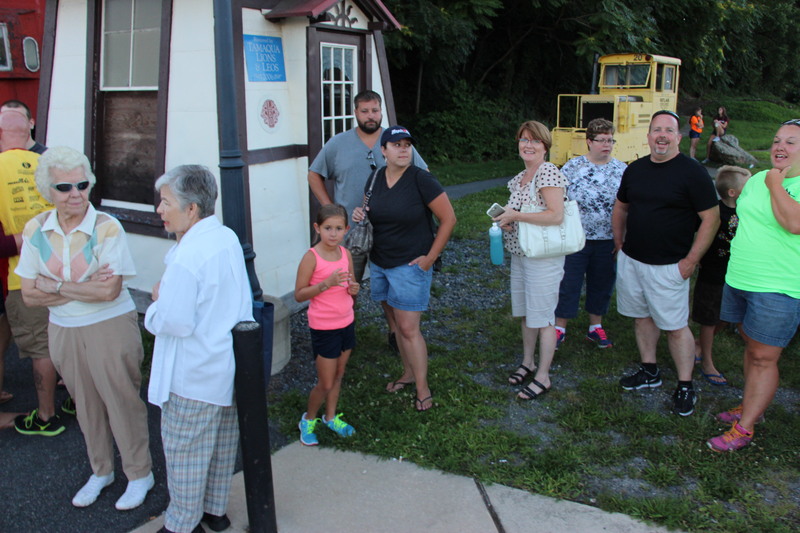 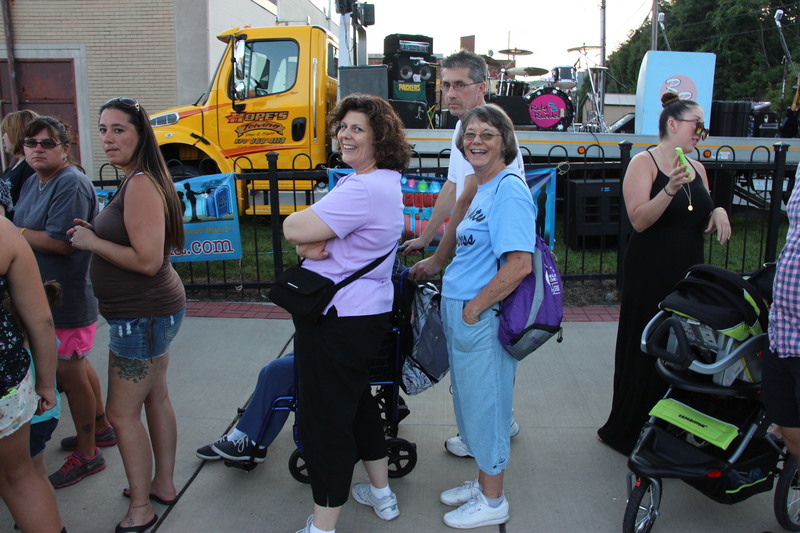 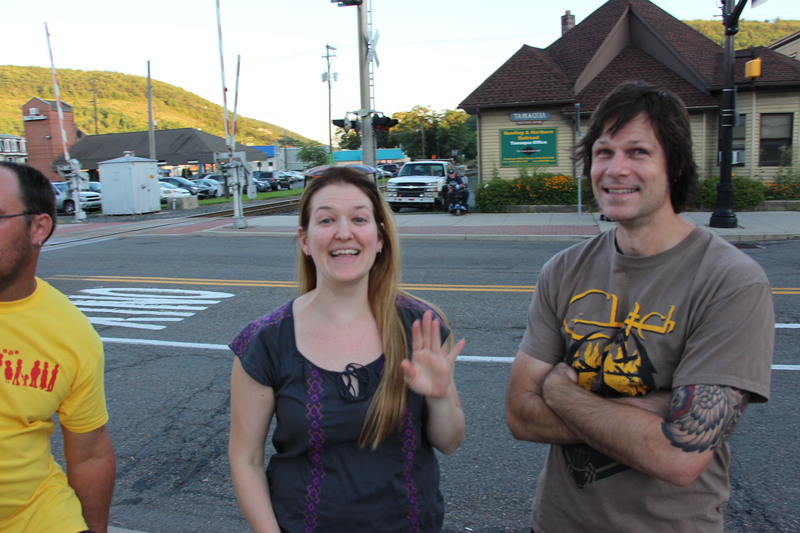 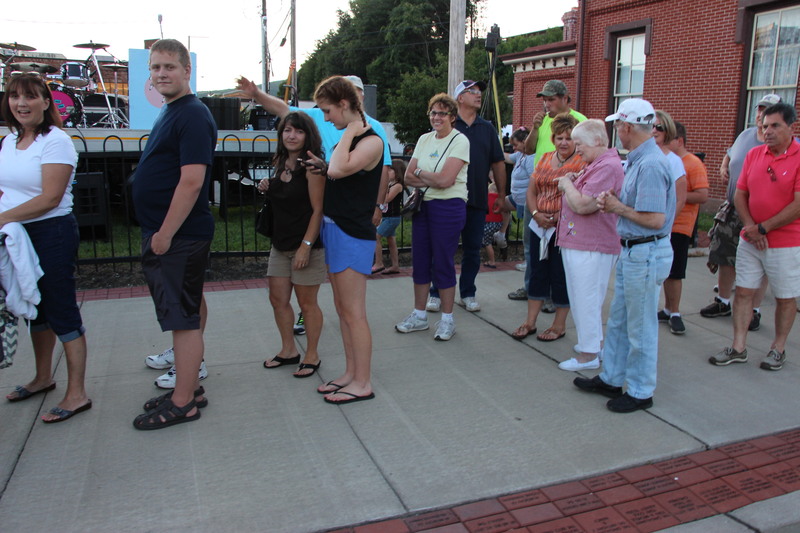 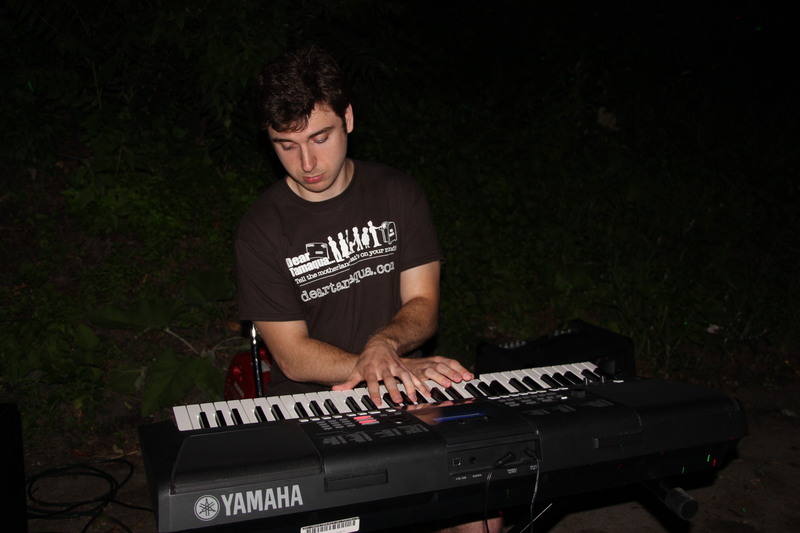 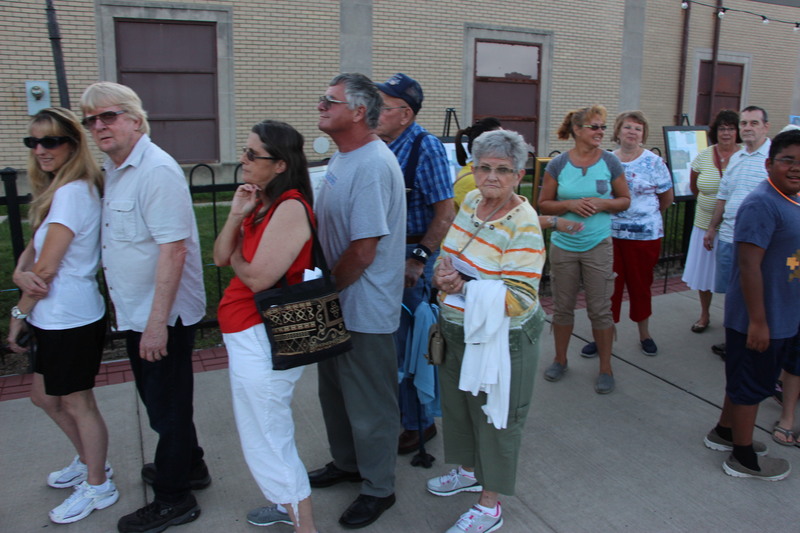 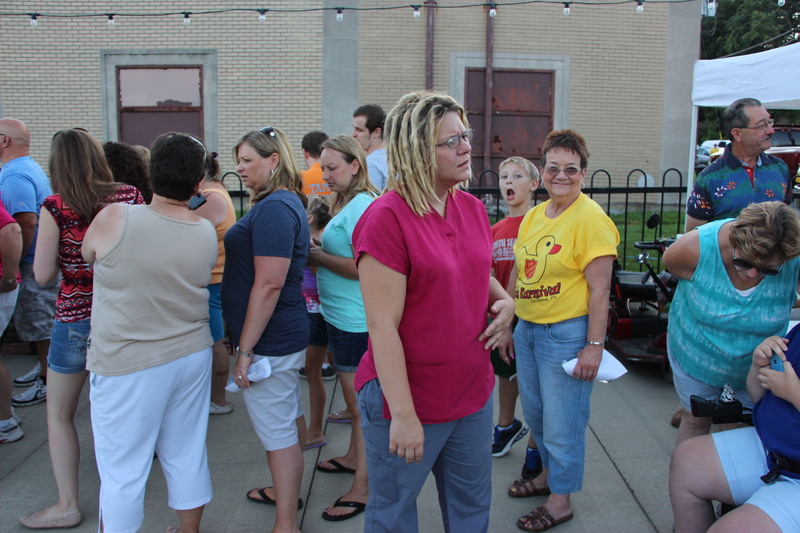 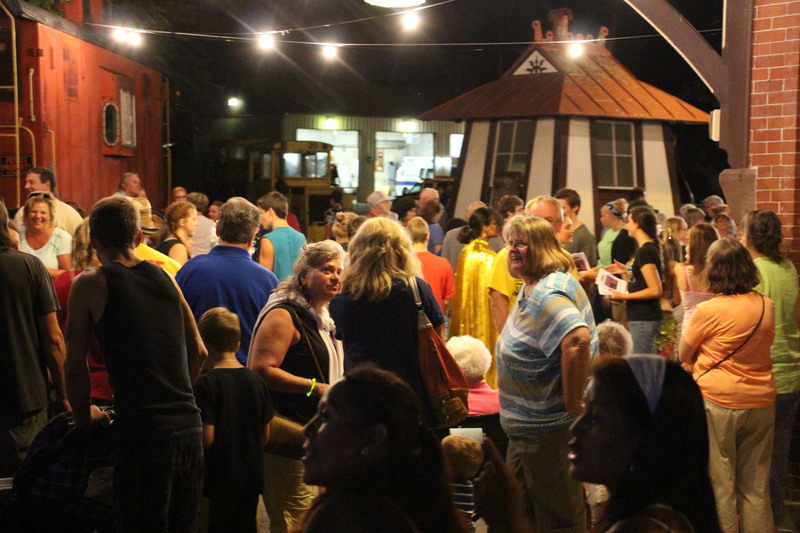 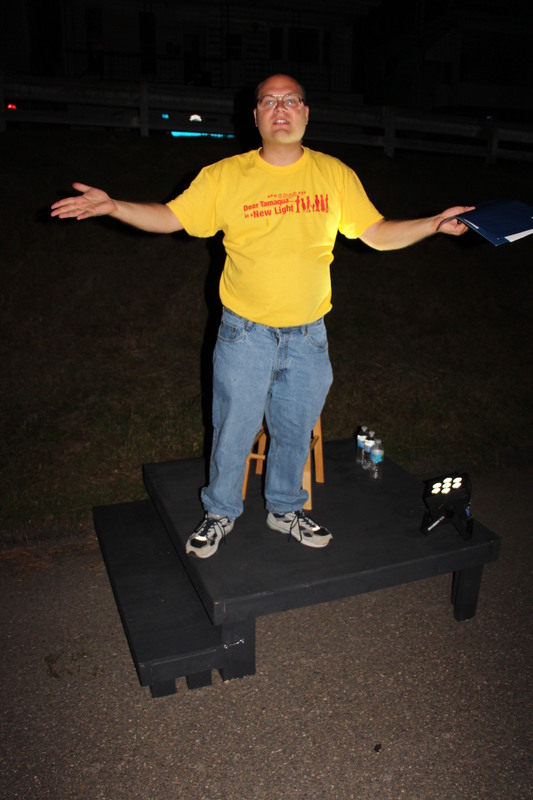 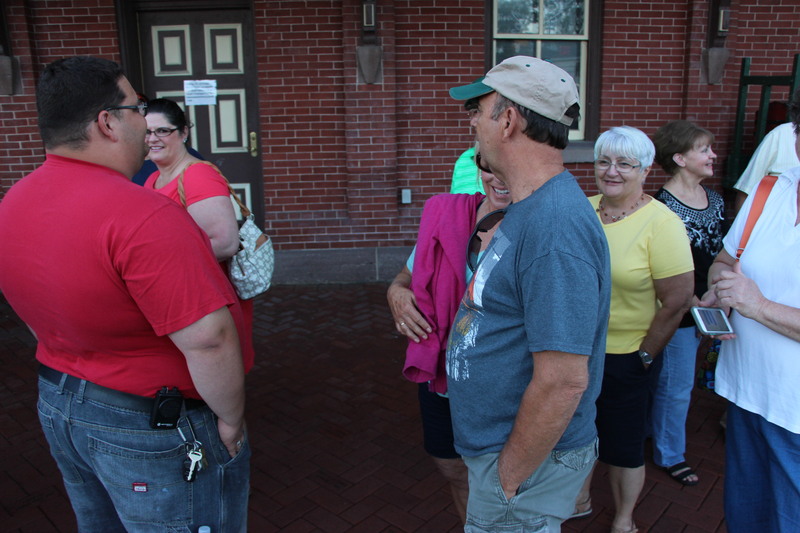 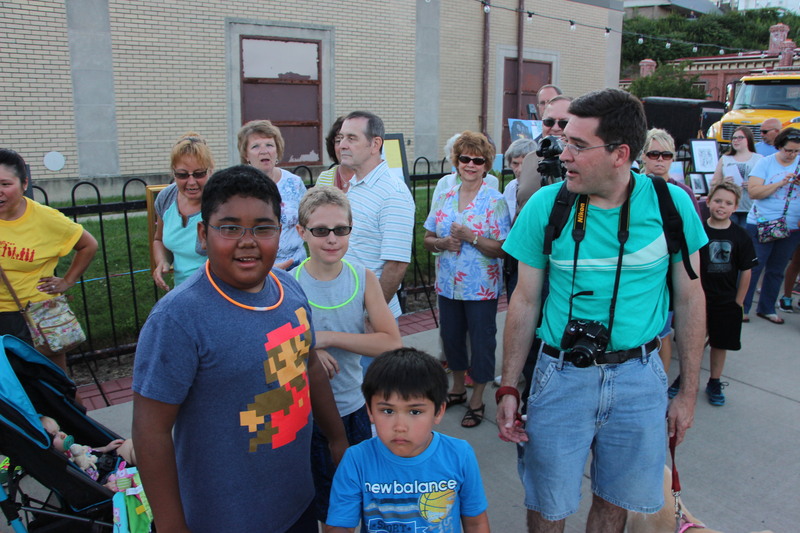 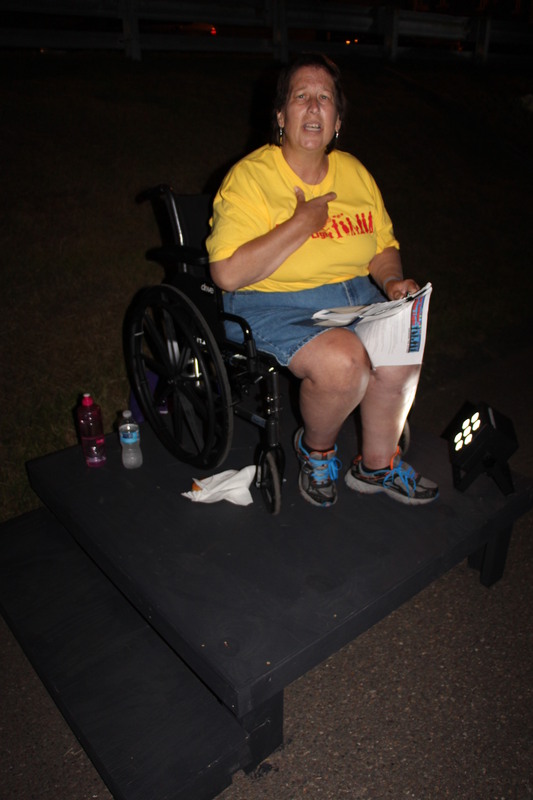 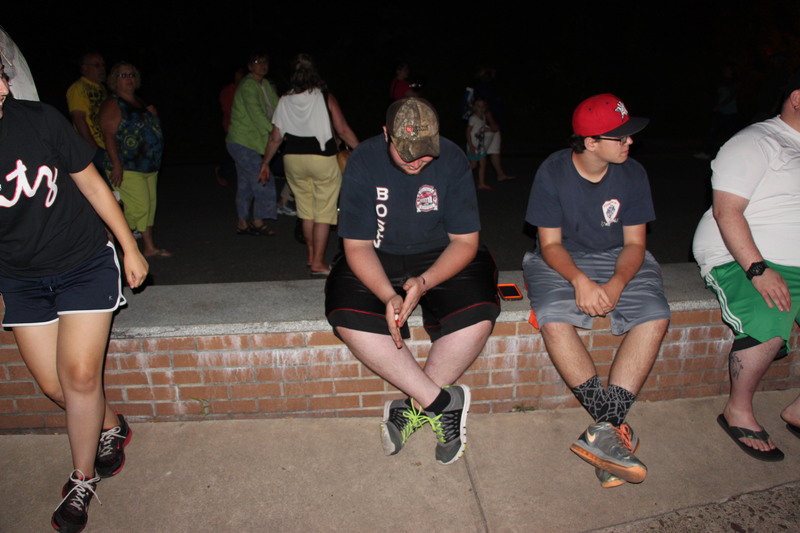 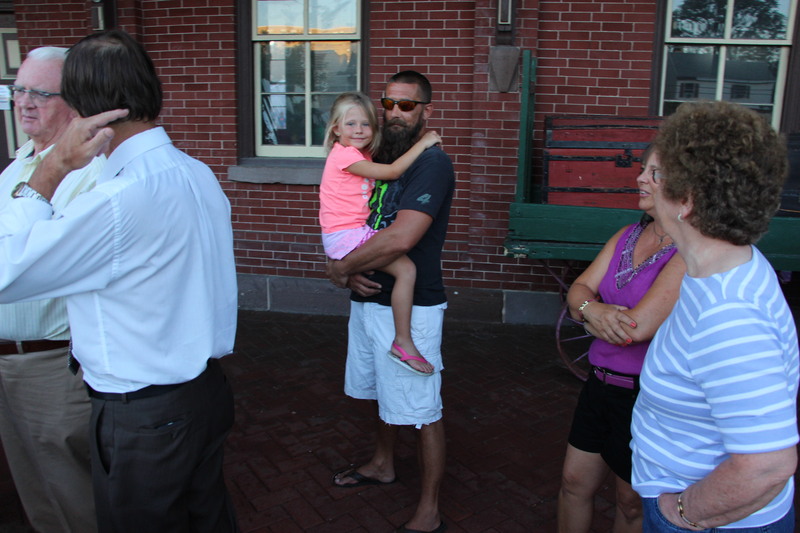 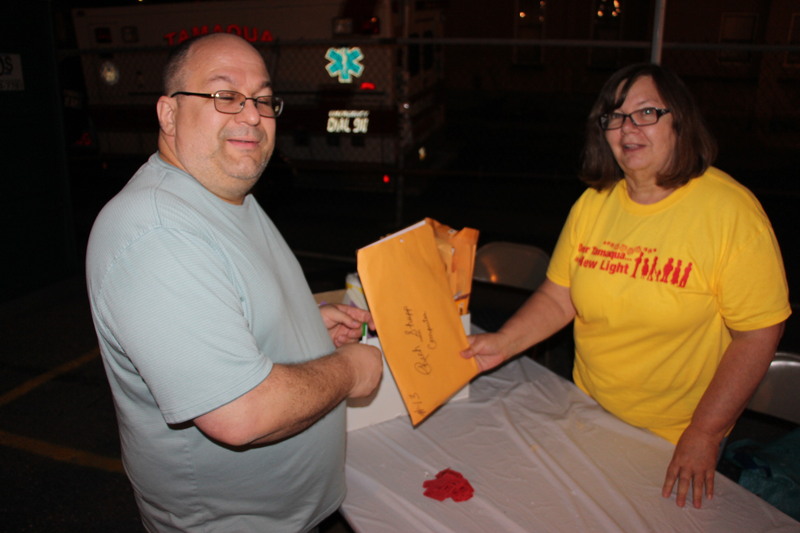 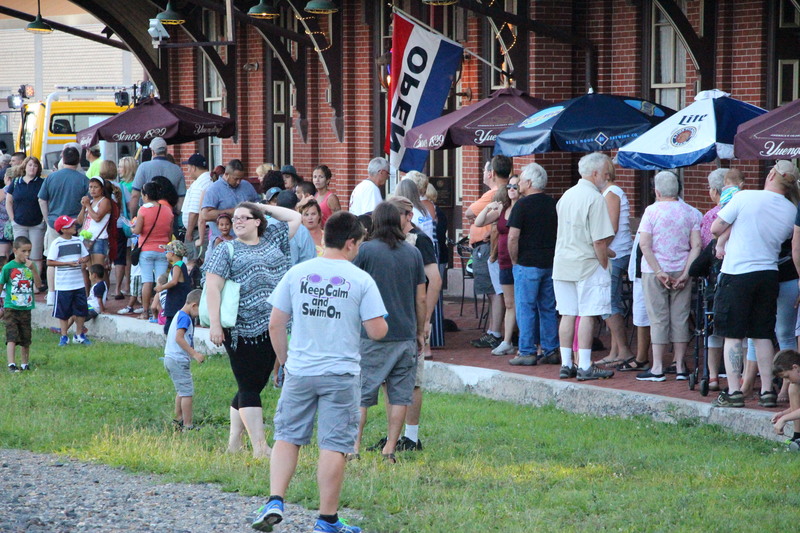 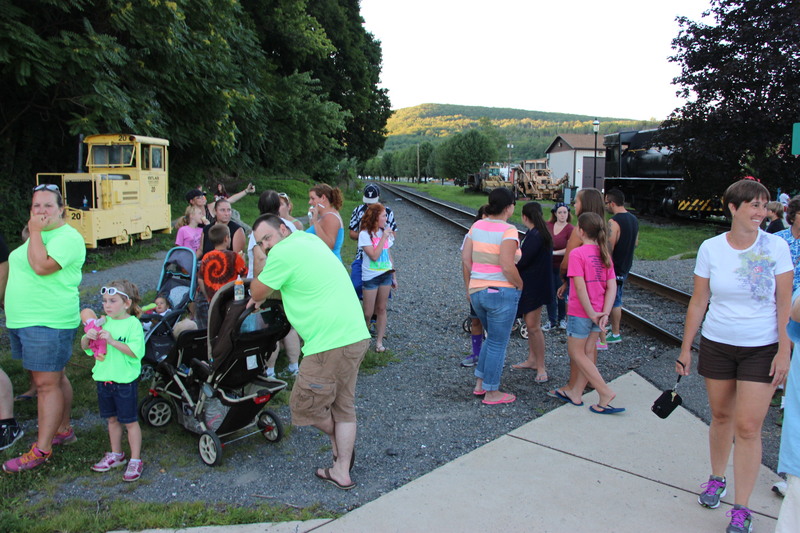 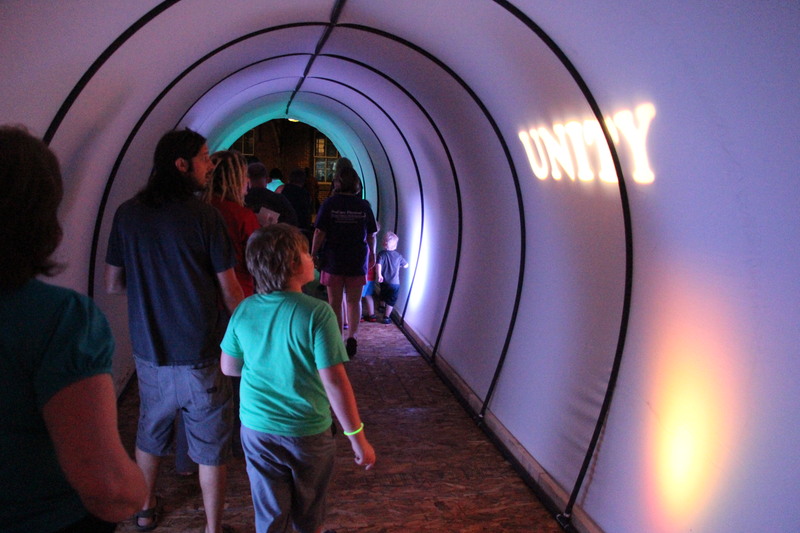 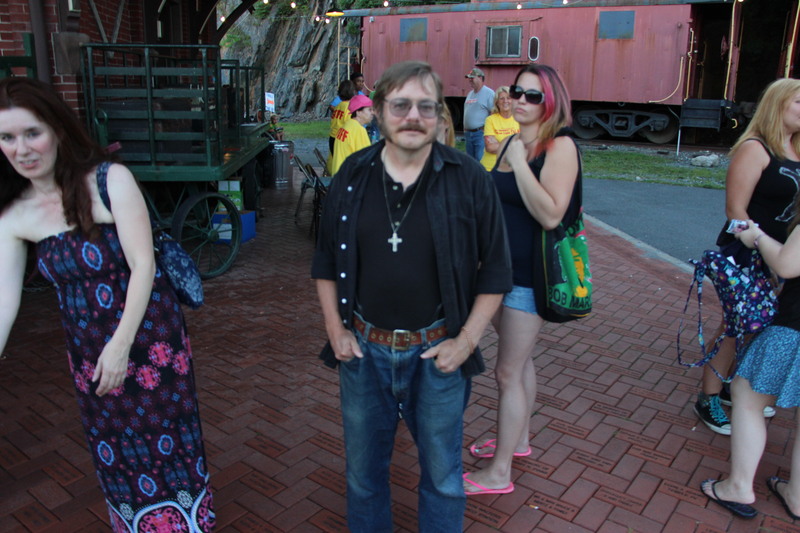 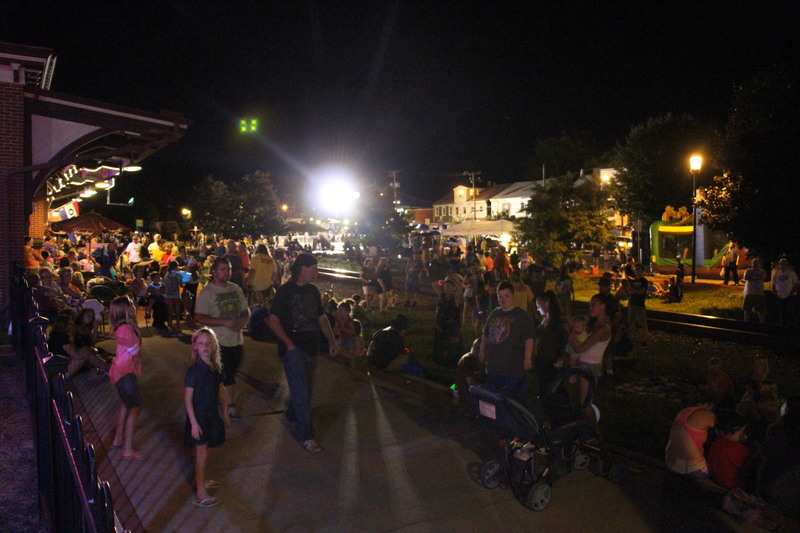 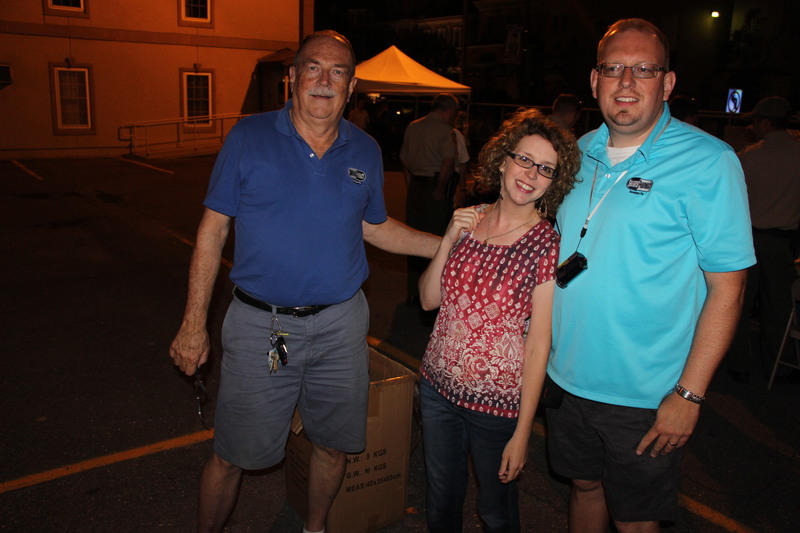 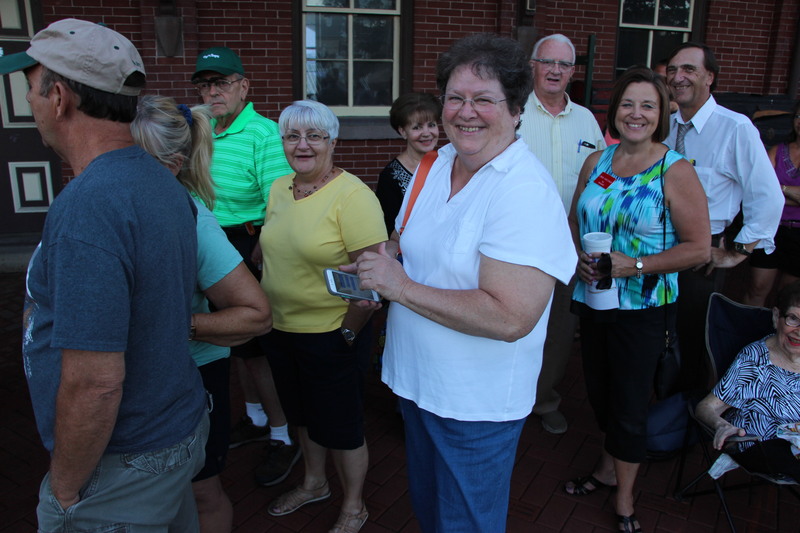 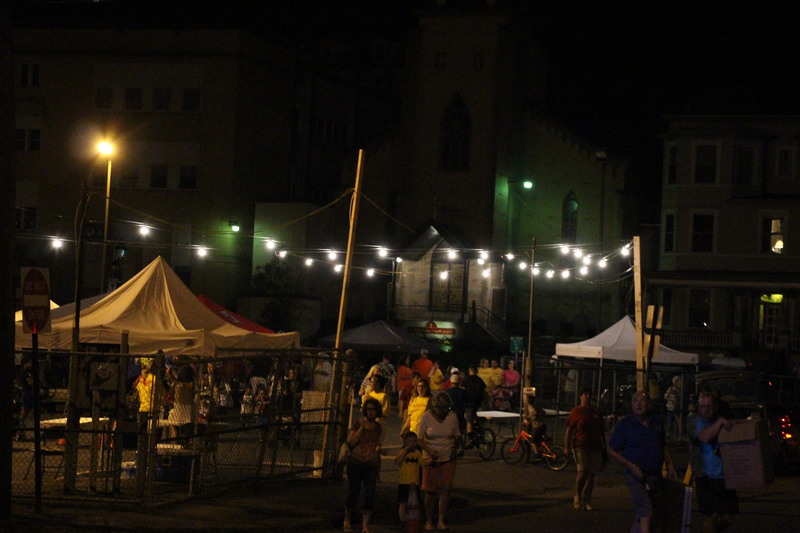 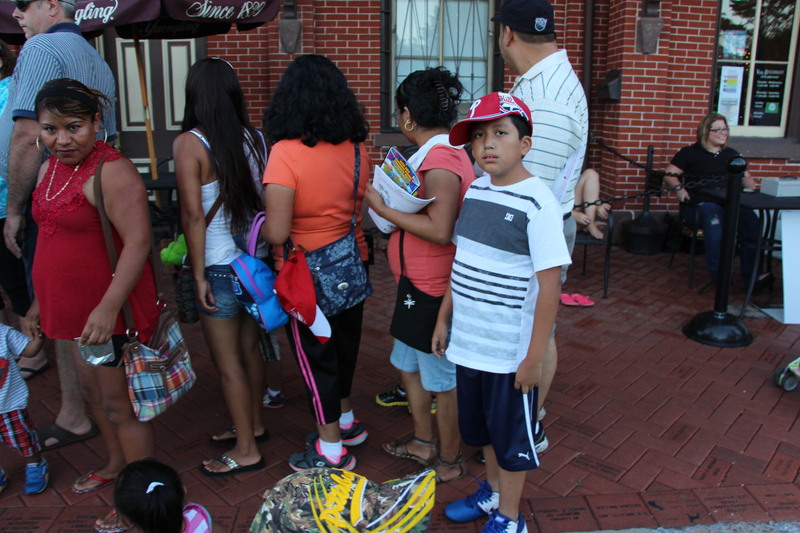 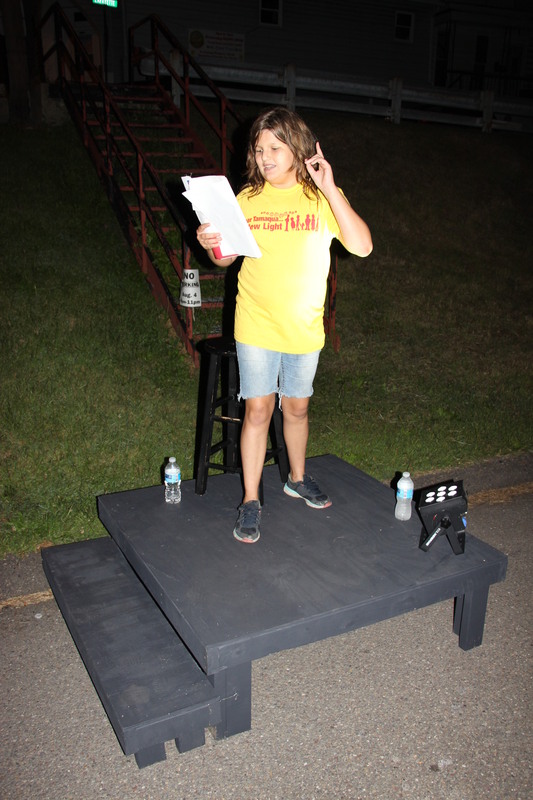 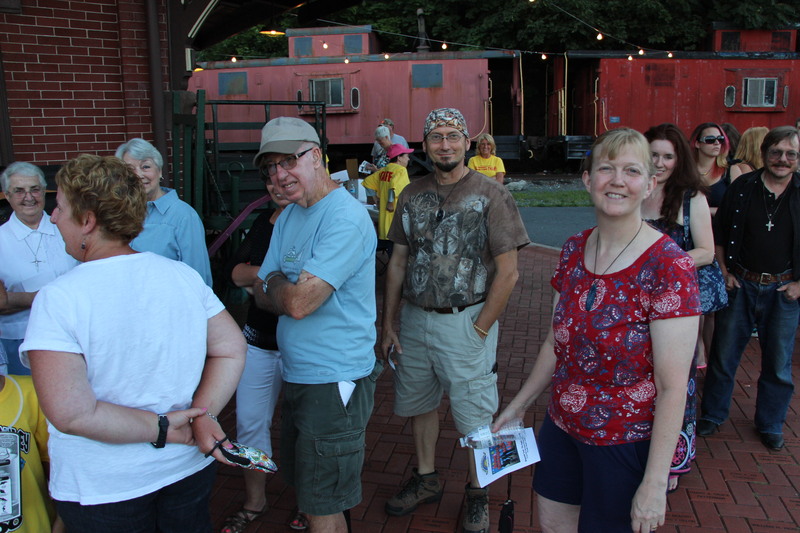 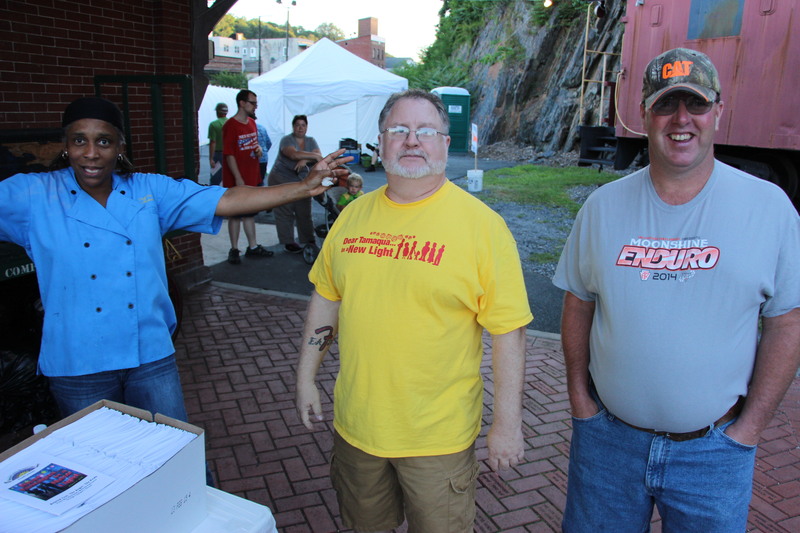 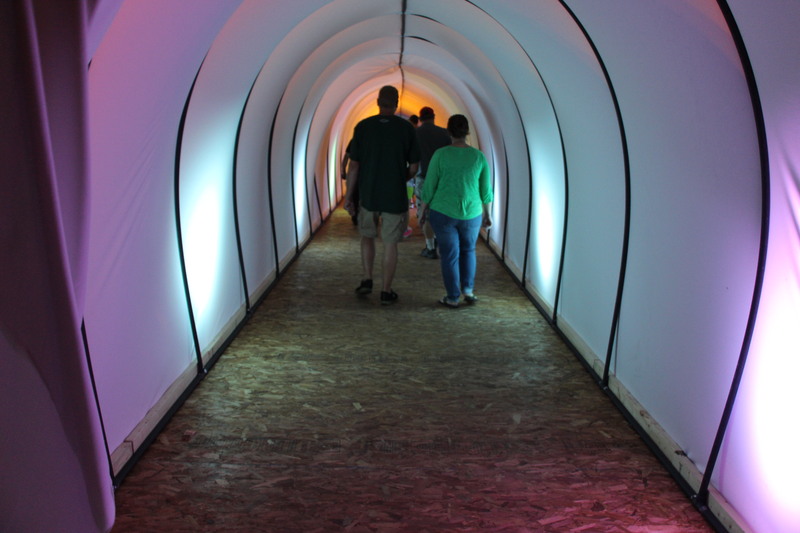 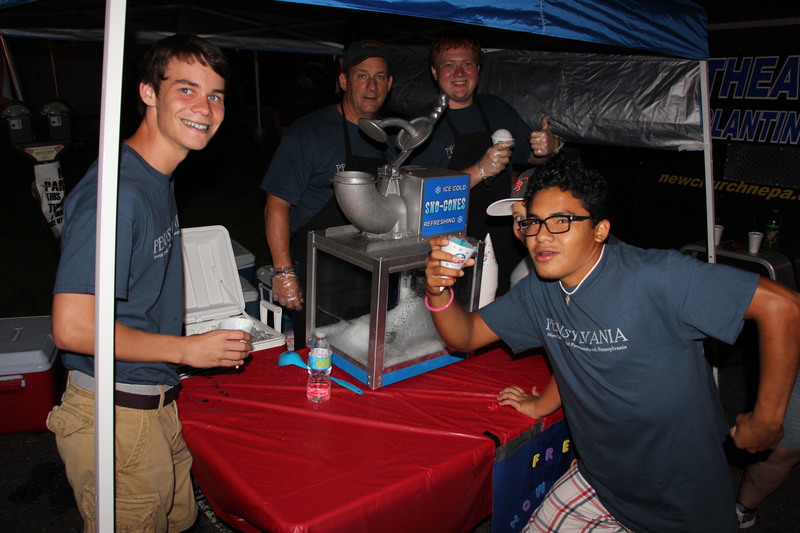 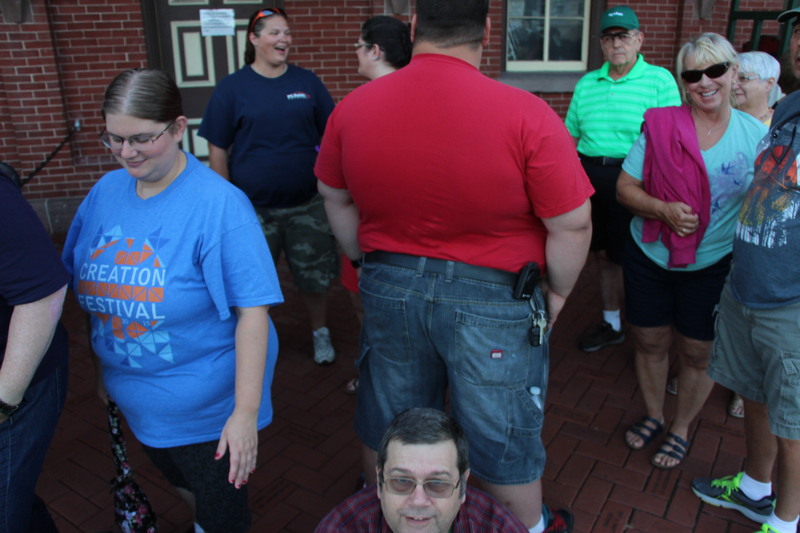 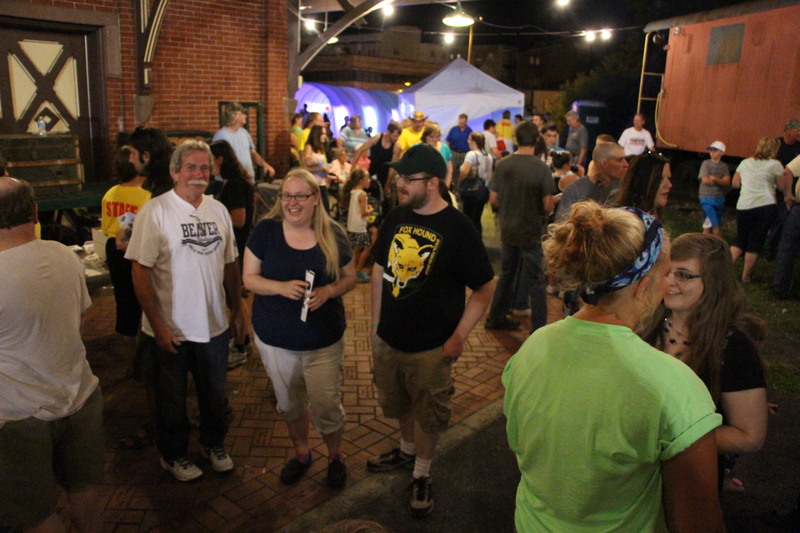 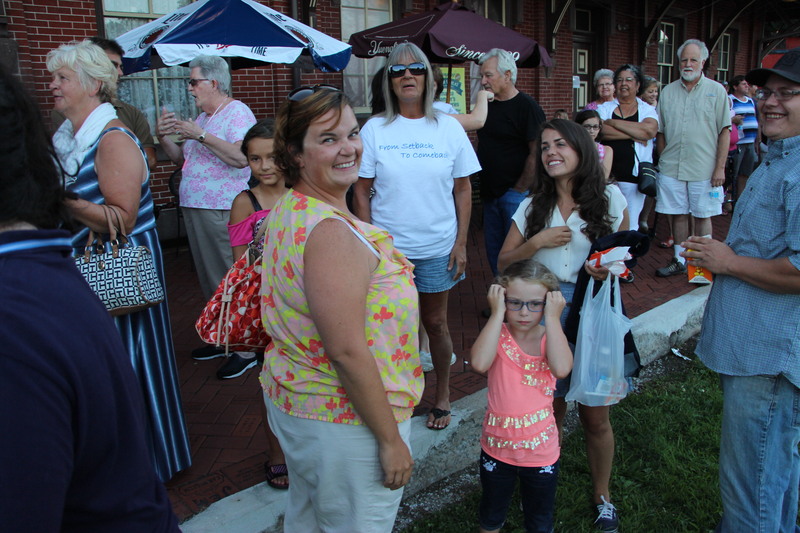 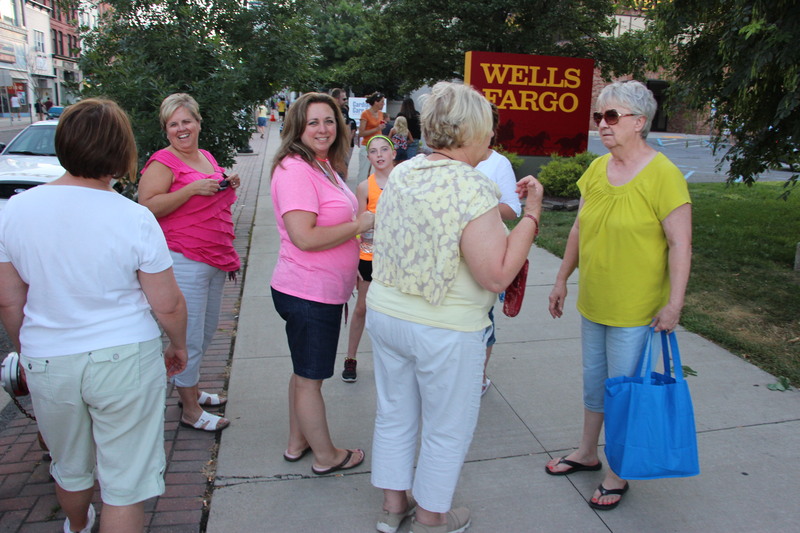 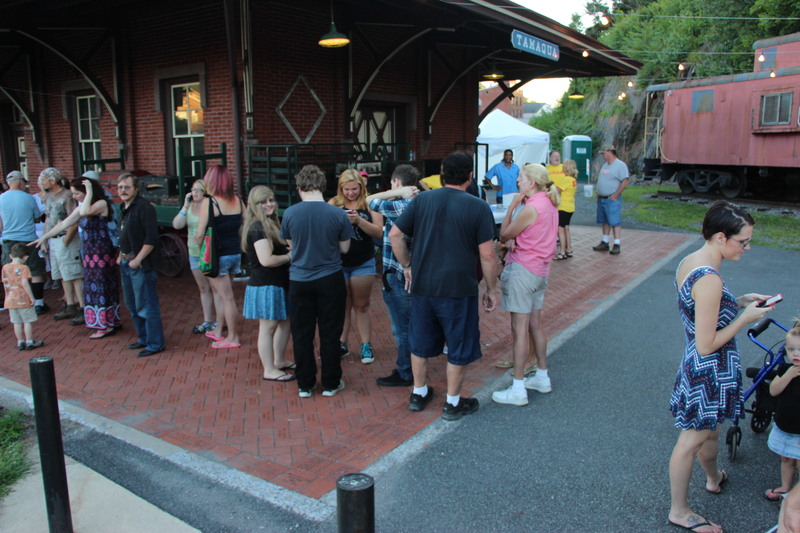 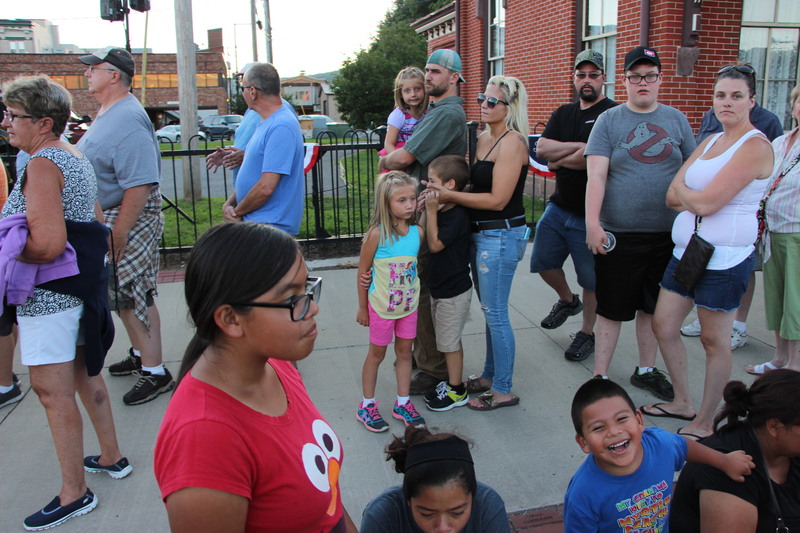 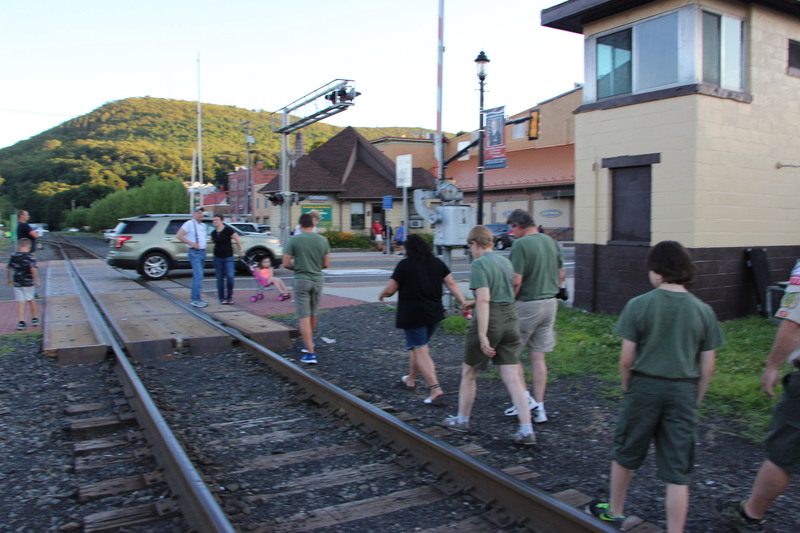 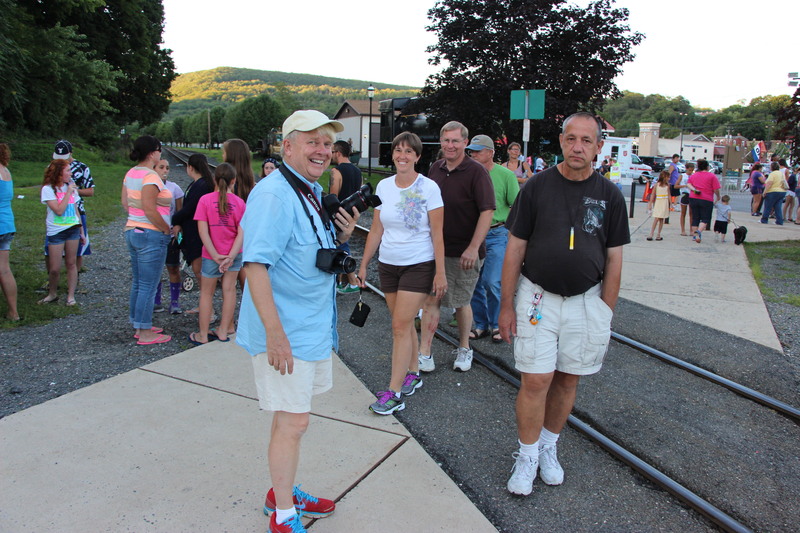 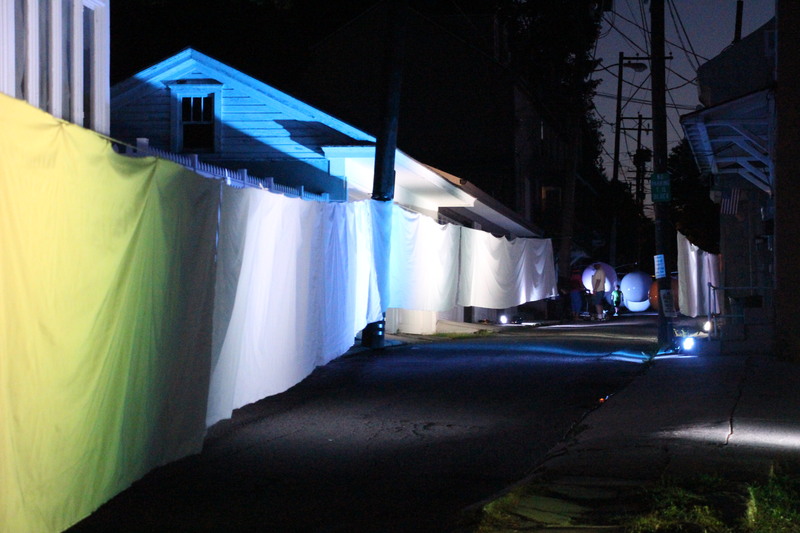 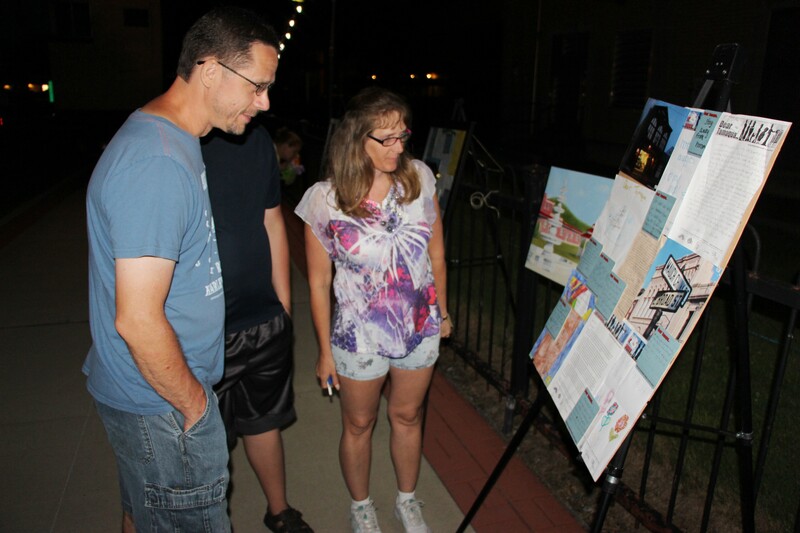 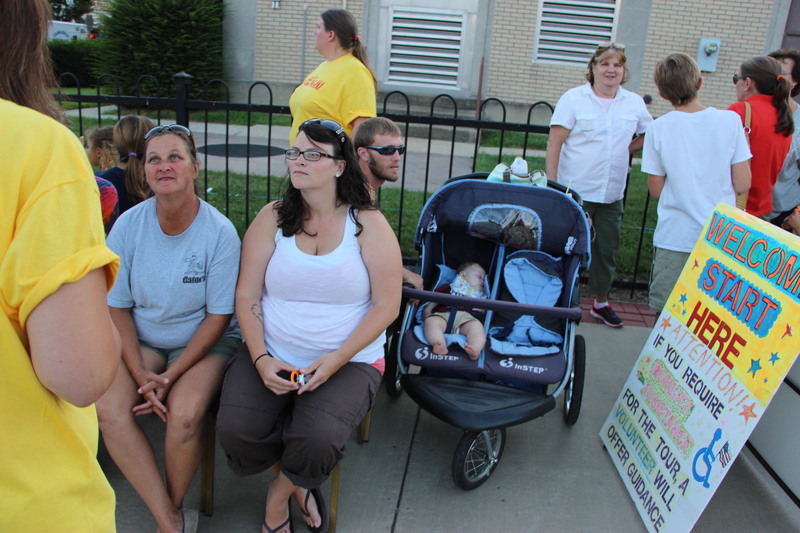 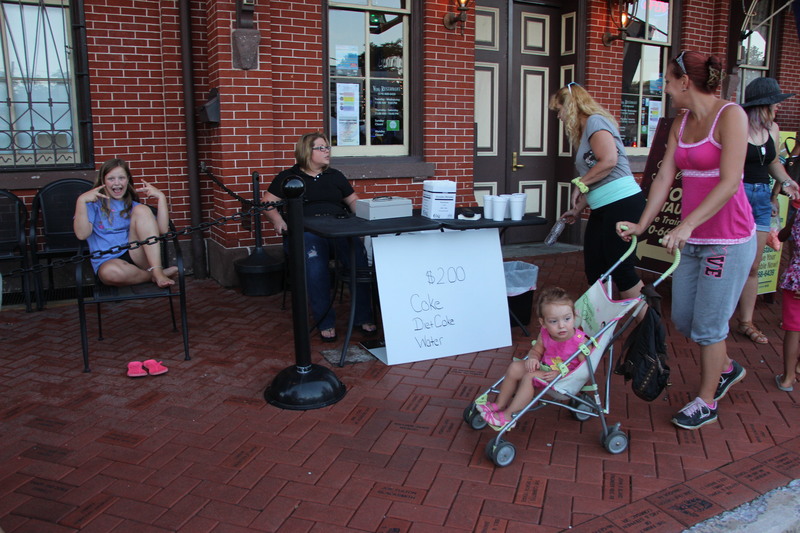 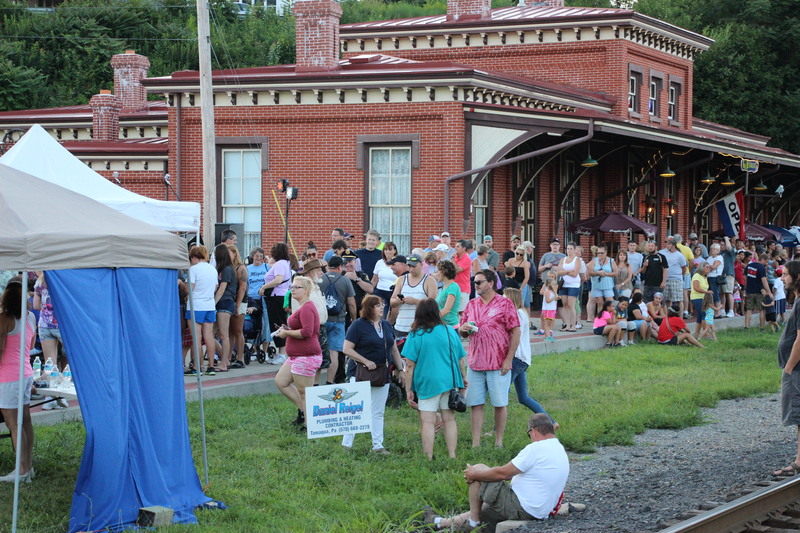 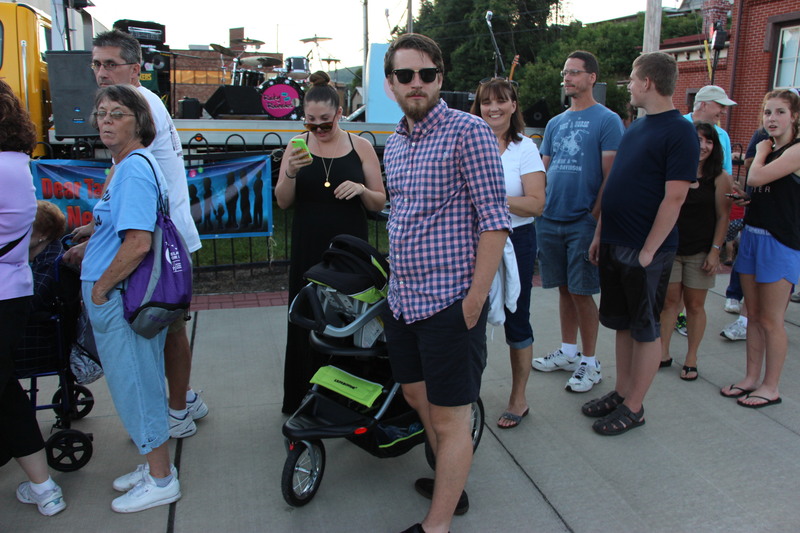 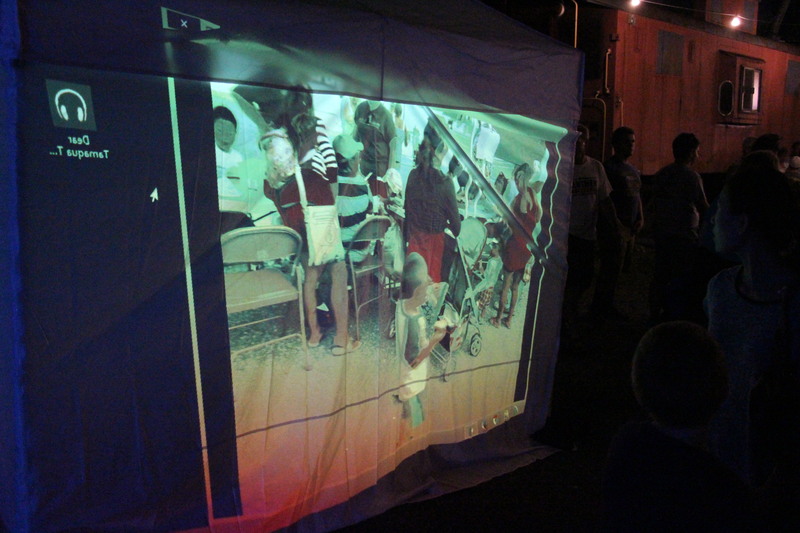 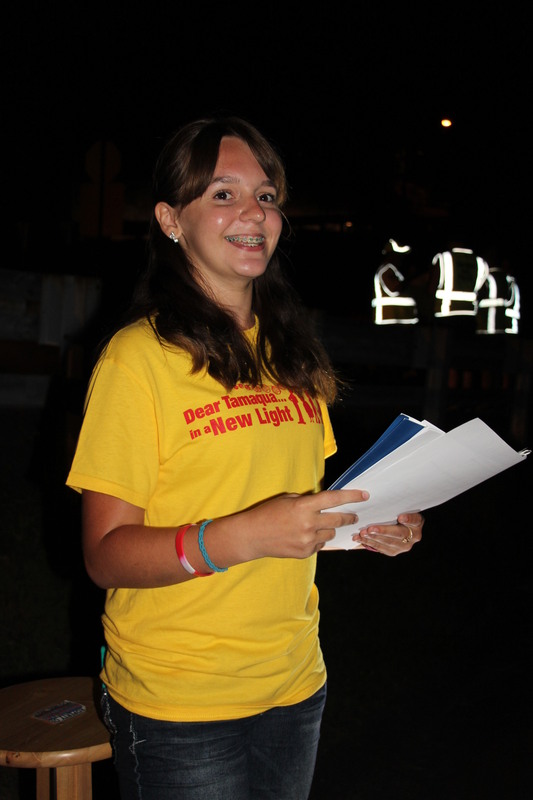 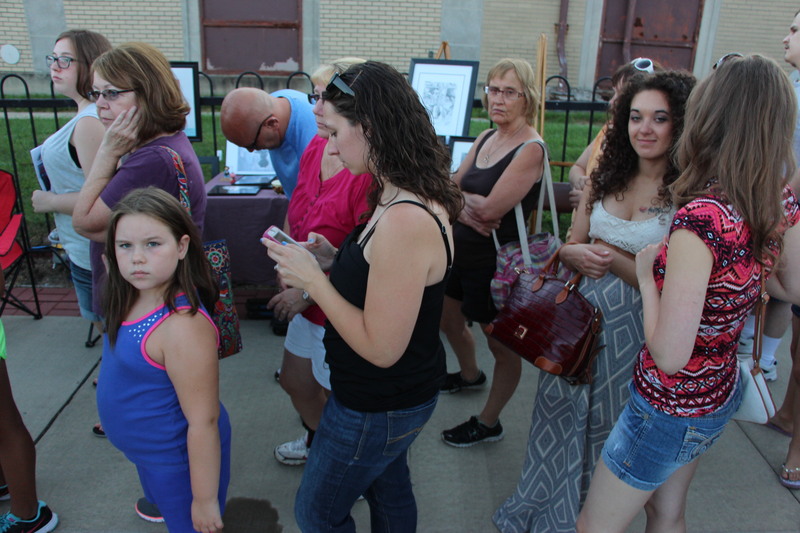 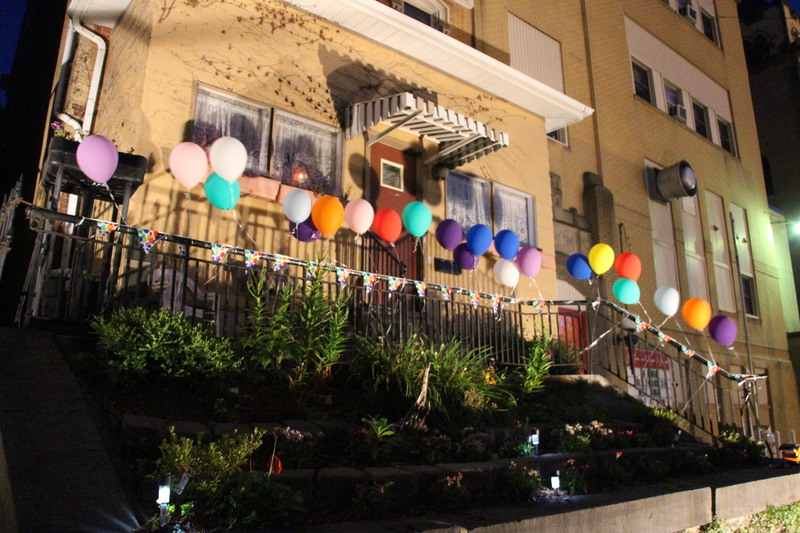 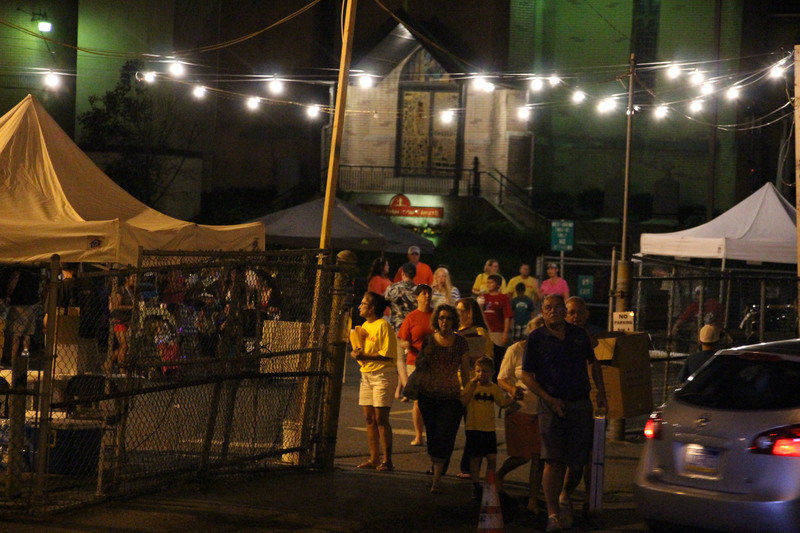 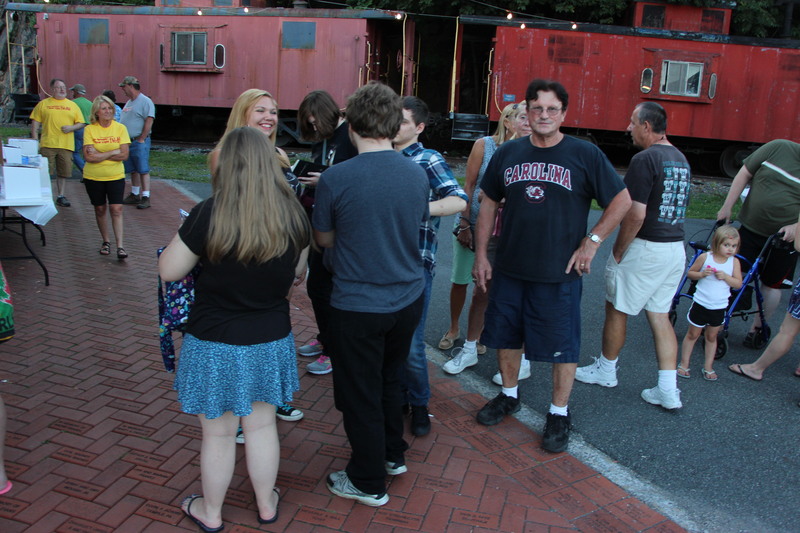 Over 1,400 local residents and visitors took part in Tuesday’s (August 4, 2015) free ‘Dear Tamaqua… in a New Light’ theatrical community event held in Tamaqua. 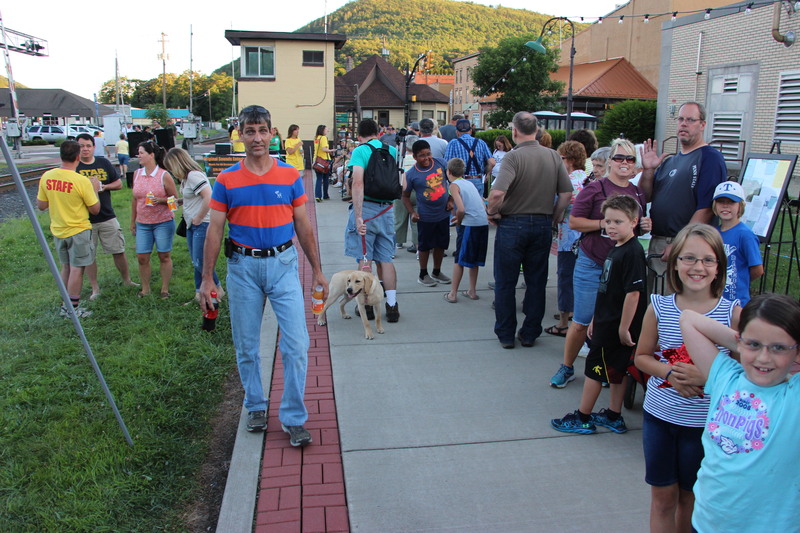 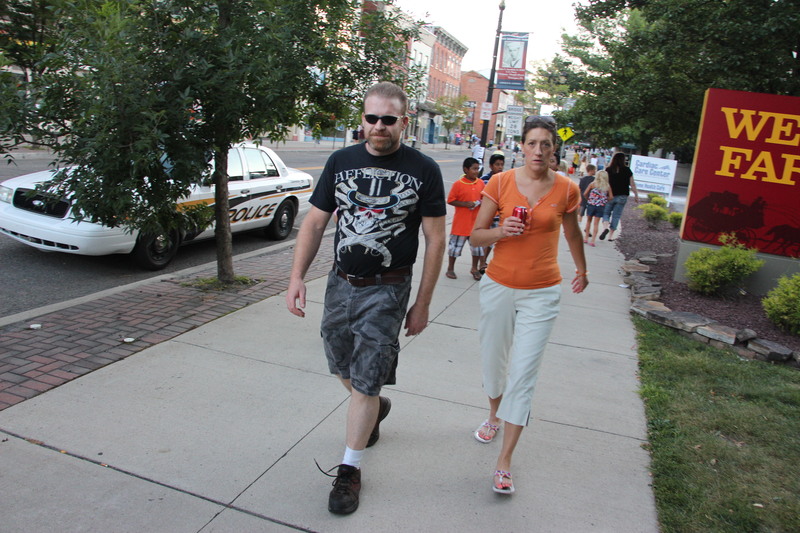 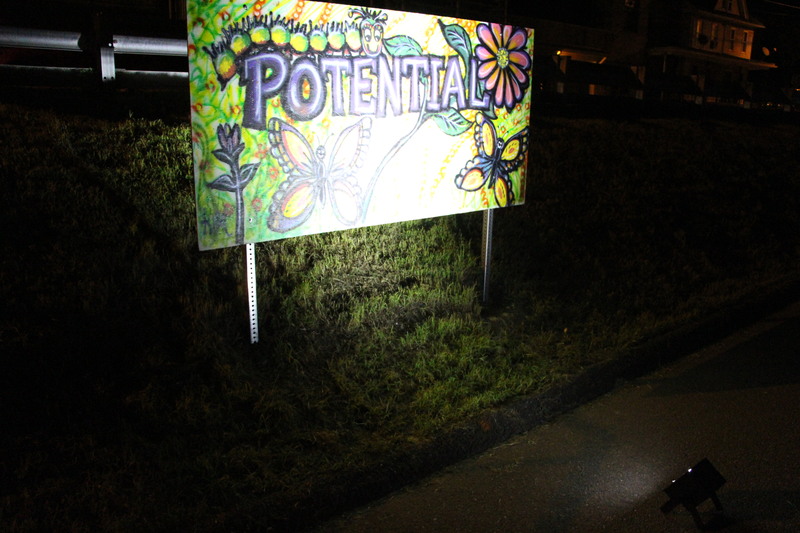 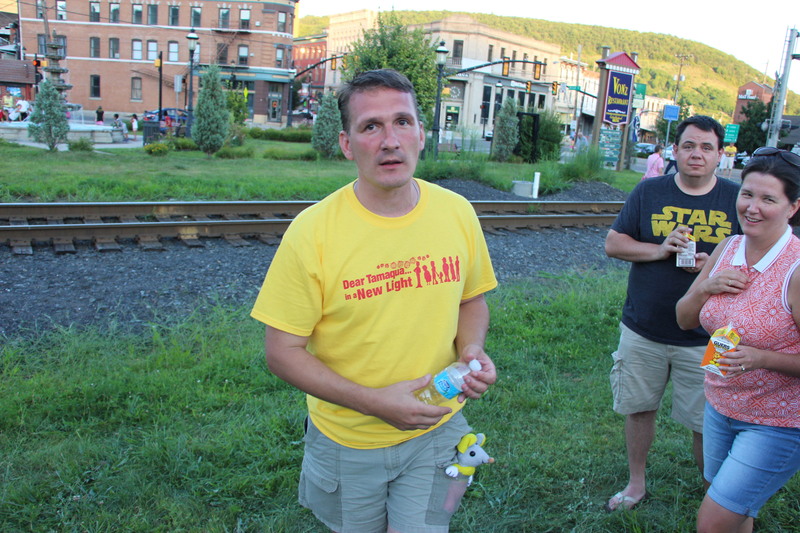 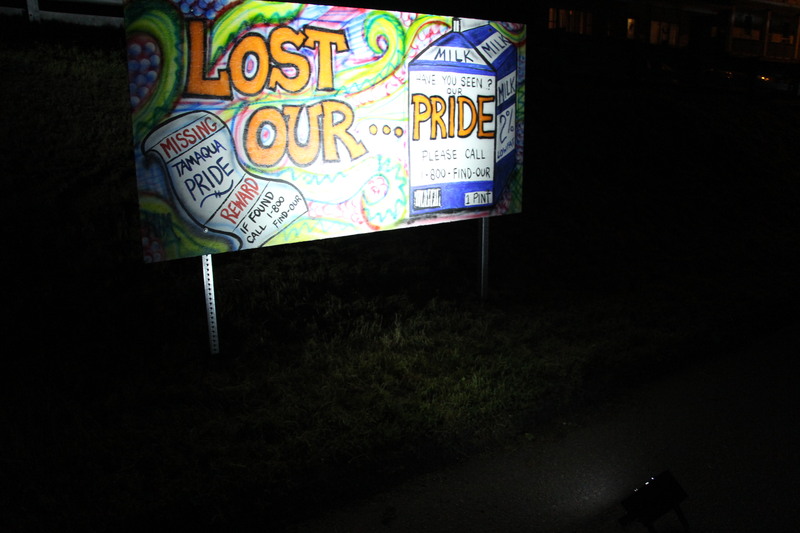 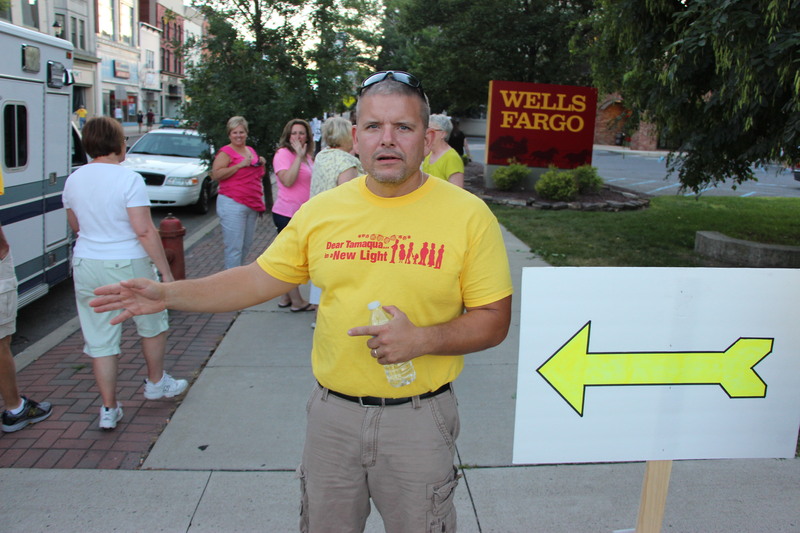 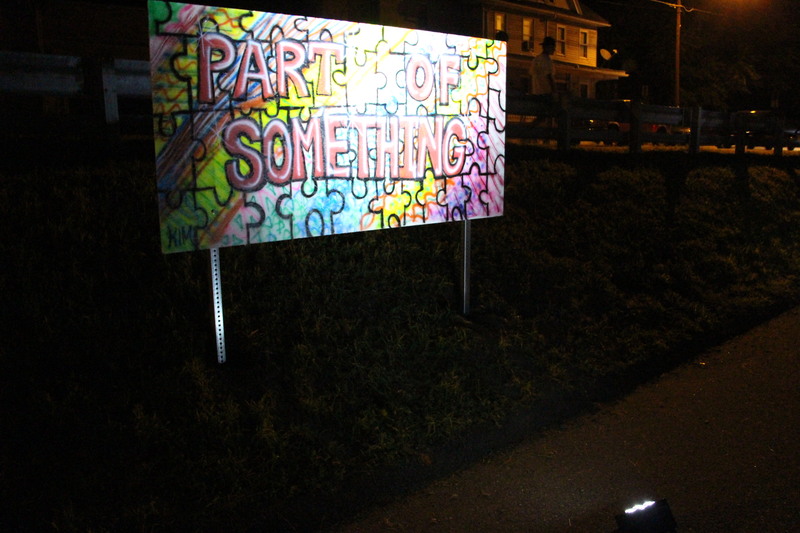 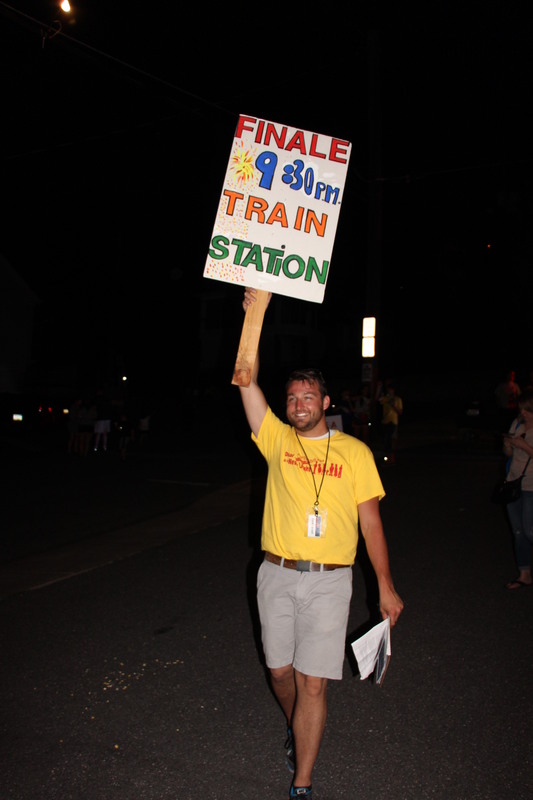 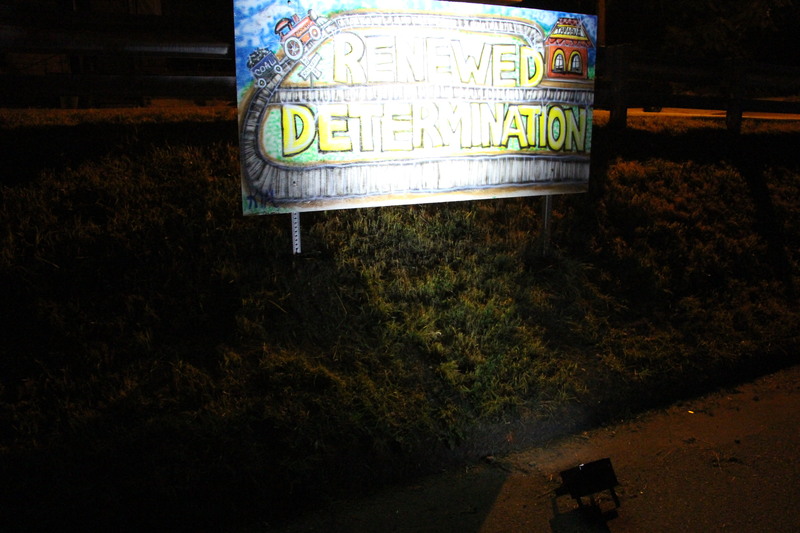 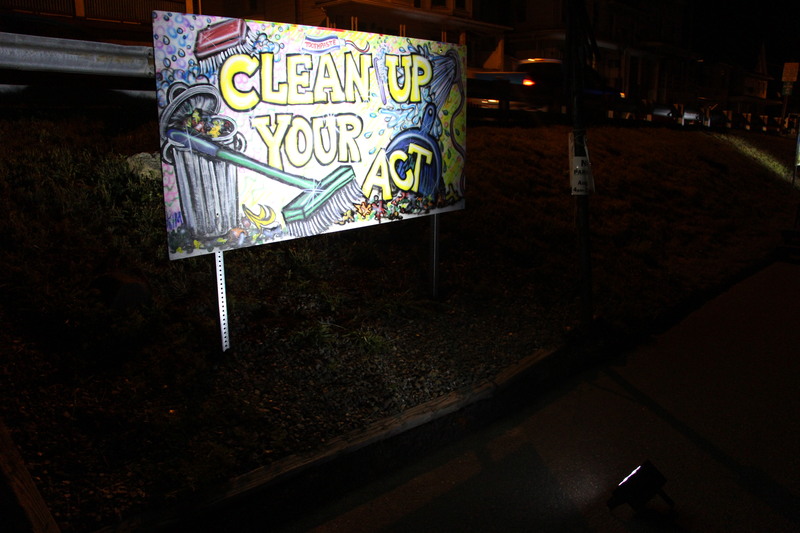 The event, titled “Beyond Coal: The Angst, The Pride – A One-mile Multimedia Walking Experience Through the Streets of Tamaqua”, was organized via the Tamaqua Community Arts Center (TCAC), and represented the culmination of a two-year project involving over 600 submitted ‘Dear Tamaqua’ letters from the community. 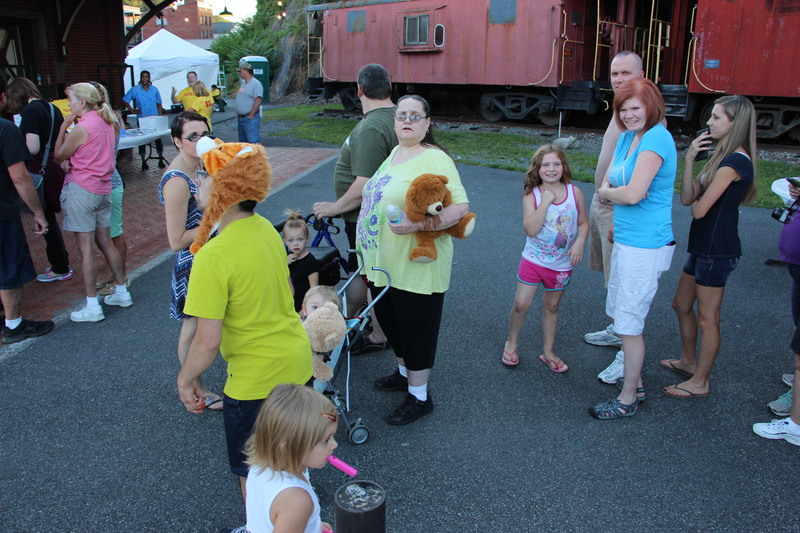 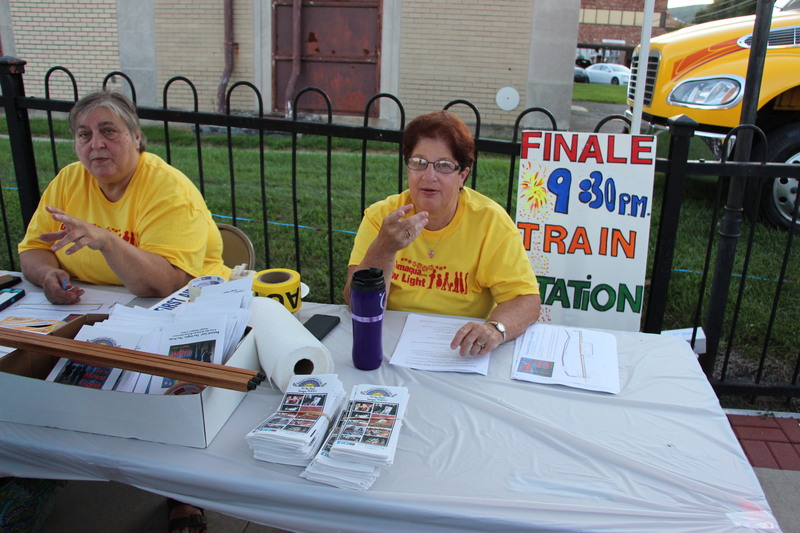 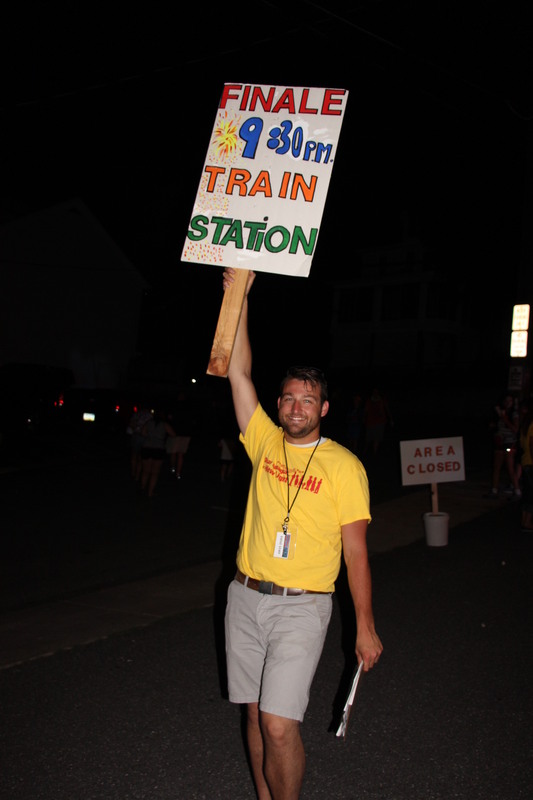 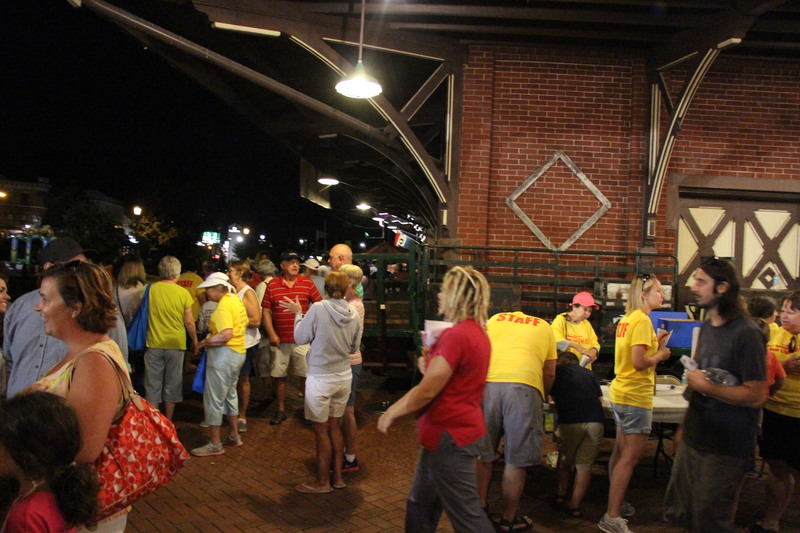 Kicking off the event was the Tamaqua Salvation Army ‘Kidz Karnival’ held at the train station lot. 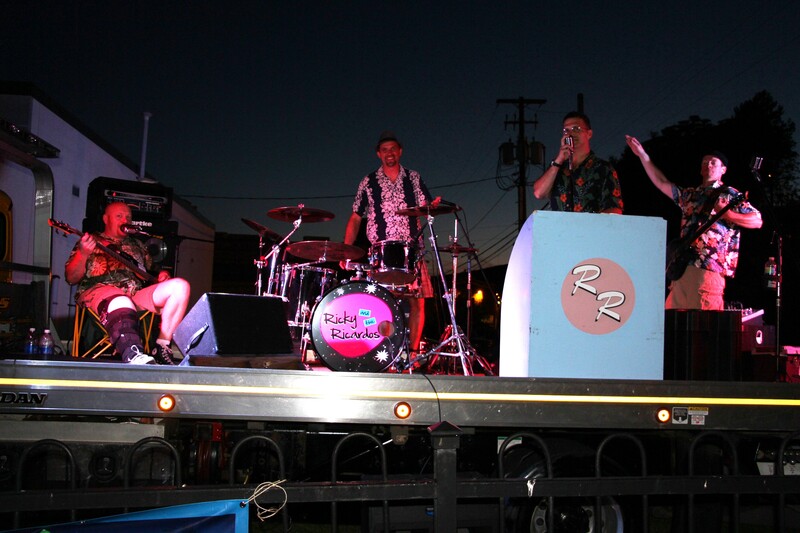 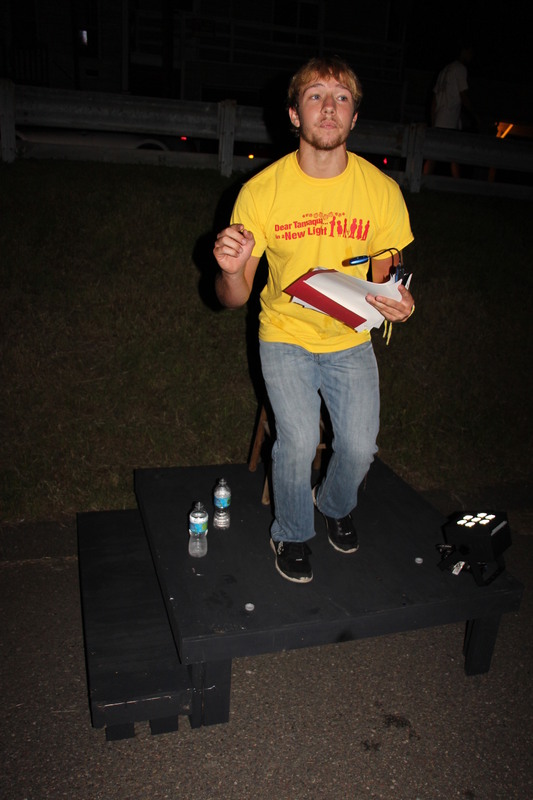 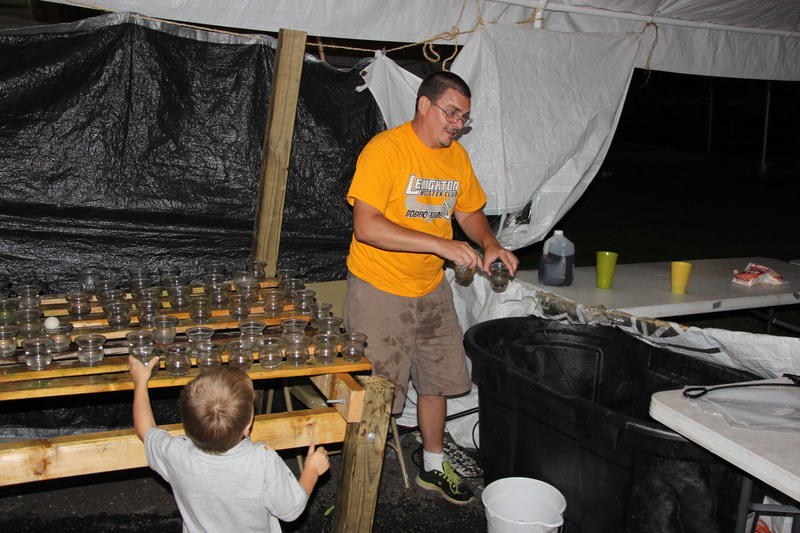 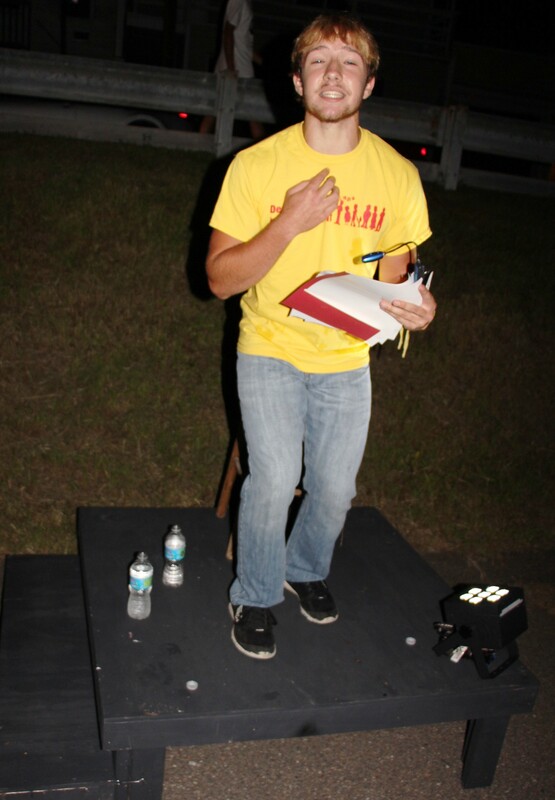 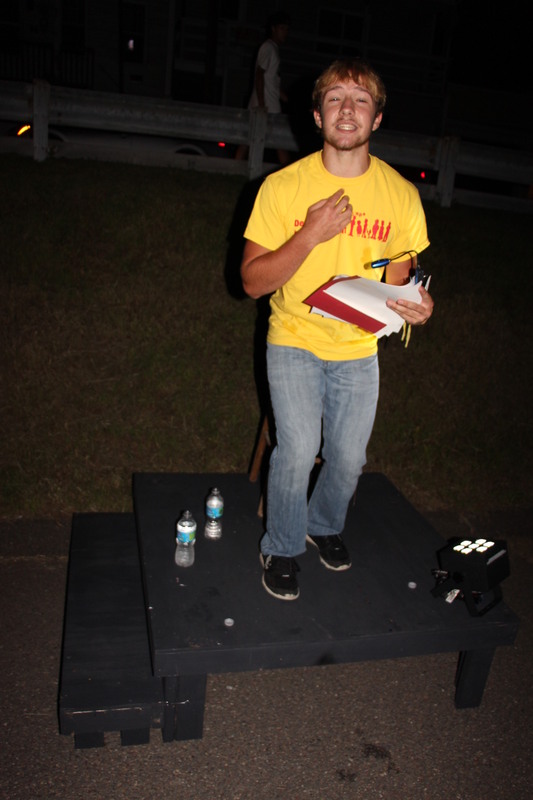 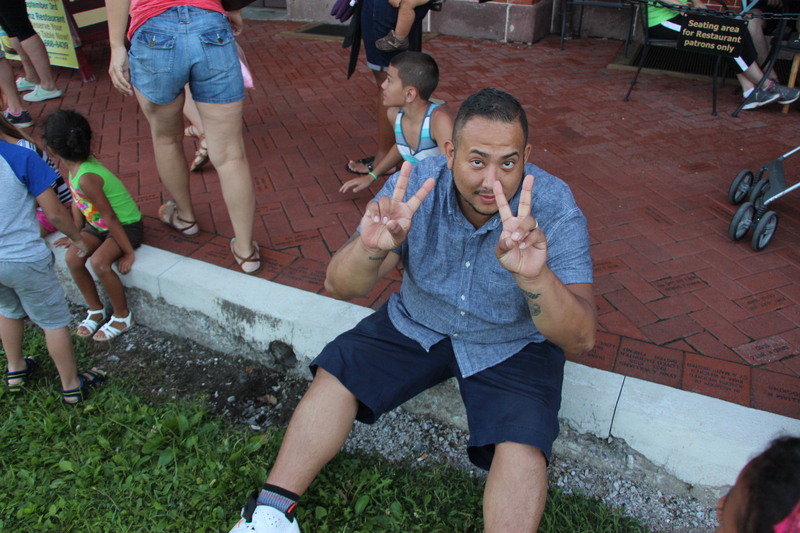 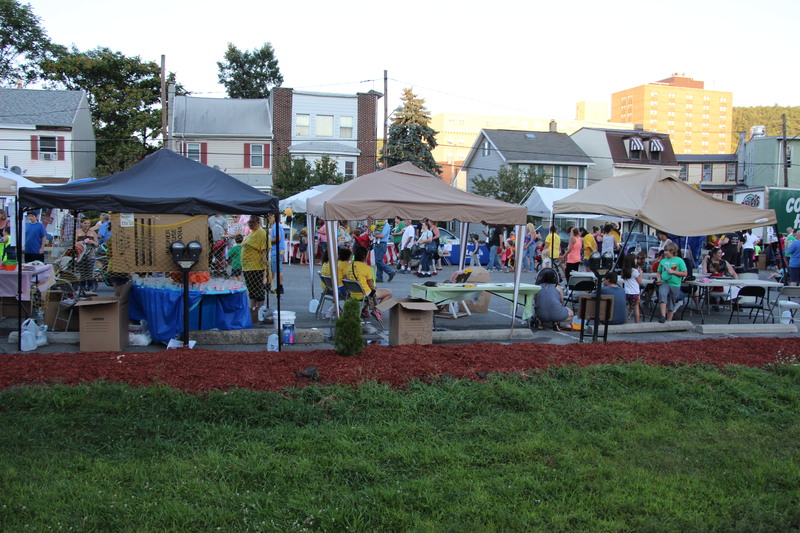 That event consisted of games, rides, food, prizes and numerous other activities. 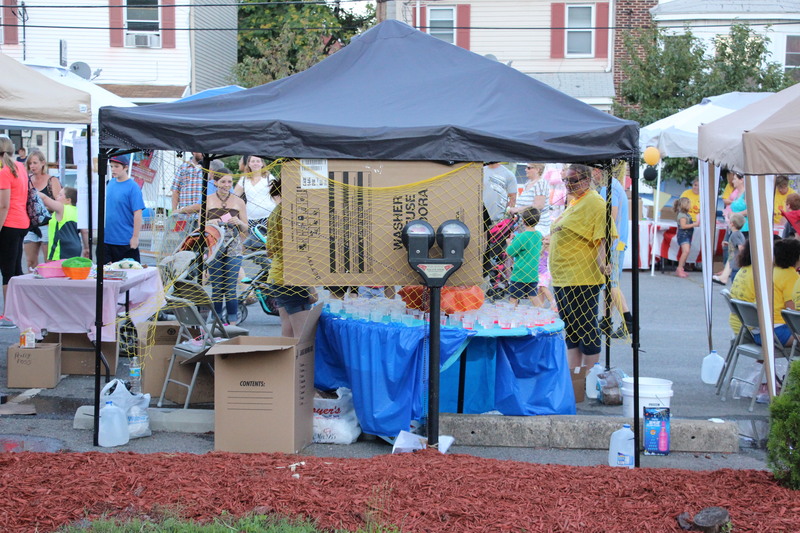 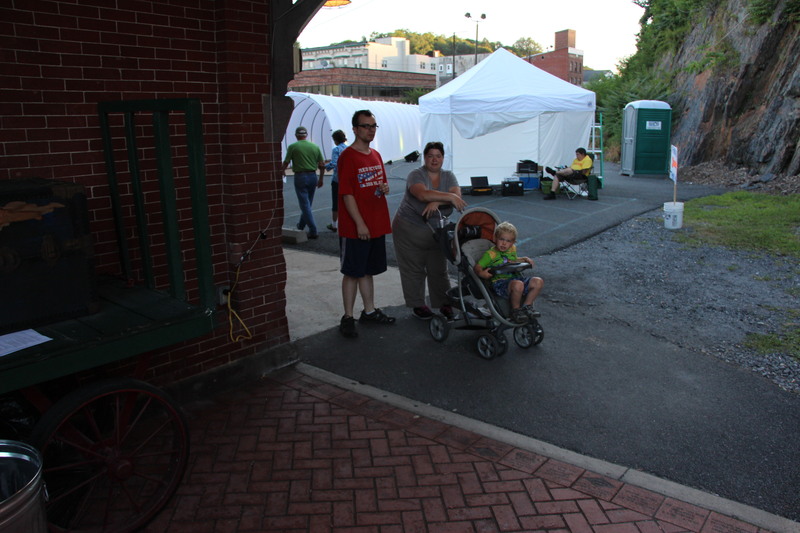 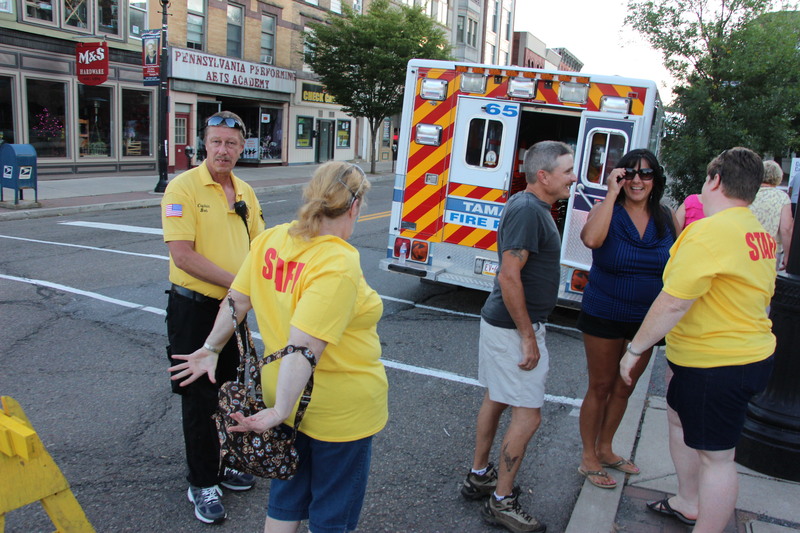 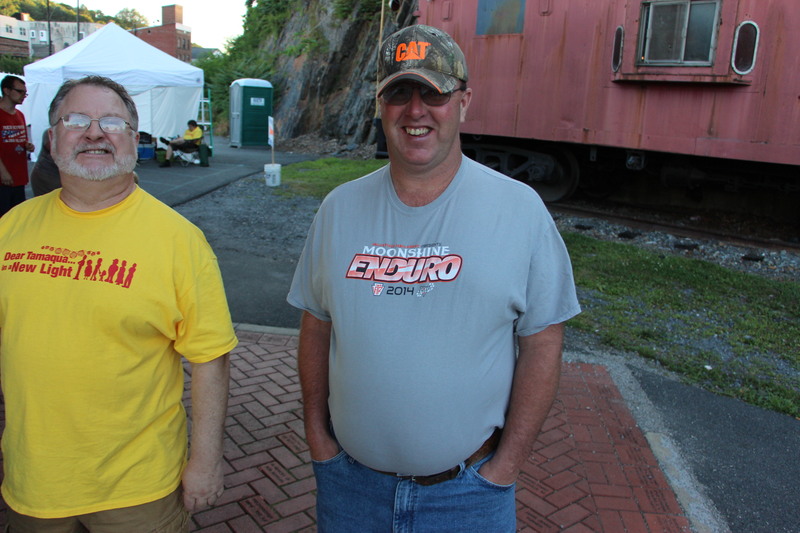 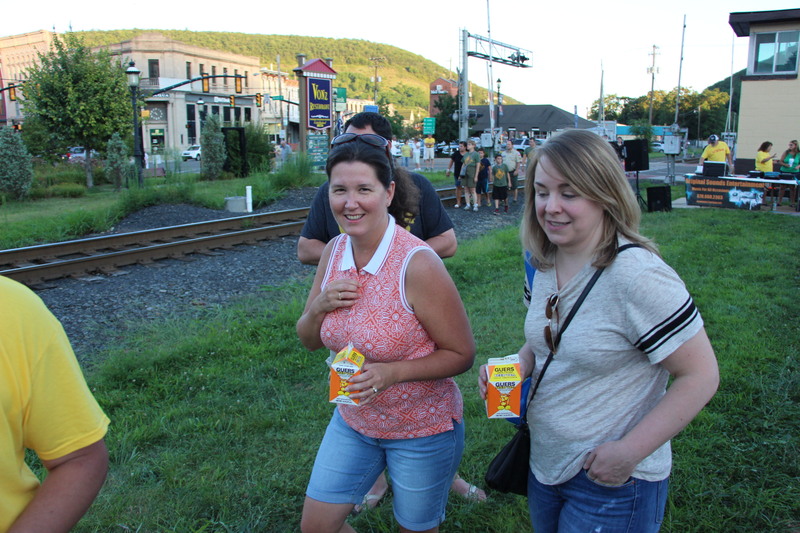 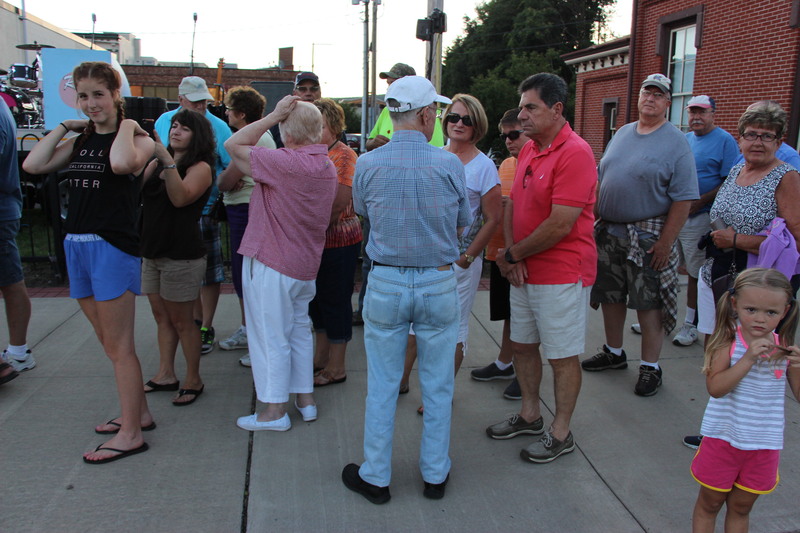 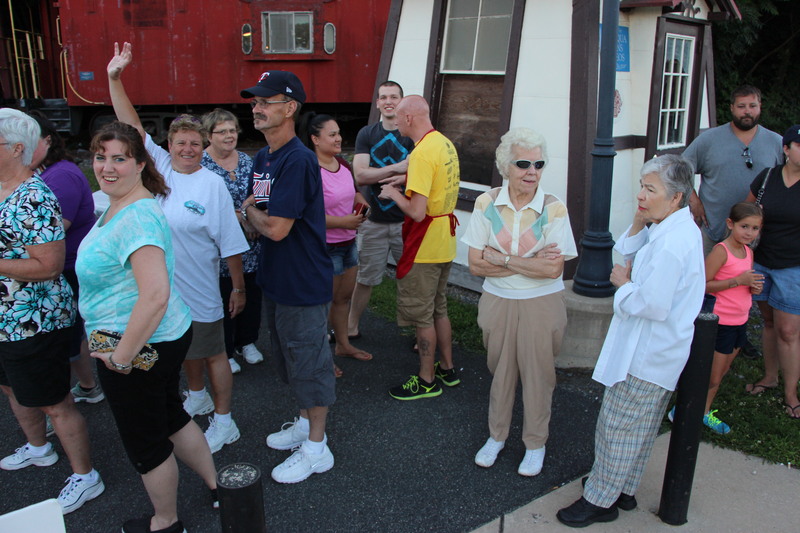 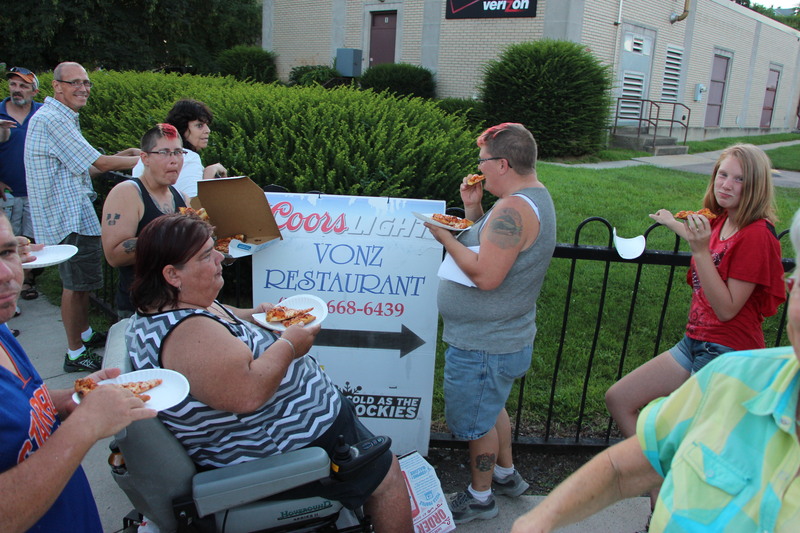 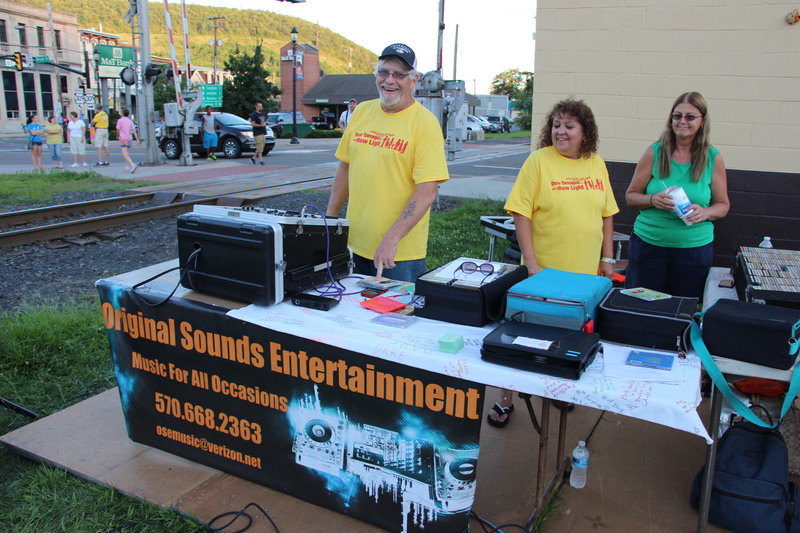 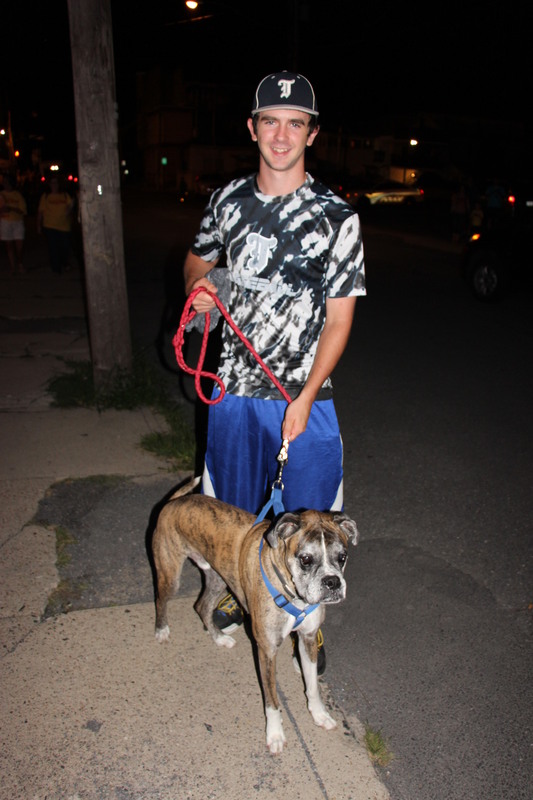 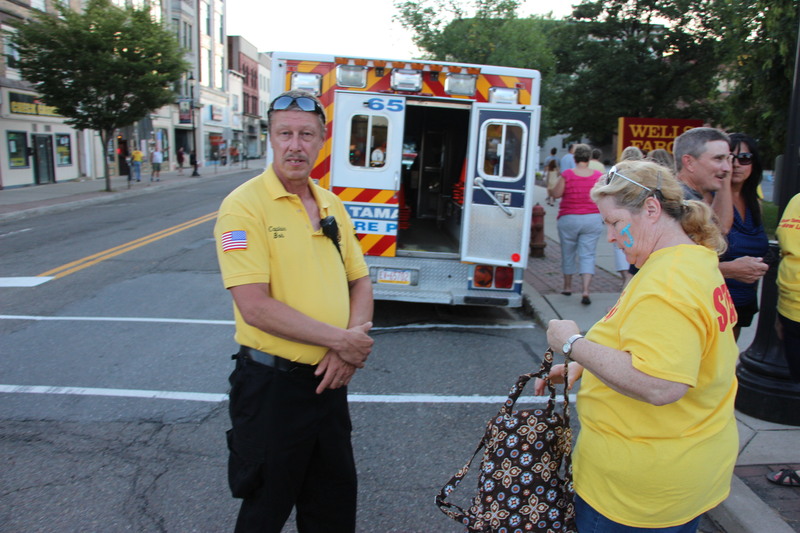 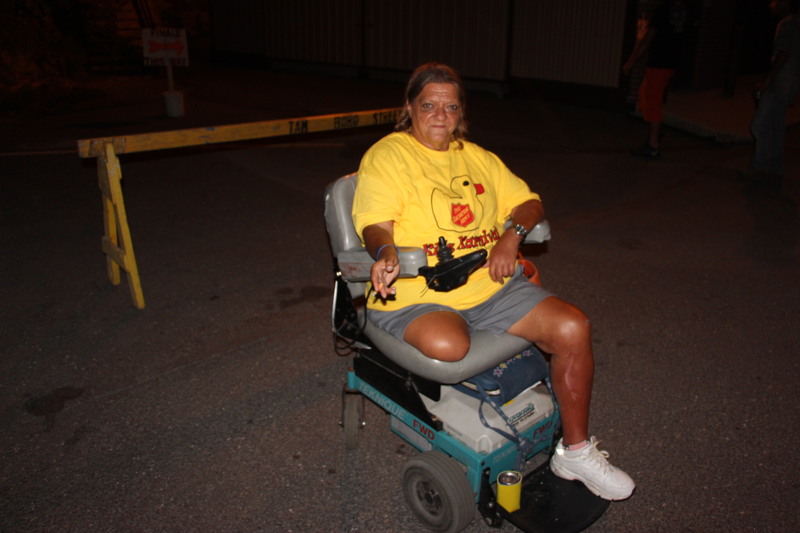 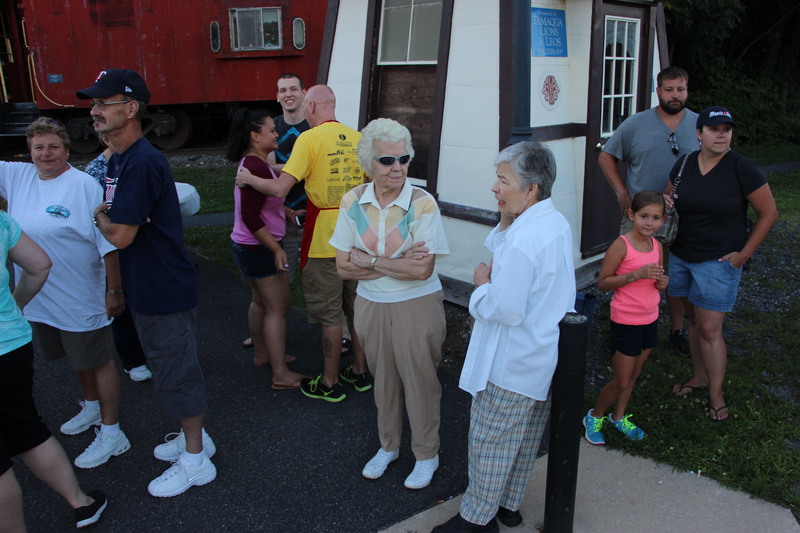 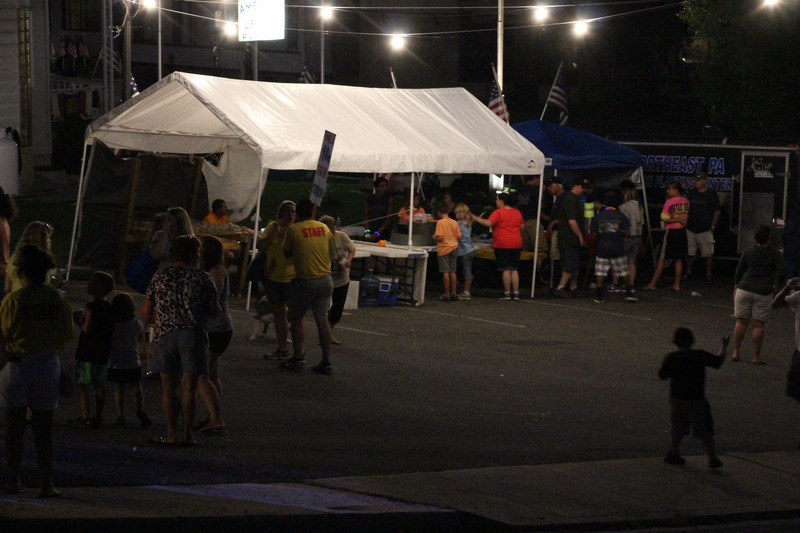 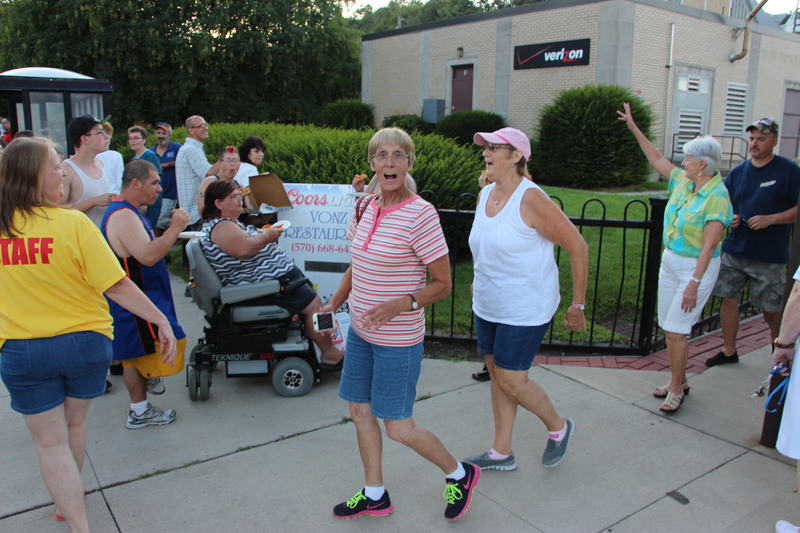 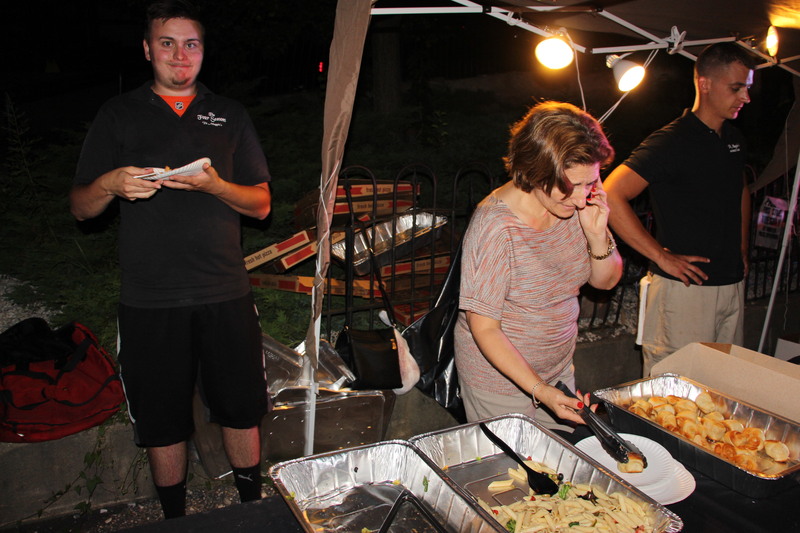 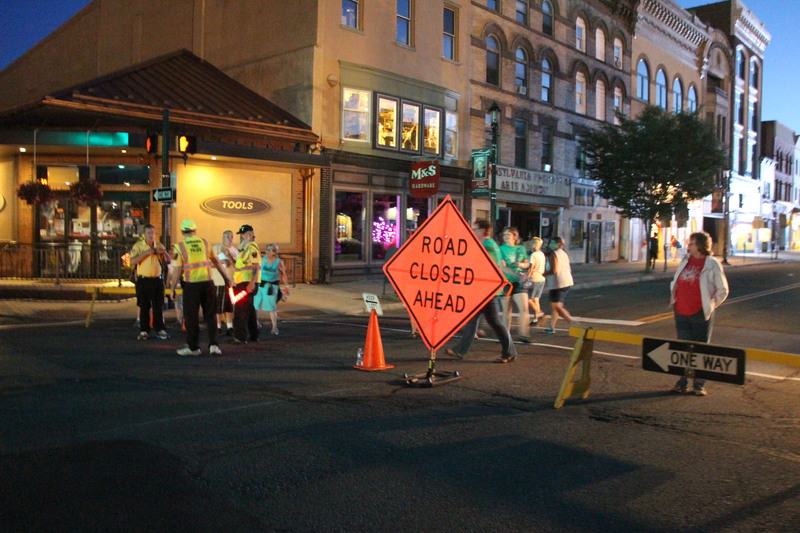 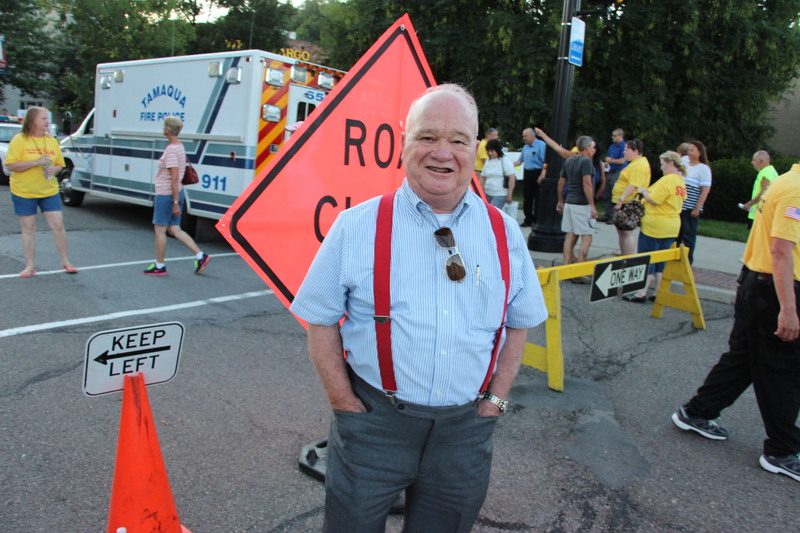 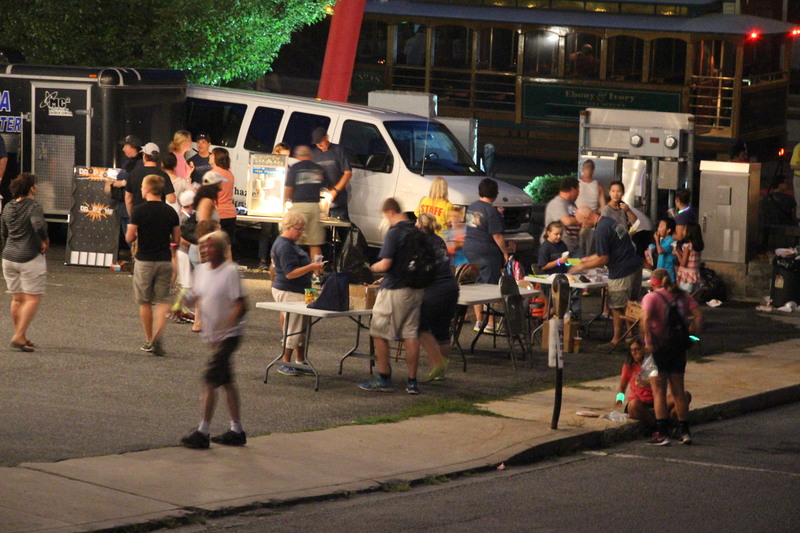 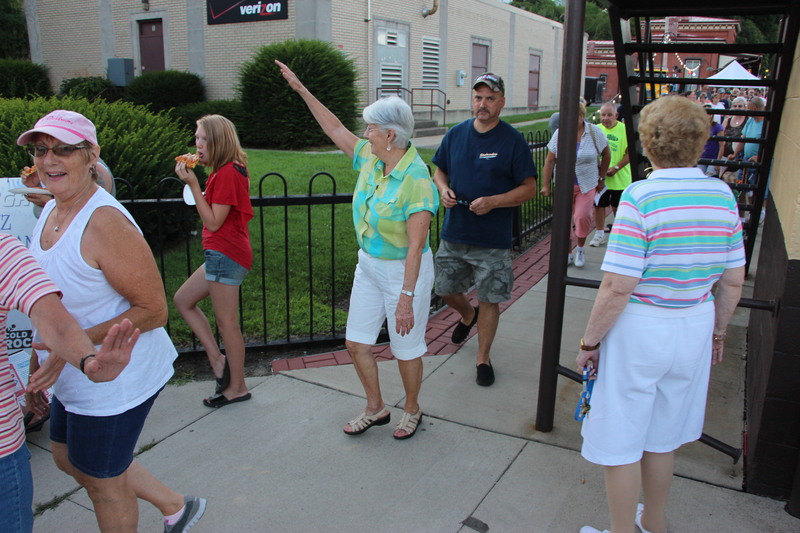 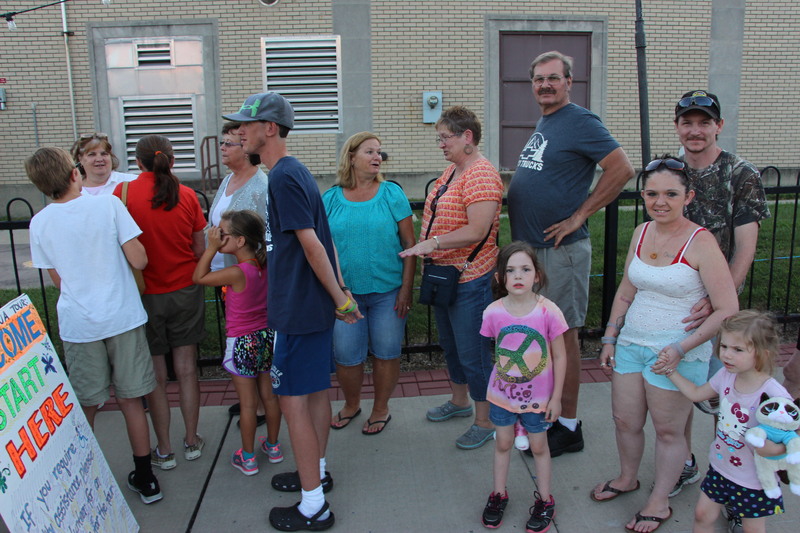 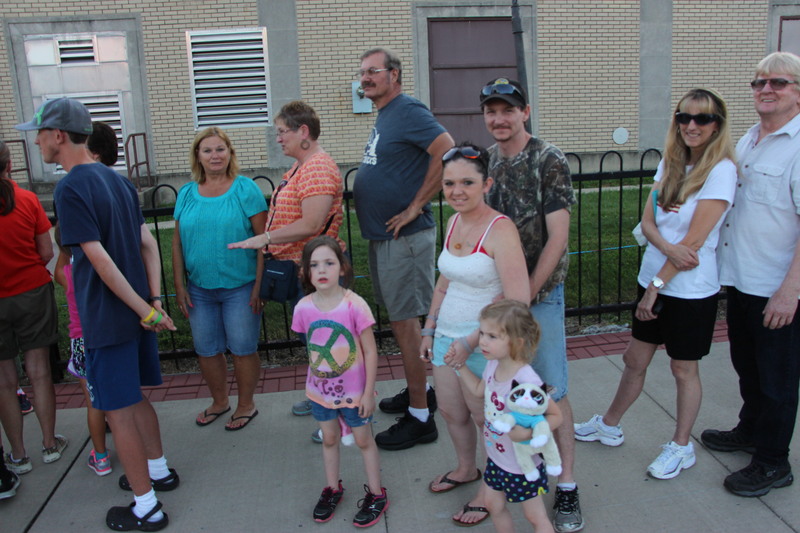 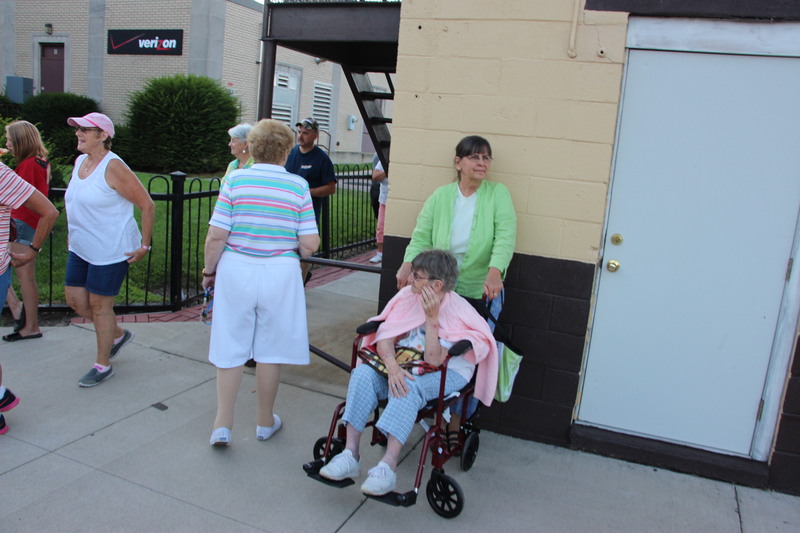 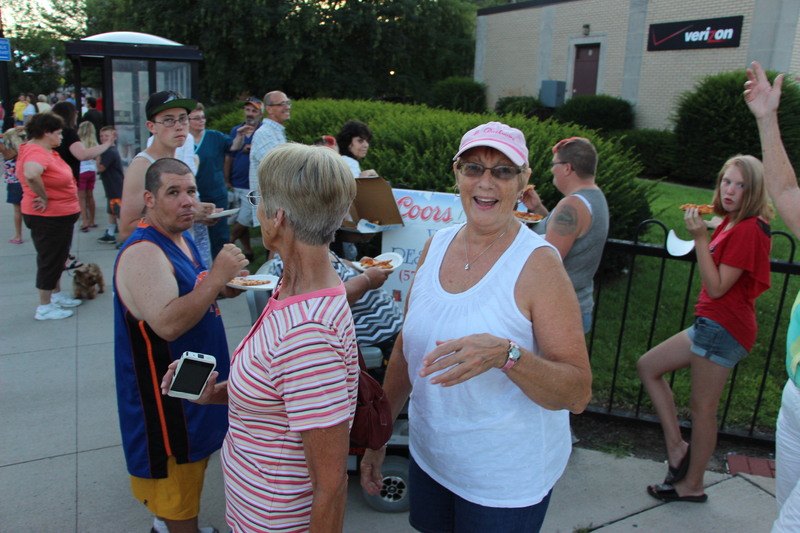 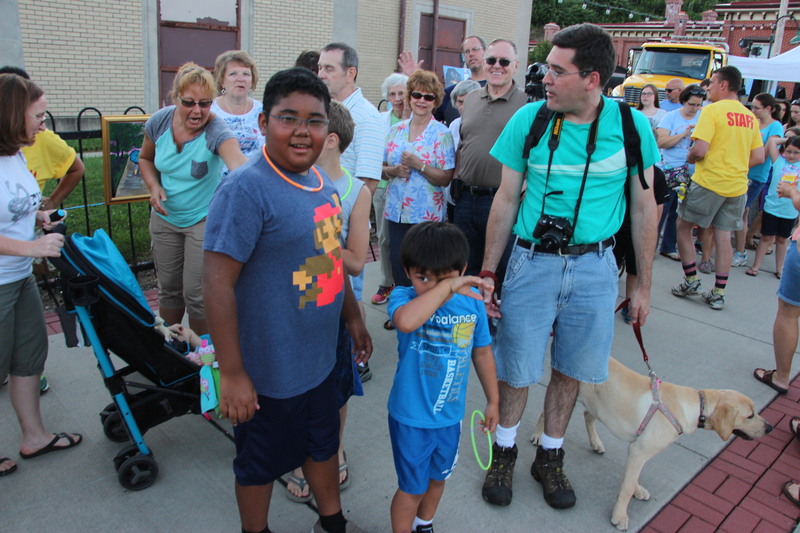 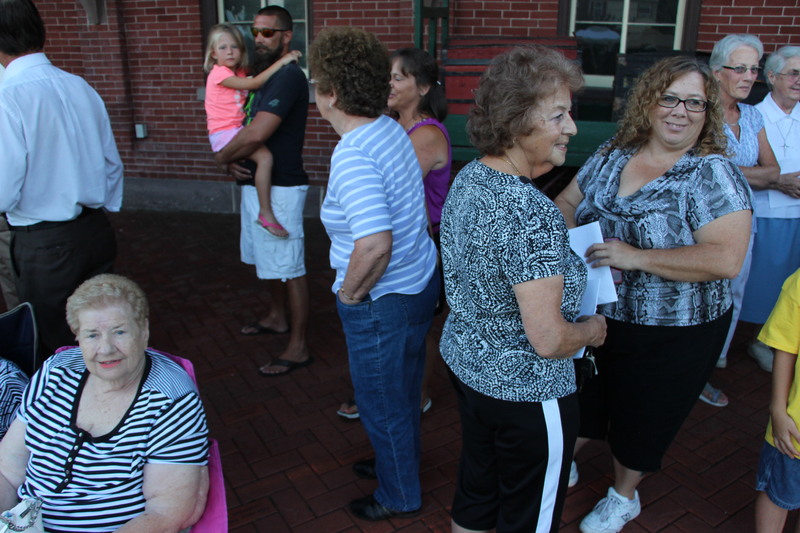 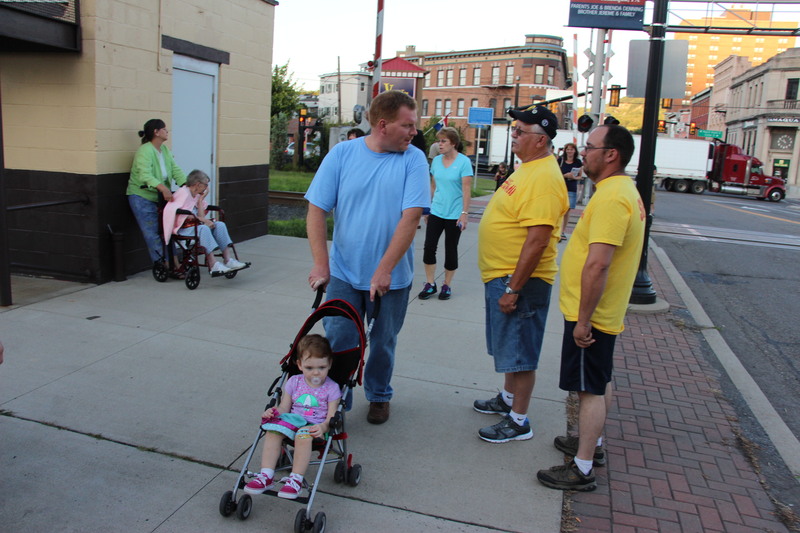 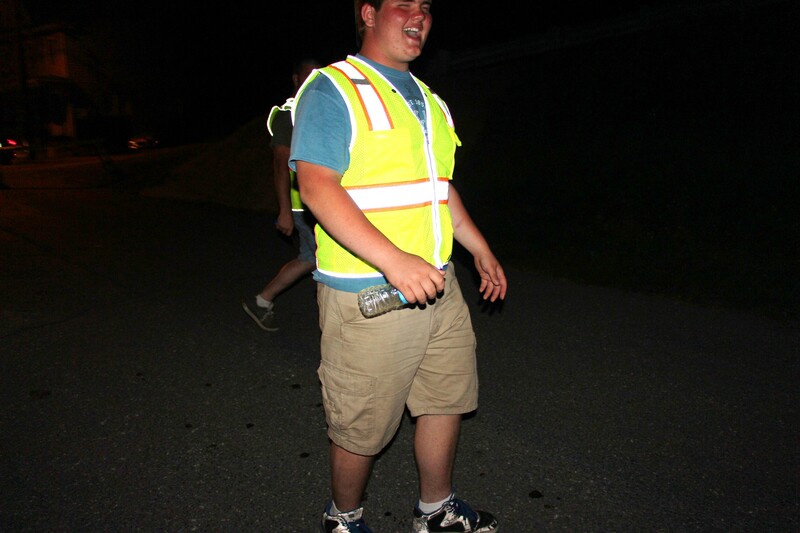 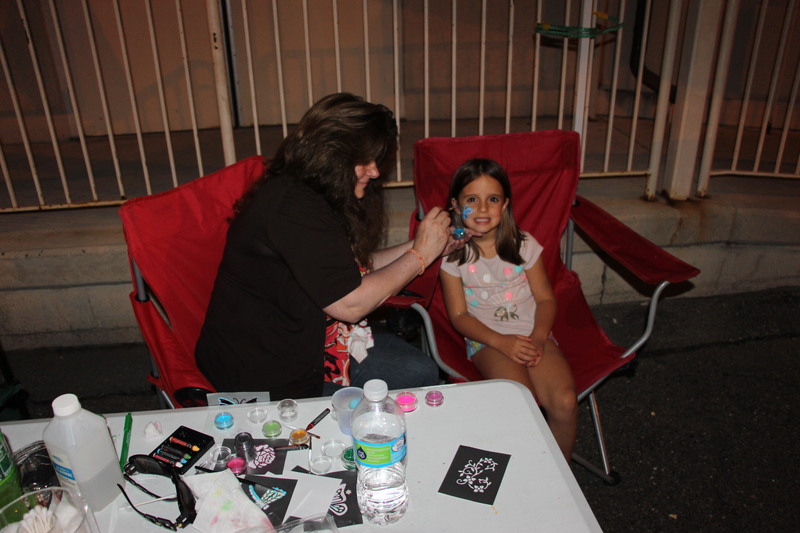 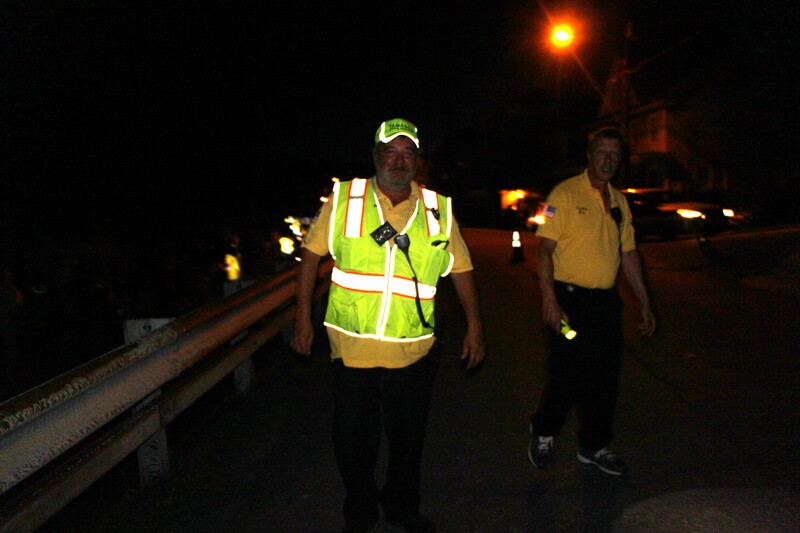 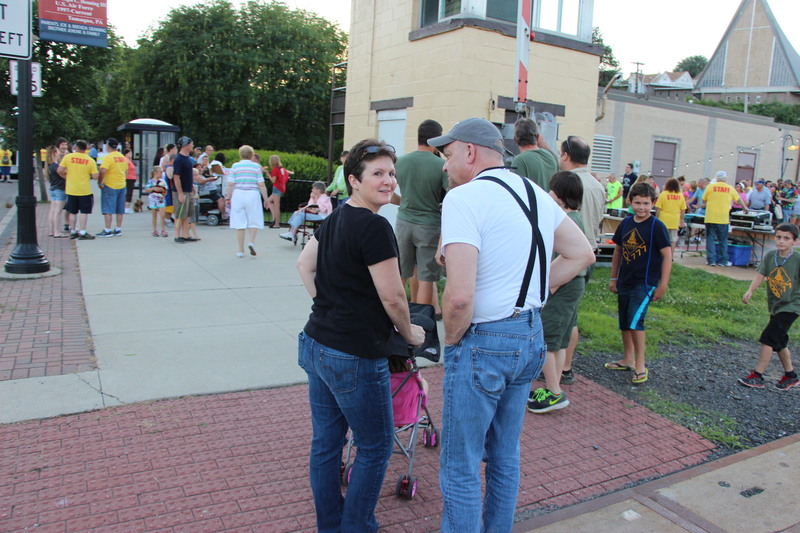 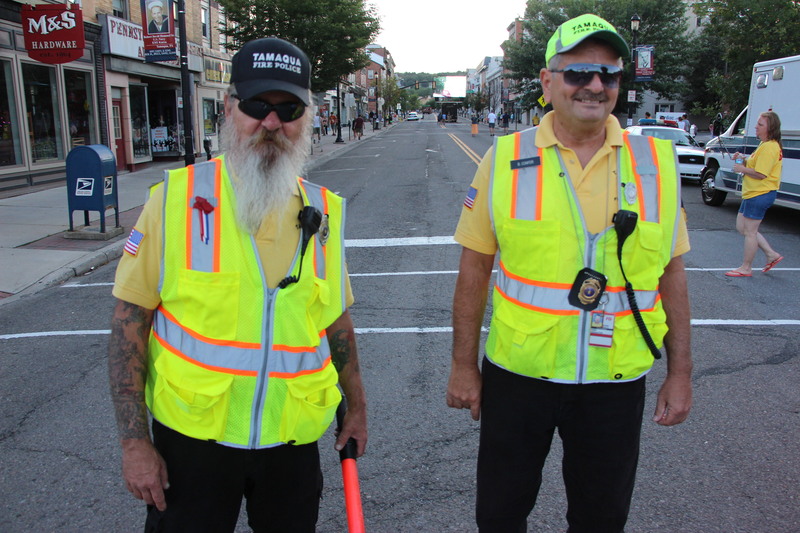 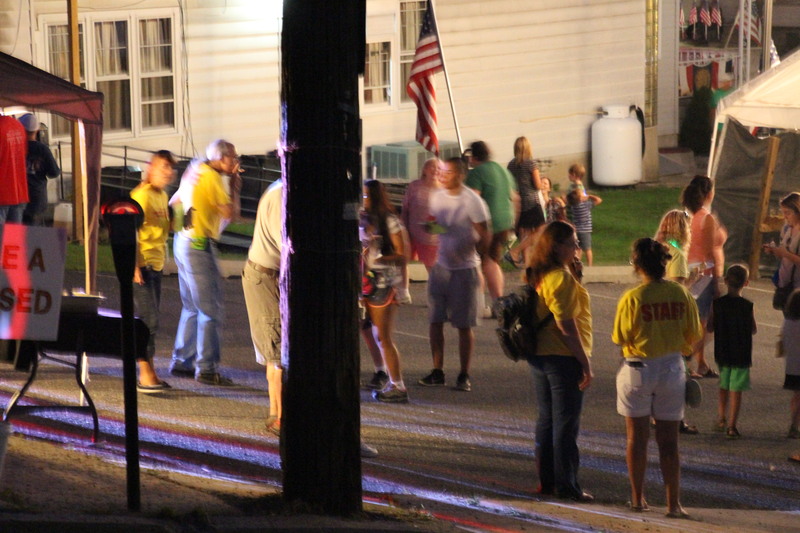 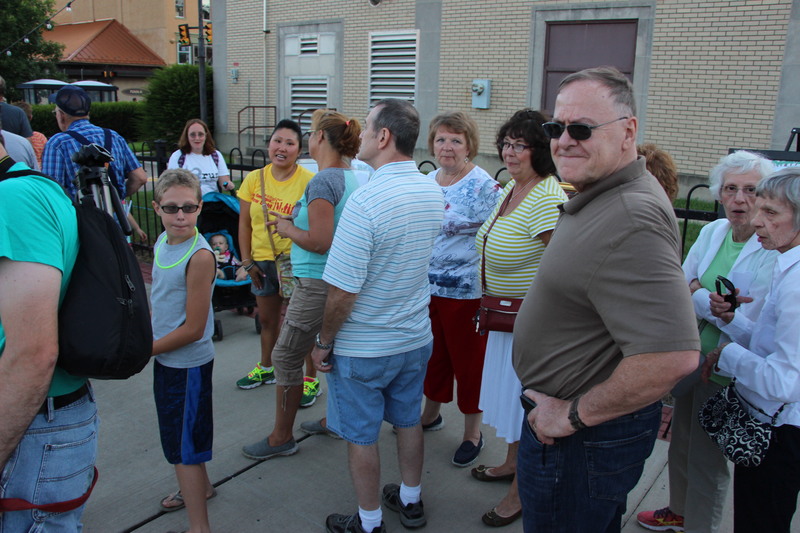 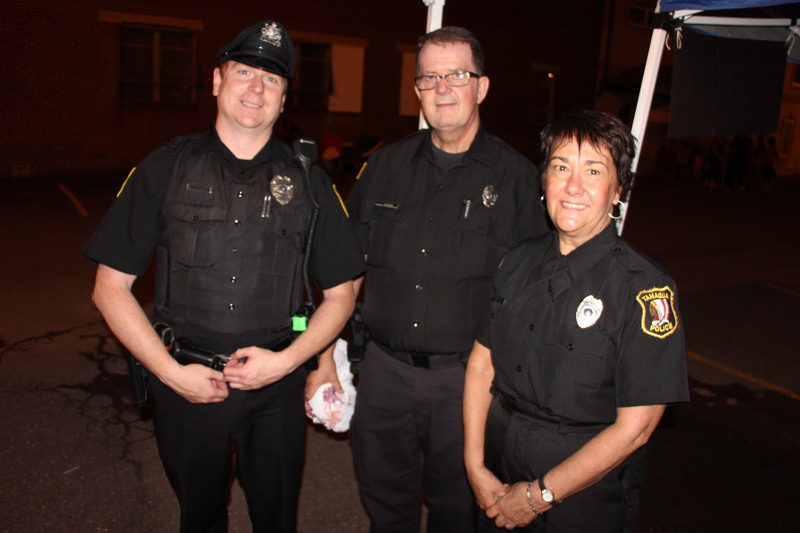 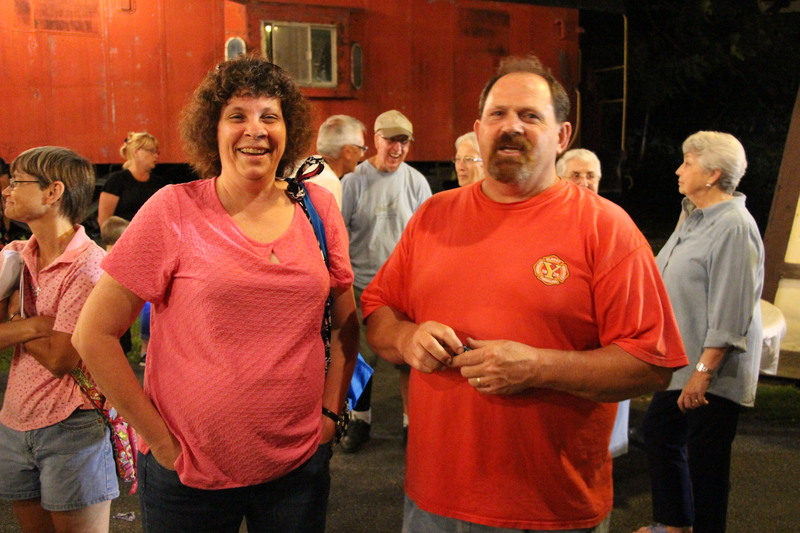 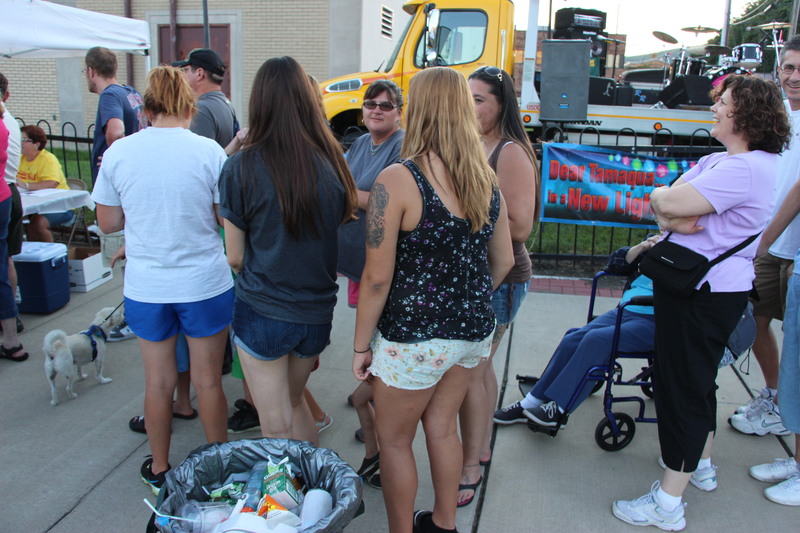 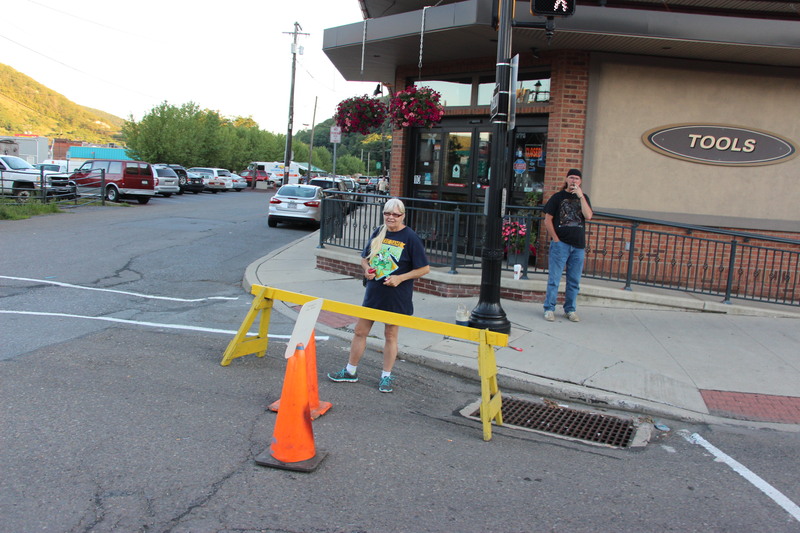 Continuing on, walkers were treated to a mini-block party at the Tamaqua Borough parking lot located next to the Tamaqua American Legion. 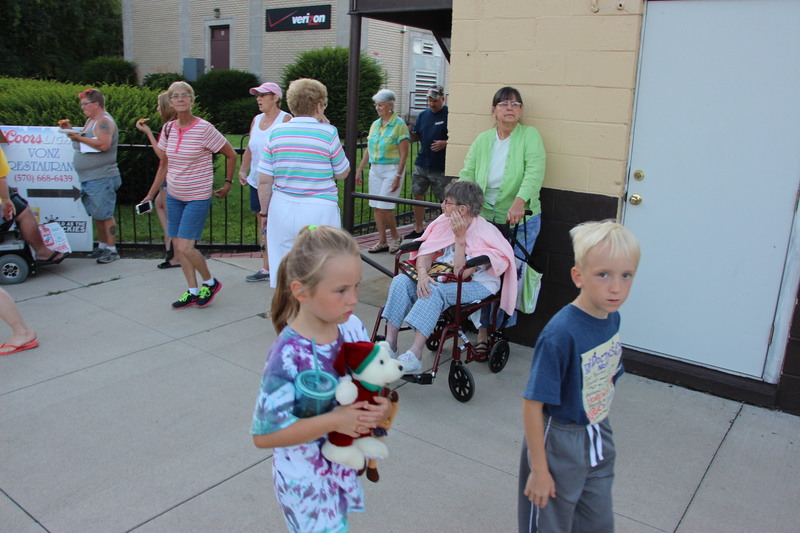 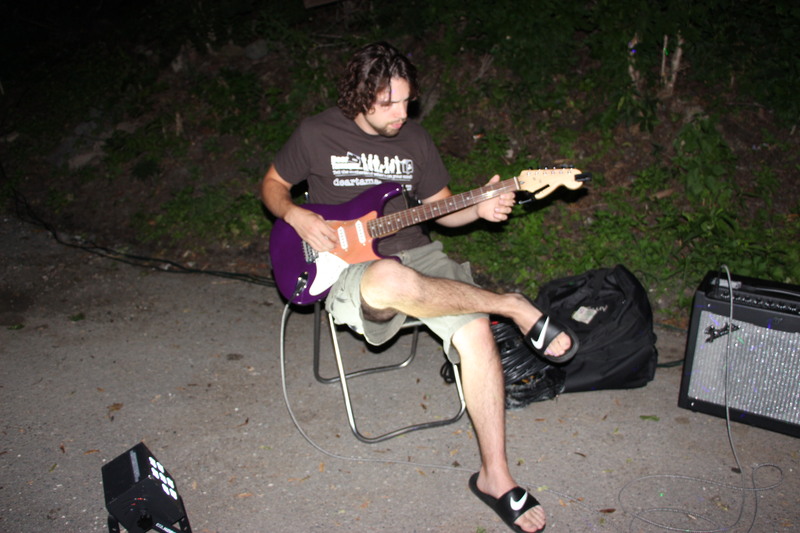 While there, they were treated to music, food, games, presentations, and numerous other activities. 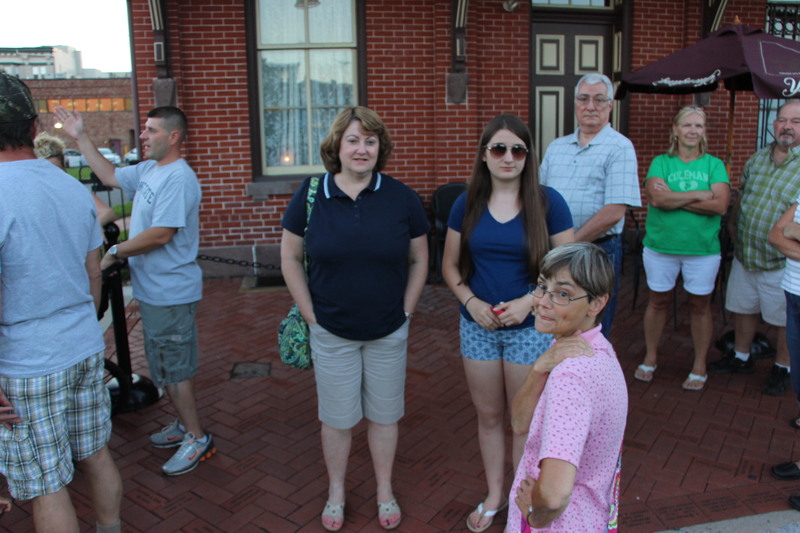 From there, visitors were given horse-drawn or motor trolley rides west on West Broad Street to the intersection of Swatara and West Broad Street. 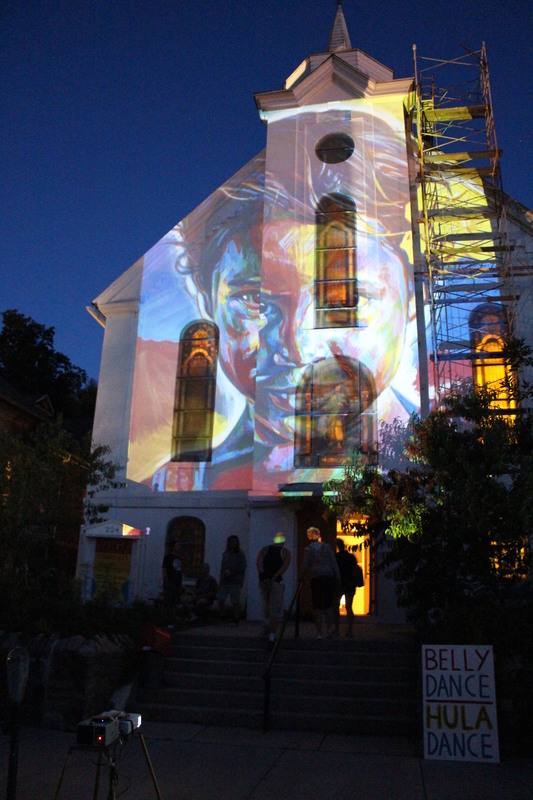 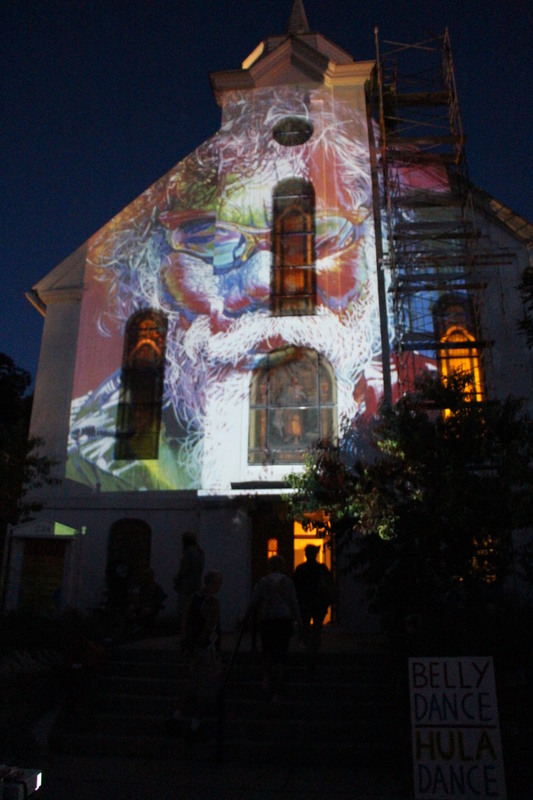 On there way there, they could see a giant color mural reflected onto the old First Presbyterian Church. 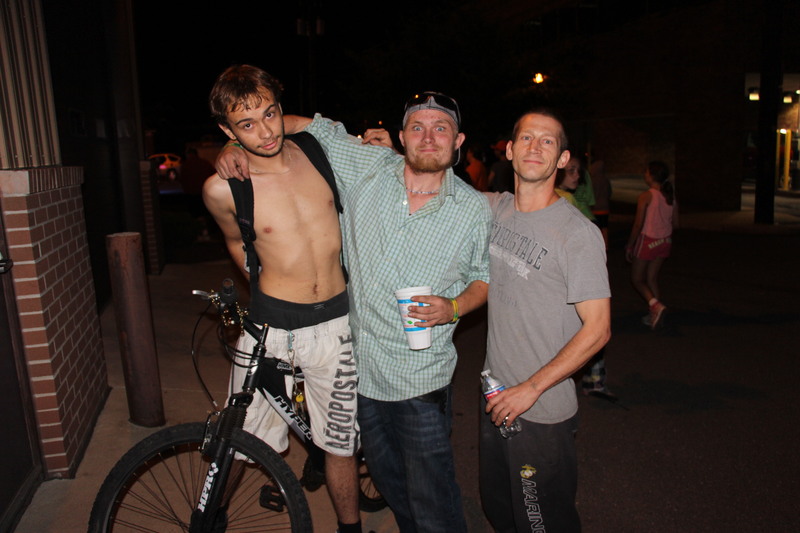 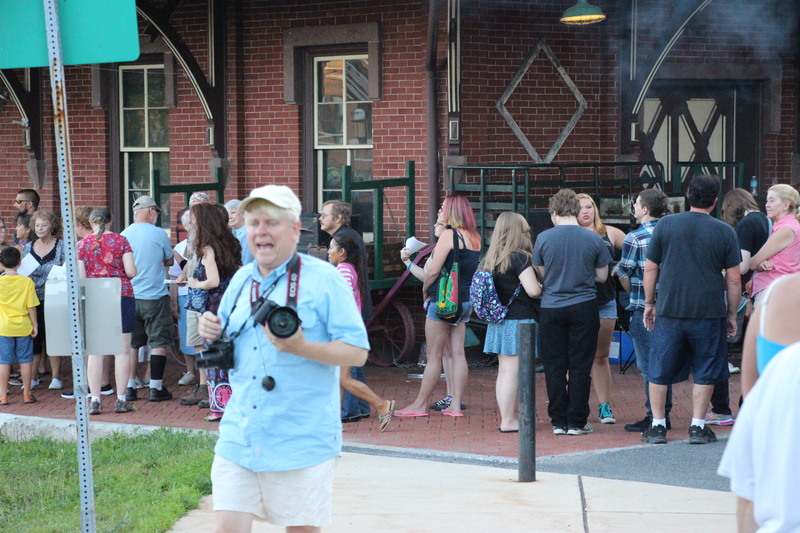 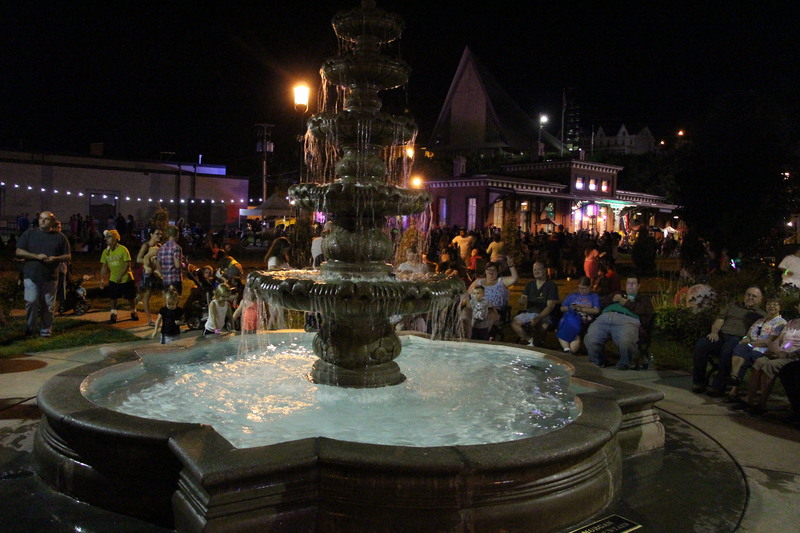 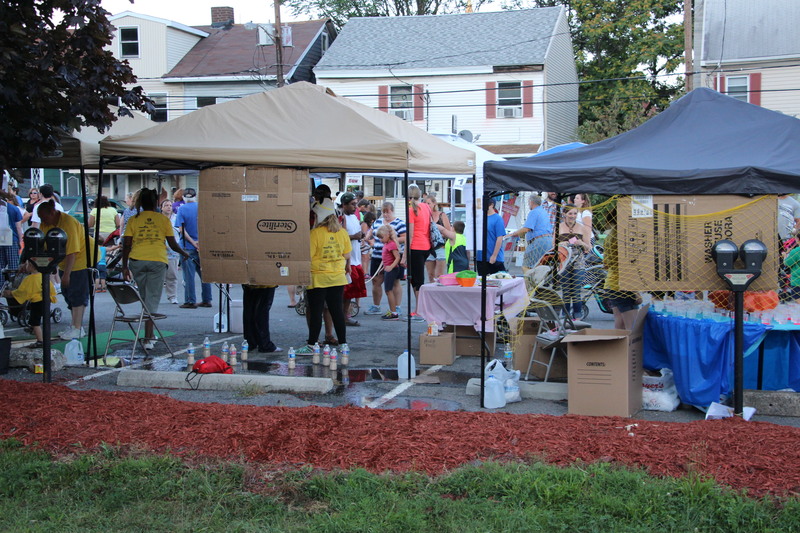 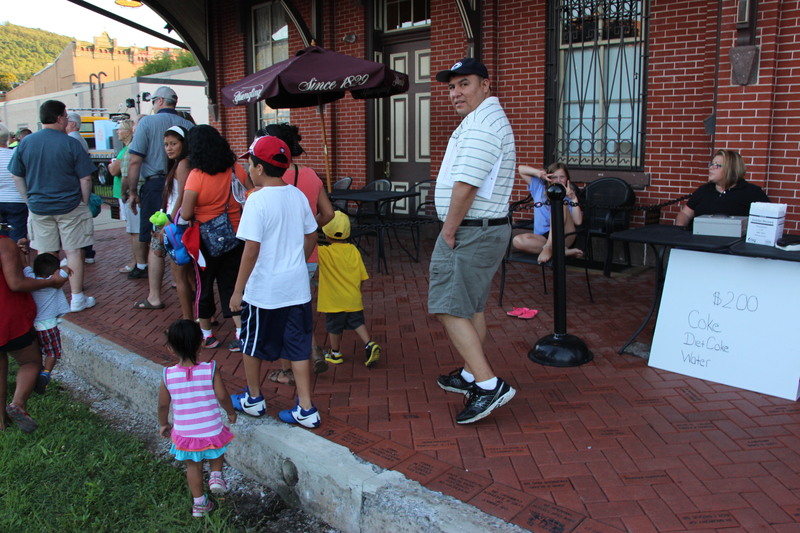 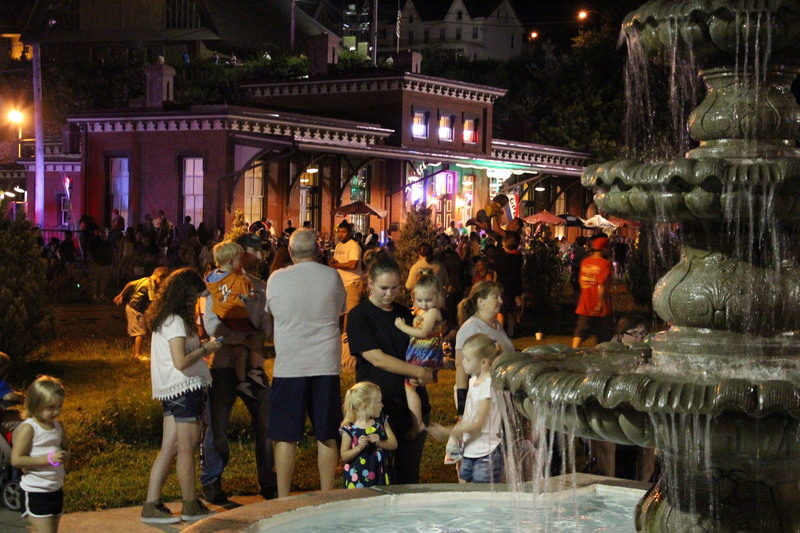 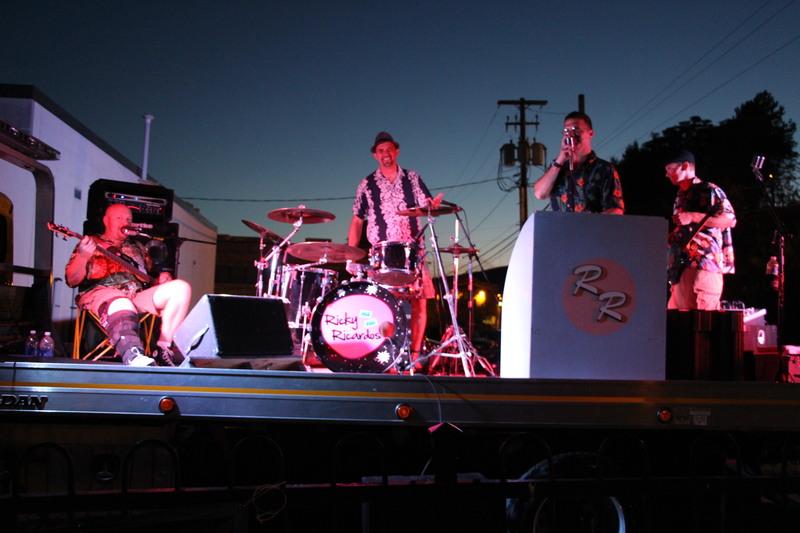 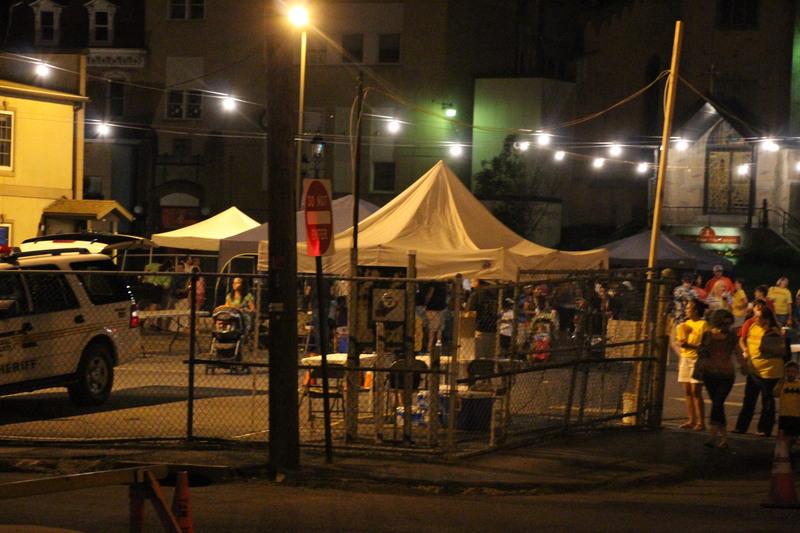 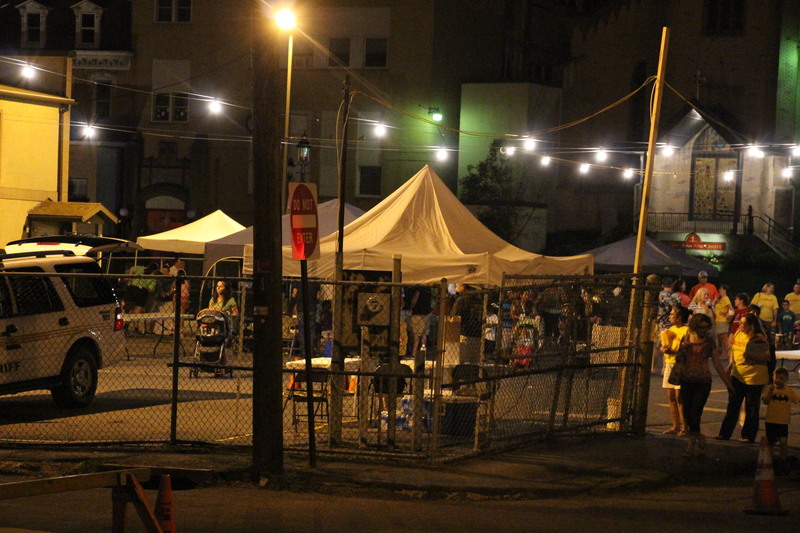 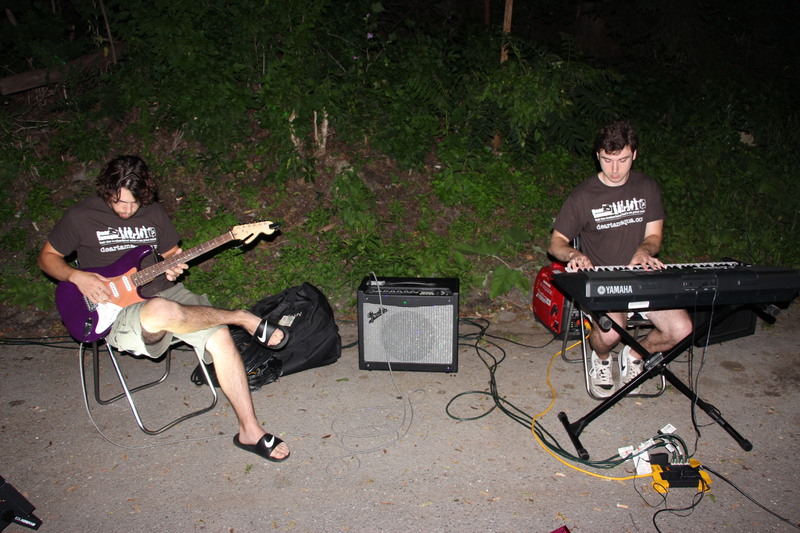 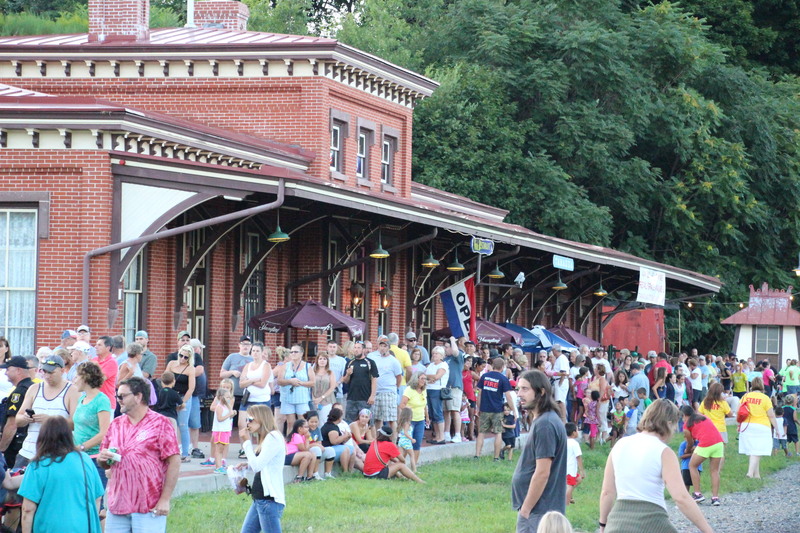 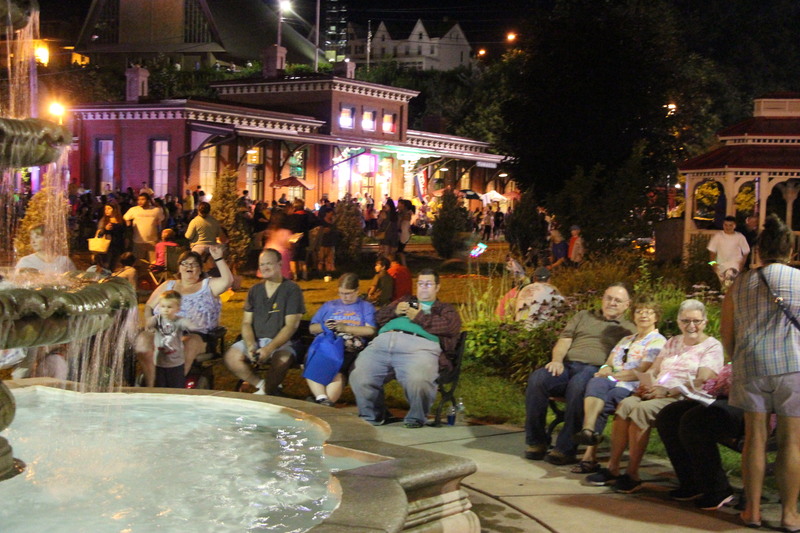 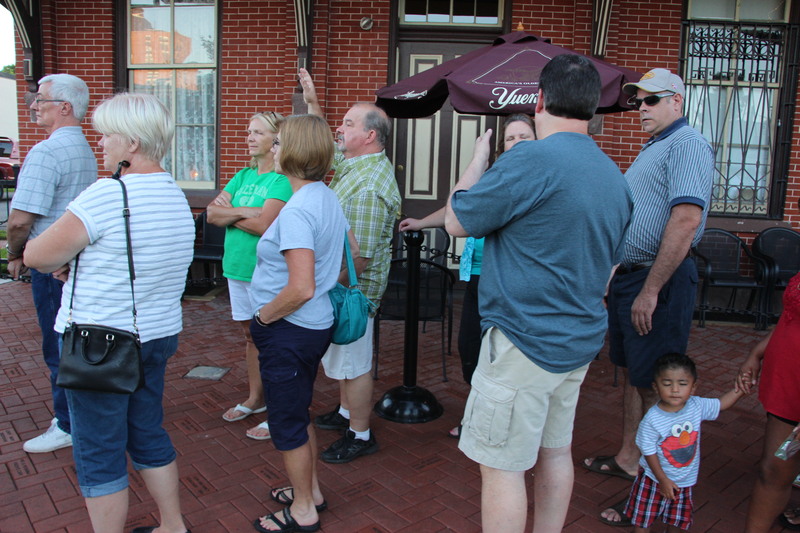 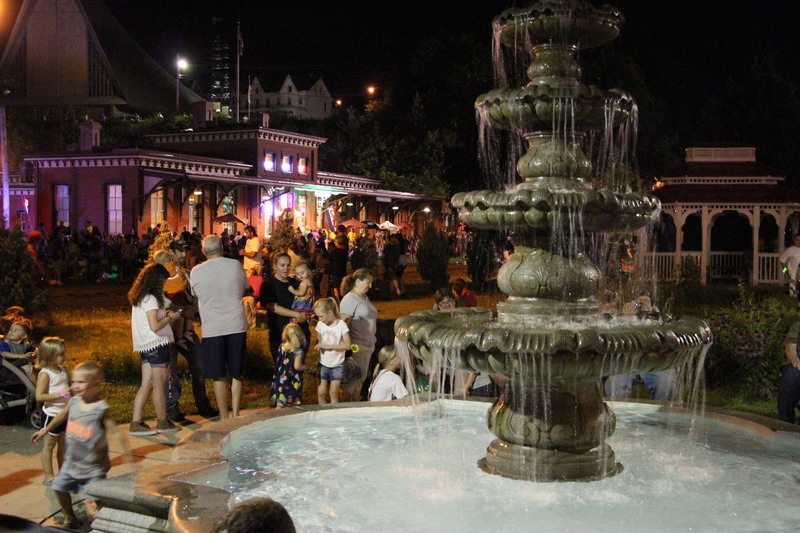 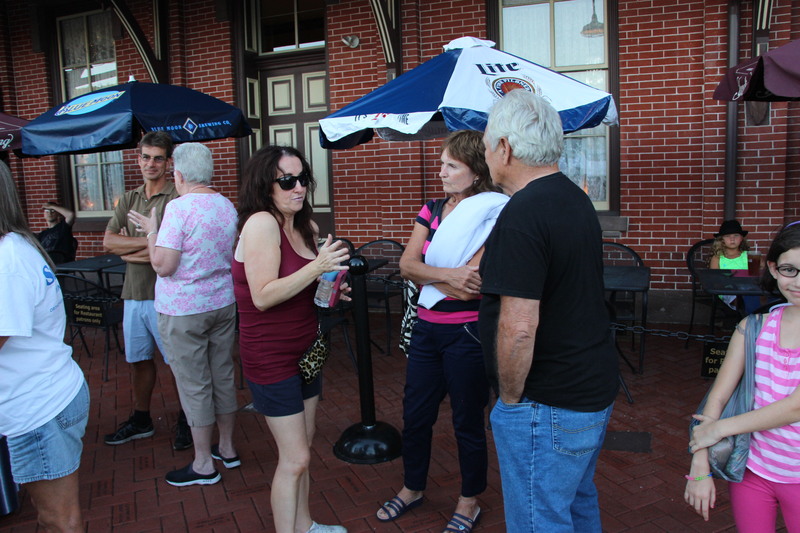 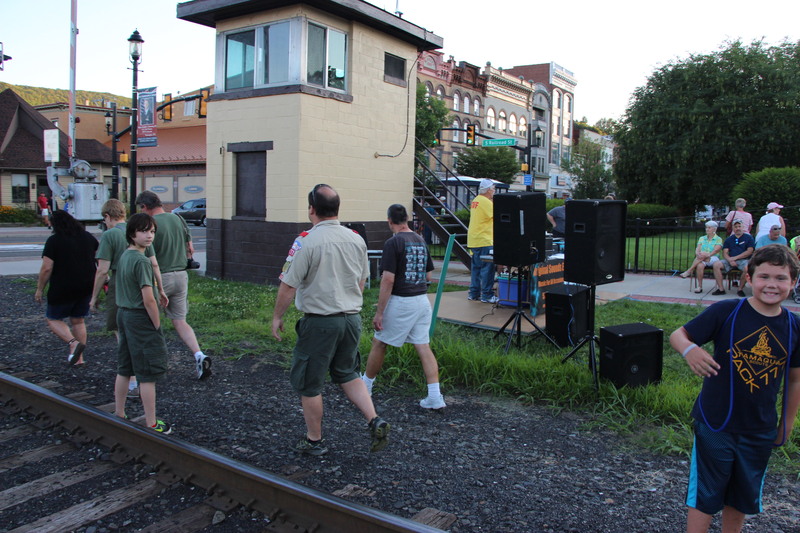 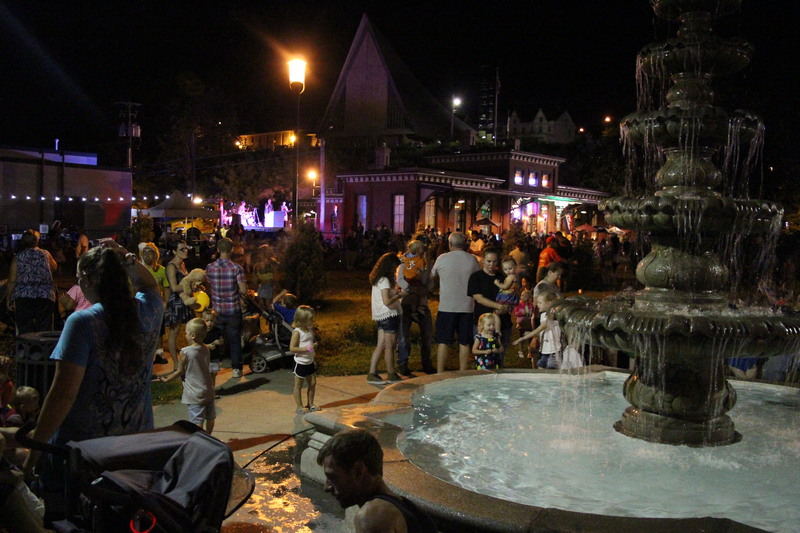 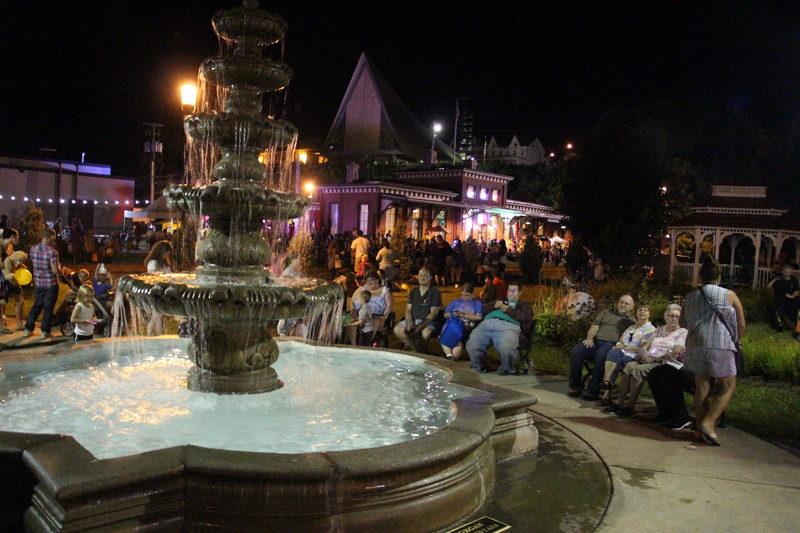 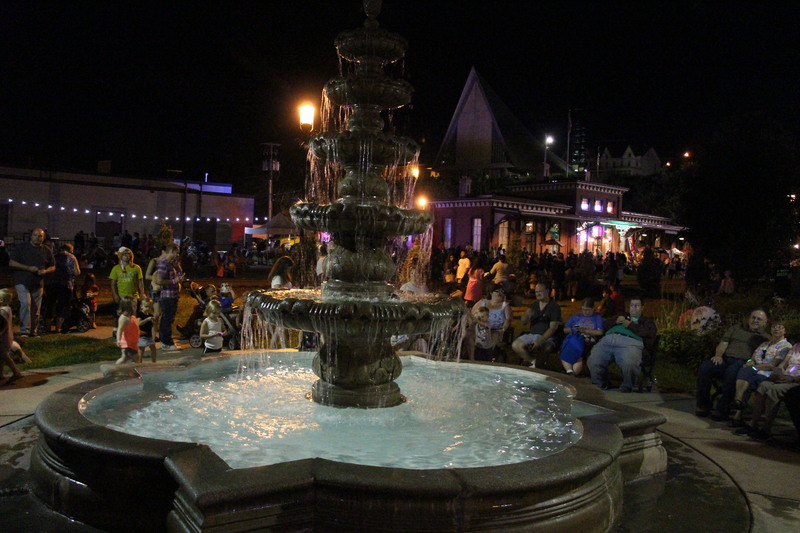 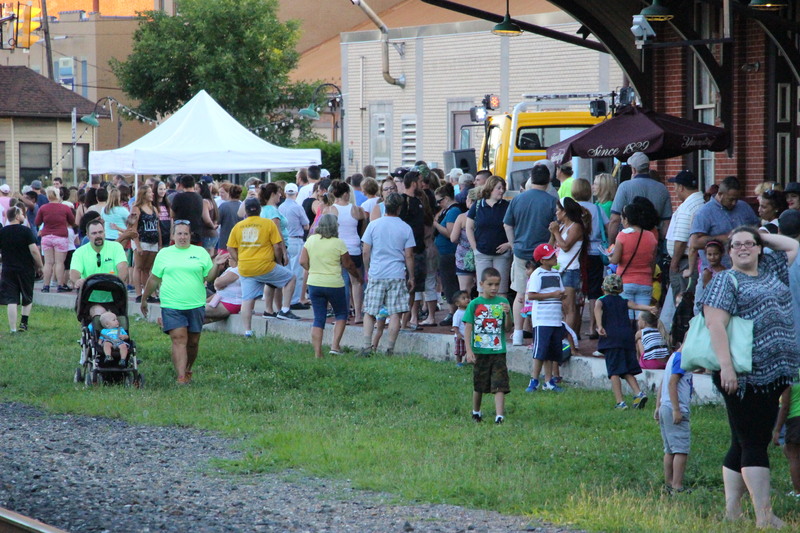 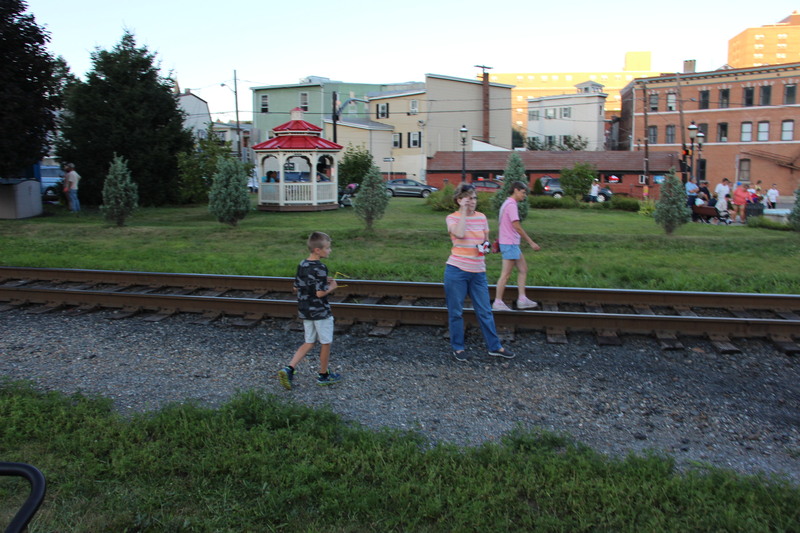 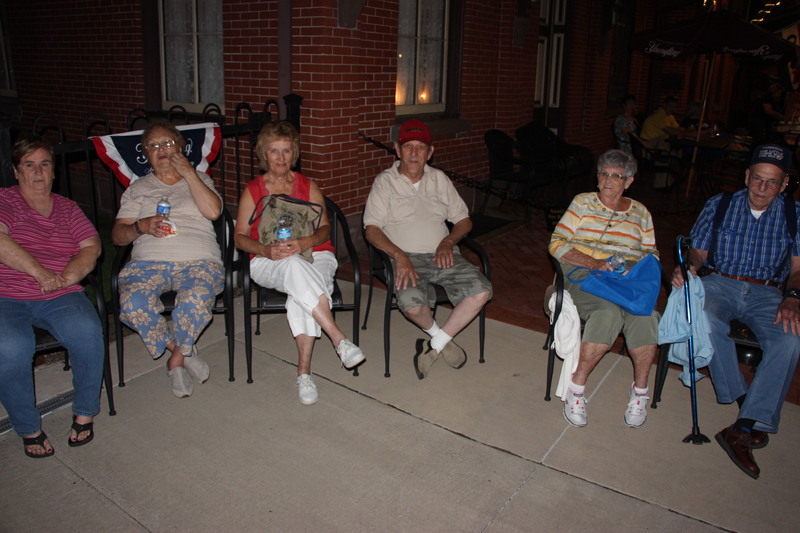 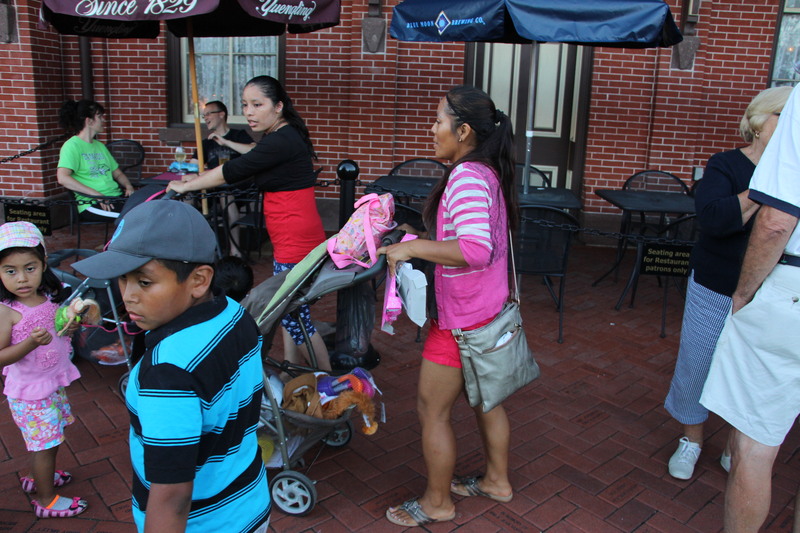 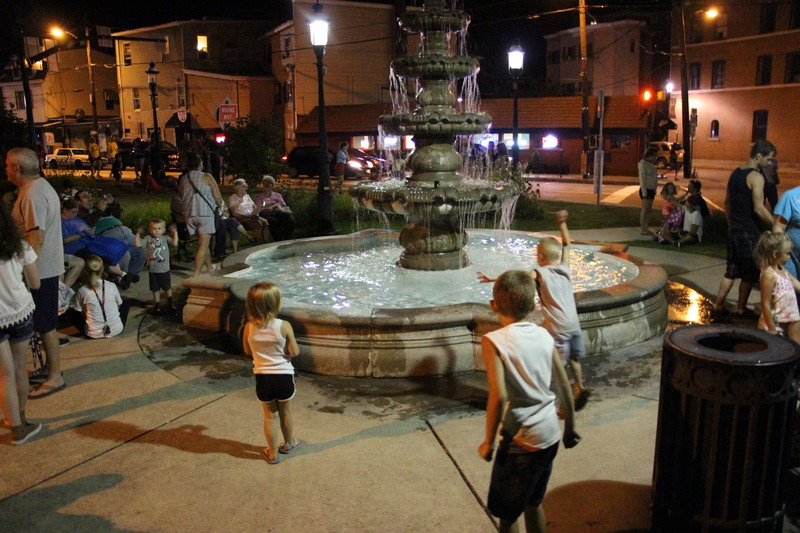 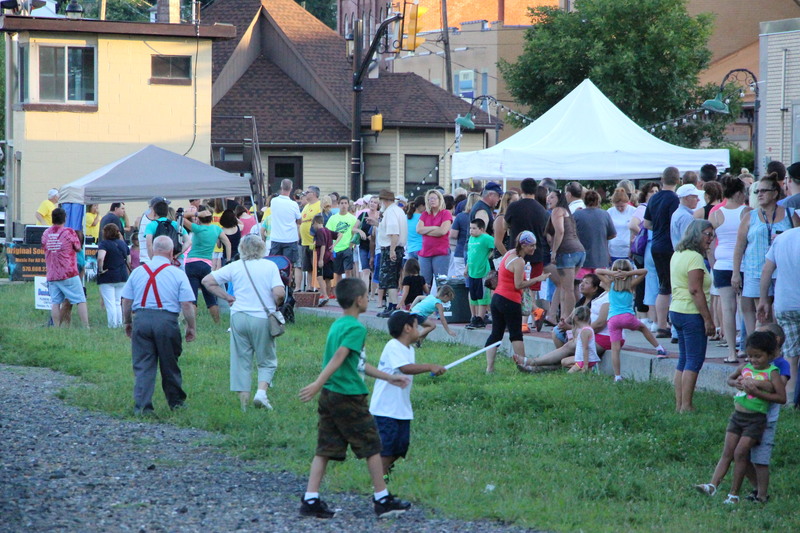 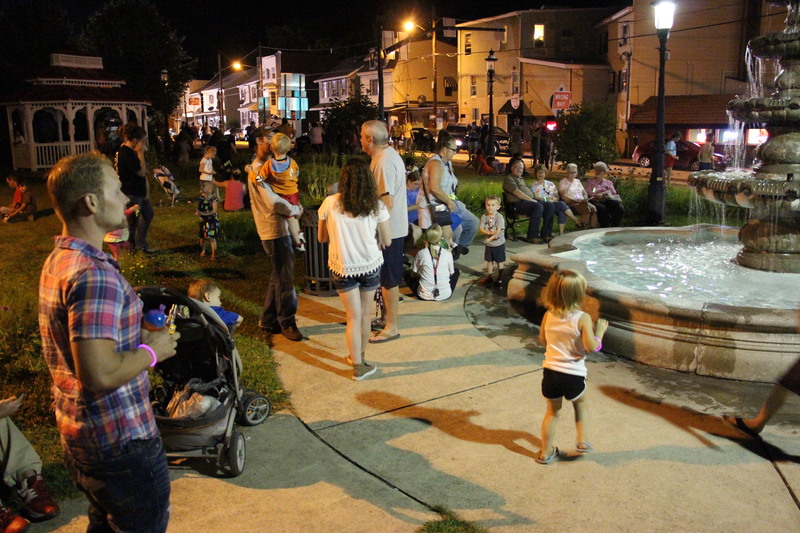 Just north of the Swatara Street intersection, visitors enjoyed entertainment consisting of various music, cheers and dancing groups. 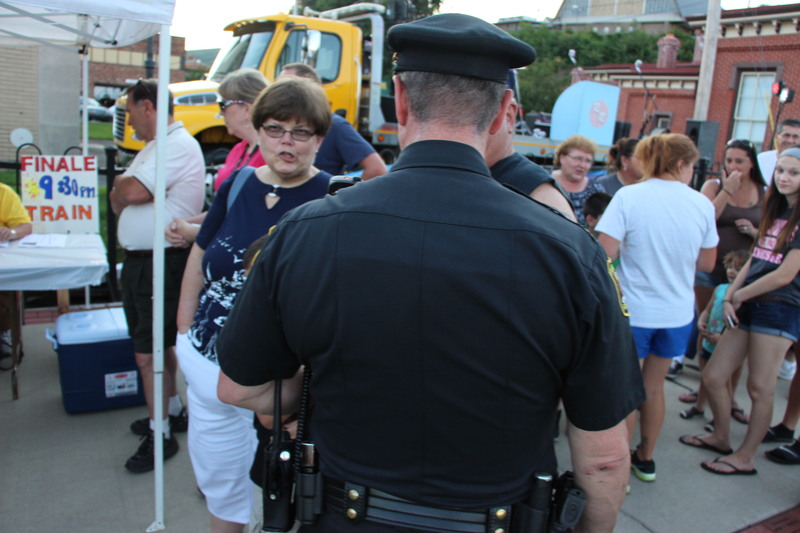 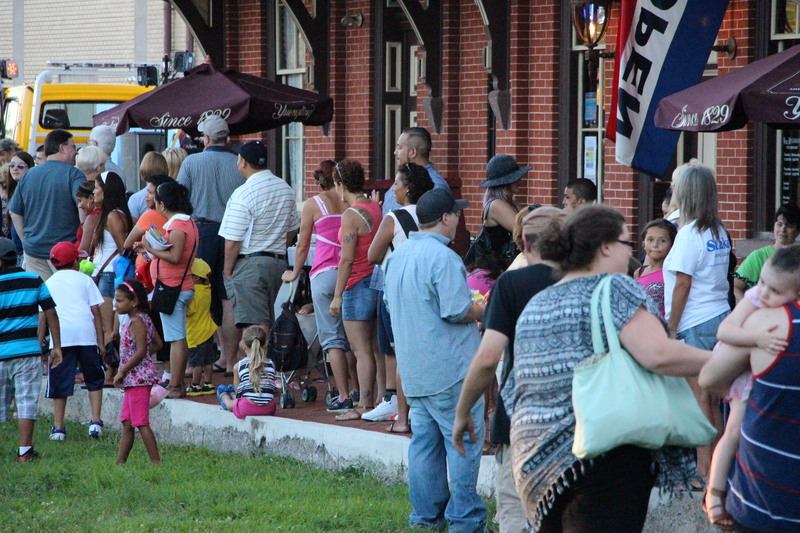 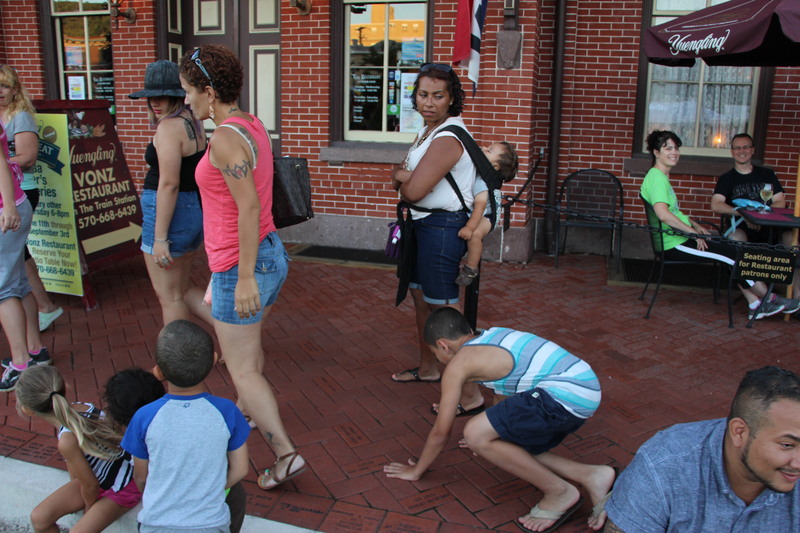 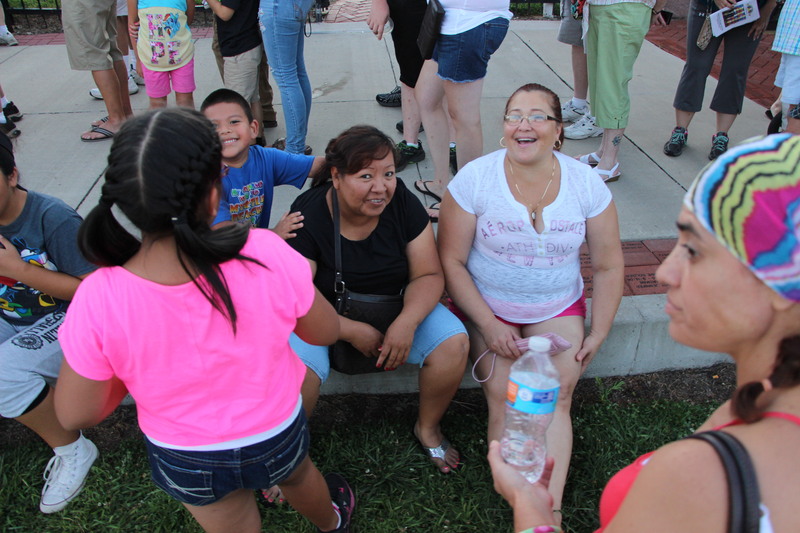 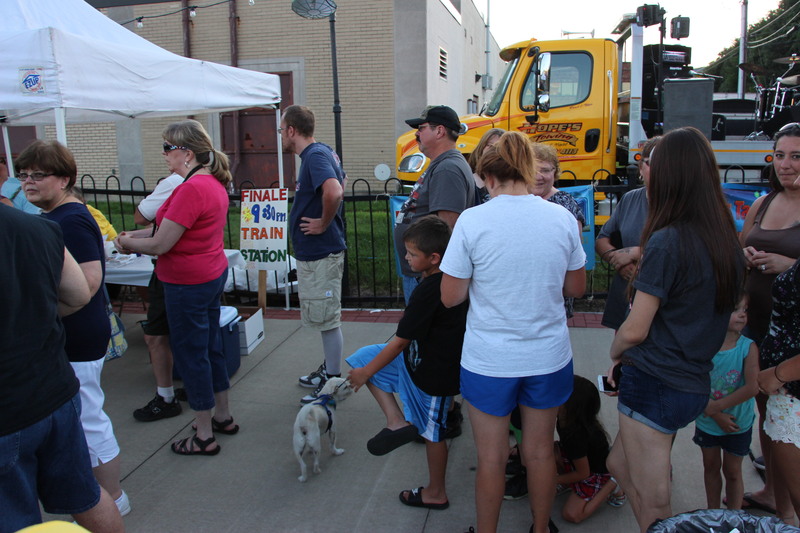 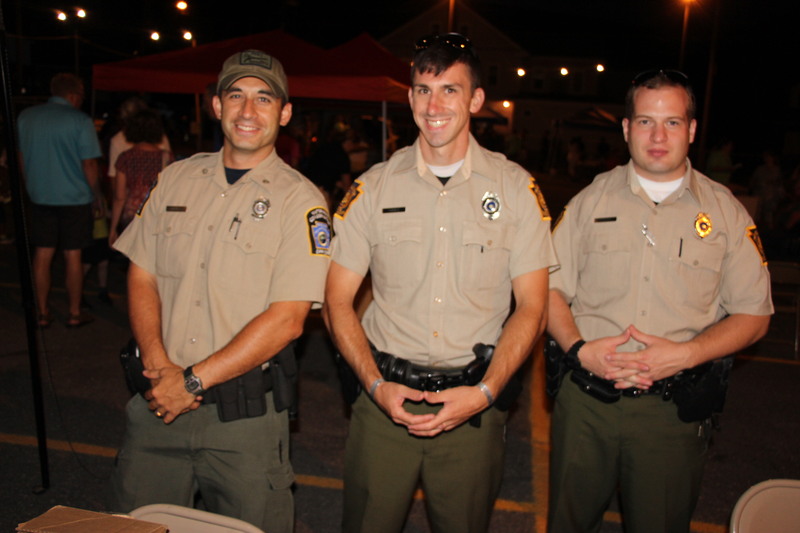 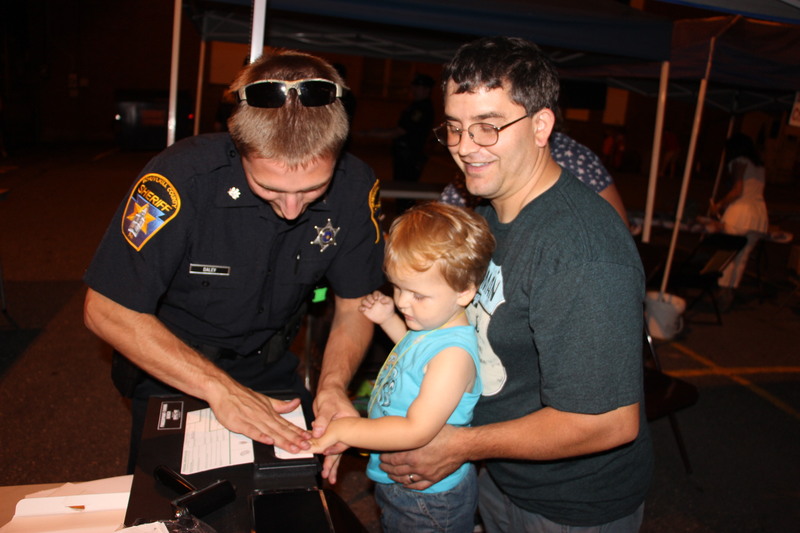 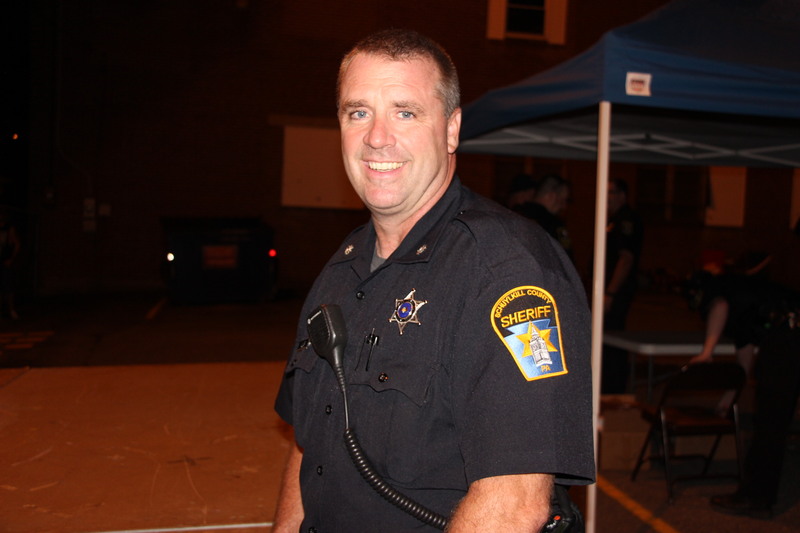 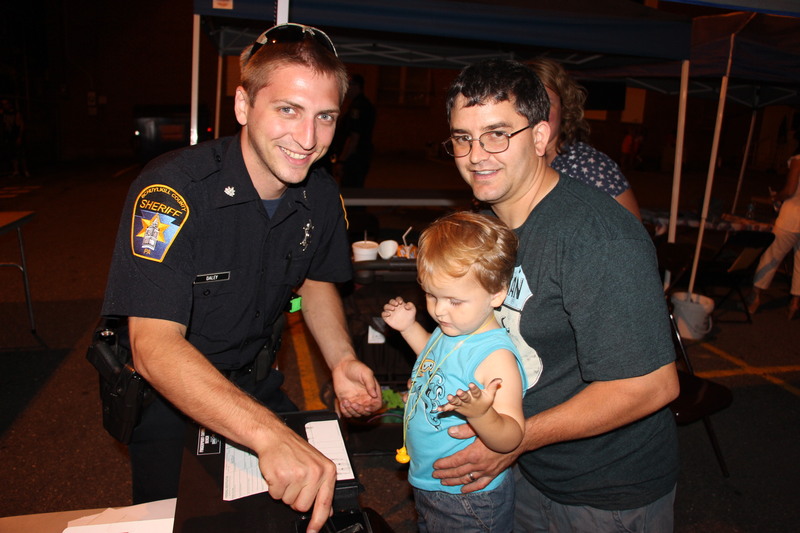 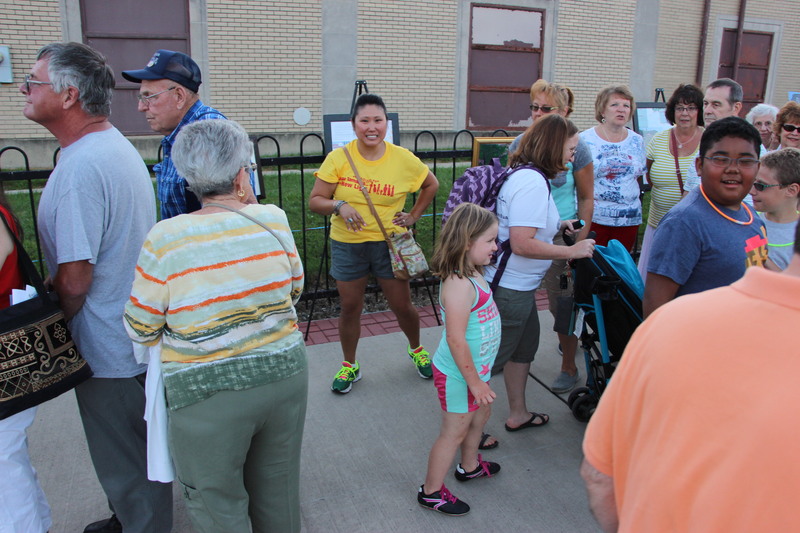 Continuing the walk, visitors were treated to another mini community block party, consisting of food, music, activities, educational booths and other items related to the National Night Out. 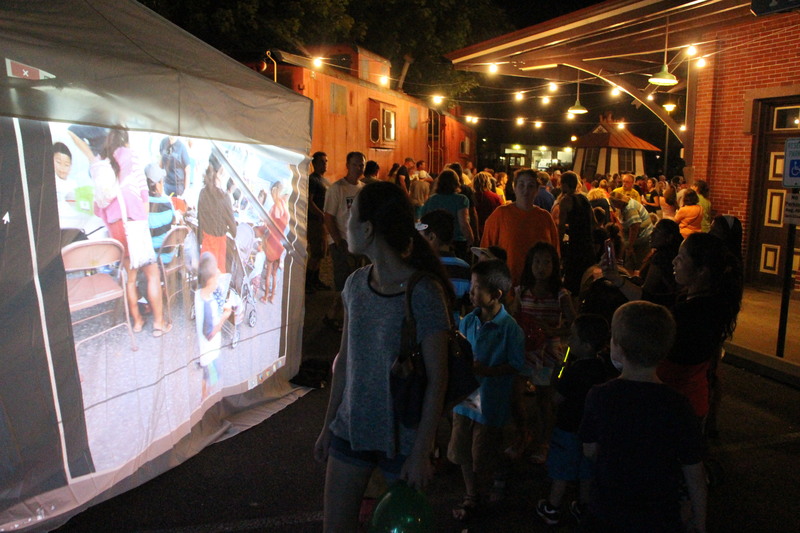 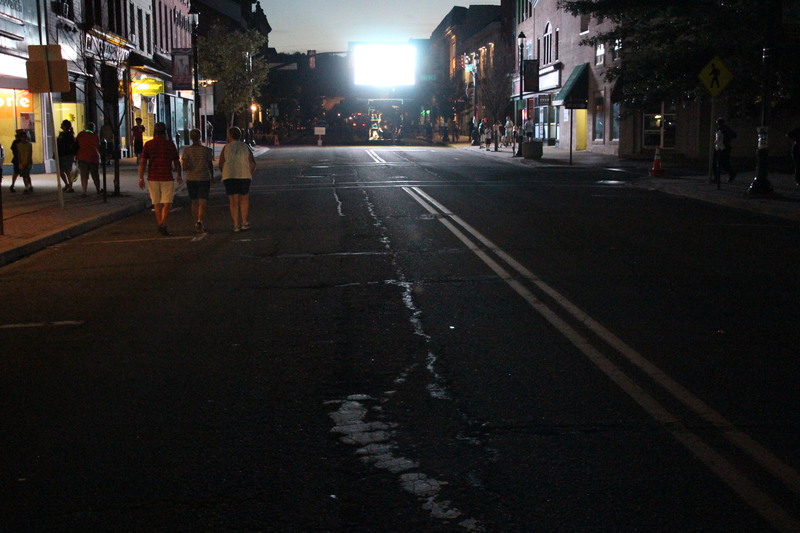 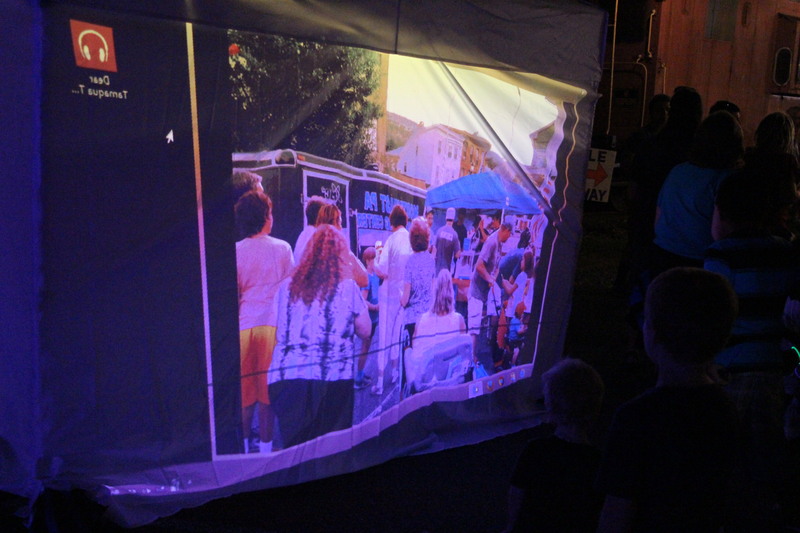 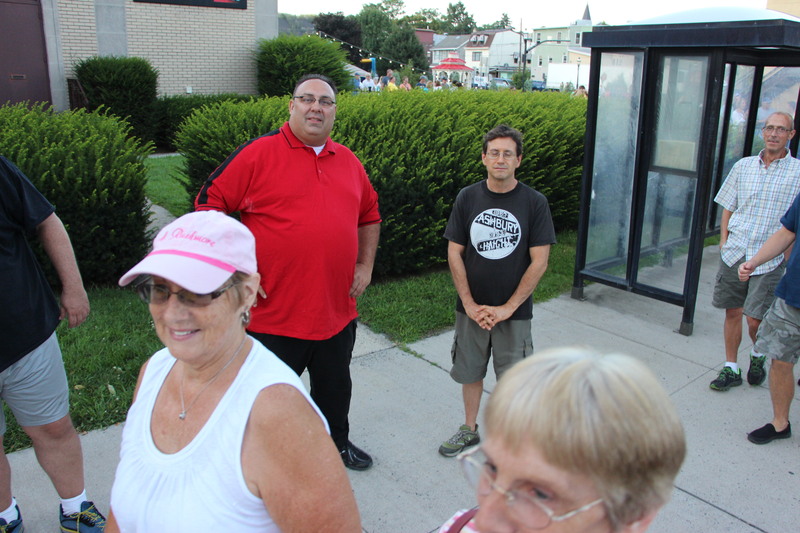 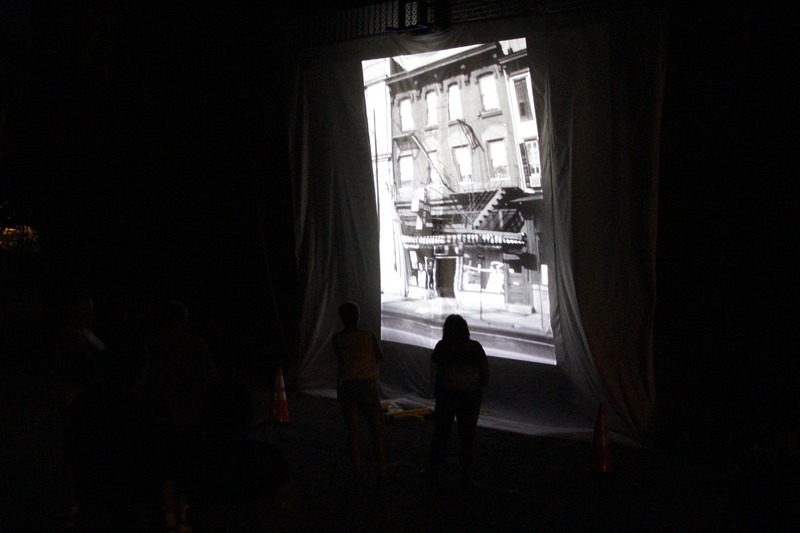 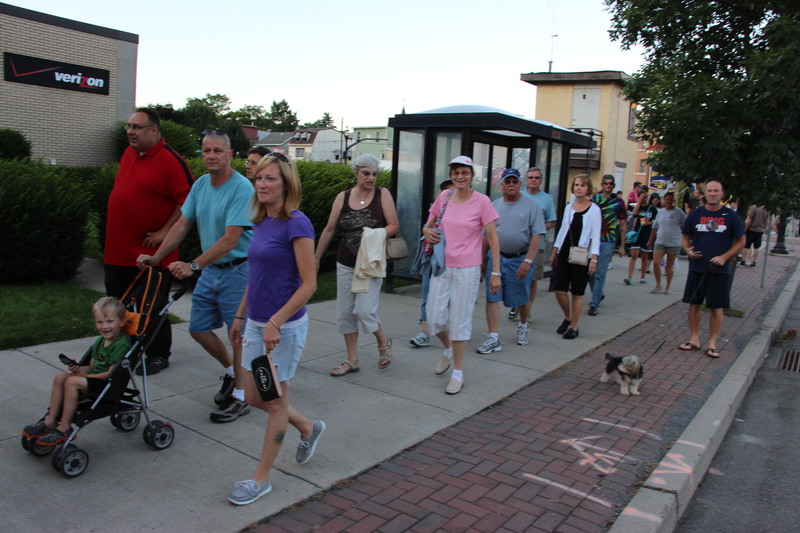 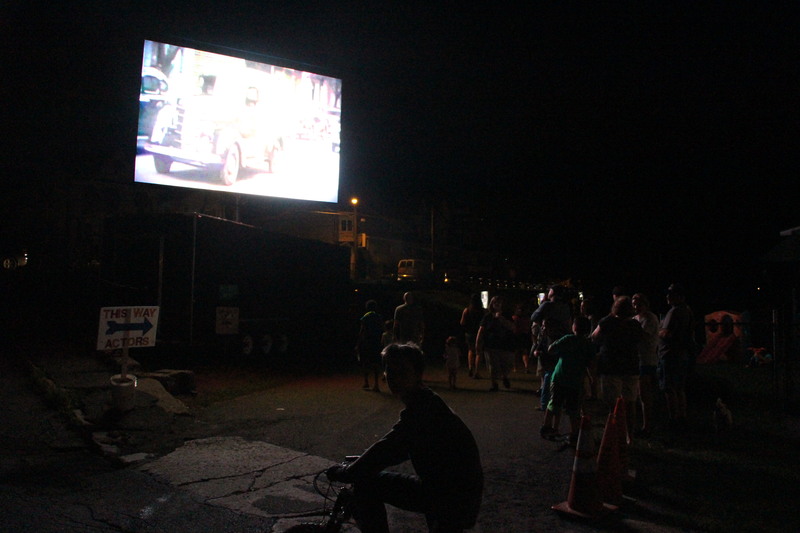 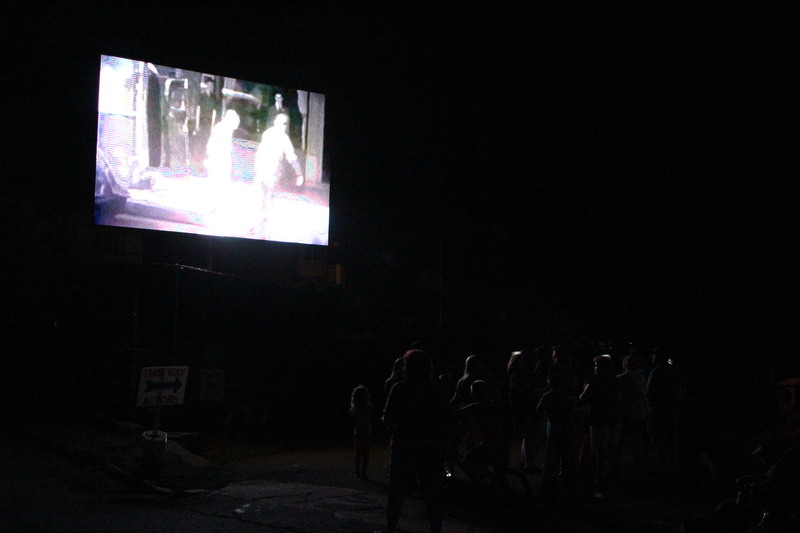 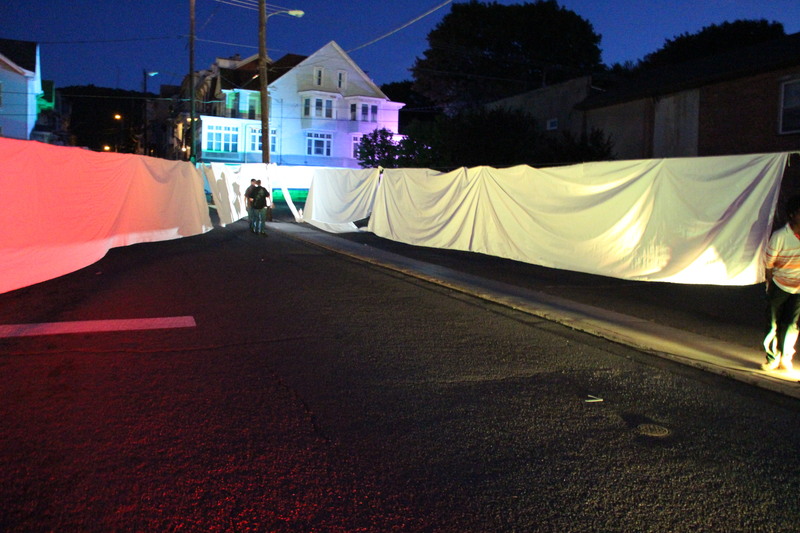 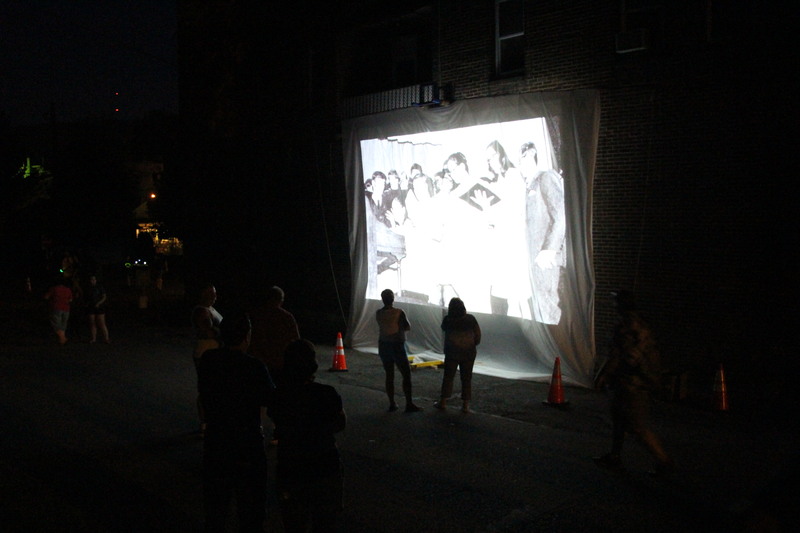 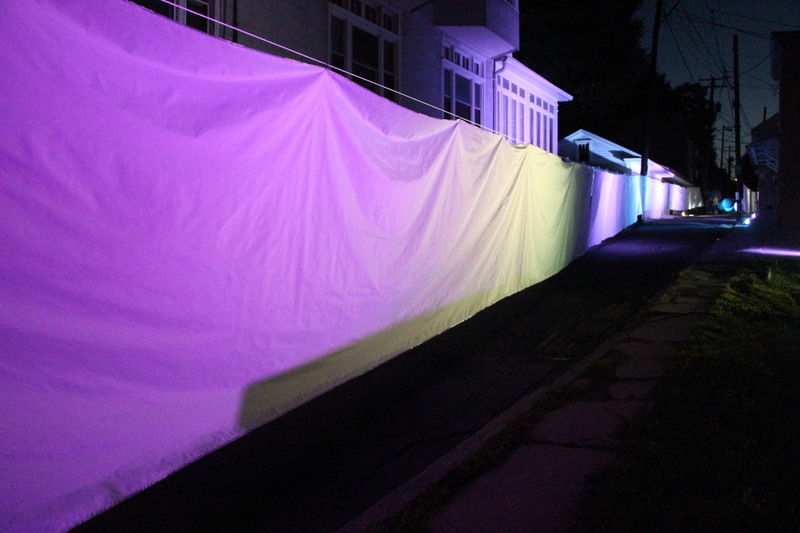 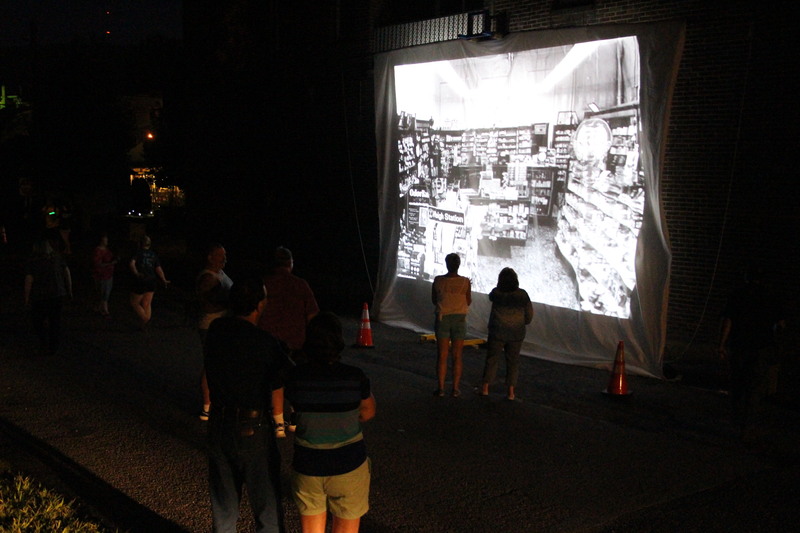 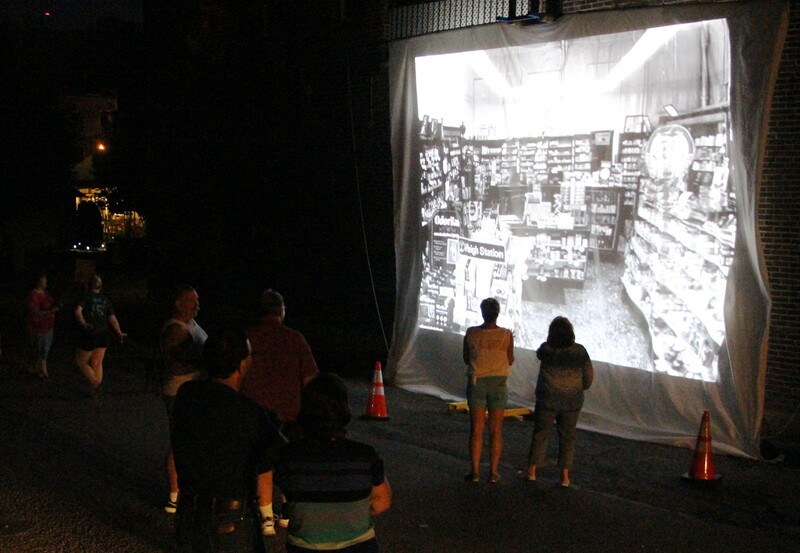 From there, visitors traveled along Swatara Street onto Hegarty Avenue where another jumbo screen showed them videos and photos from the past. 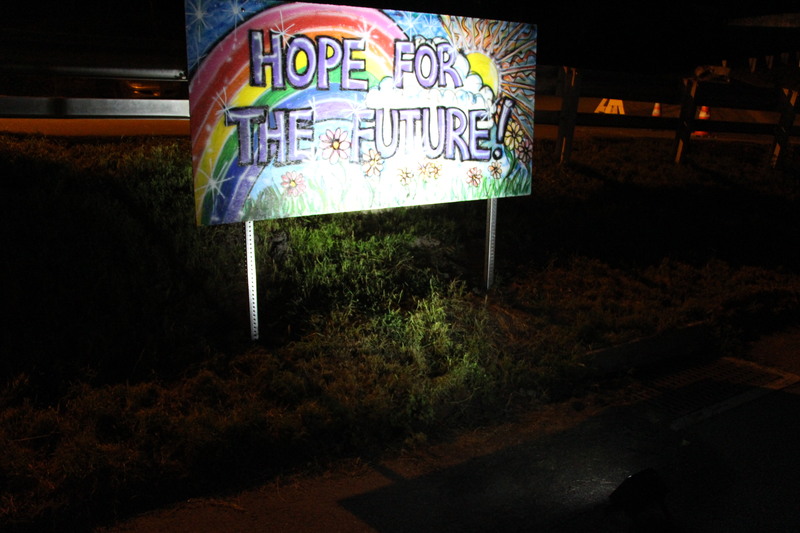 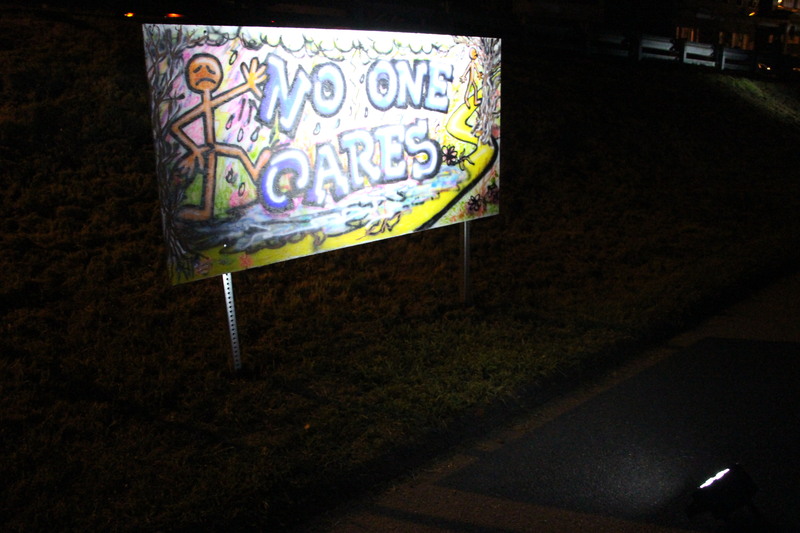 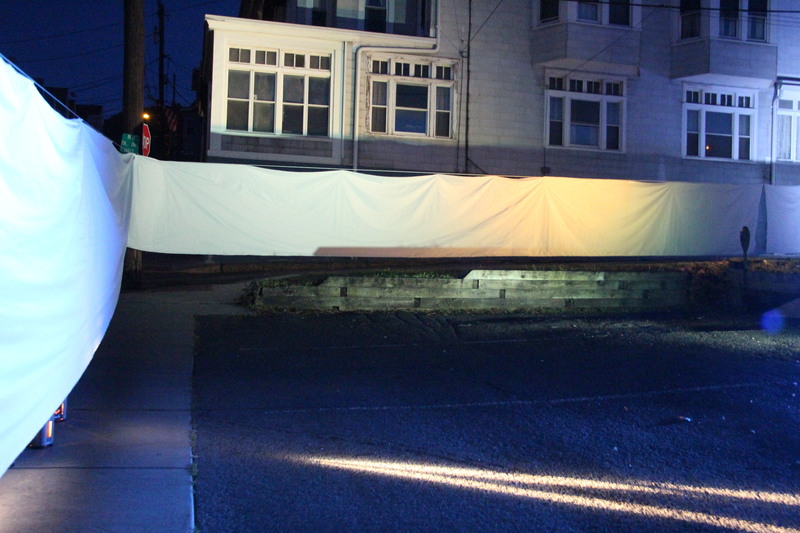 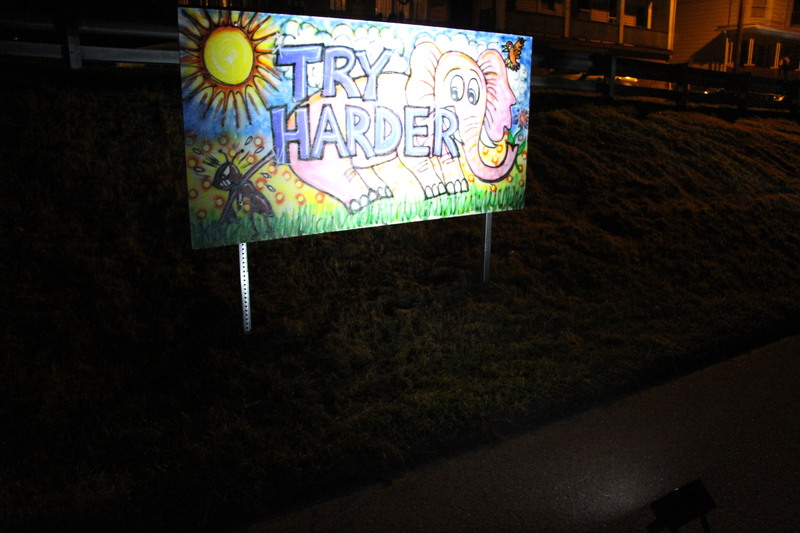 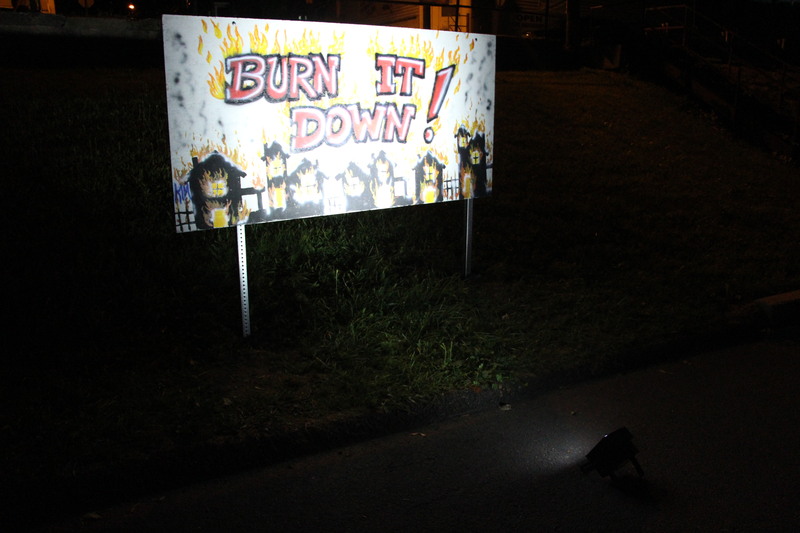 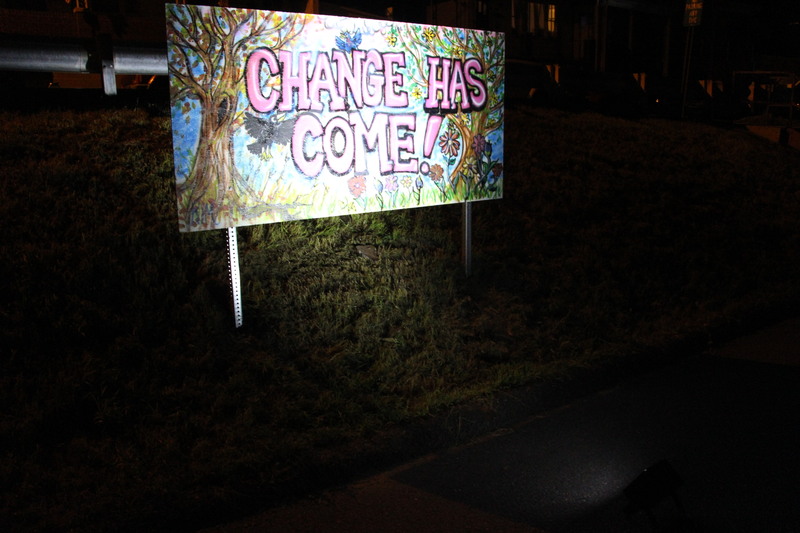 Hegarty Avenue also included various artworks drawn onto large boards. 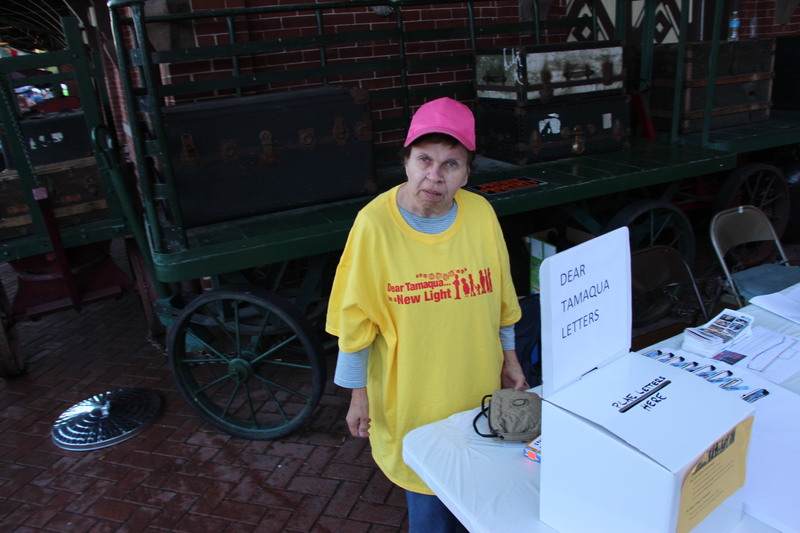 These images were from the 600 submitted ‘Dear Tamaqua’ letters. 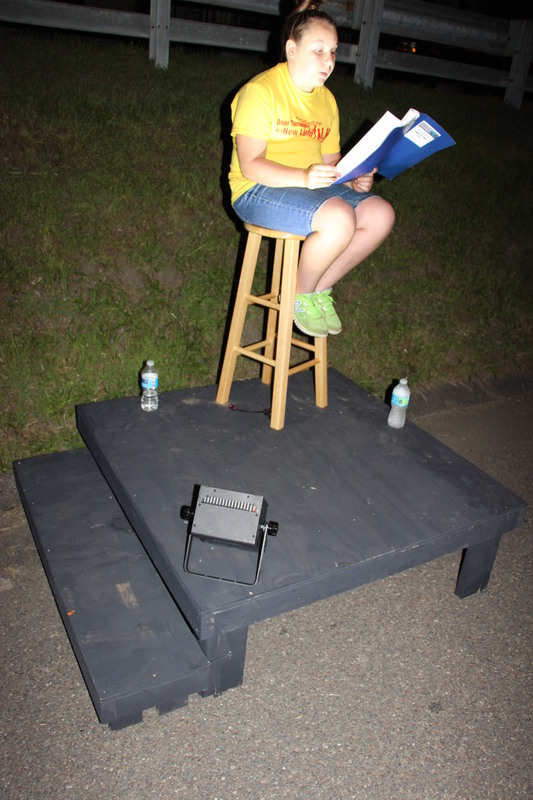 As they continued east on Hegarty Avenue, numerous actors and actresses (on on their own mini-stage) read aloud some of those letters. 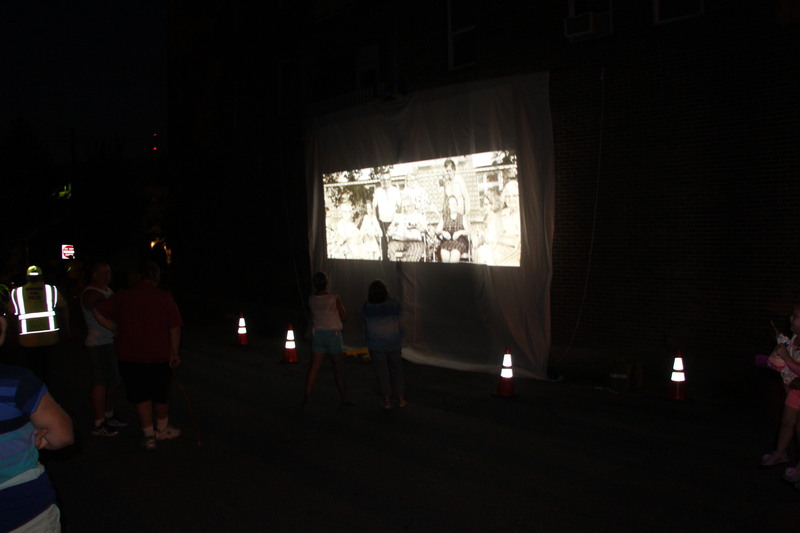 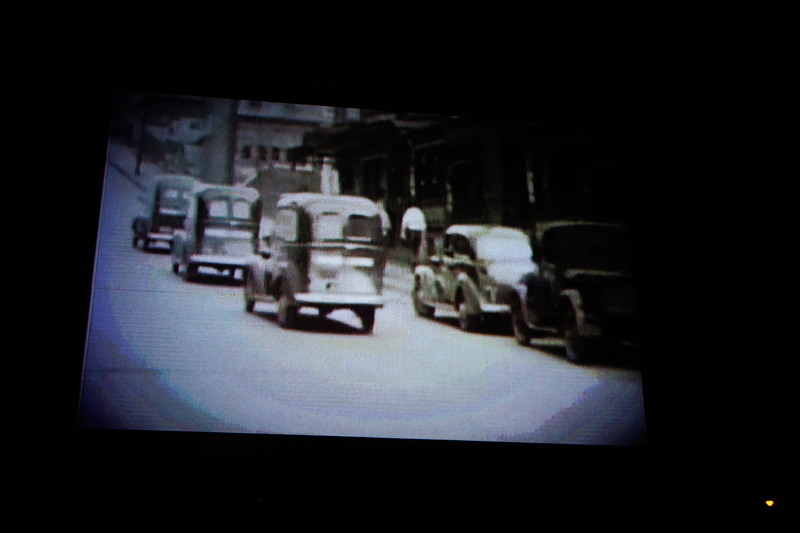 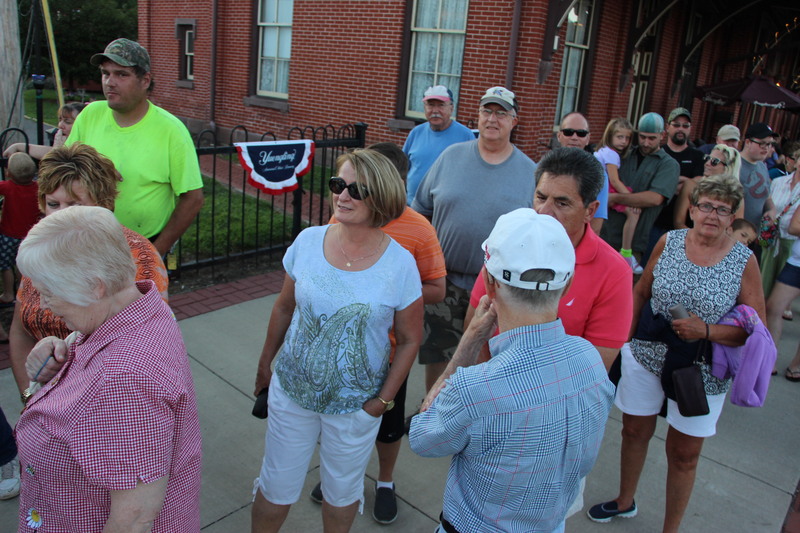 At the intersection of Berwick Street, visitors were, yet again, treated to another jumbo screen showing more photos and videos from Tamaqua’s past. 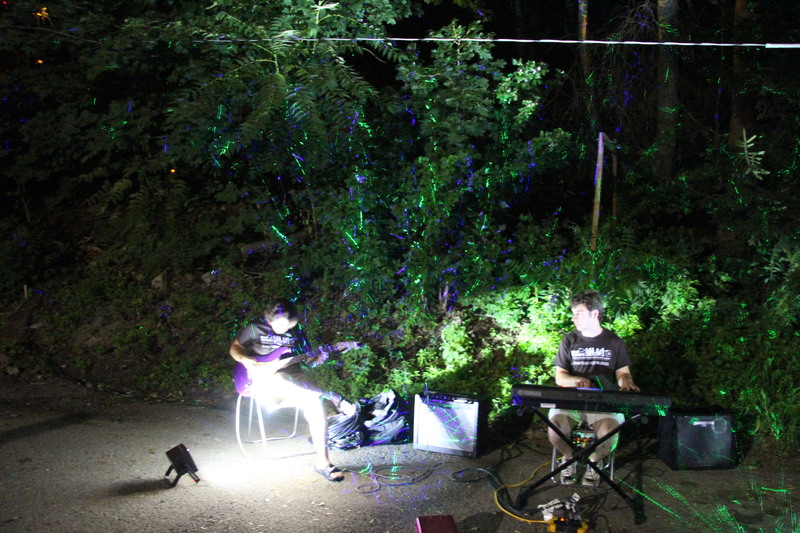 From there, visitor continued east on Berwick Street, passing musicians and laser lights. 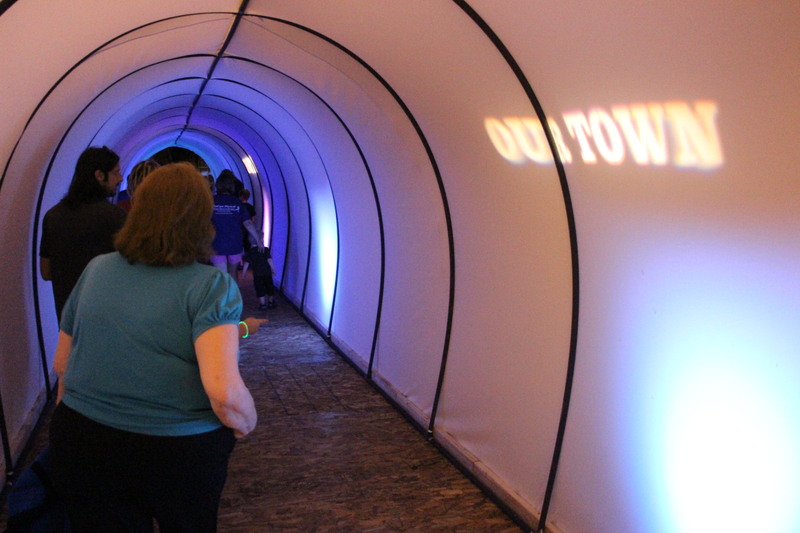 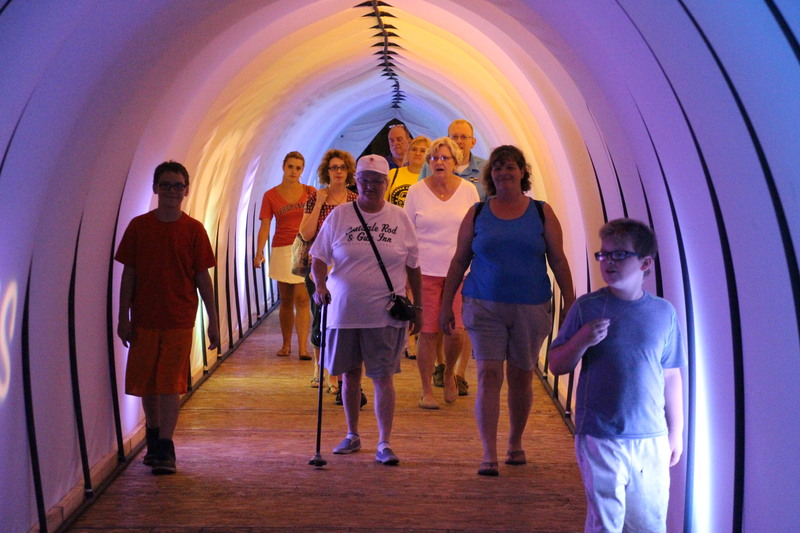 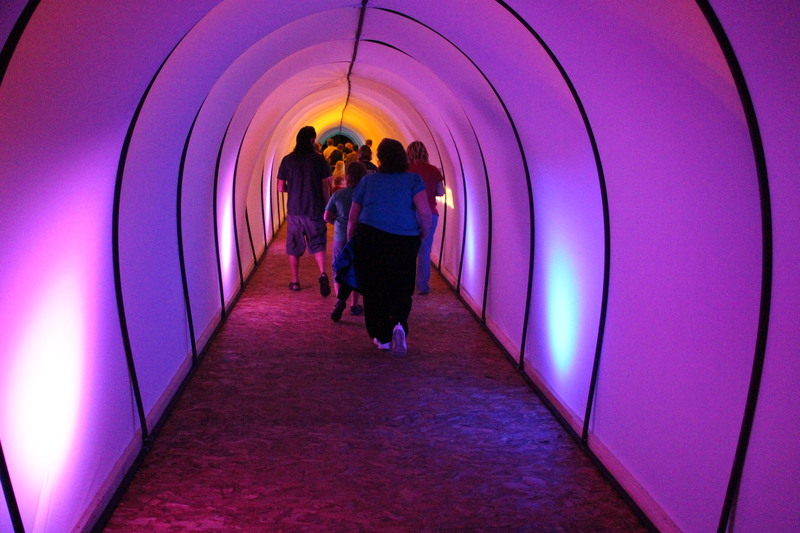 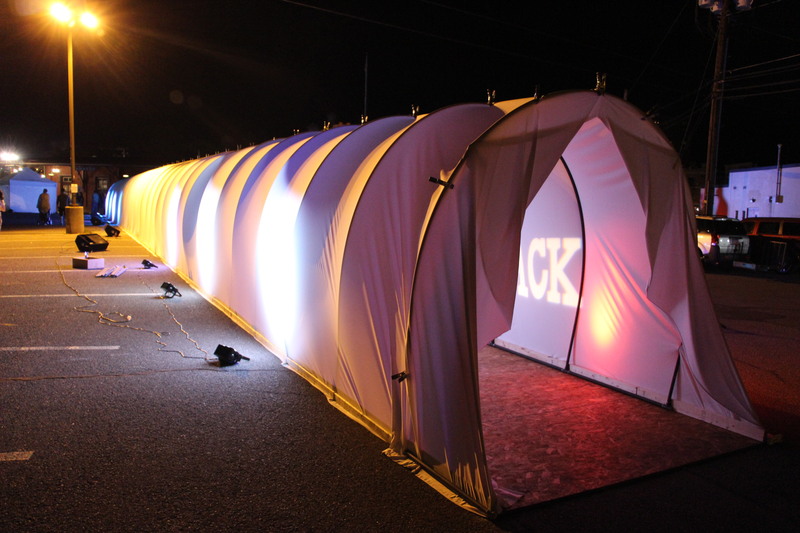 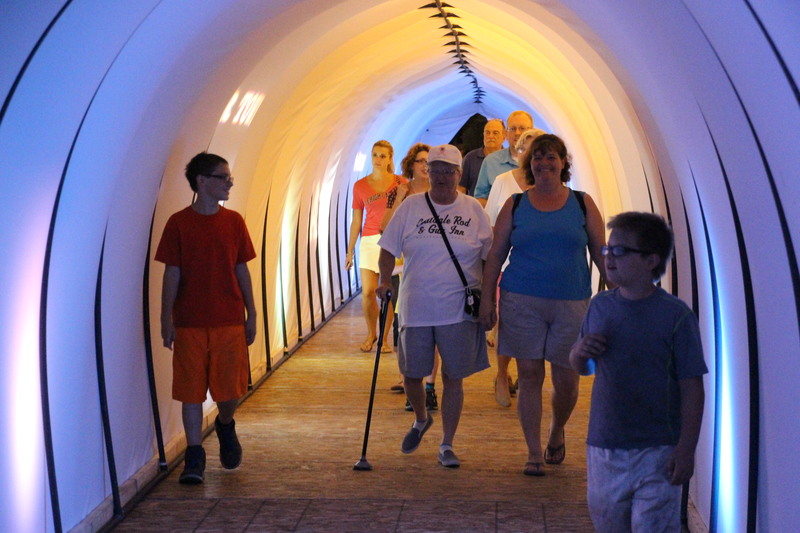 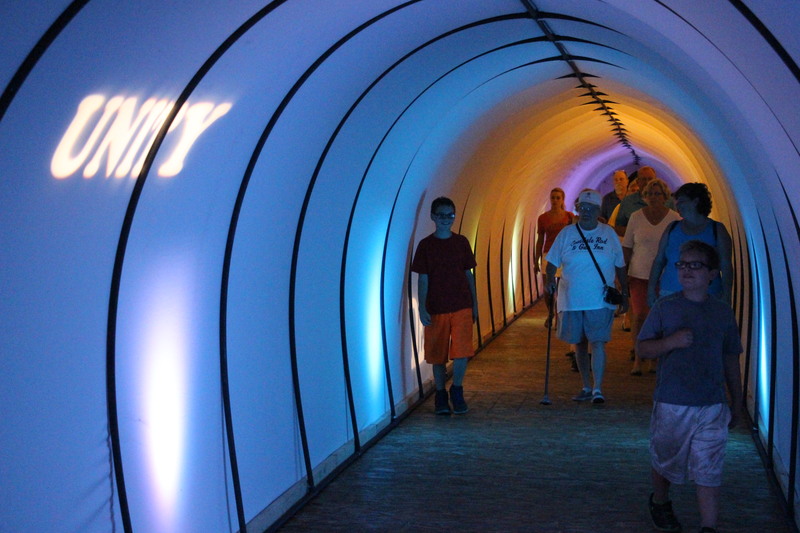 The tour ended with a walk through a 400-foot long cloth tunnel, called the “Reflection Tunnel”. 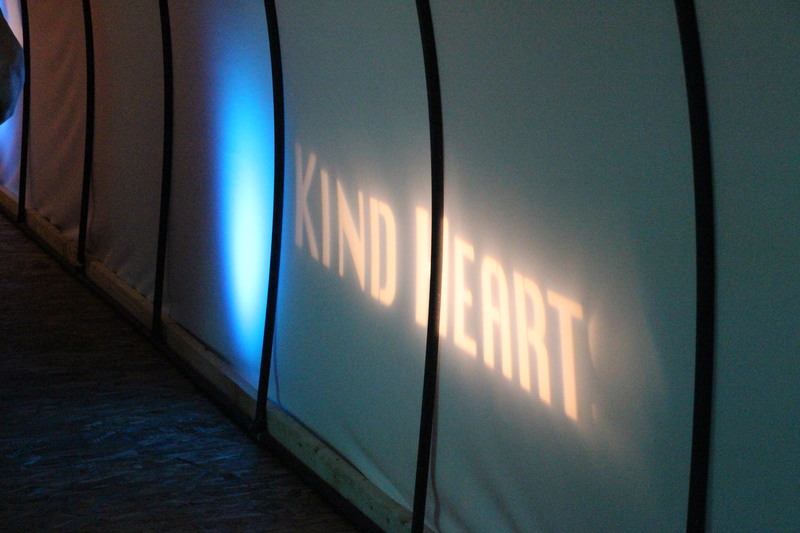 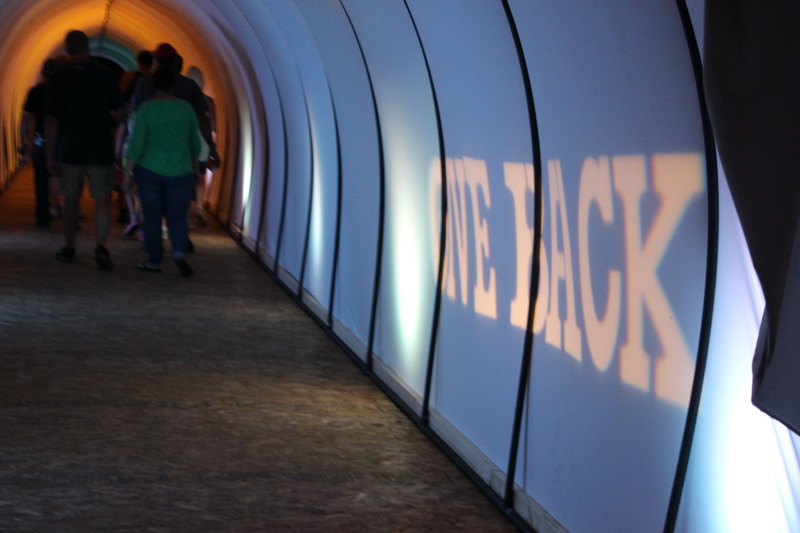 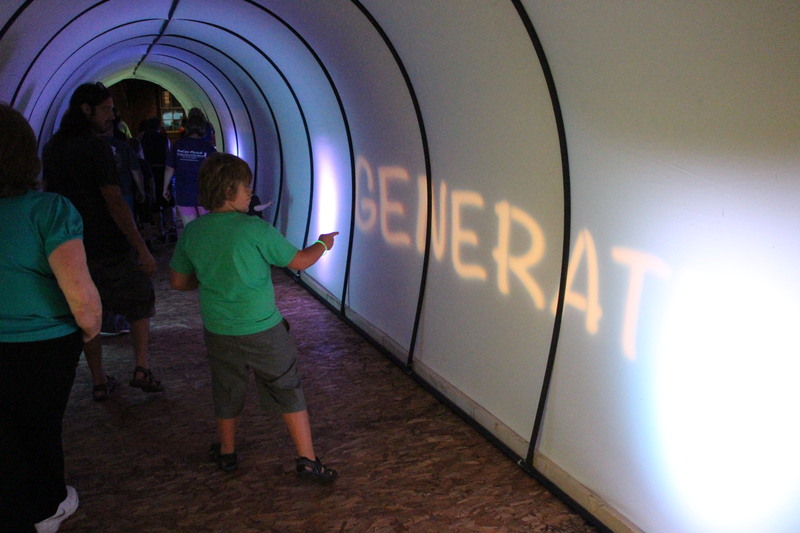 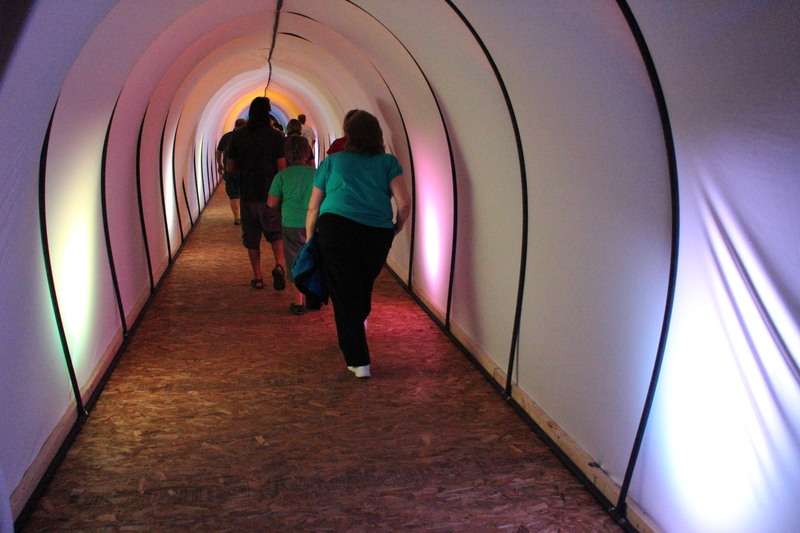 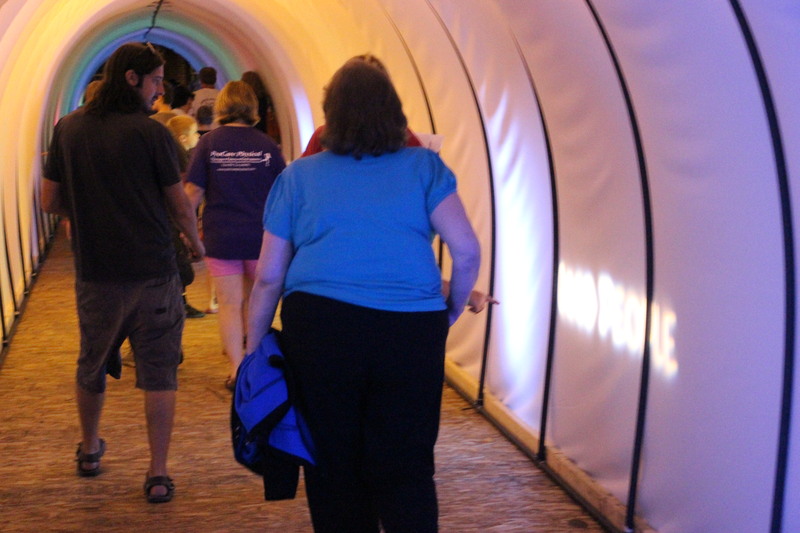 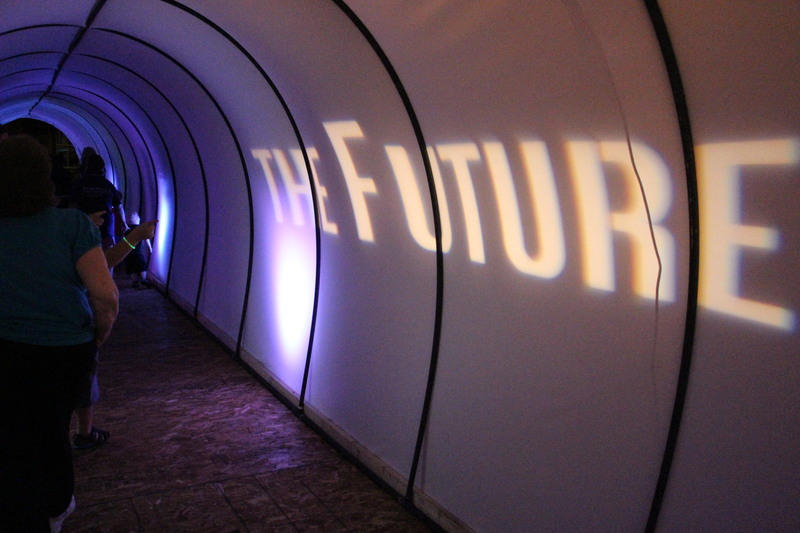 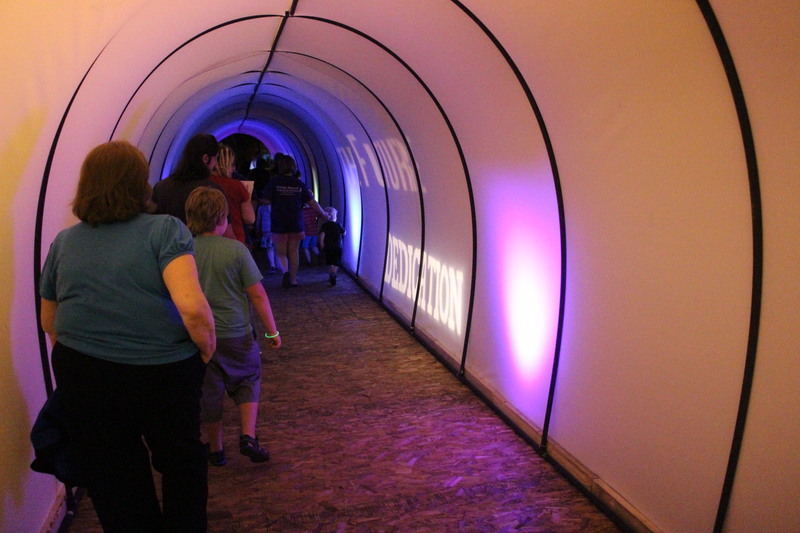 While in the tunnel, visitors could hear music while reading motivational statements or words that appeared on the walls. 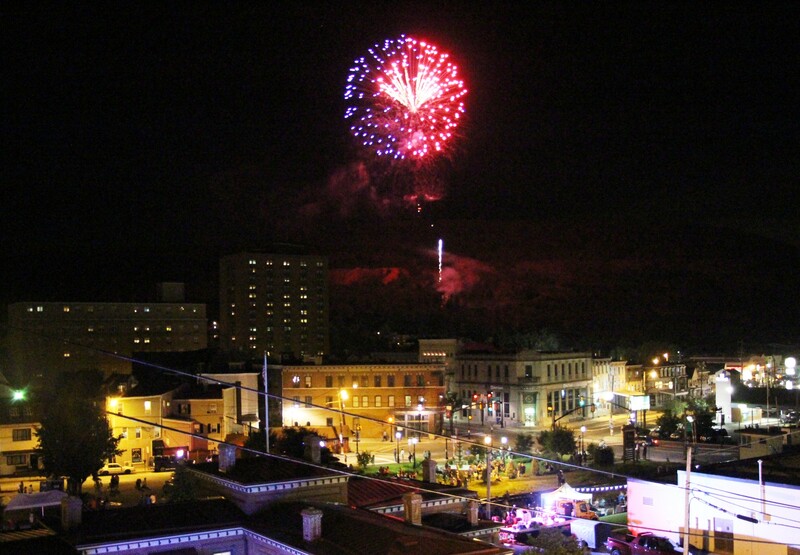 The event ended with a dual fireworks show over the Dutch Hill and East End mountains. 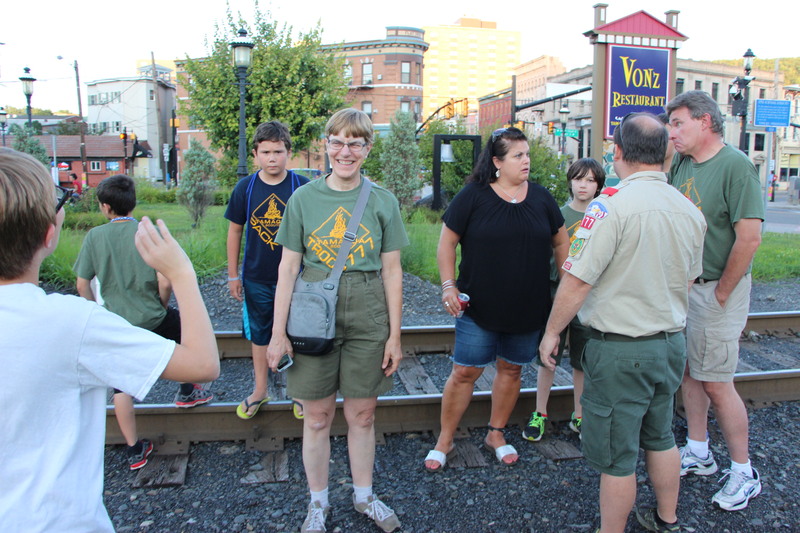 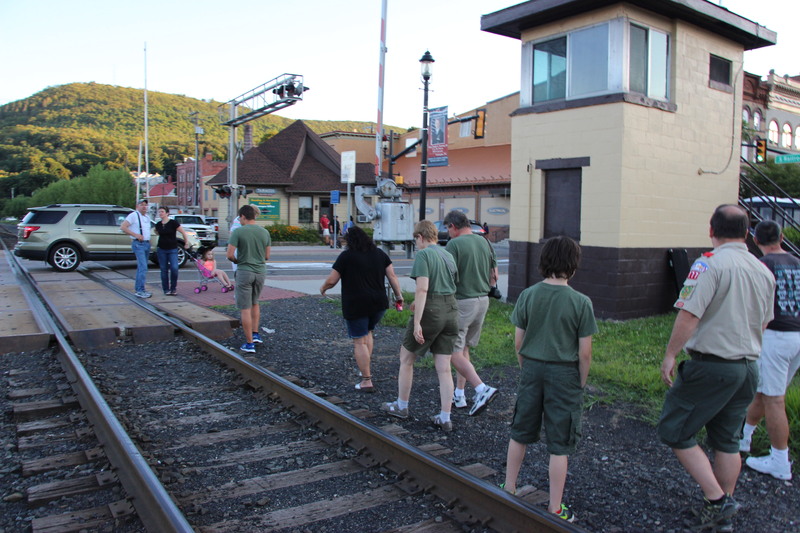 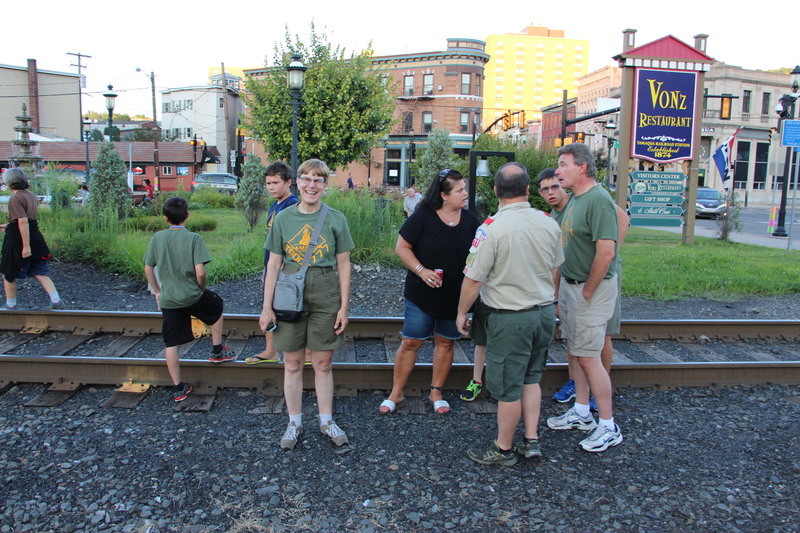 The Dear Tamaqua project was a collaboration between the TCAC, Tamaqua Safety Initiative and the Dear Tamaqua Leadership Committee. 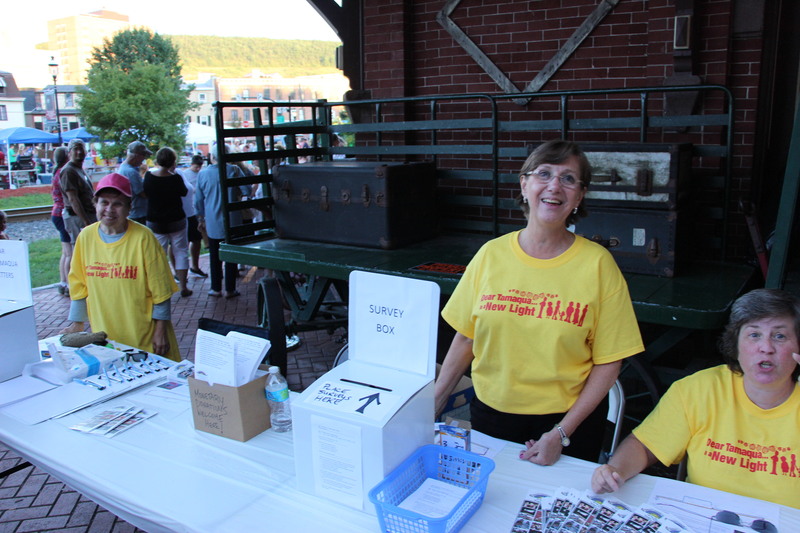 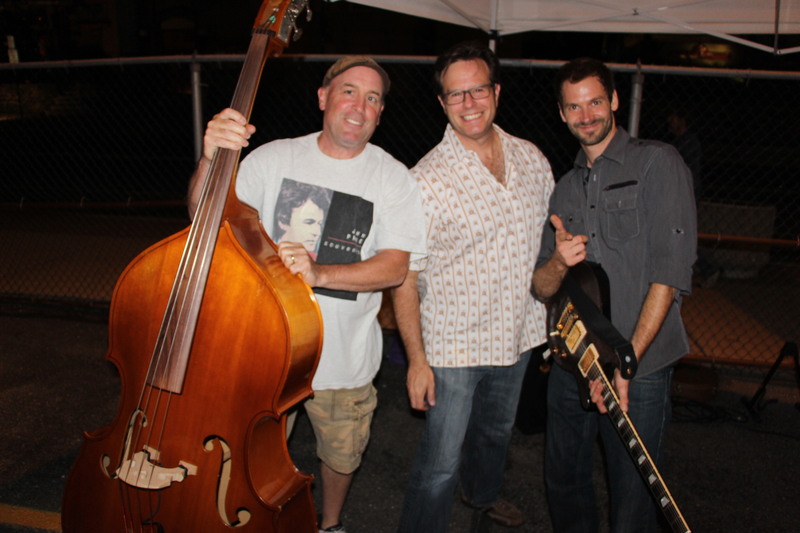 Touchstone Theatre, a Bethlehem-based group, consolidated the event. 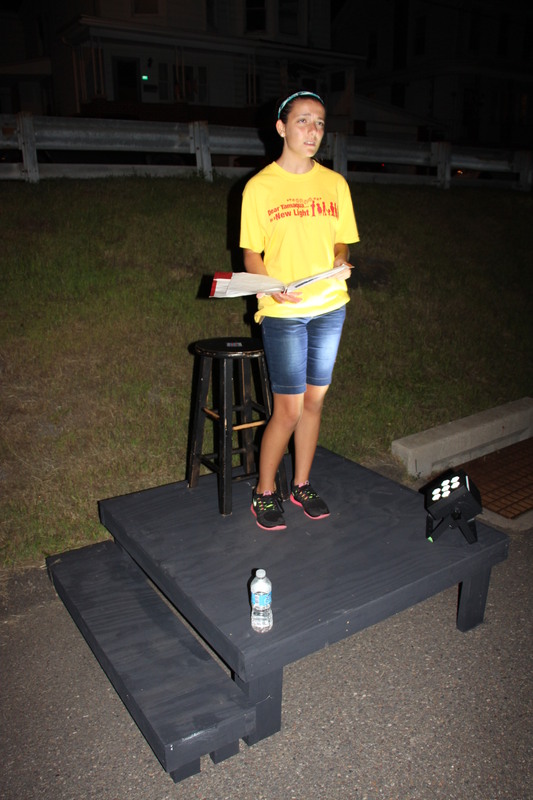 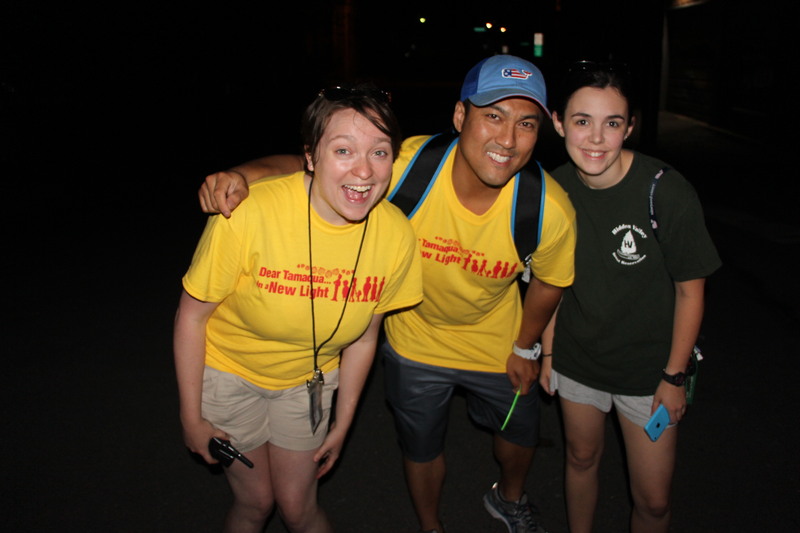 Inspiration for the project came from members of the leadership committee; which consisted of Micah Gursky, Leona Rega (production manager), Kathy Odorizzi, Lisa Jordan, JP Jordan, Amber Finn (stage manager), and Emma Chong (assistant stage manager). 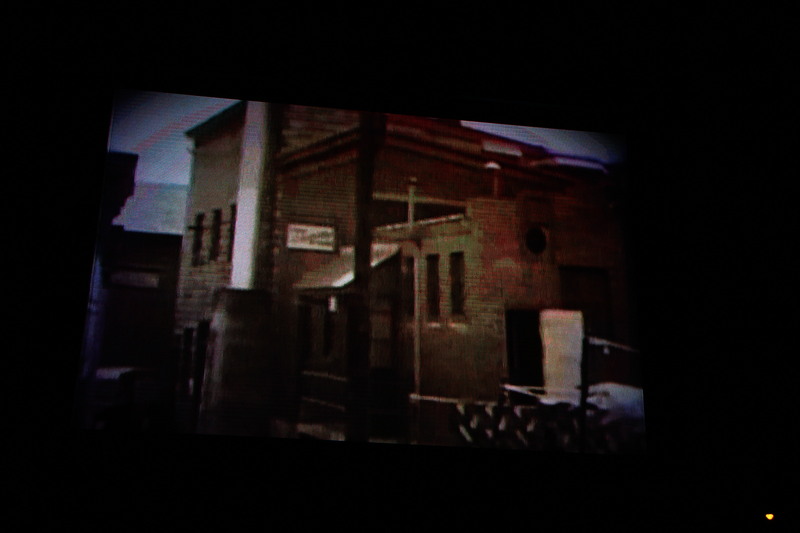 Theater and stage crew consisted of: designers JP Jordan and Christopher Shorr; musical director JP Jordan; acting coach Bill George; assistant acting coach Anna Russell; actor coordinators Adriane Drum and Erica Cassell; lights, sound, and video specialists Shangri La Productions via John Harbove; directional sign coordinators Craig Bulger, Kim East, Wandie Little, Paul Miller, Linda Miller; photo booth operators Andrea Porambo, Jackie Richardson, Jessica Yuhas; transportation crews from Schuylkill Historical Fire Society, Mermon Motors, Leiby’s Carriage Service-Horse Drawn Trolley, Rutch Family; photography/videography archives from Tamaqua Public Library Year Books, Tamaqua Historical Society, Tom Berner, John Suzadaile, Ruth Beth, Kyle Whitley, Christine Veen, Leona Rega and vintage film from 1938 “Once Upon a Time in Tamaqua” by 2001 DVD from R.W. 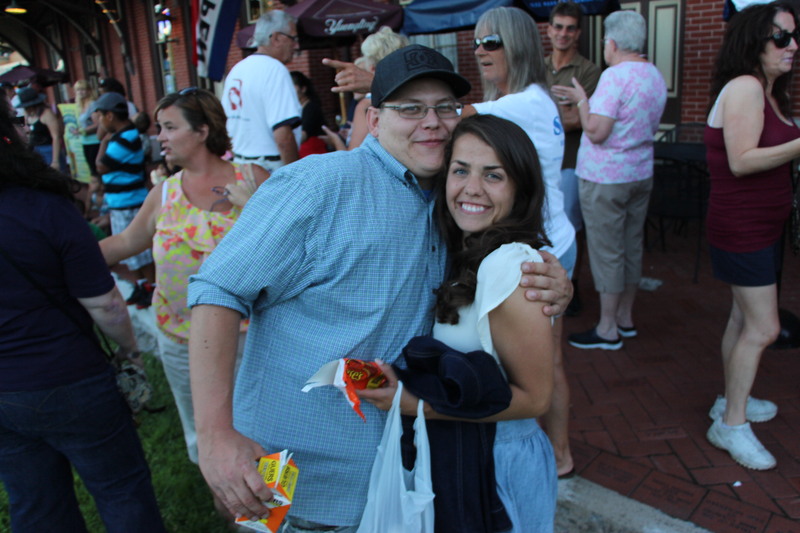 Betz. 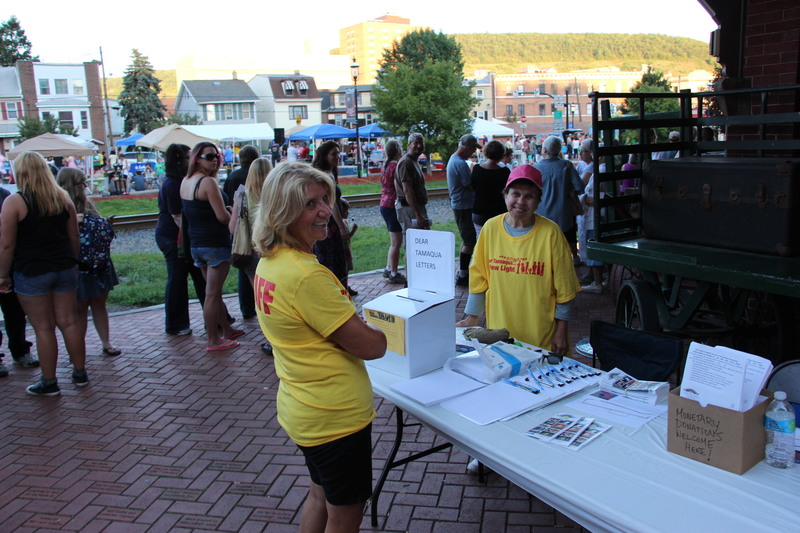 Information from an event program read gave appreciations to the following for their donations of time and/or money: St. Luke’s Hospital, Tamaqua Family Practice, Tap with Bob Lippi, Tom Griffen & Sons, Toms Autobody w/ PA Fish & Boat Commission, Tamaqua Community Arts Center, USA Martial Arts. 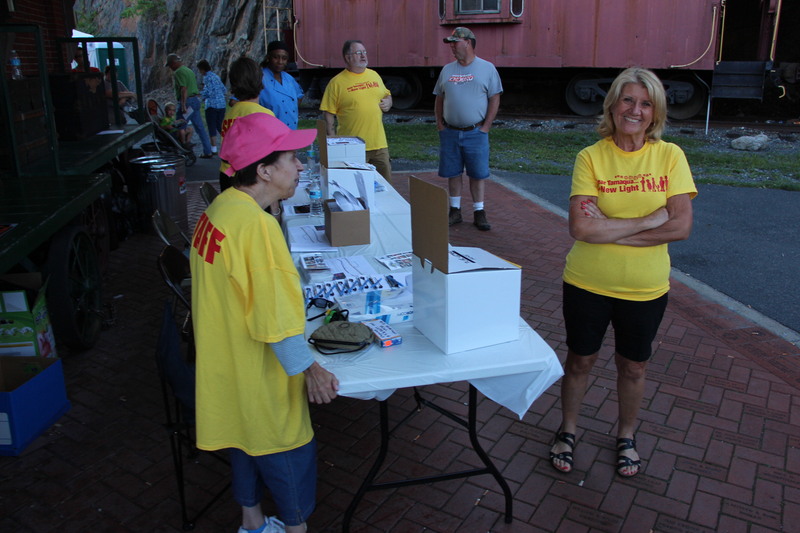 Individual volunteers were Debbie Althouse, Doug Betz, Stephen Bennett, Stacey Bennett, John Bilodeau, Joanne Calabrese, Tom Cara, Paul Corinchock, Bill Donovan, Maureen Donovan, Wendy Dunkelberger, Amber Forester, Lisa Frederick, Kim and Mark Grant, Micah Gursky, Sophia Gursky, Jacob Gursky, Tom Hartz, Linda Heigle, Joe Herrera, Heather & Emma Hoch, Judy Hoppes, Alicen Hull, Angie Irwin, Beth Job, Judy Johns, Jack Kulp, Georgeann Knowles, Holly Kosack, Kerry Lasky, Andy Leibenguth, Karen Leibenguth, Chris Kostecky, Erv Mease, Dave Meredith, Irene Miller, Linda Miller, Fred Miller, Sarah Miller, Mike Morgans, Josh Nemeth, Charlie Odorizzi, Dan Odorizzi, Kathy Odorizzi, Tony Odorizzi, Anthony Odorizzi, Jackie Petrucci, Donna Plasko, Lauren Price, Bruce Reed, Chris Reed, Aaron Rega, Shanon Rega, Kevin Roberts, John Crane and Karen Travor of Crane Insurance Agency, Joanne Miller and John Bulino of Seltzer Insurance Group and Hope’s Collision and Towing. 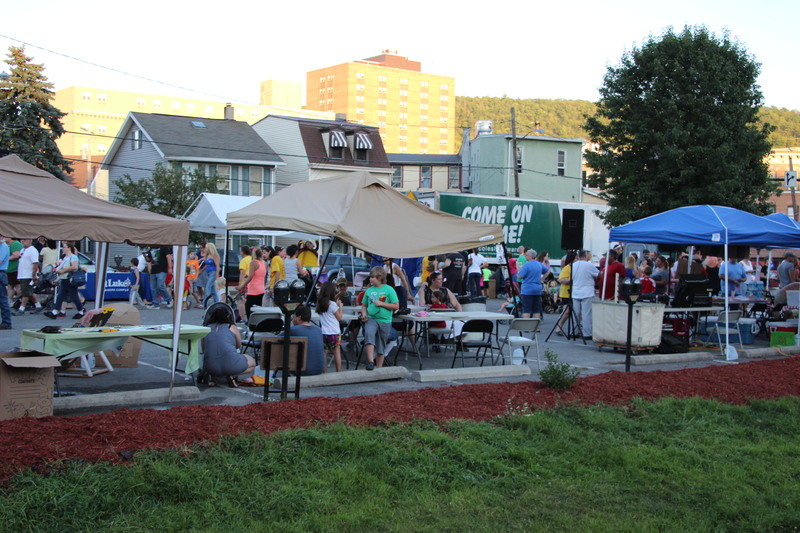 Addition appreciations were given to Air Products of Hometown, Boyer’s Food Market, Coal Cracker Chorus (Tamaqua Barbershoppers), Jump Street, L.I.S.C., Northeastern PA Non-profit and Community Assistance Center, Pennsylvania Council of the Arts, Snayberger Foundation, Citizen’s Fire Company, Dan Reigel Plumbing and Heating, Dr. Lisa Banning of Banning Orthodontics, Dr. Todd Banning of Schuylkill Cardiology Association; Johnathan Miller of Blue Mountain Farms, Lehigh Coal & Navigation, Lucille Fala and her radio show “Curtain Call”, Larry McCullion of L & S Electric, St. John XXIII Parish, Tamaqua Area Community Partnership, Tamaqua Area Adult Daycare Center, Tamaqua Ambulance, Tamaqua Borough Council, Tamaqua Police Department, Tamaqua Fire Department, Tamaqua Fire Police, Tamaqua Historical Society, Tamaqua Public Library, Tamaqua Salvation Army, Tamaqua Save Our Station (S.O.S. 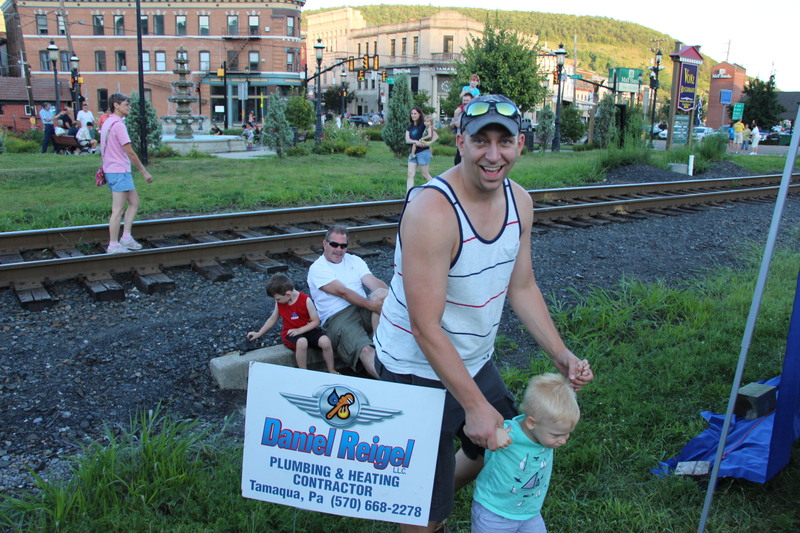 ), Eric Orach of The Station Fitness Center, Tom’s Auto & Marine Shop, Touchstone Theatre, WMGH 105.5 /WLSH AM 1410 radio station, Wells Fargo of Tamaqua, Vonz Restaurant, La Dolce Casa, Padora’s Italian Bakery, Tommy’s Italian Specialty Shop and Janice and son Frank Wenzel of Wenzel’s Bakery. 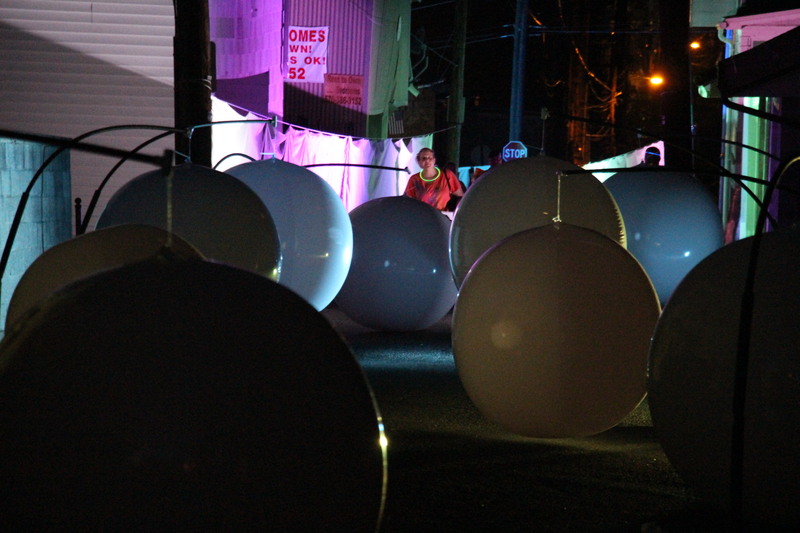 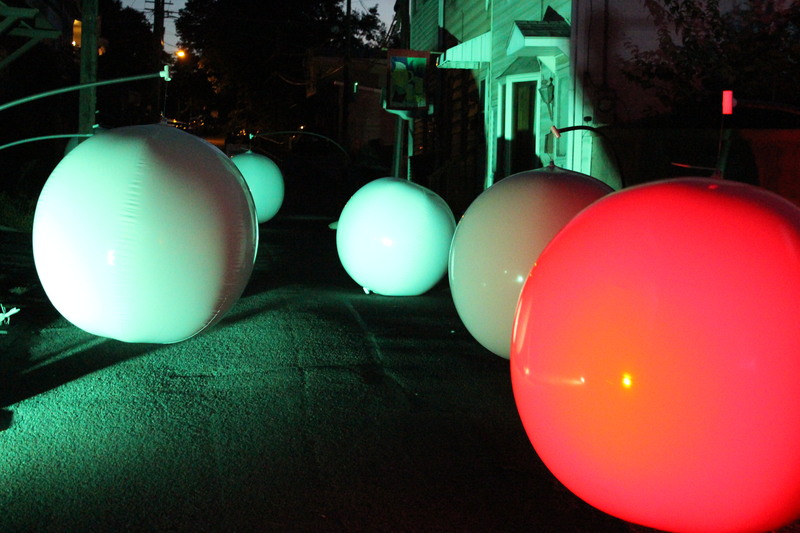 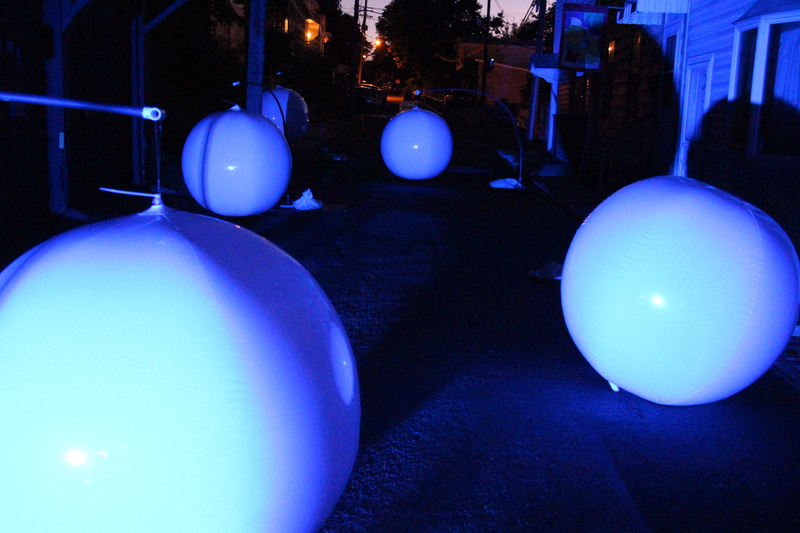 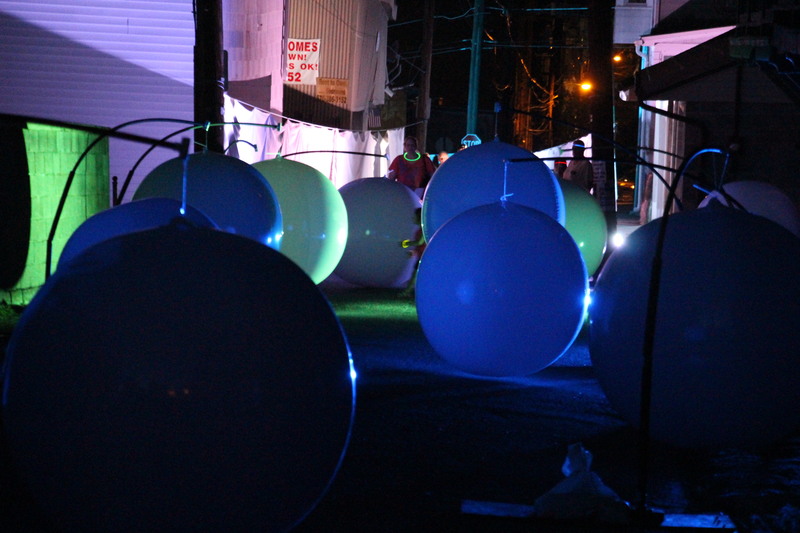 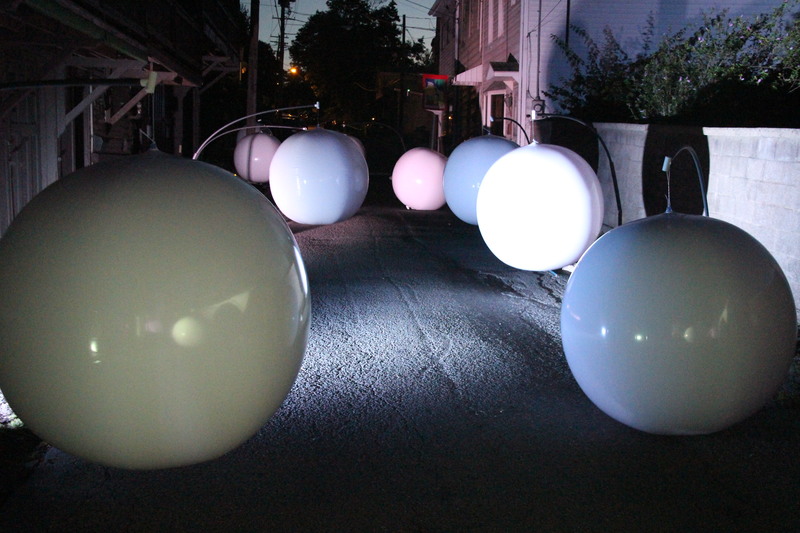 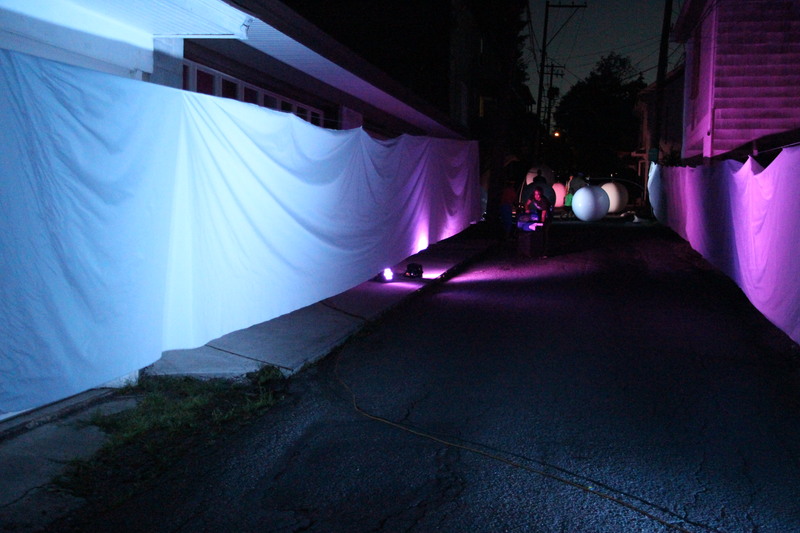 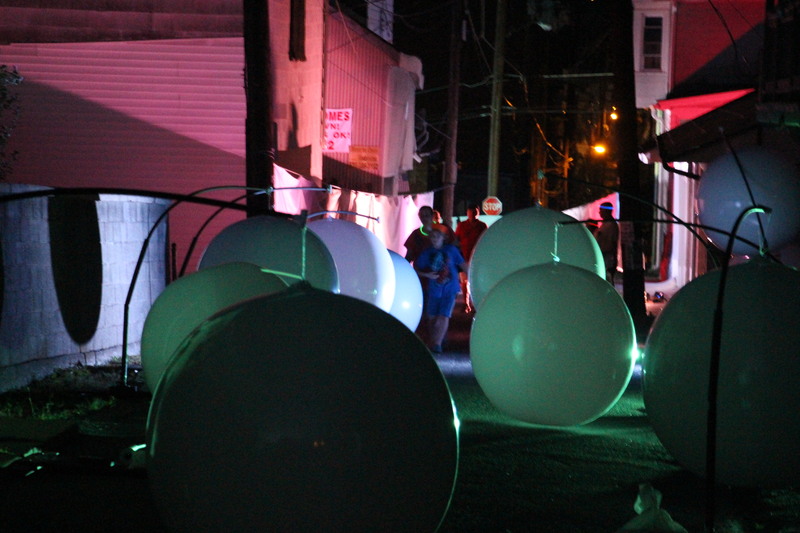 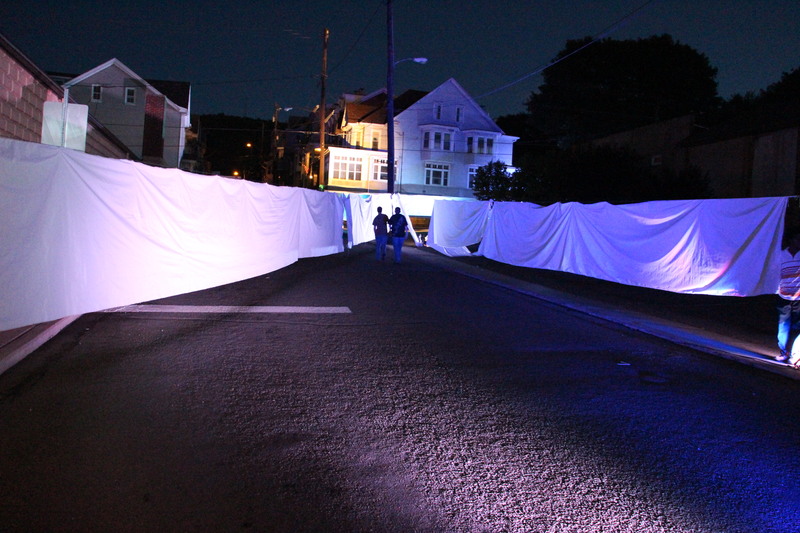 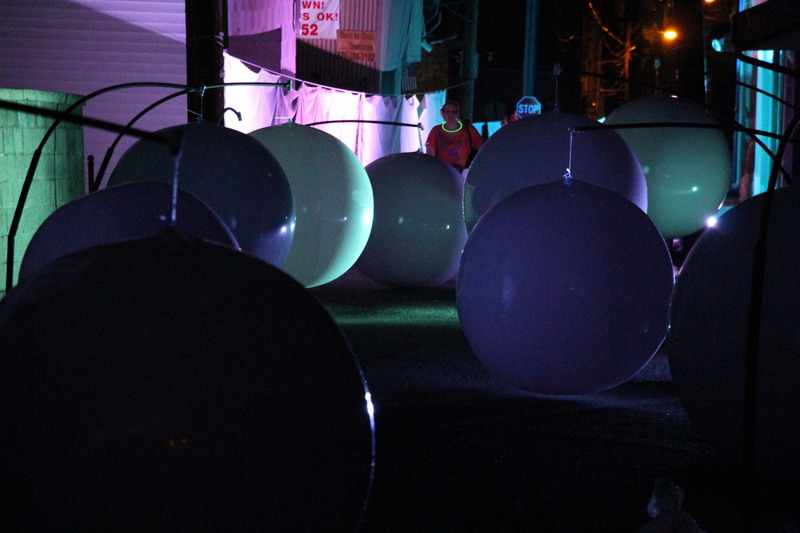 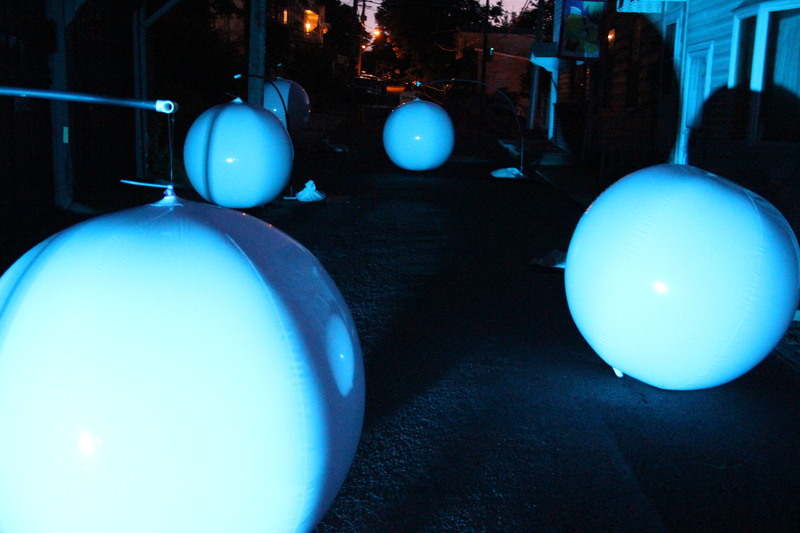 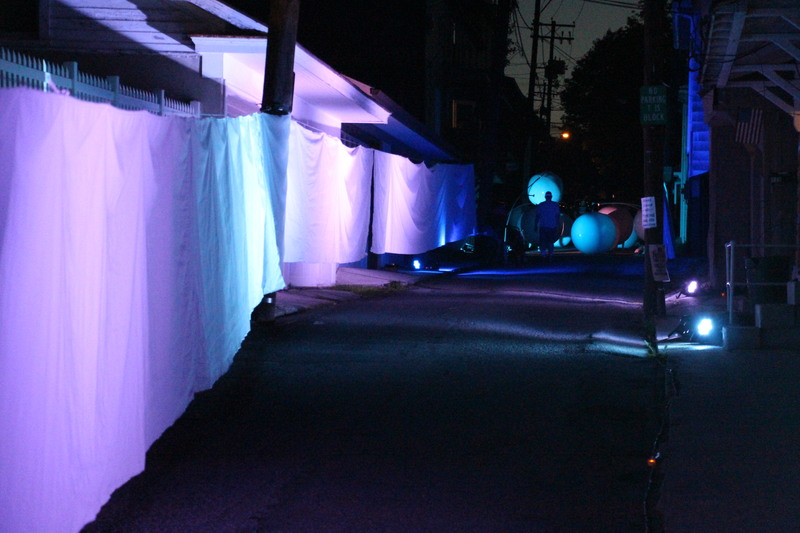 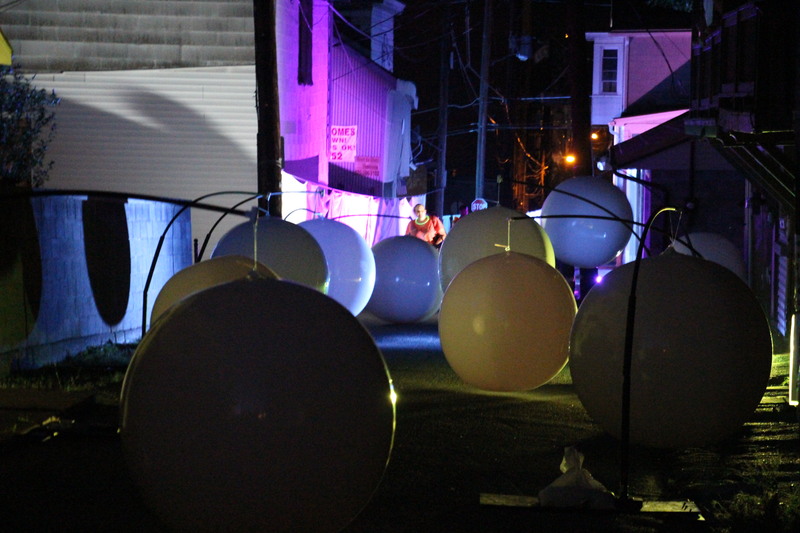 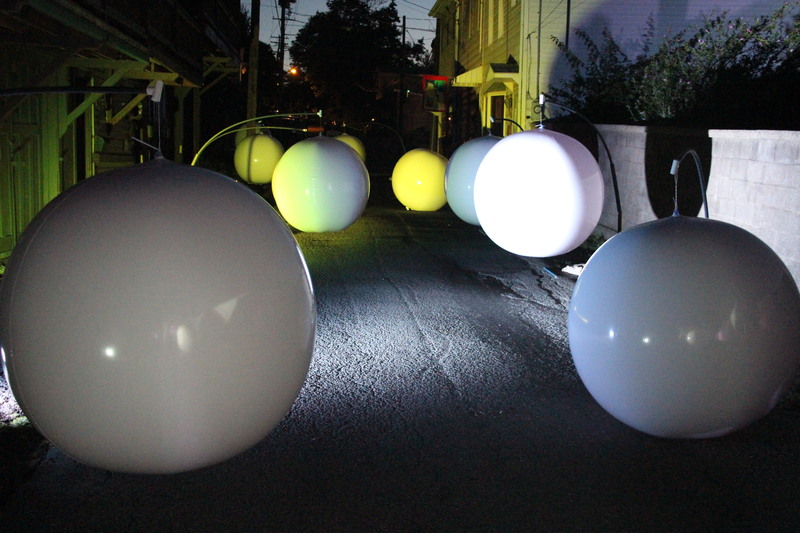 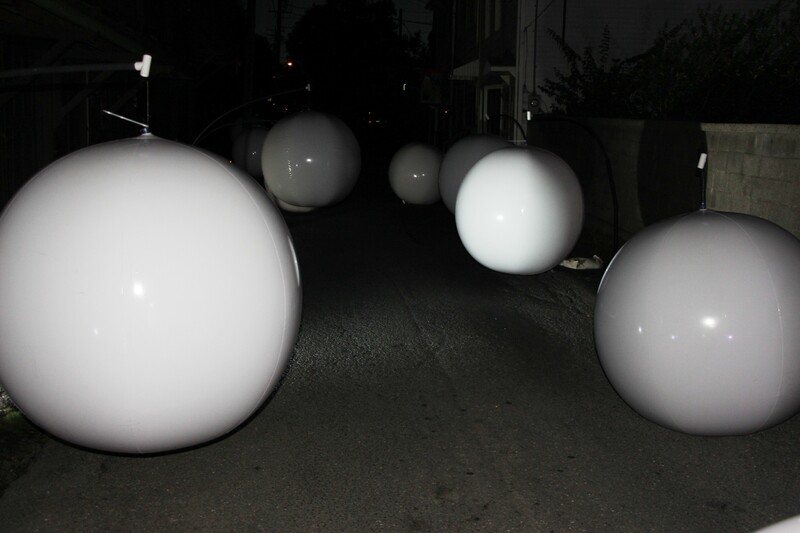 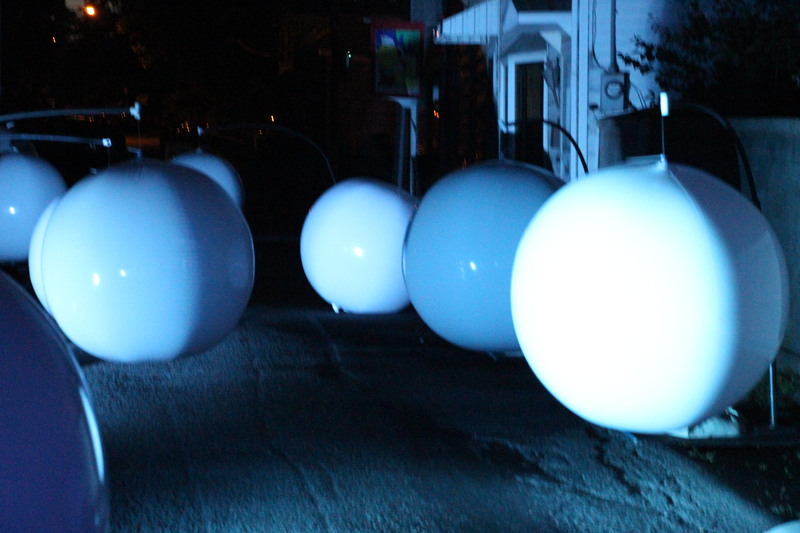 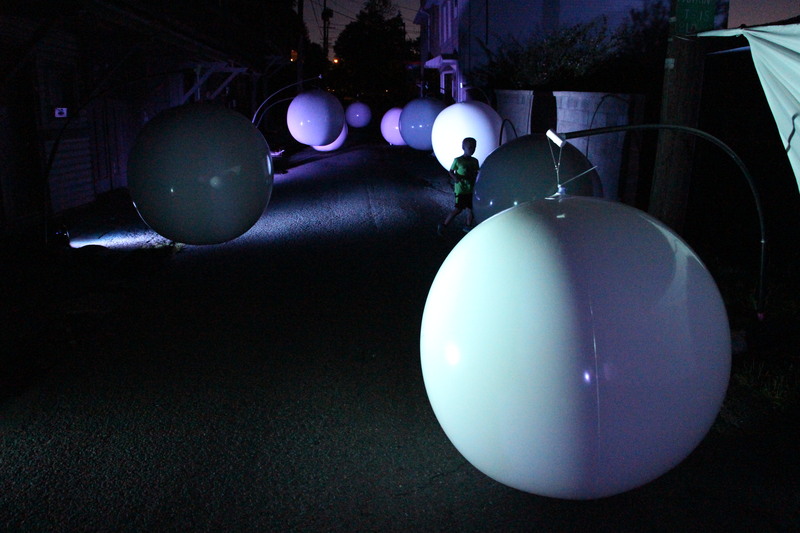 The inverted parade along the 200 block of West Broad Street was coordinated by Stephanie Gursky-Johns. 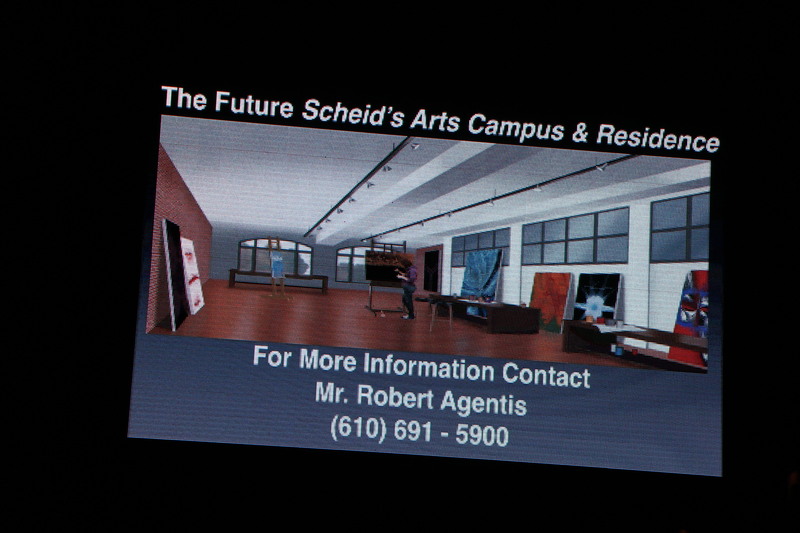 Sponsors and supporters were Charles X. 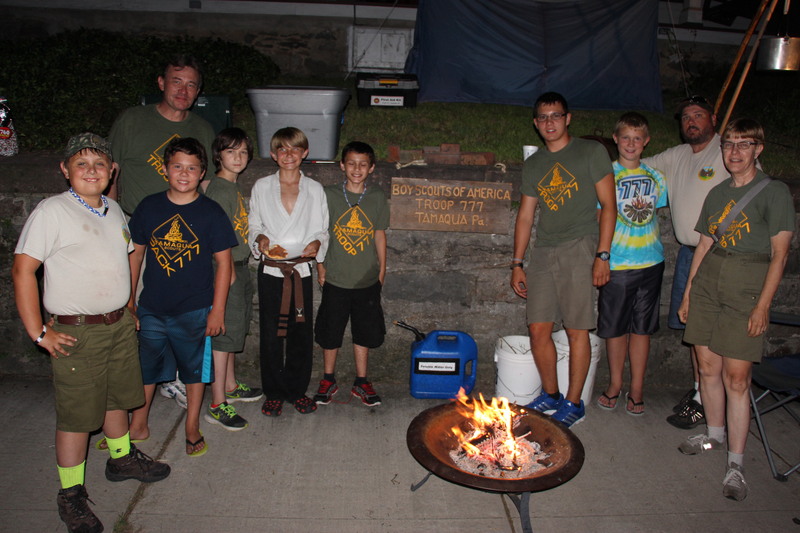 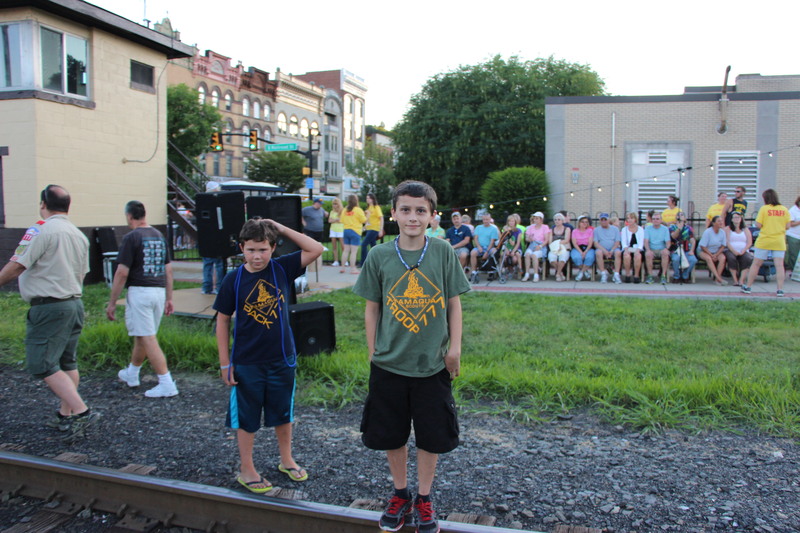 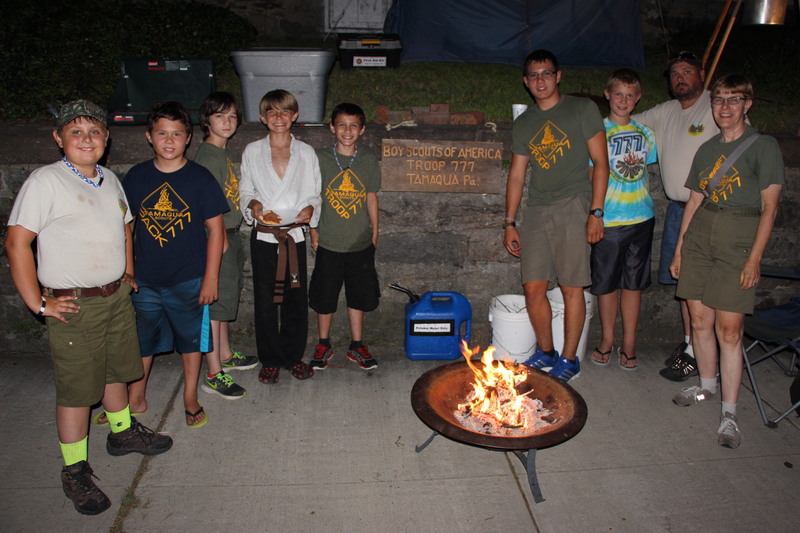 Block Men’s Wear, Tamaqua High School Band, Tamaqua Rotary, Tamaqua Boy/Cub Scouts and Tamaqua Youth Ministries. 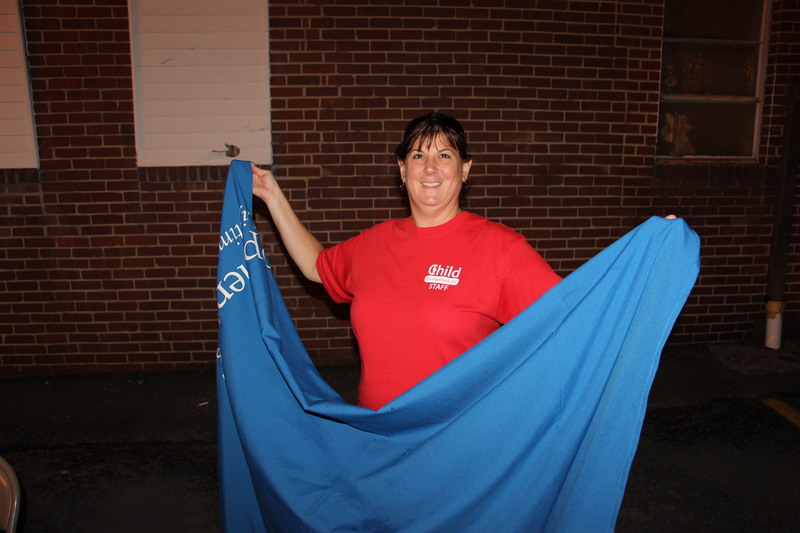 Fabric sewing was coordinated via the Tamaqua Salvation Army’s Needlebug’s group and Dina Depos, programs coordinator, Tamaqua Salvation Army. 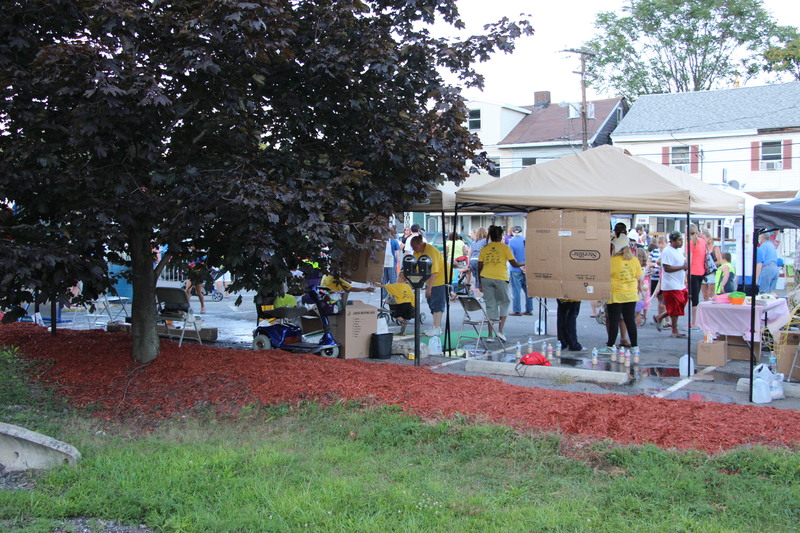 Construction and storage of event supplies and equipment was via Lennya Sabol and Jarrett Reigel of Dan Reigel Plumbing and Heating; Kane Lumber; Ben, Ethan and Ben H. Turrano (orb construction); Dave Johns and Stephen Bayer (stage construction); Owen and Mitchell Sabol (mini stage painting); Paul Miller and John Szeliga (pipe sanding/painting); and Tamaqua Borough workers (tunnel and art installation, Depot Park, and area preparation). 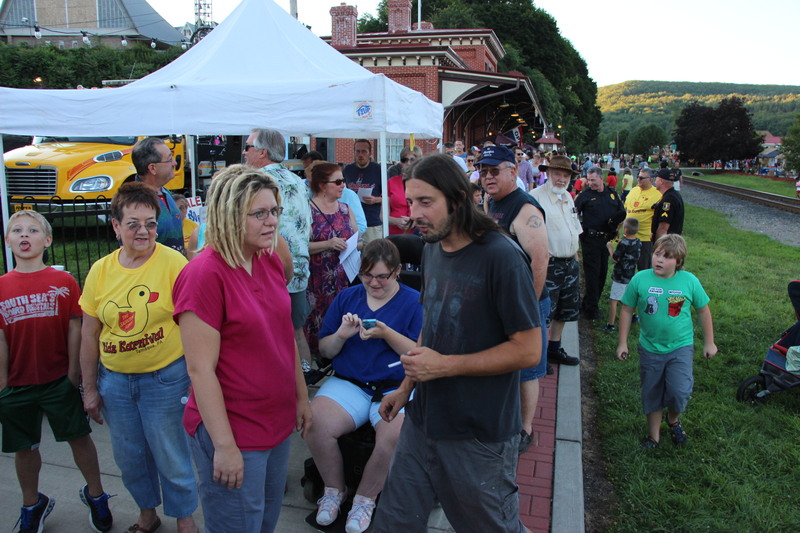 Guest speakers were Tamaqua Mayor Chris Morrison and Leona Rega, director, Tamaqua Community Arts Center. 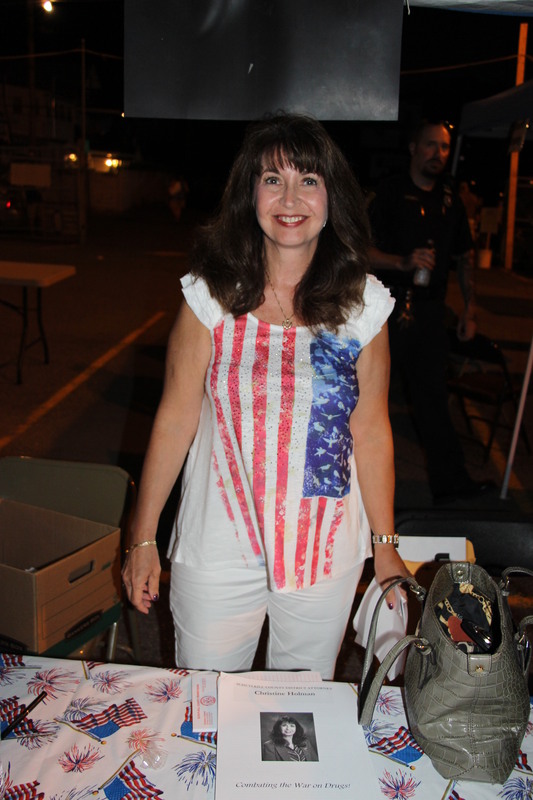 Fireworks were via Starfire Corporation. 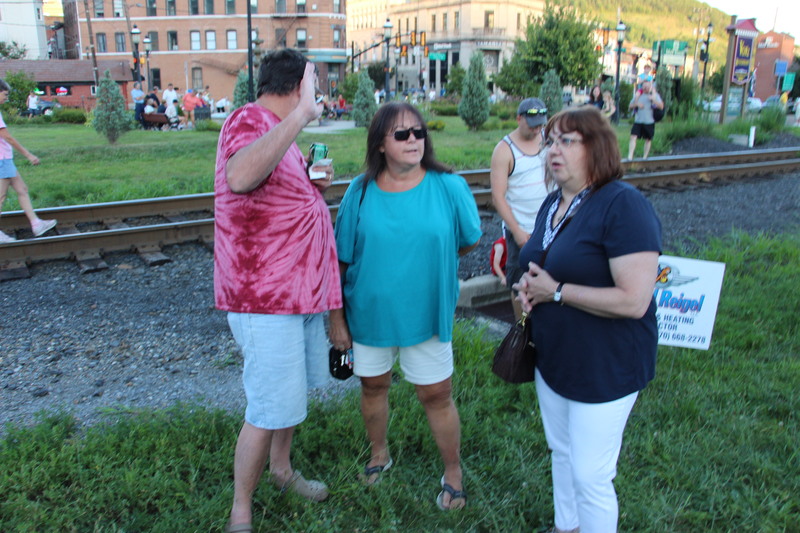 Media and promotion was via Tamaqua Chamber of Commerce, Andrew Leibenguth of TamaquaArea.com, WMGH/WLSH radio, Times News, Kyle Whitley of Dear Tamaqua’s Facebook page, and others. 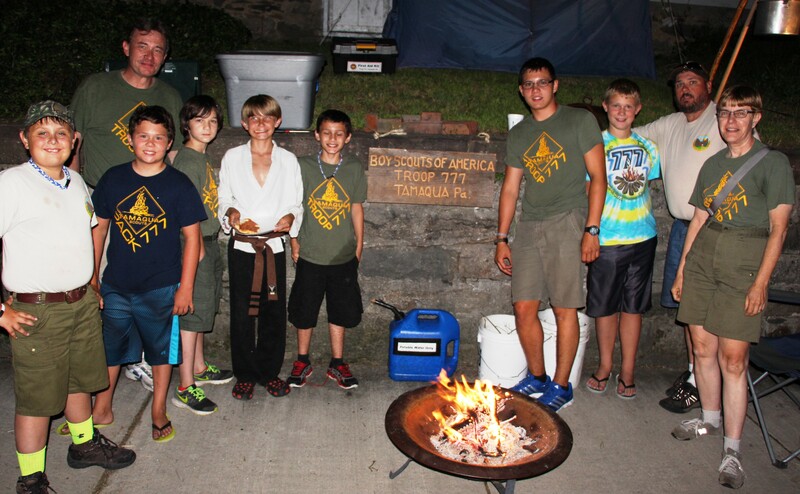 Click HERE to view the program for more credits, appreciations and info. 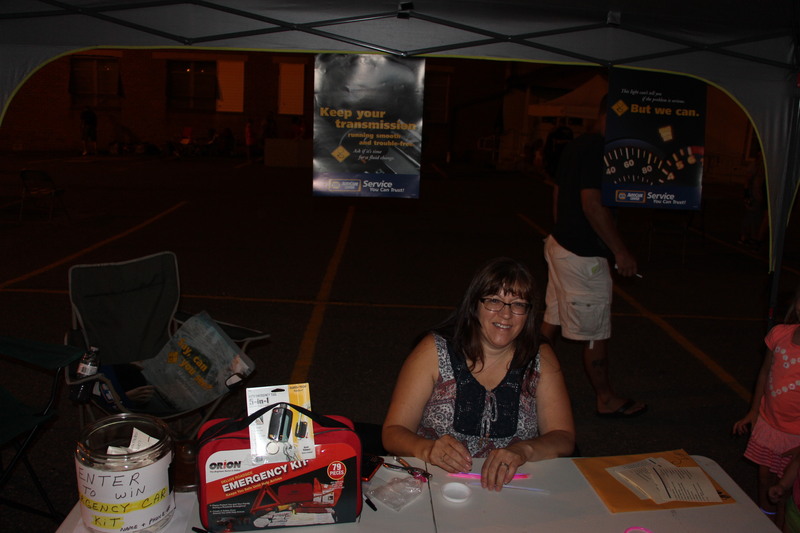 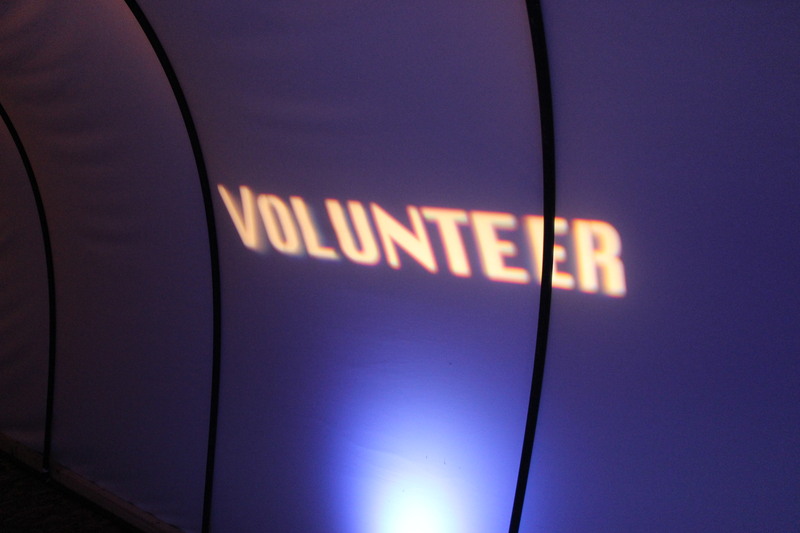 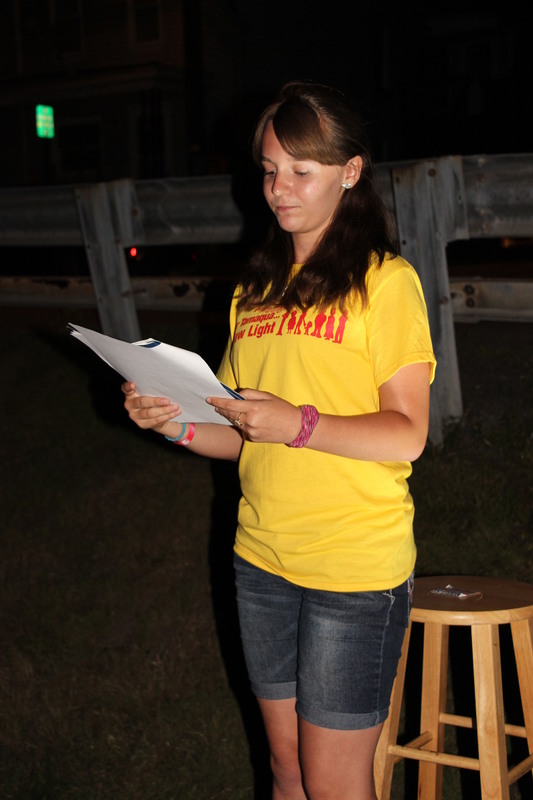 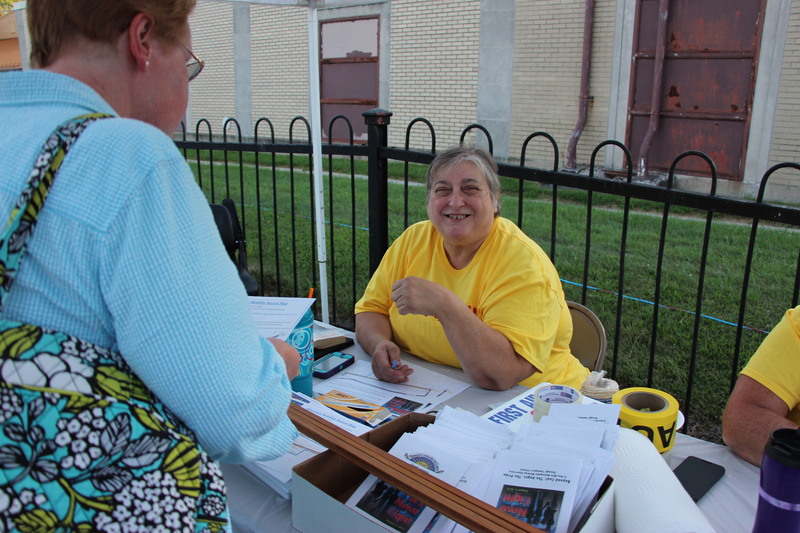 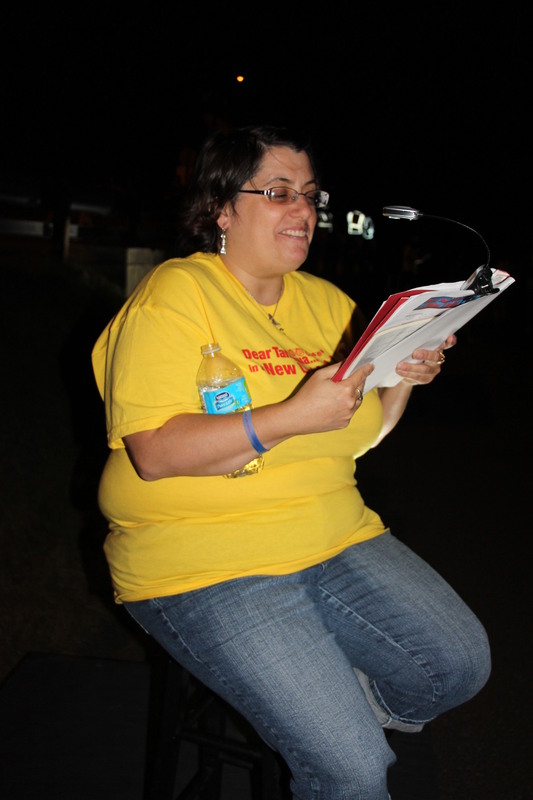 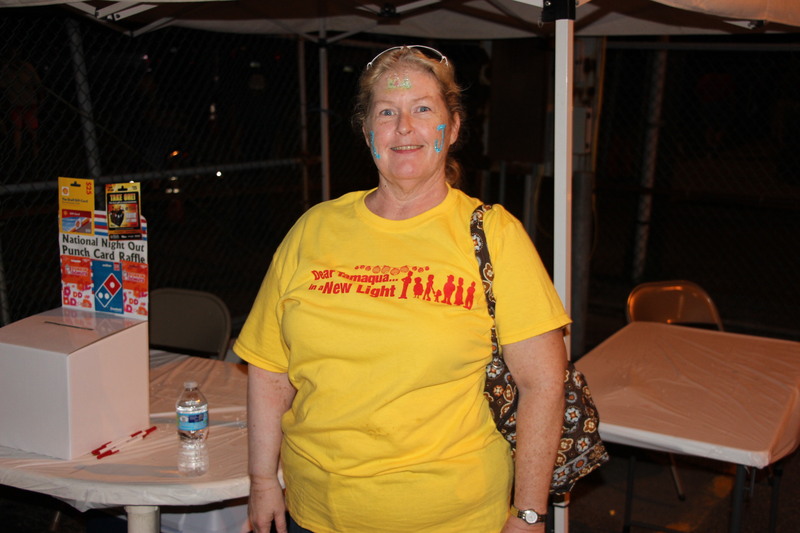 Leona Rega stated that hundreds of volunteers and community members made the event happen. 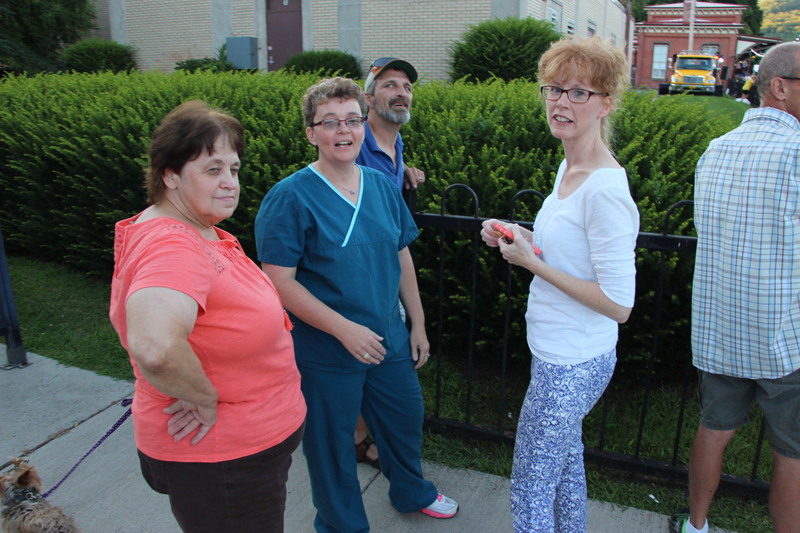 Click HERE to view a related story on the Republican Herald newspaper website. 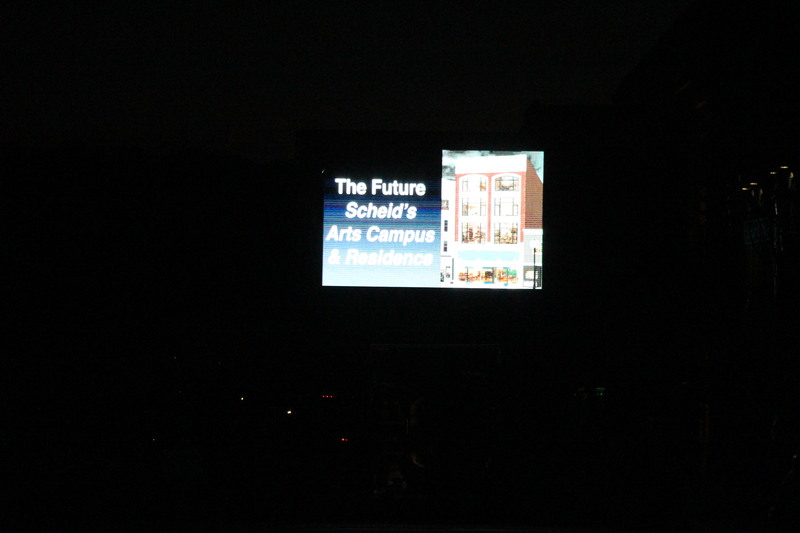 Click HERE to view a related story on the Standard Speaker newspaper website. 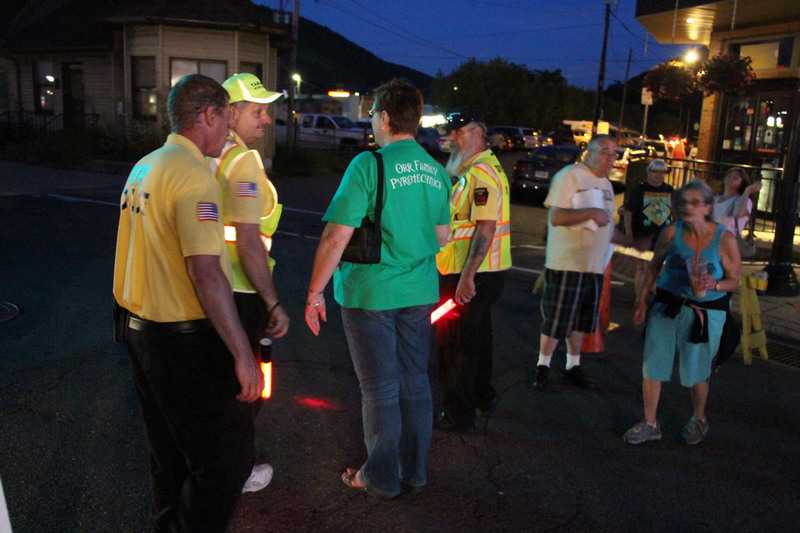 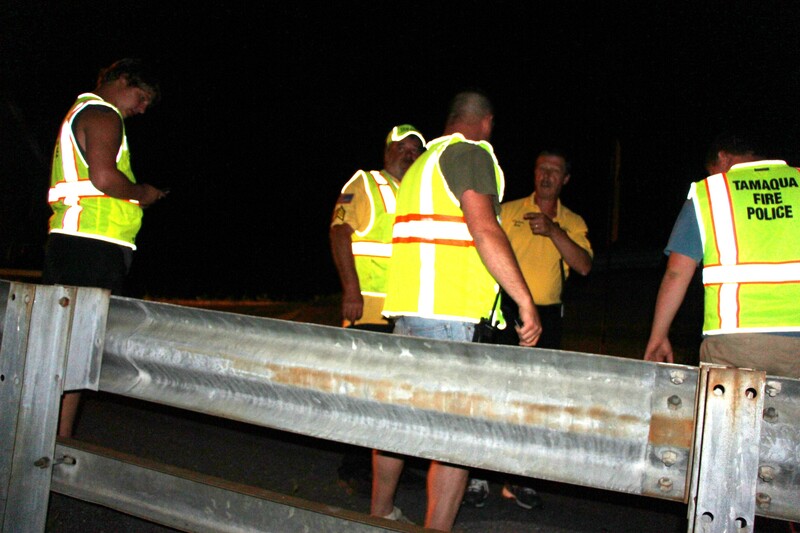 Click HERE to view pre-story on the WNEP TV website. 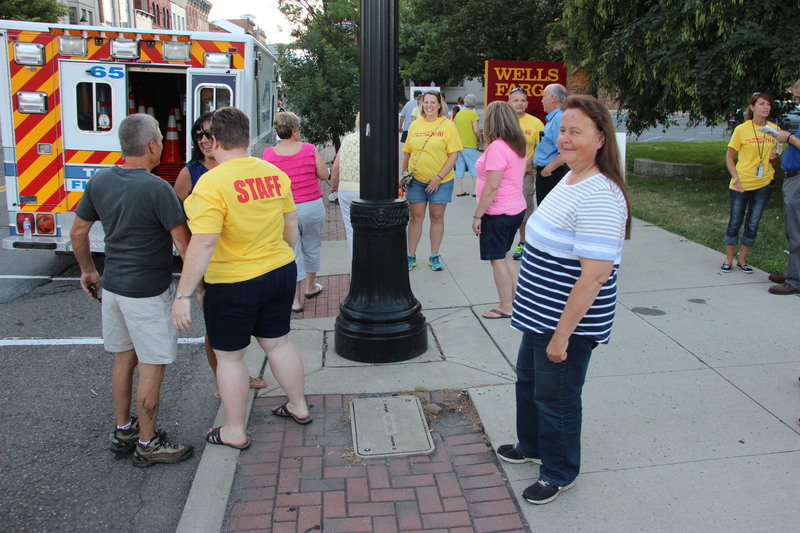 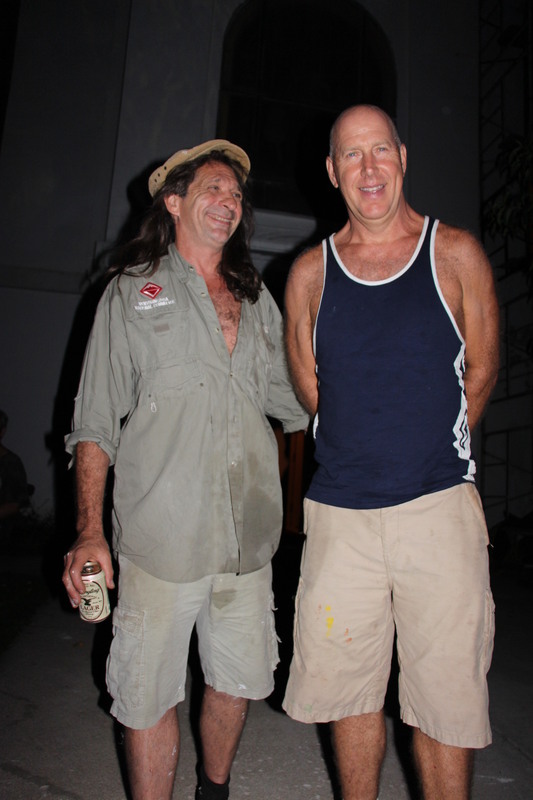 Click HERE to view a related story on the Times News newspaper website. 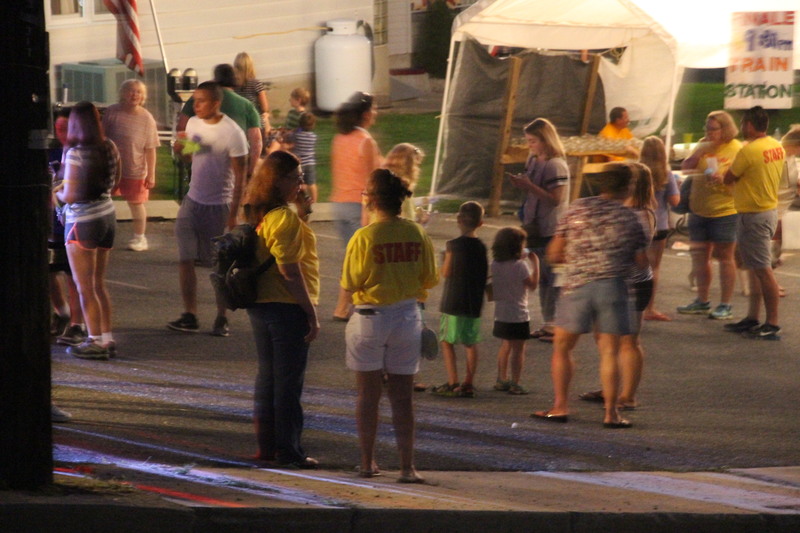 Click HERE to view photos and video from the event’s fireworks display. 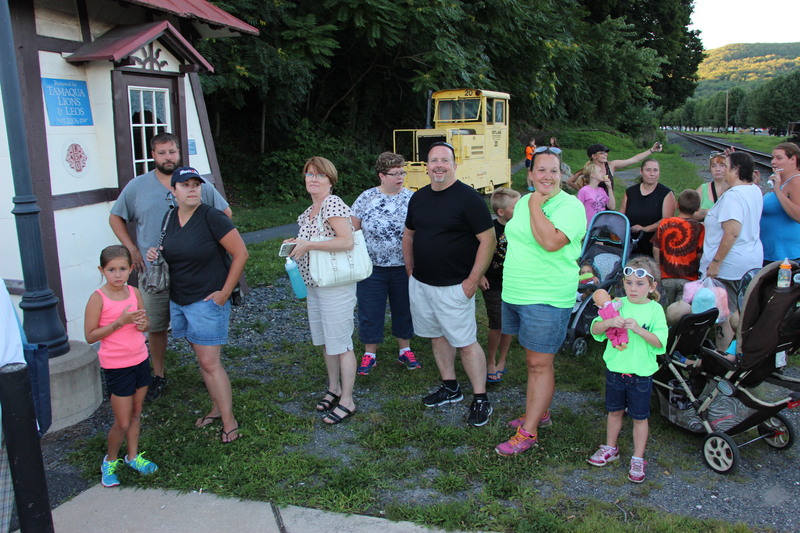 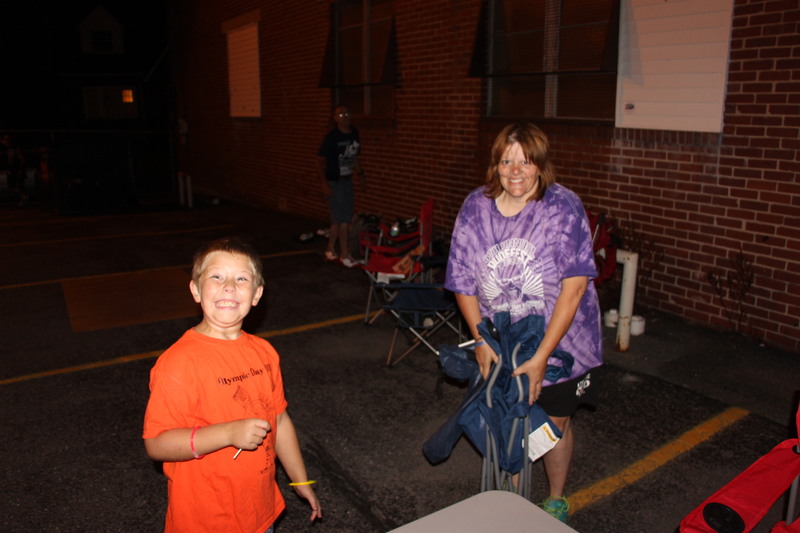 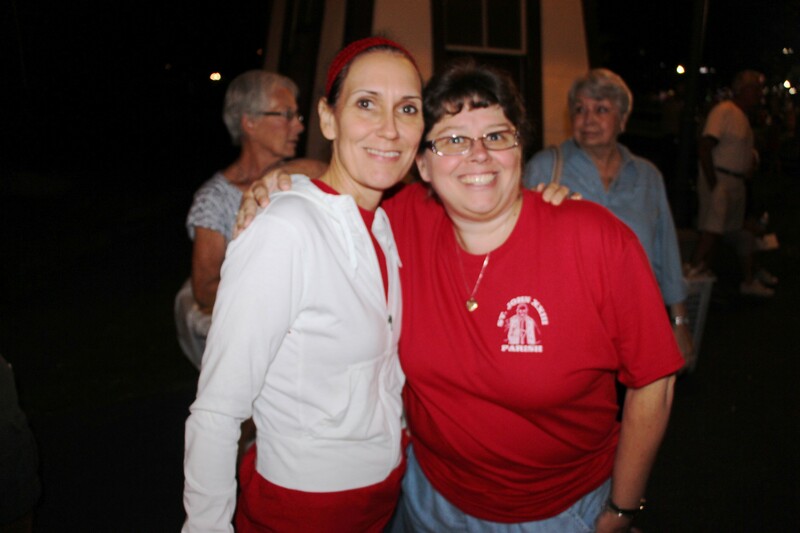 Click HERE to view photos and video from the Tamaqua Salvation Army Kids Carninval.